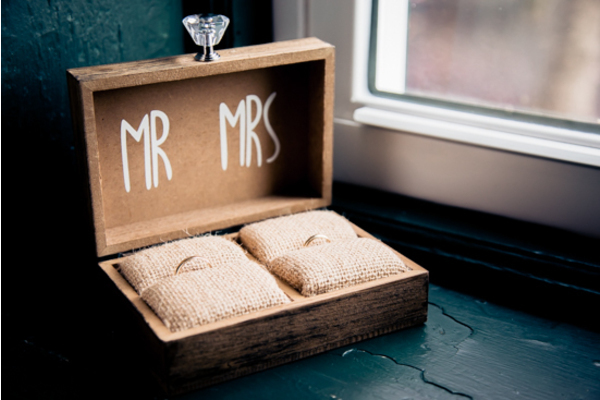 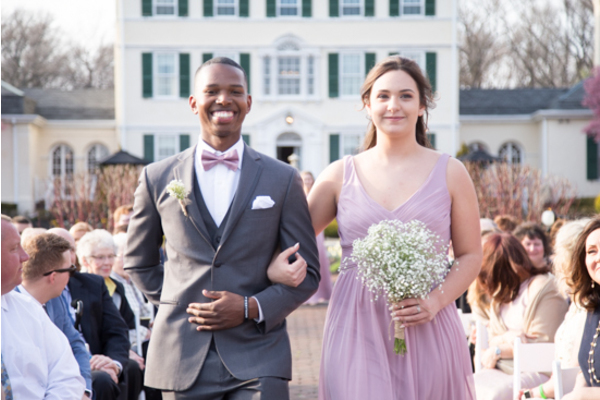 Congratulations to the beautiful couple, Caitlyn and Thomas! 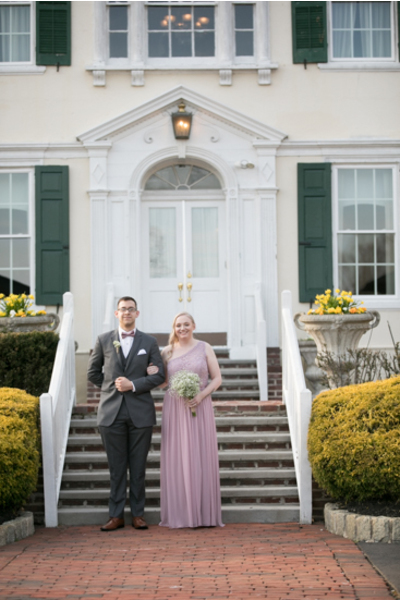 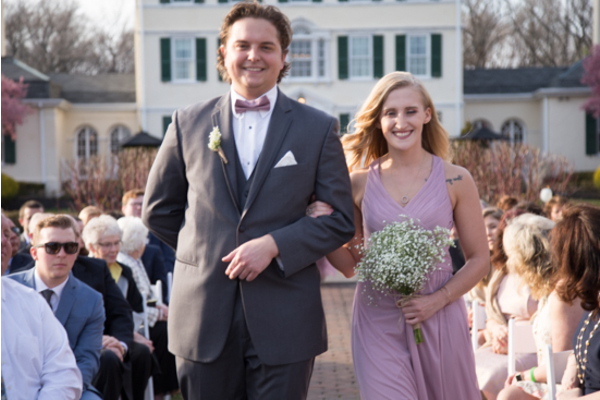 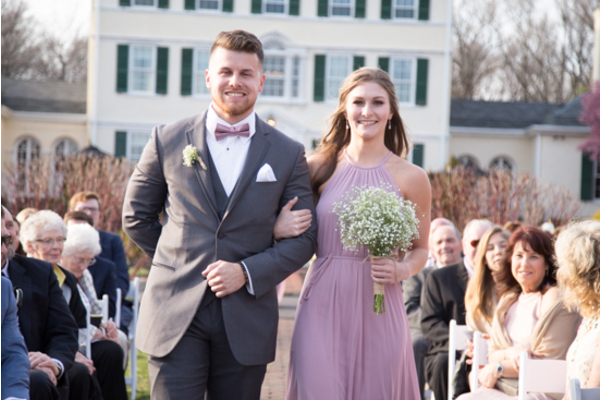 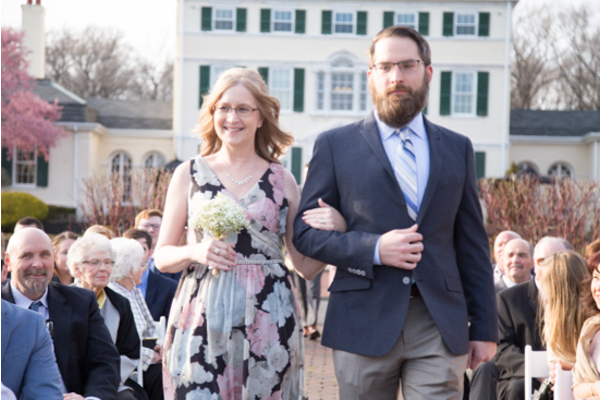 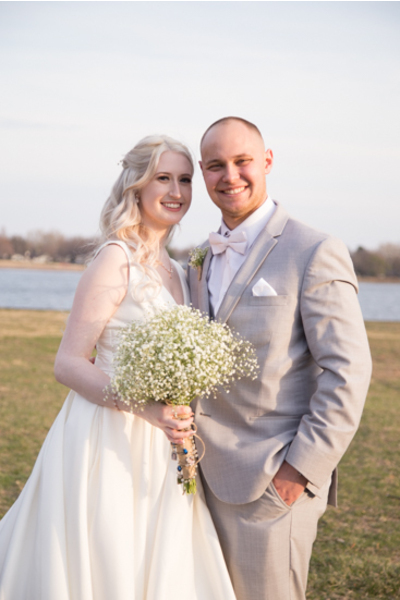 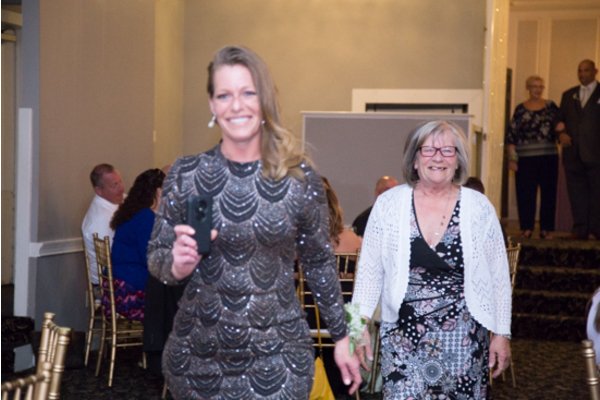 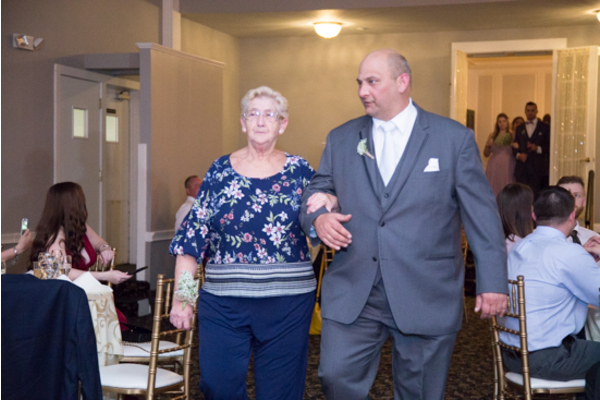 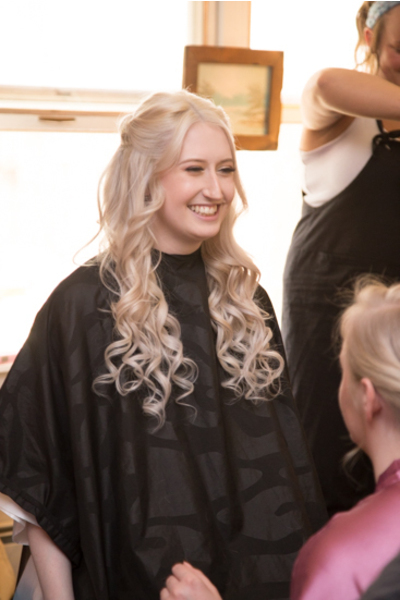 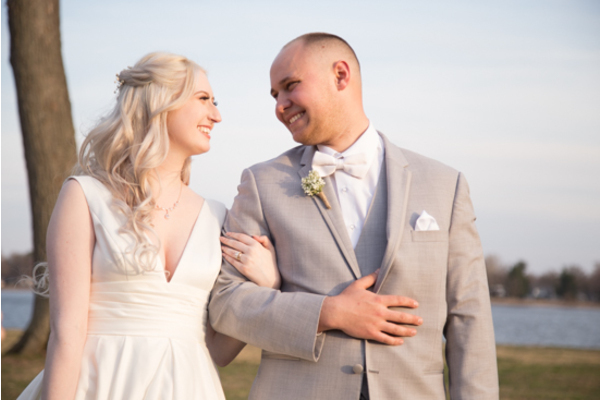 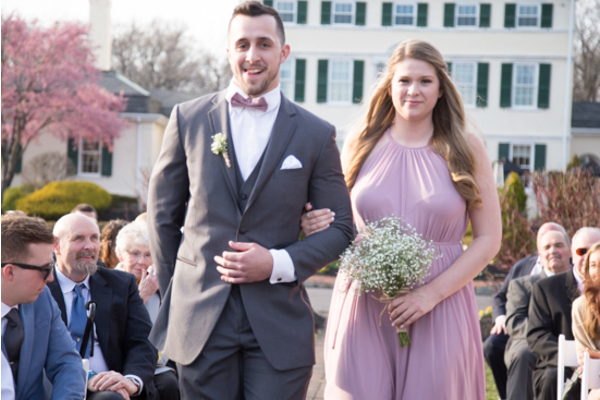 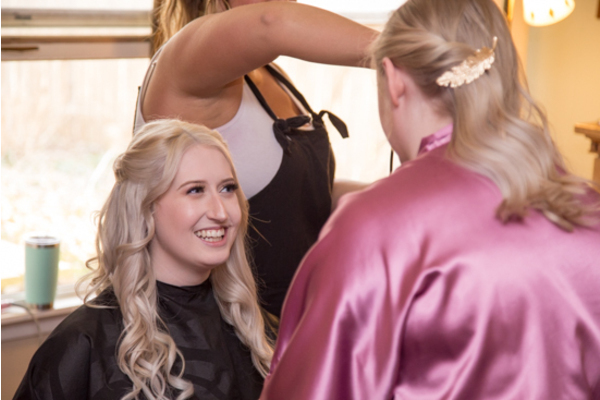 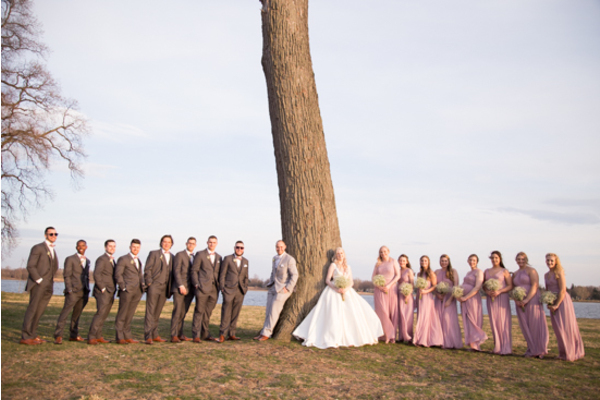 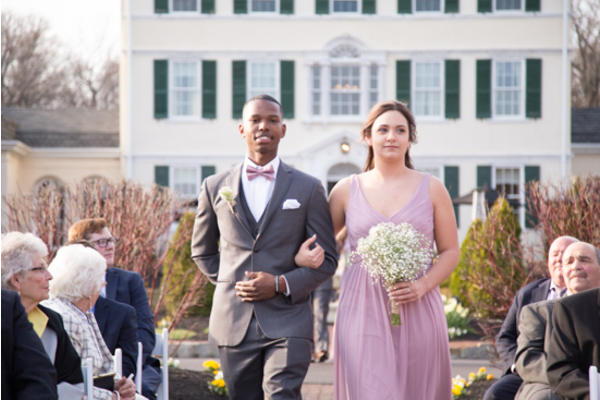 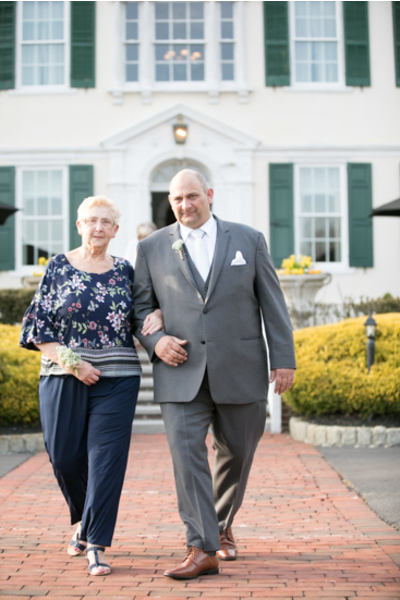 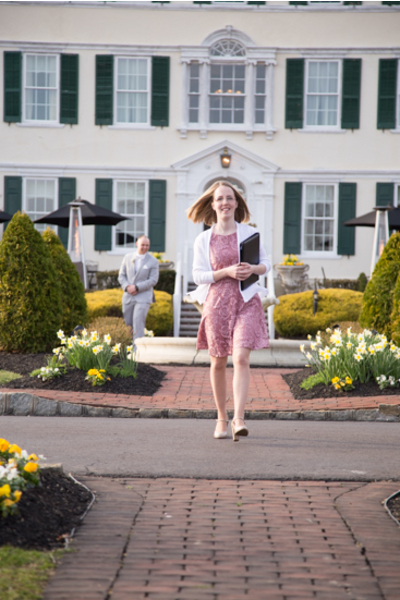 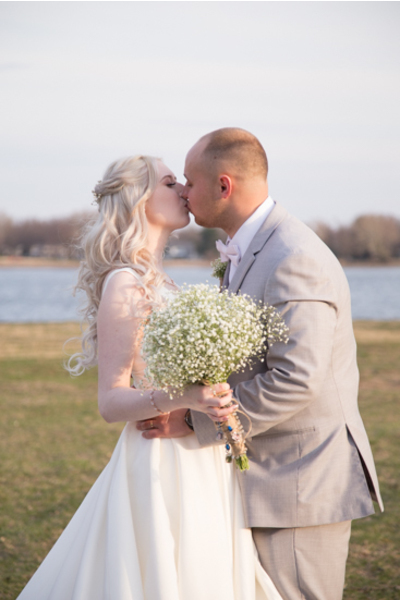 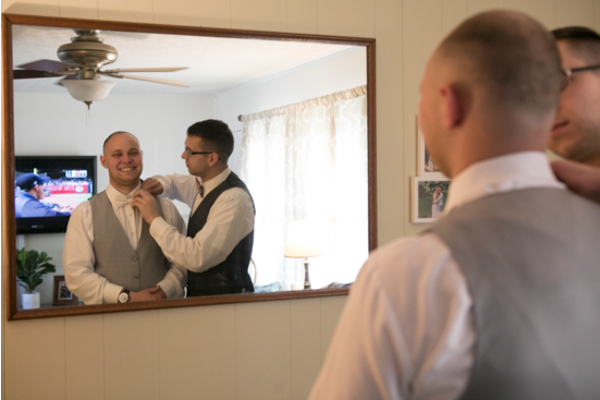 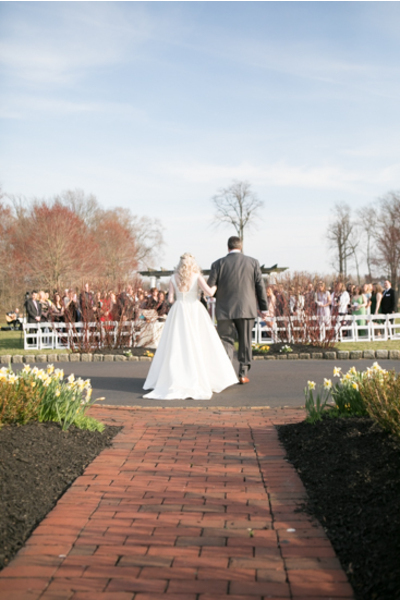 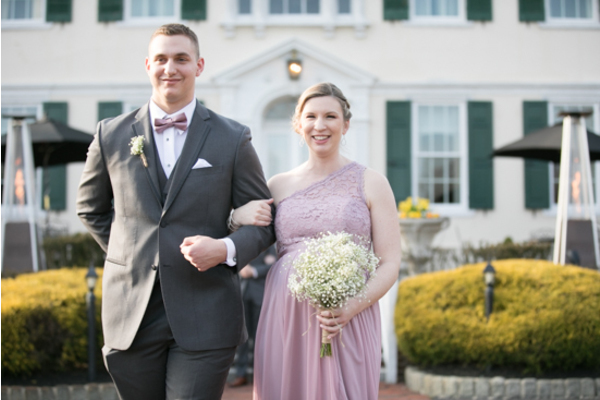 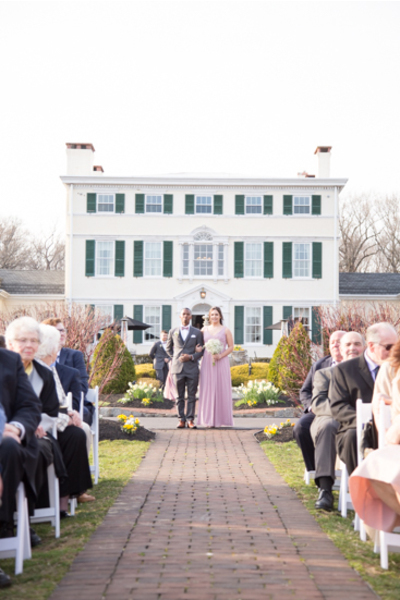 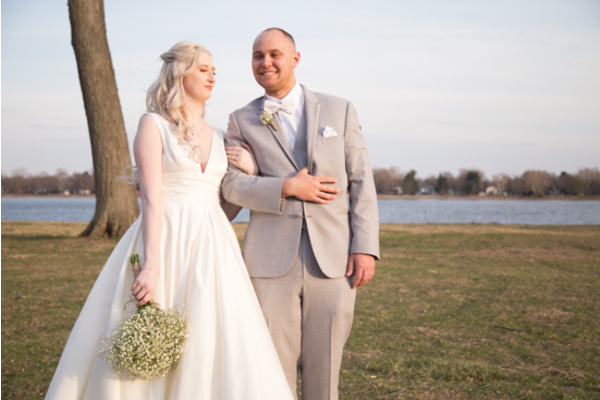 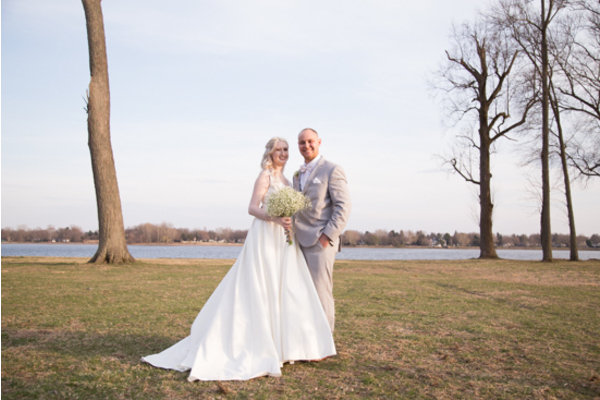 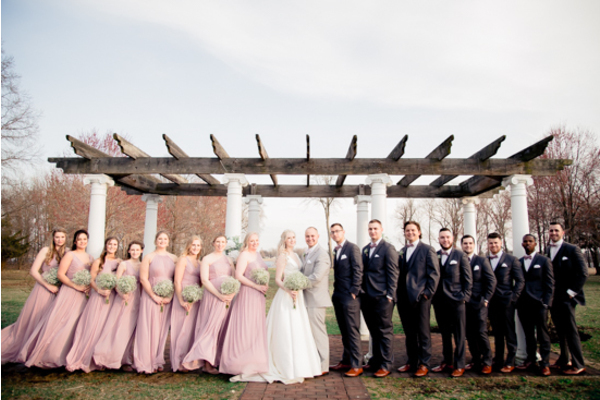 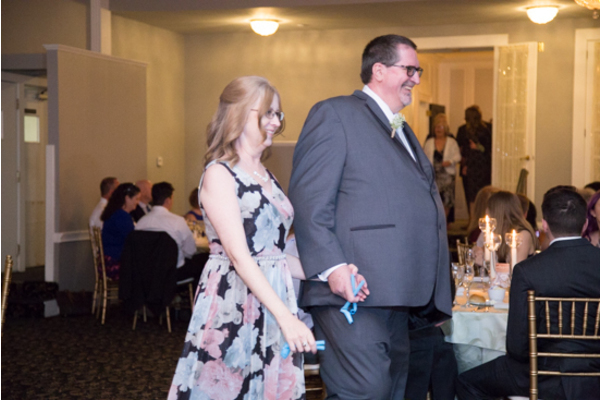 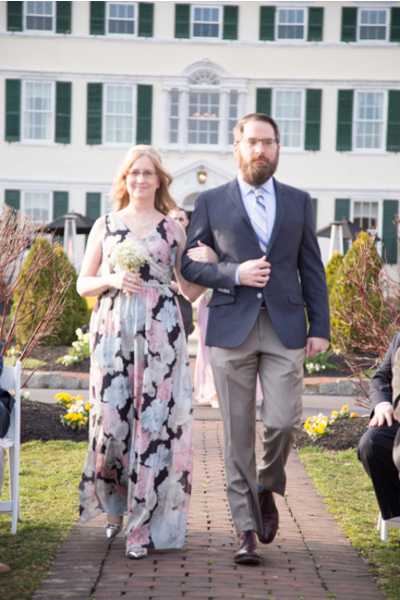 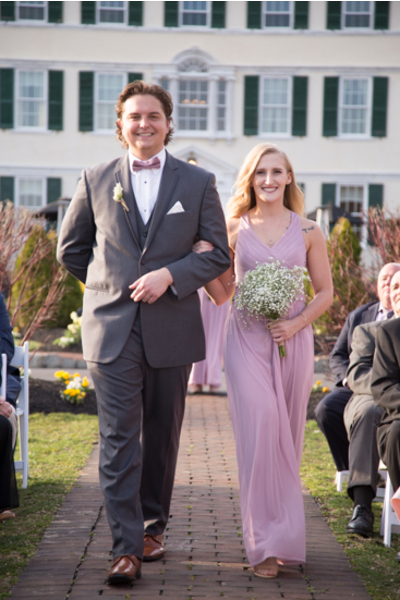 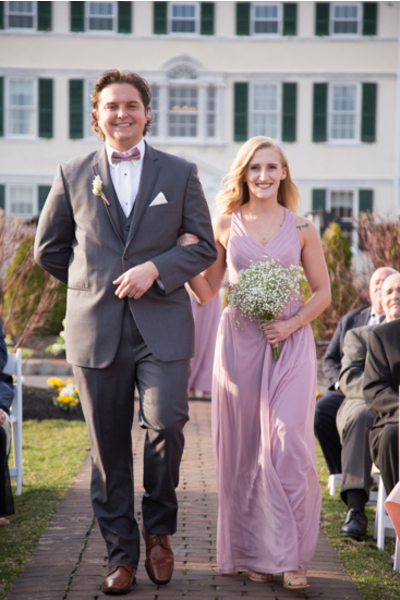 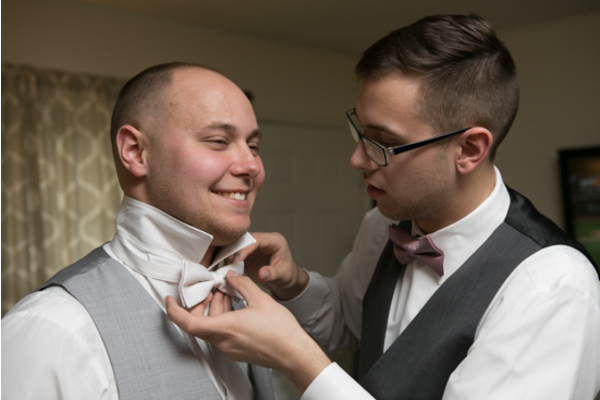 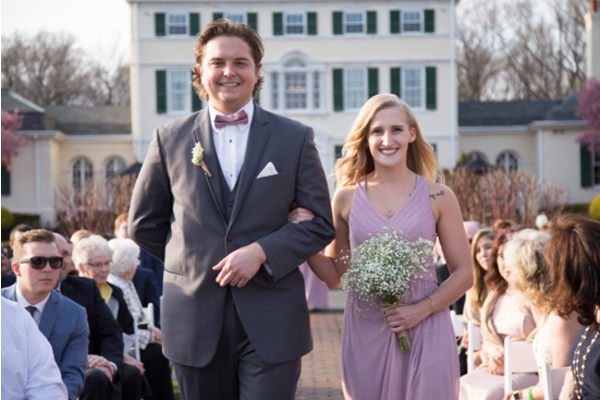 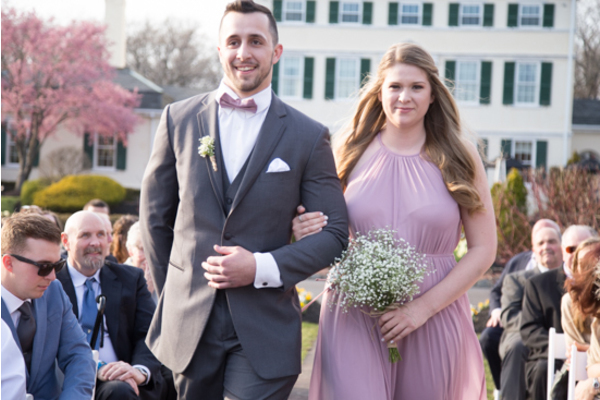 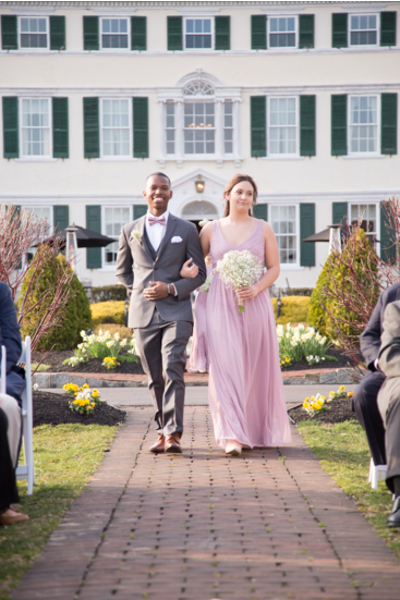 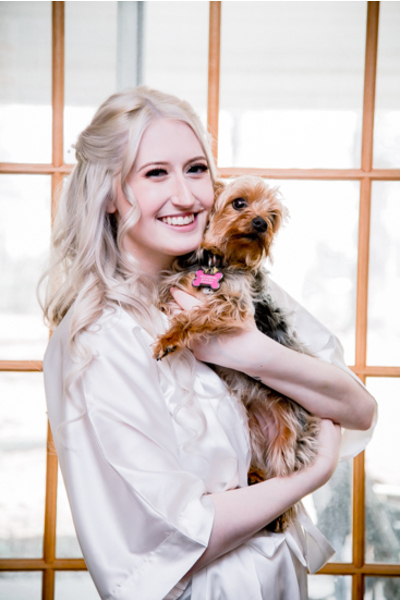 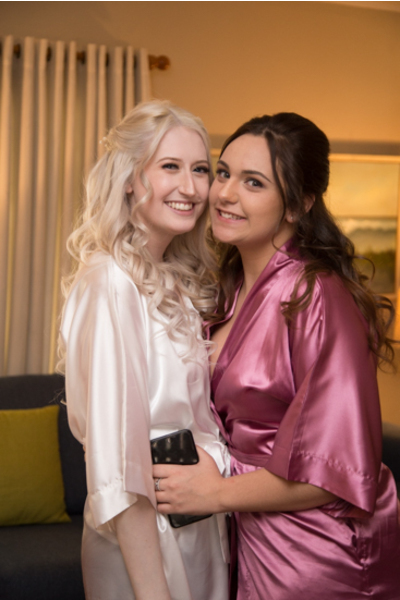 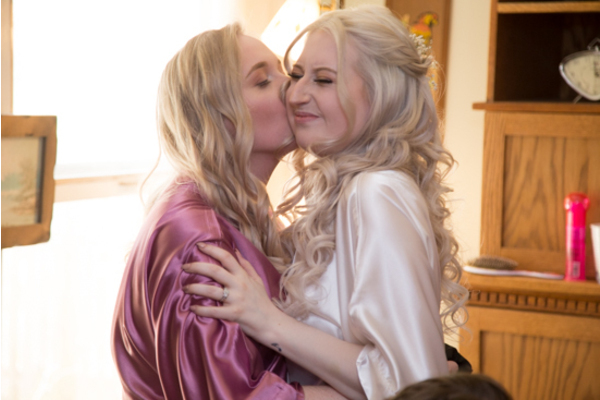 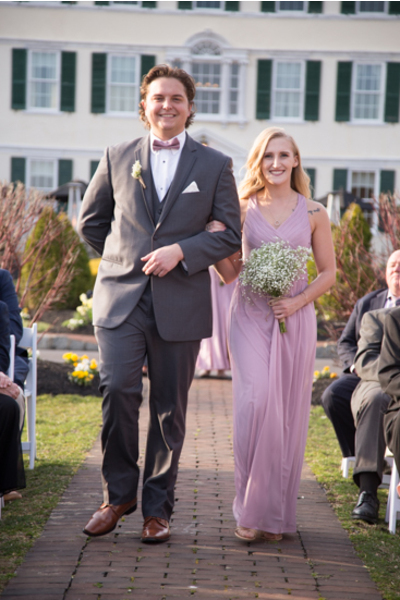 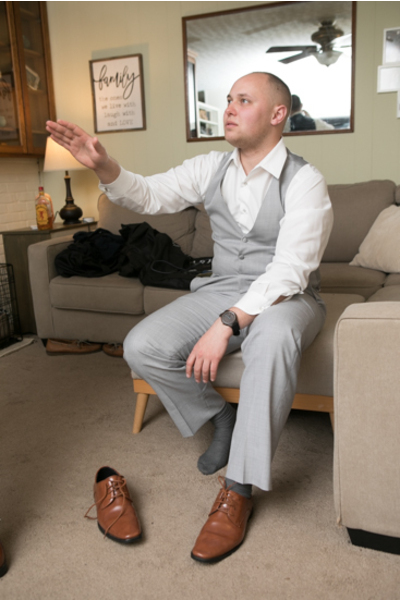 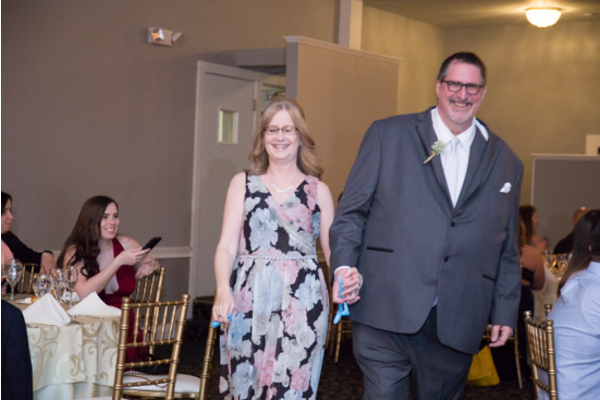 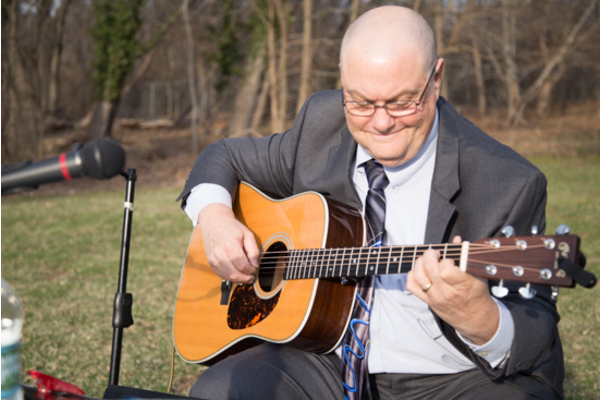 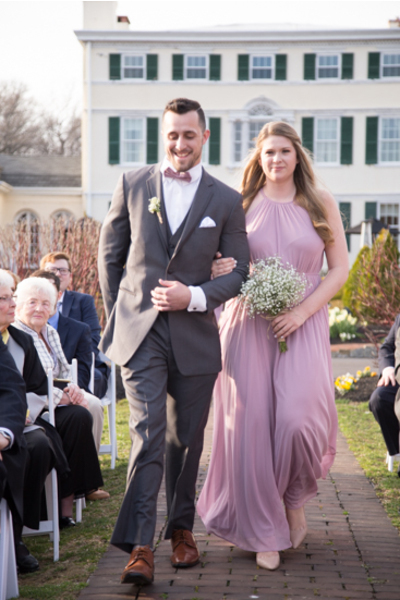 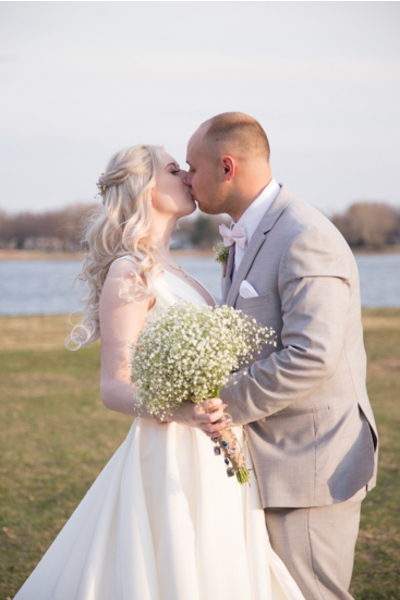 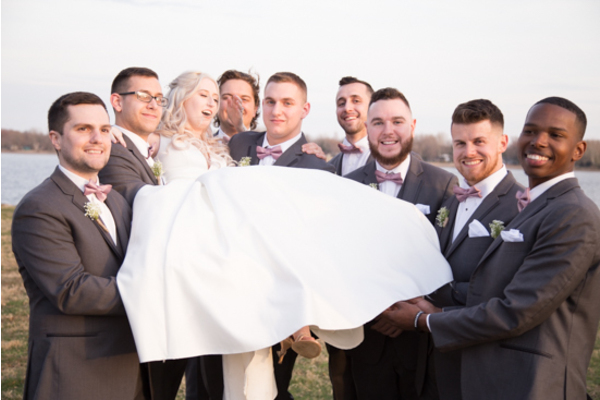 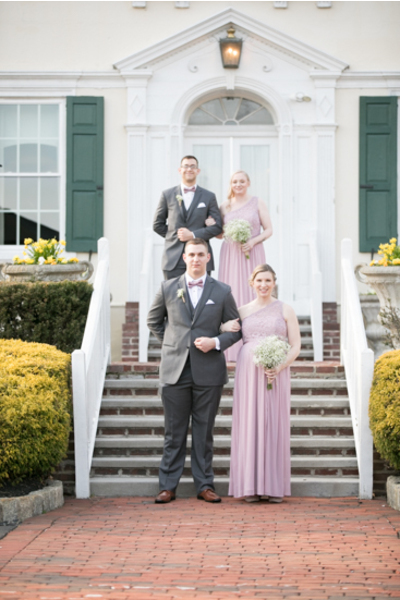 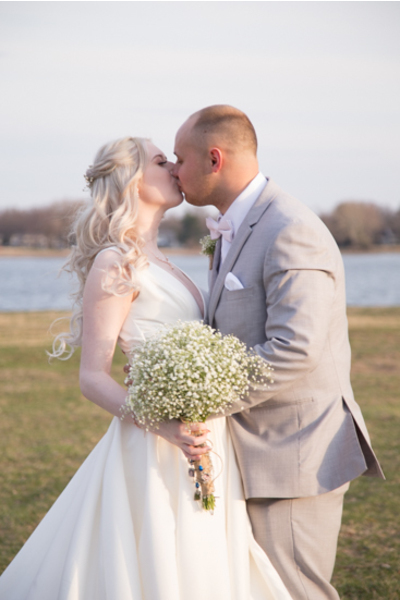 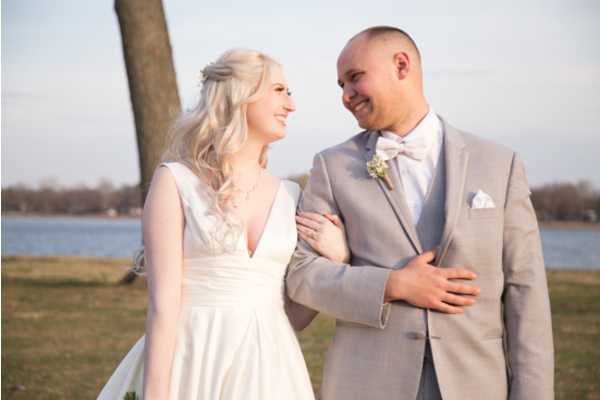 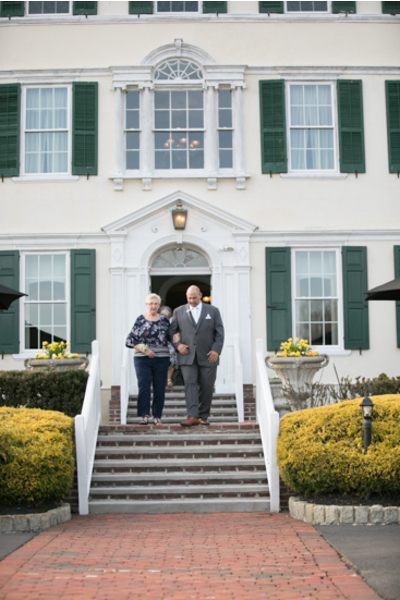 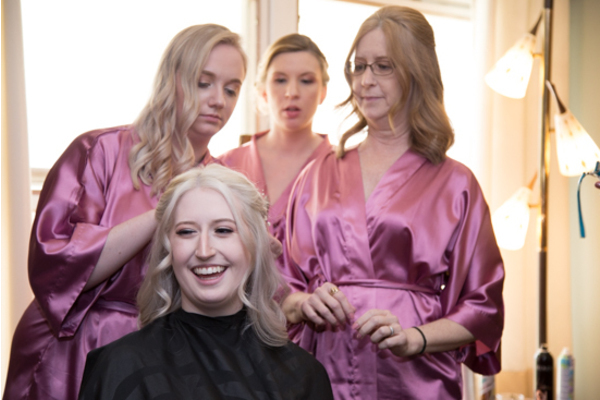 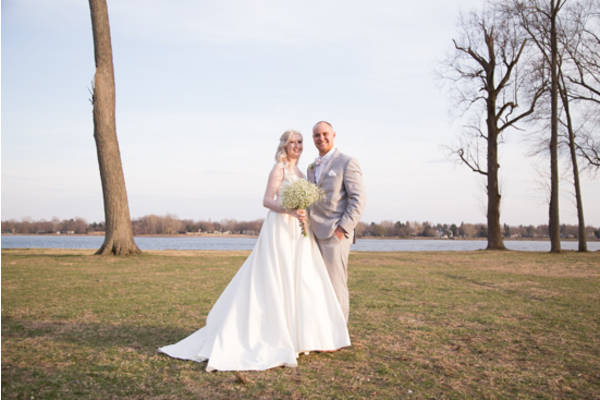 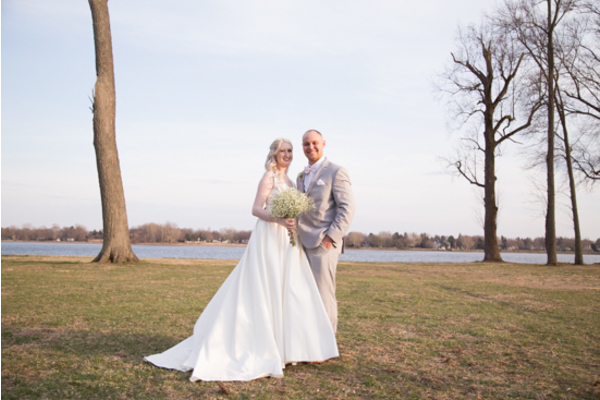 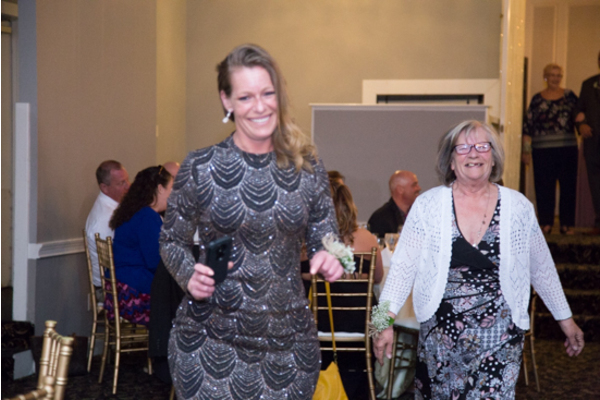 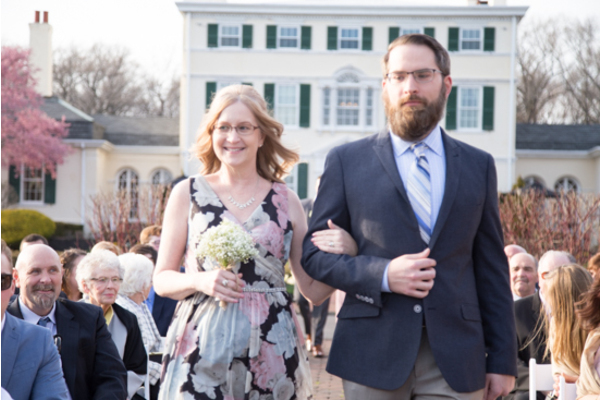 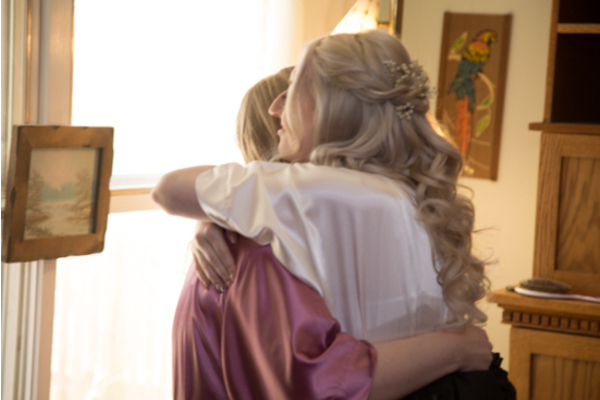 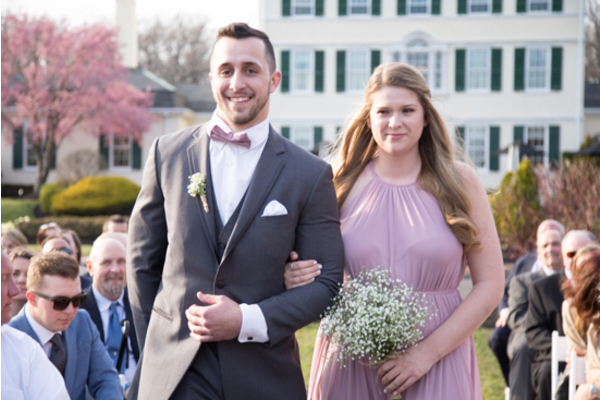 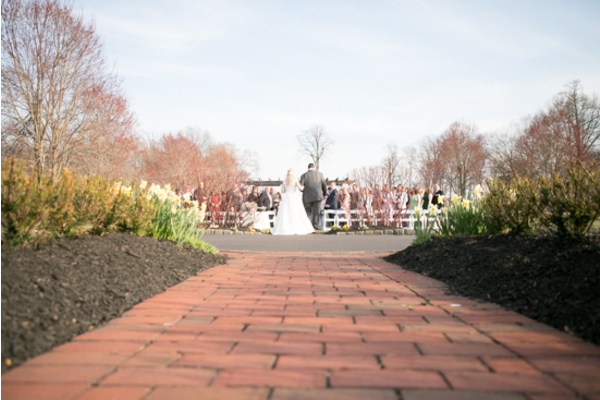 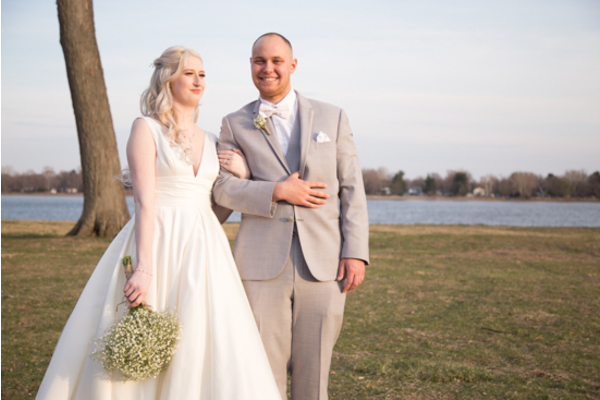 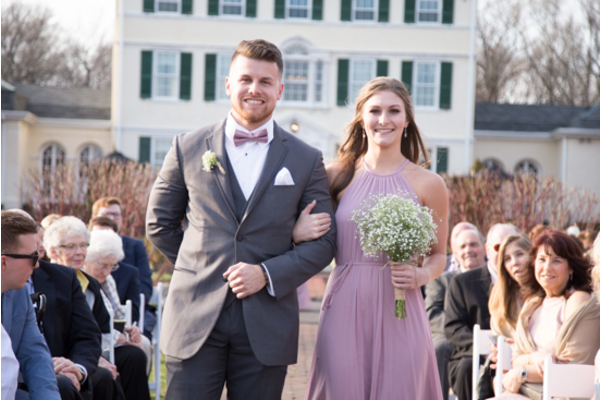 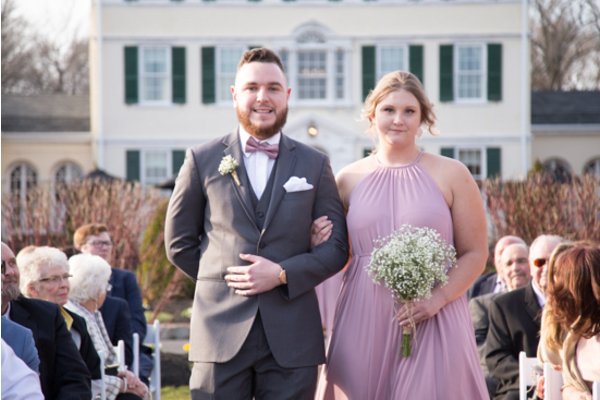 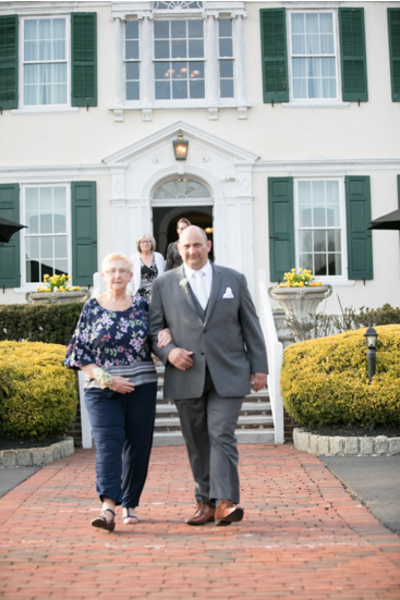 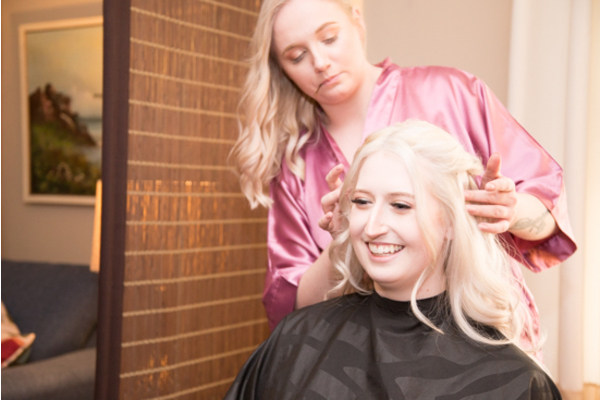 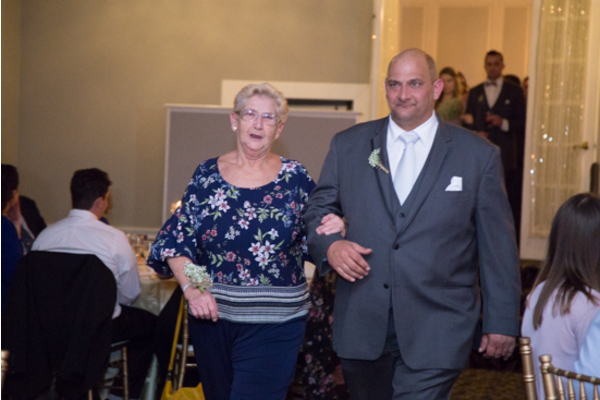 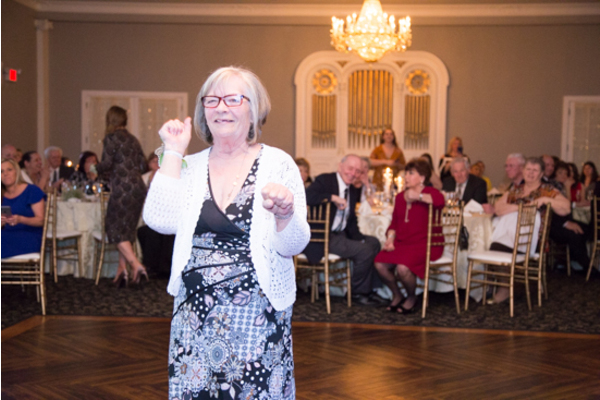 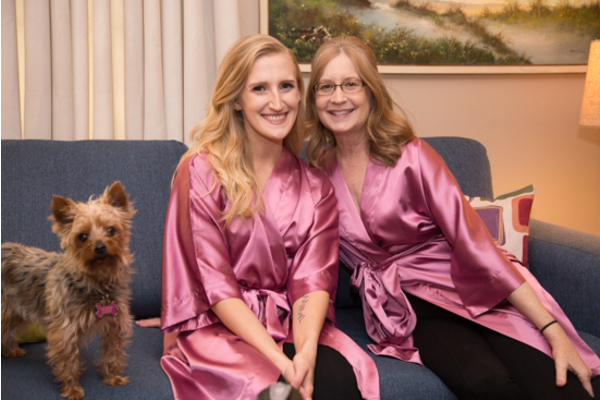 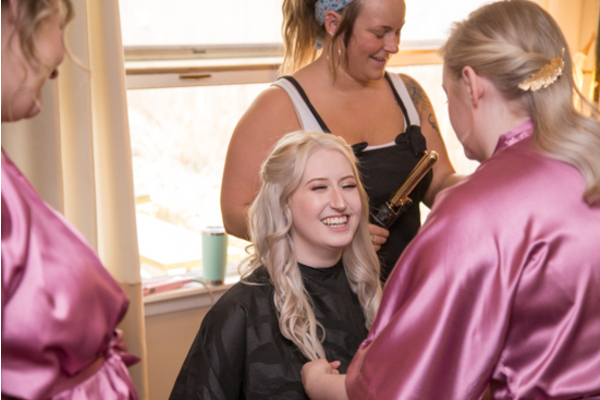 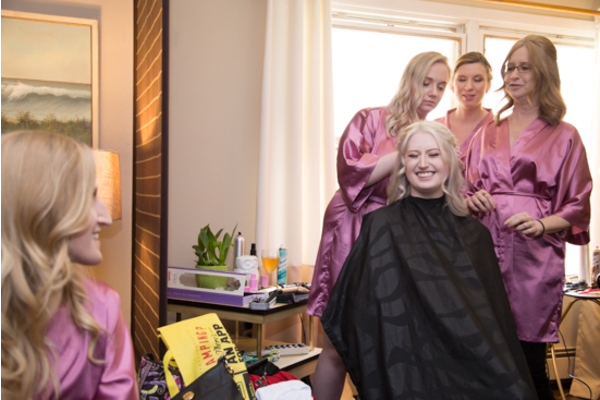 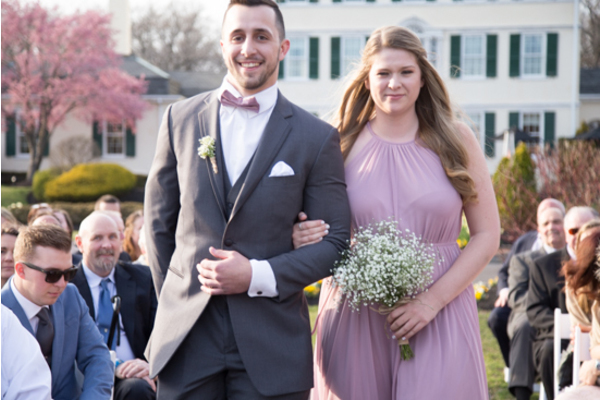 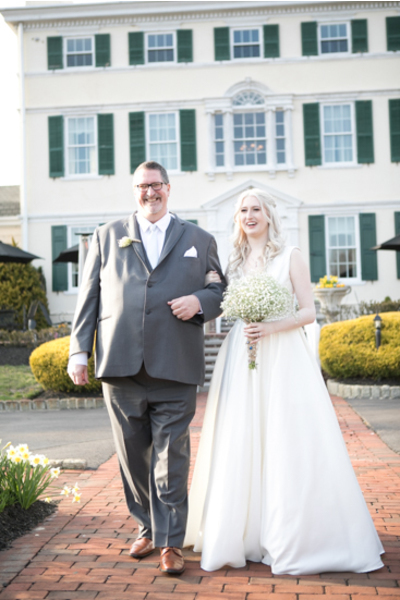 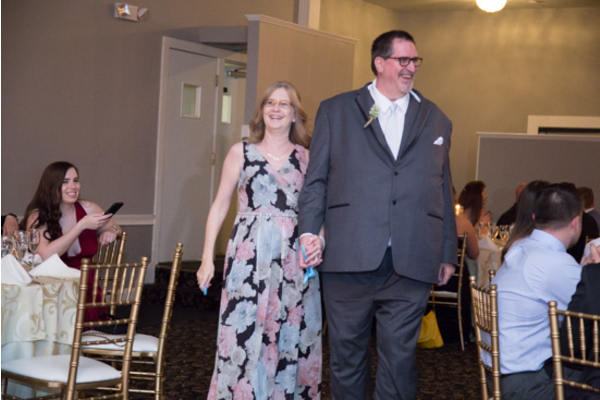 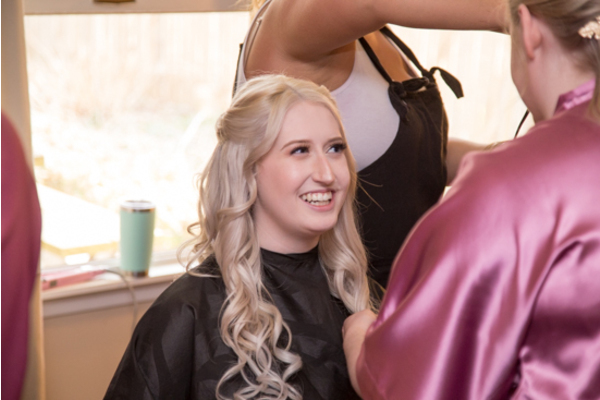 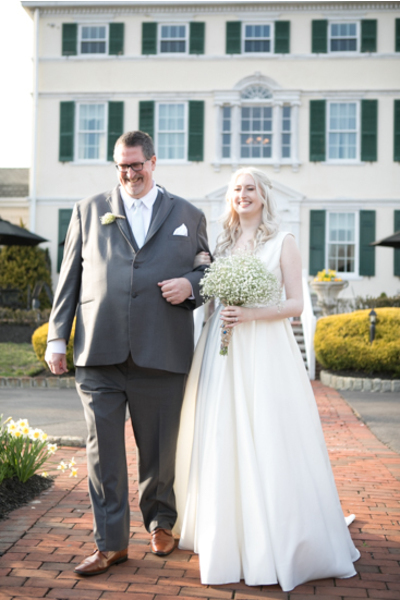 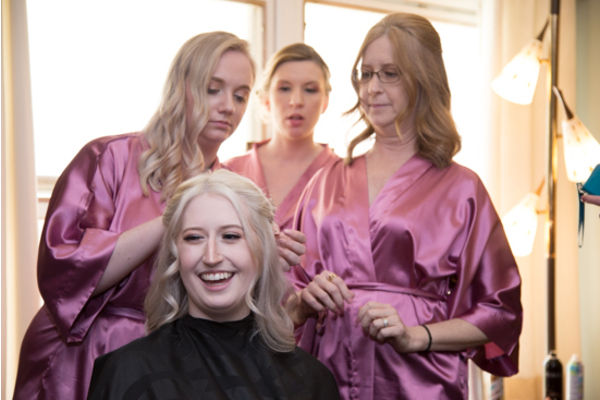 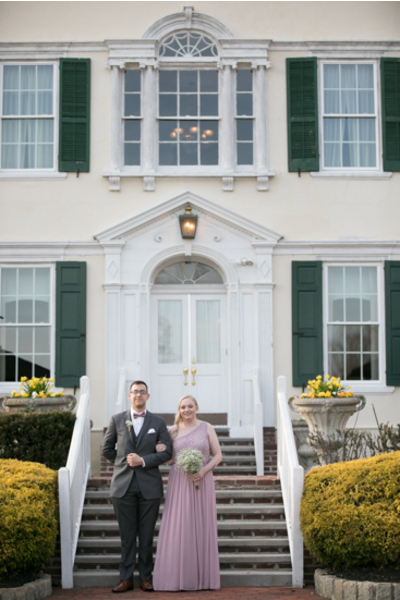 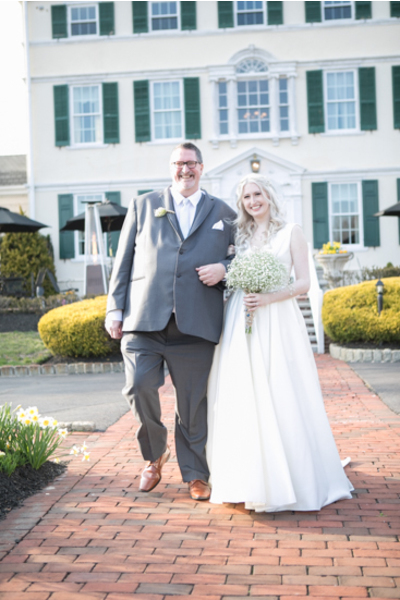 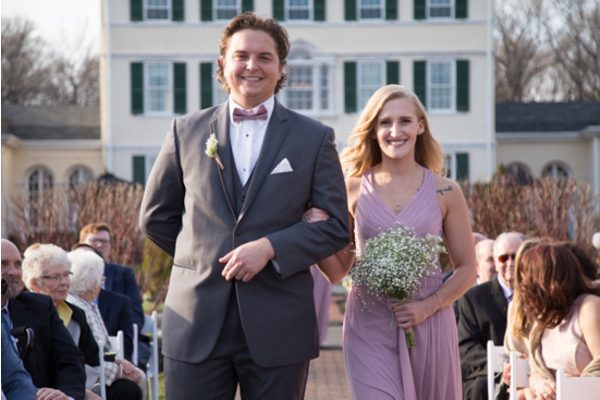 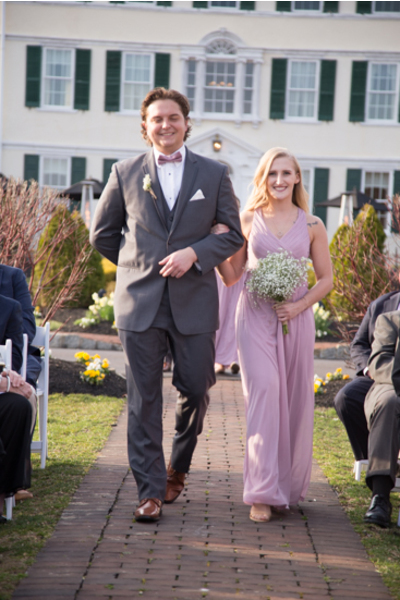 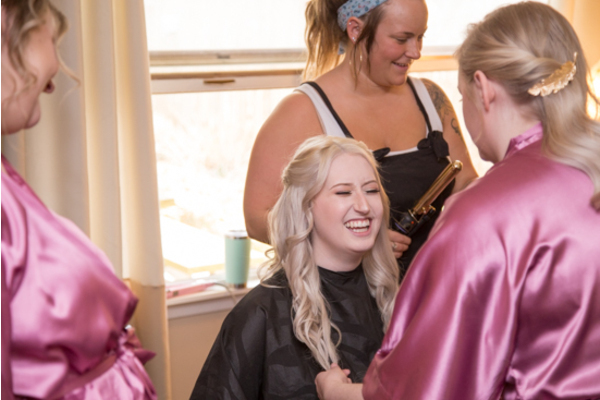 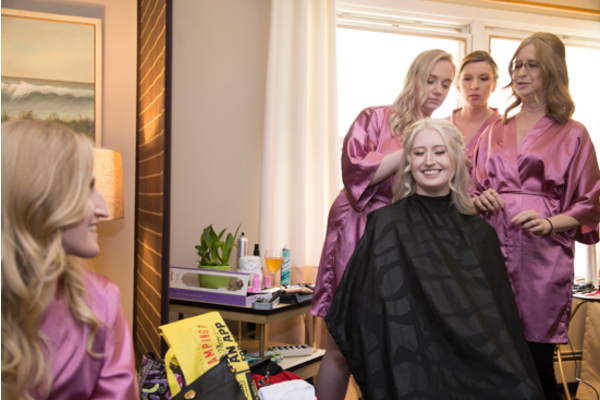 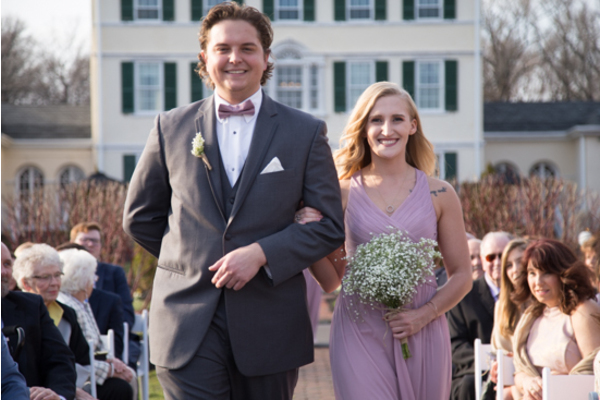 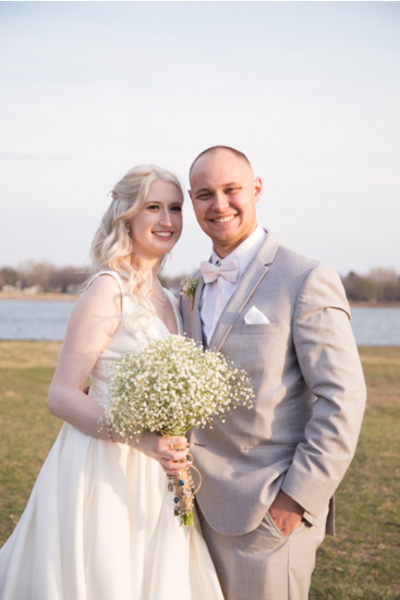 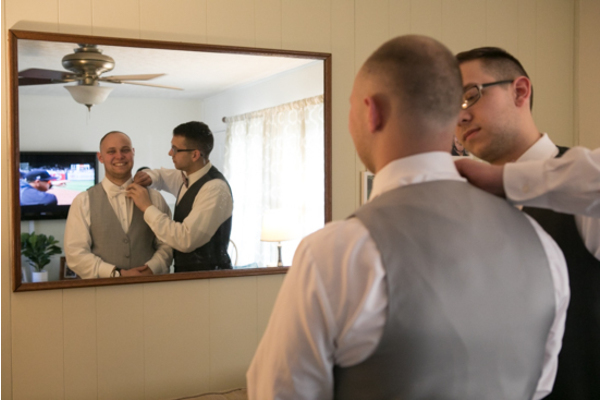 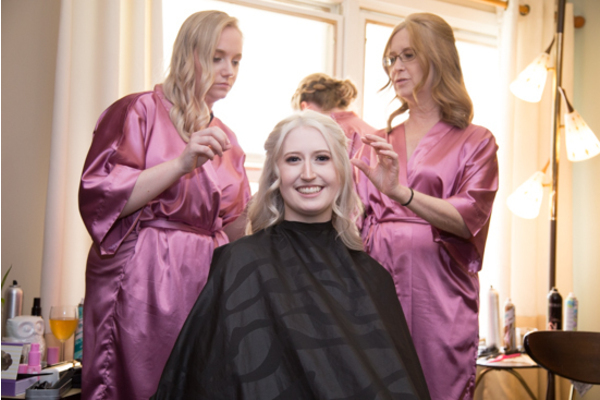 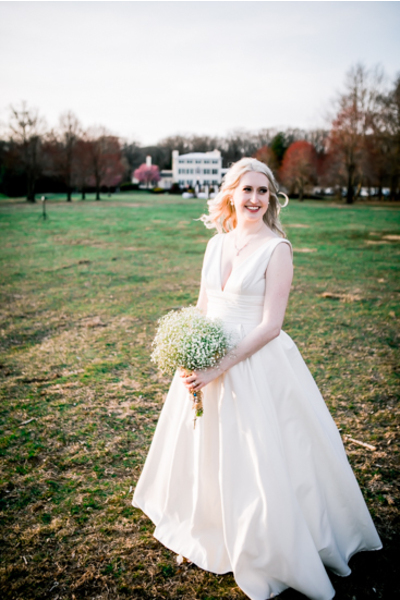 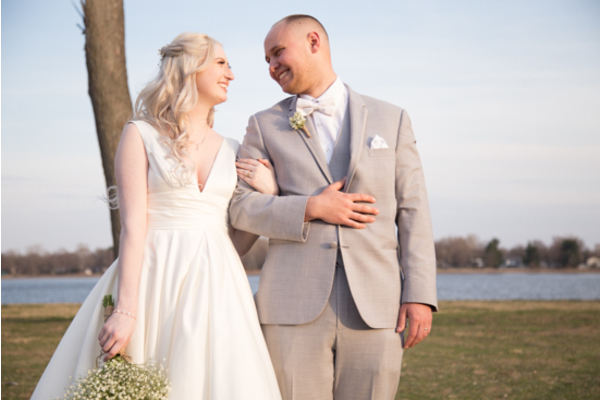 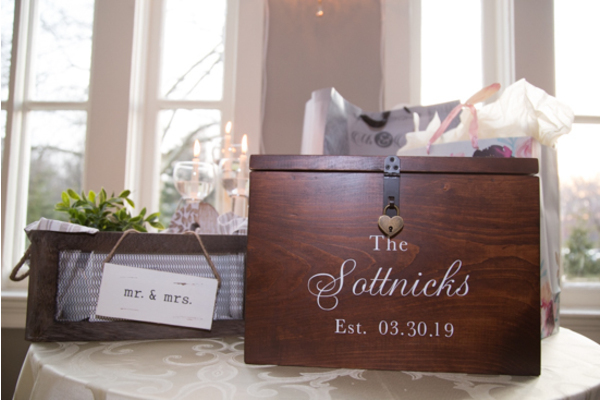 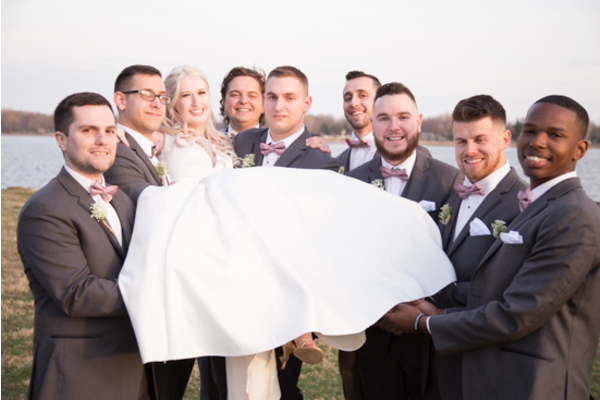 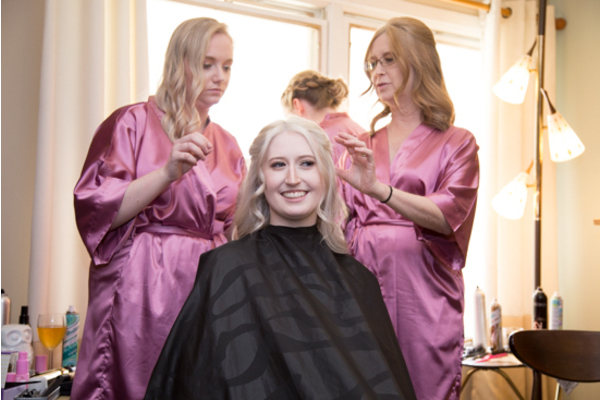 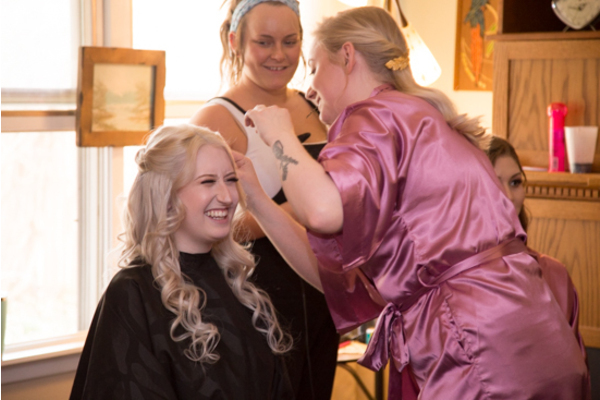 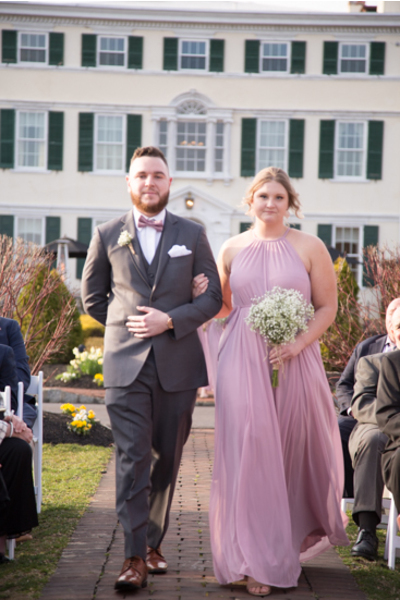 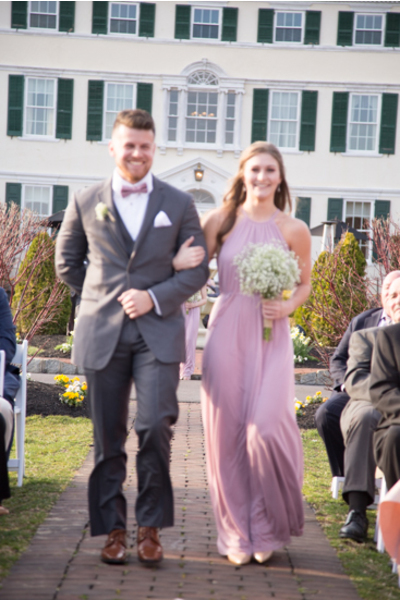 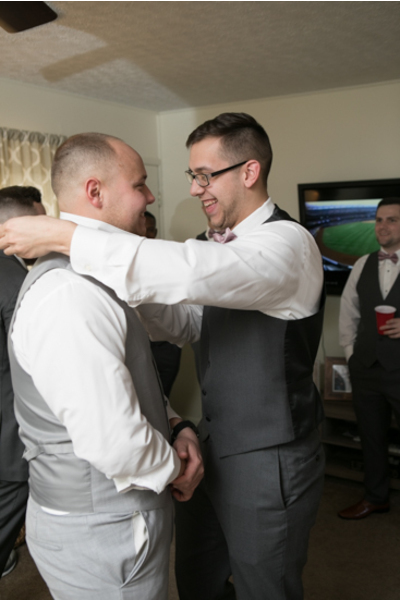 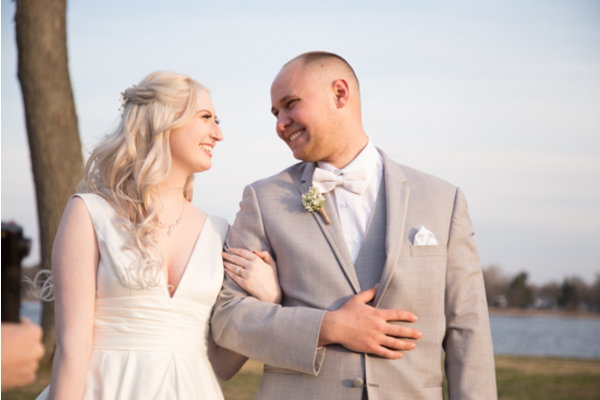 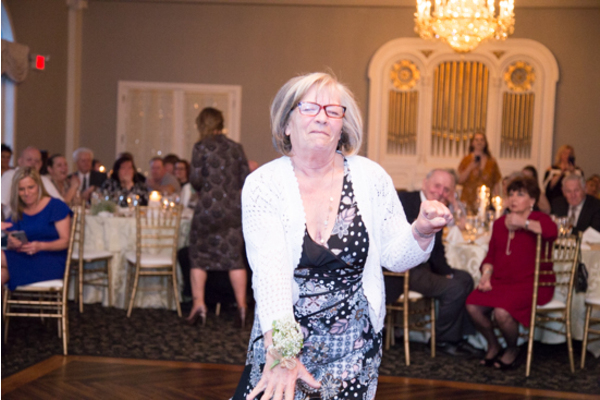 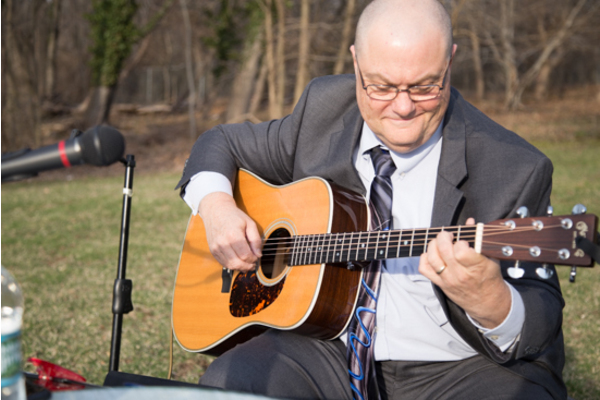 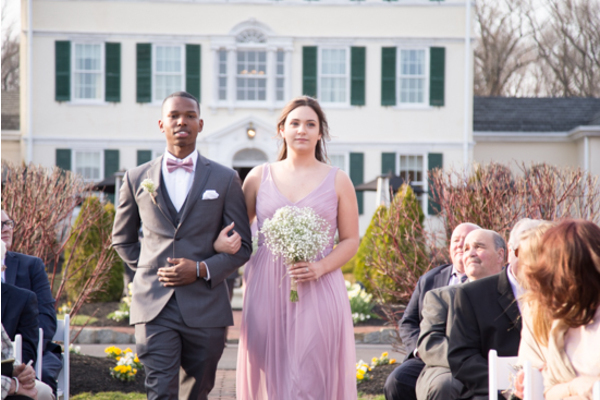 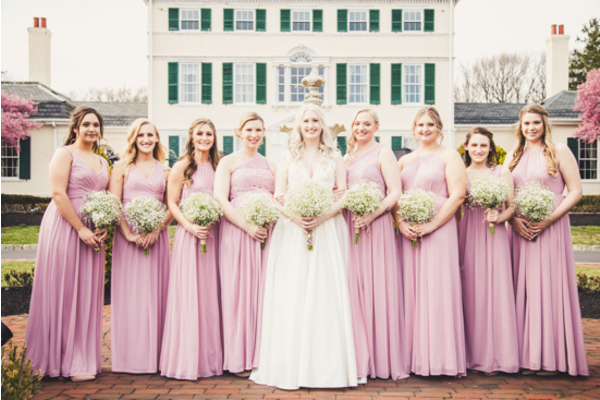 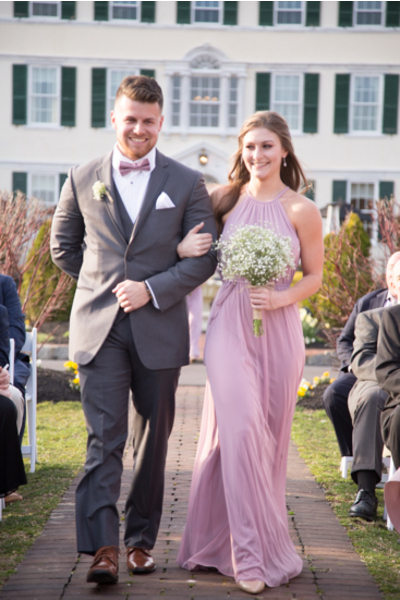 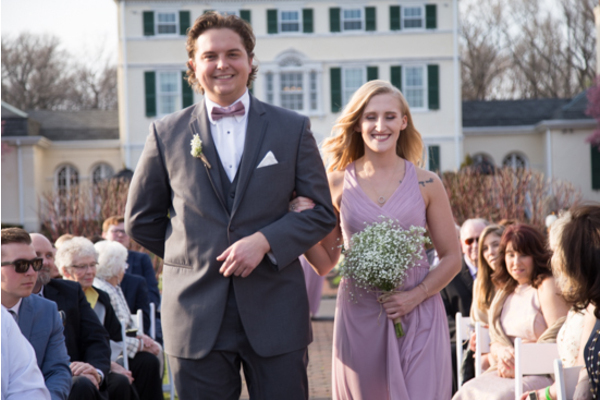 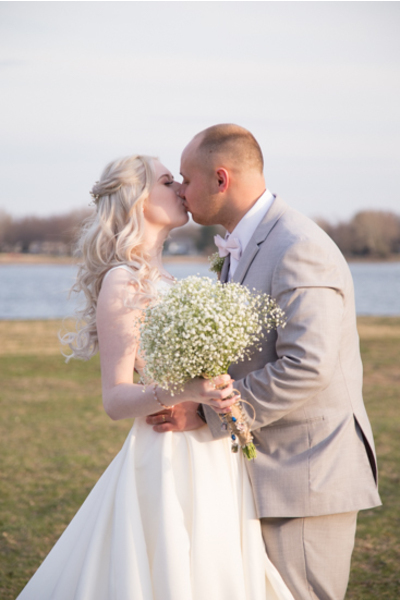 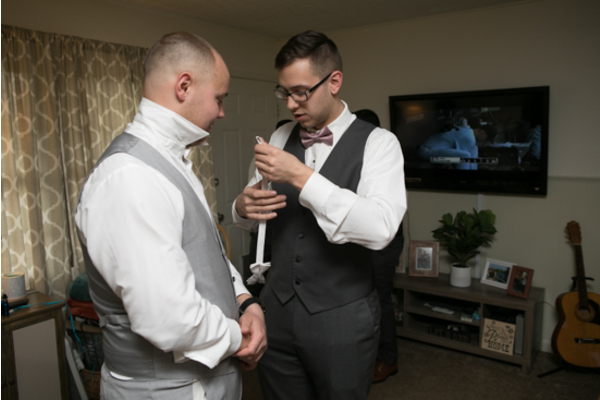 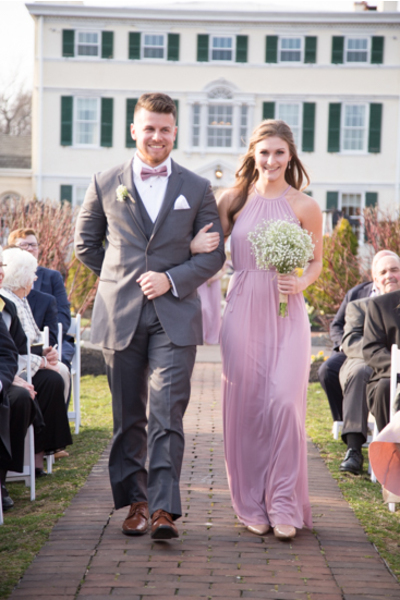 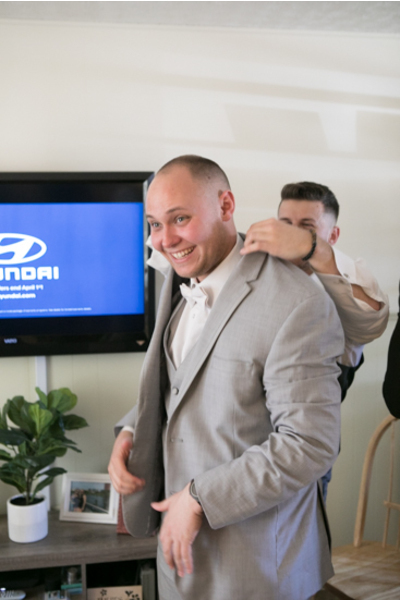 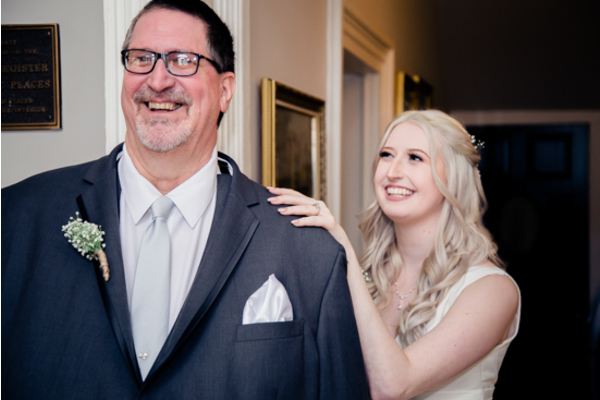 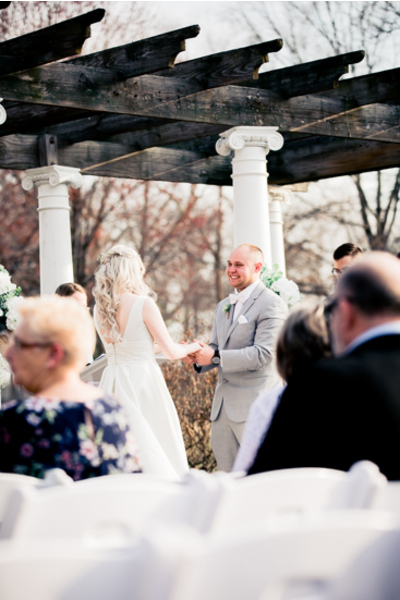 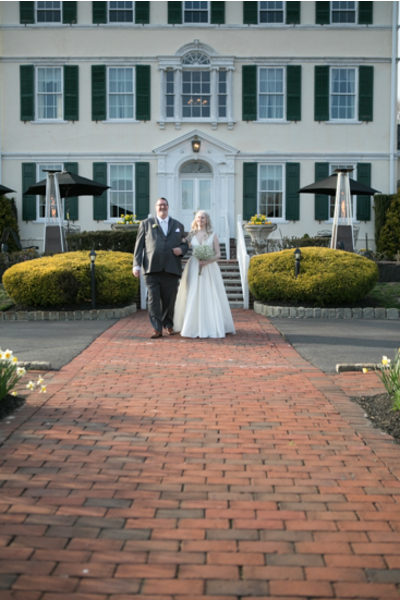 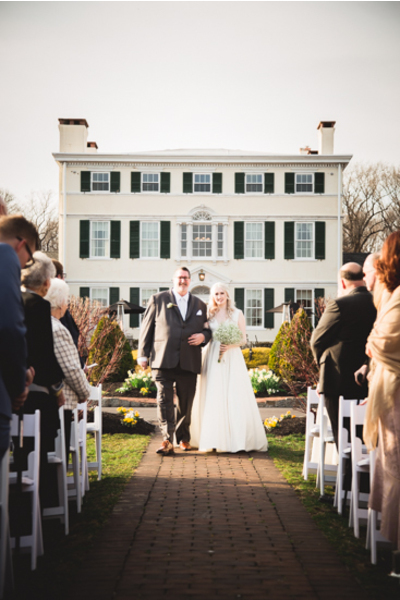 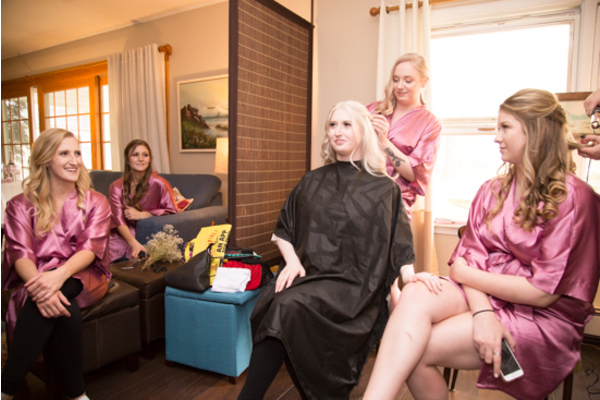 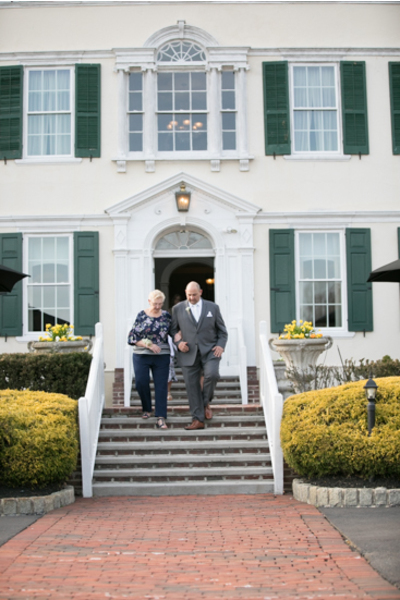 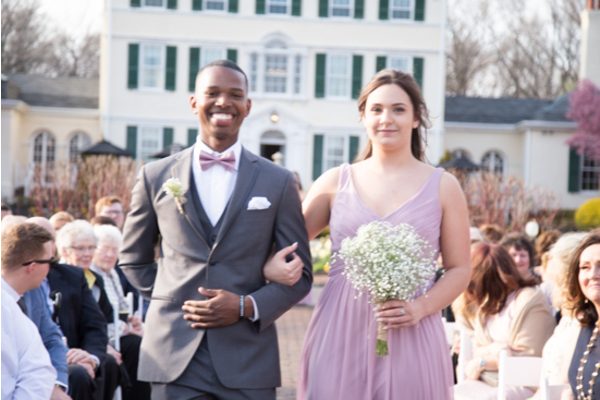 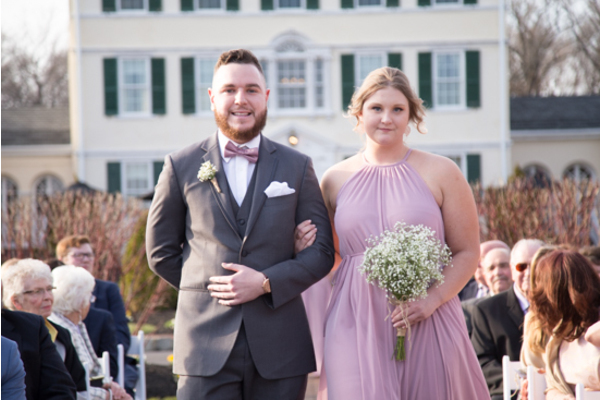 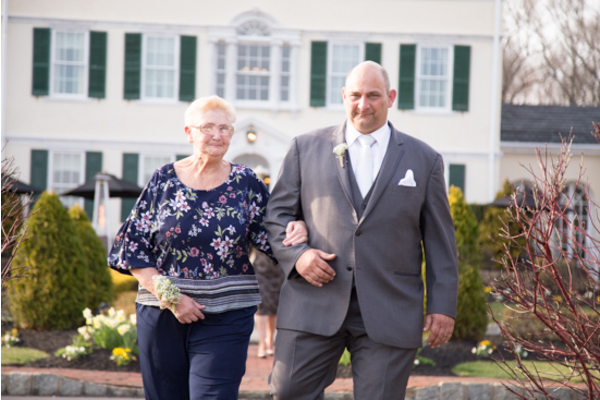 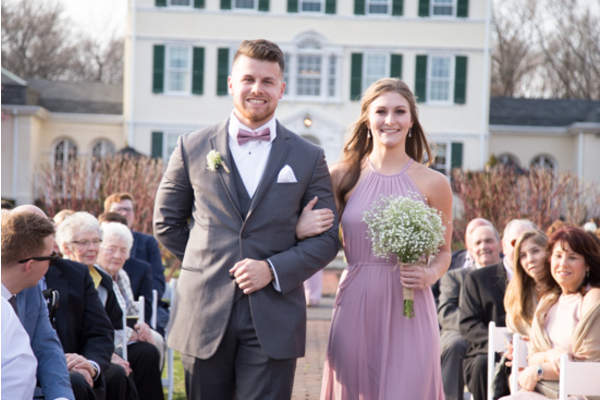 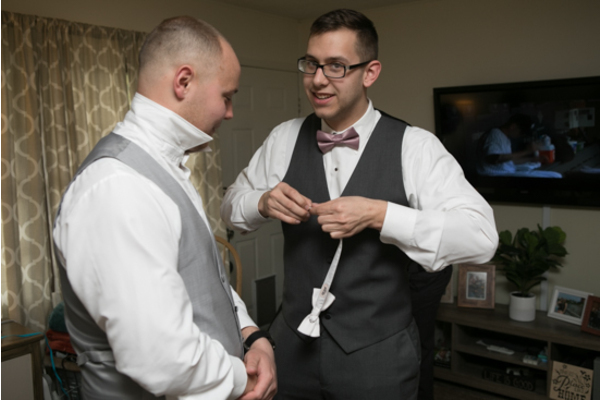 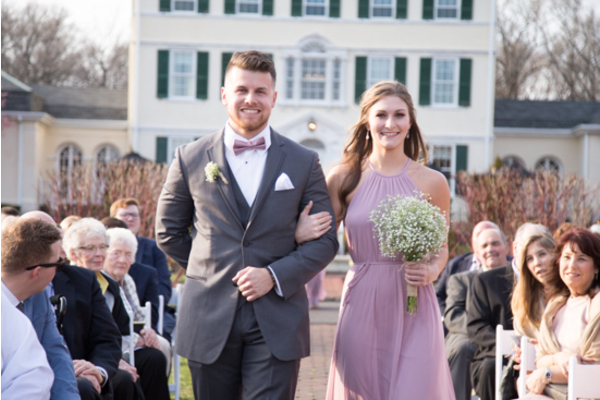 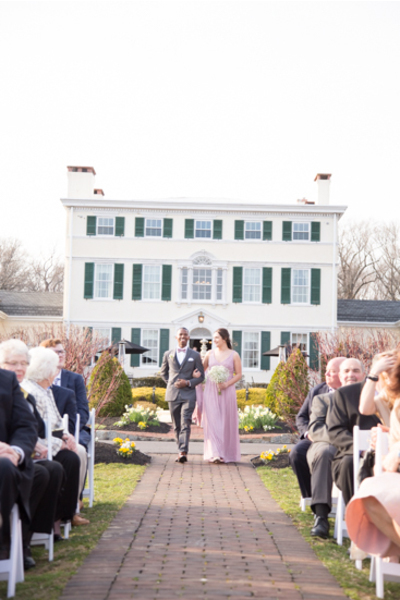 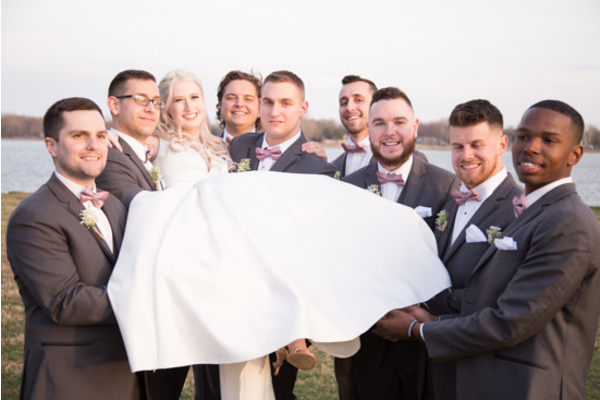 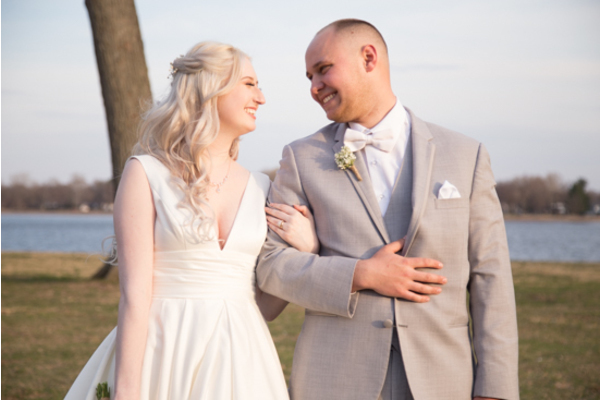 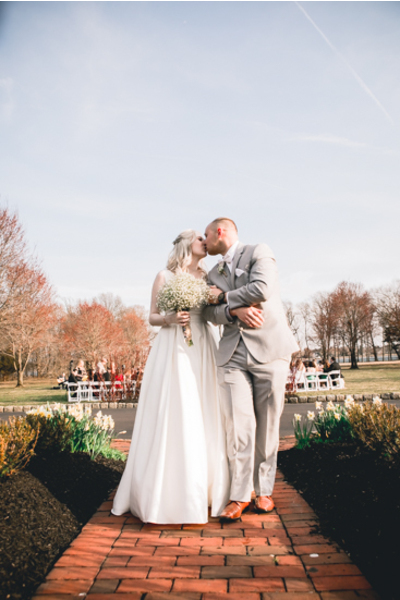 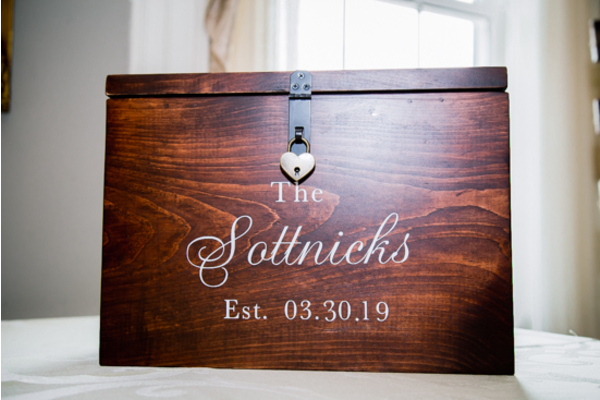 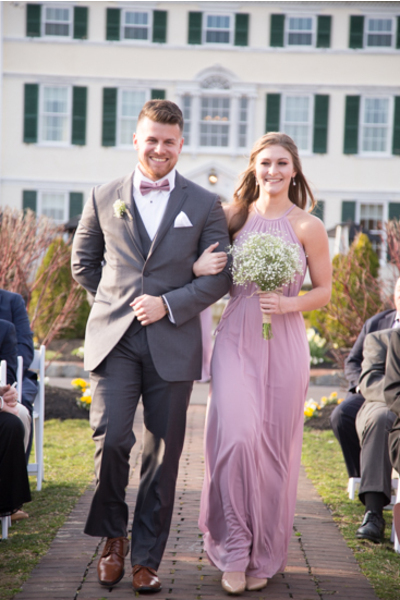 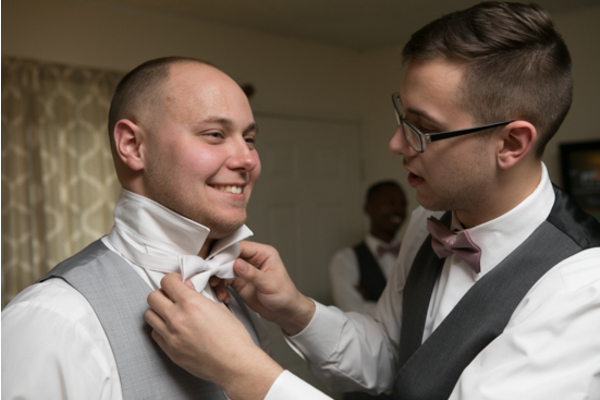 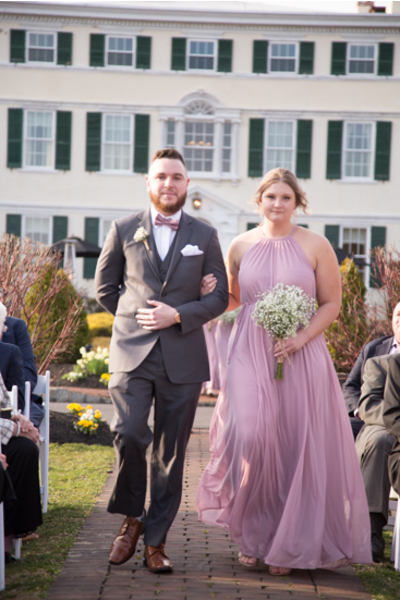 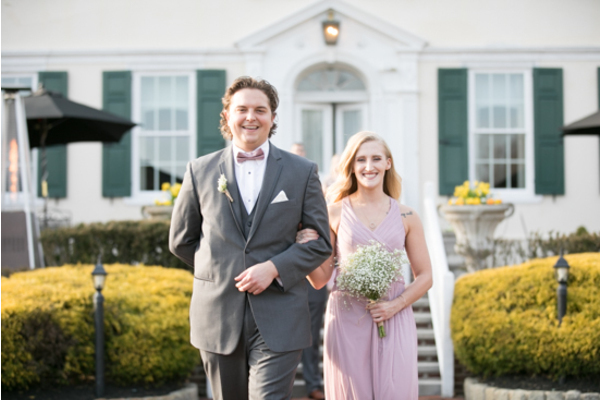 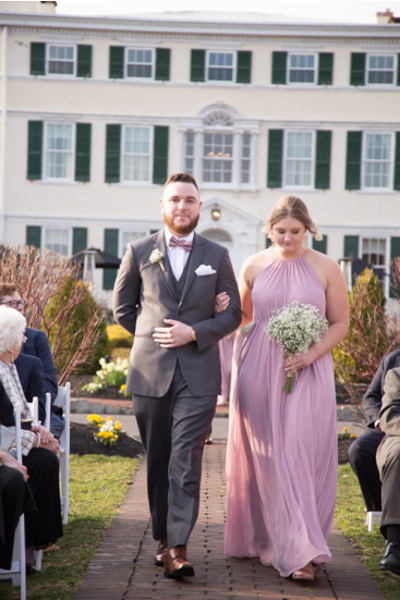 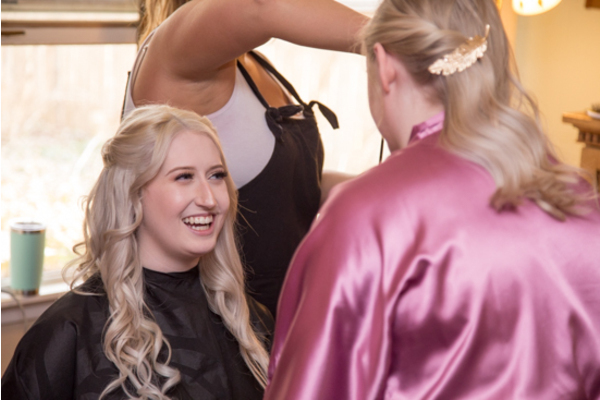 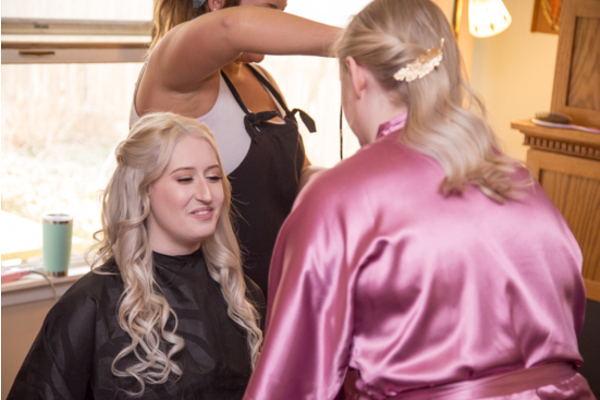 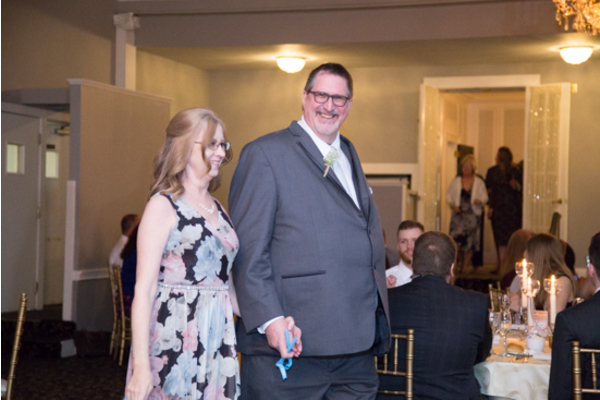 On March 30th, 2019, they got married at the Pen Ryn Estate in Bensalem, PA. 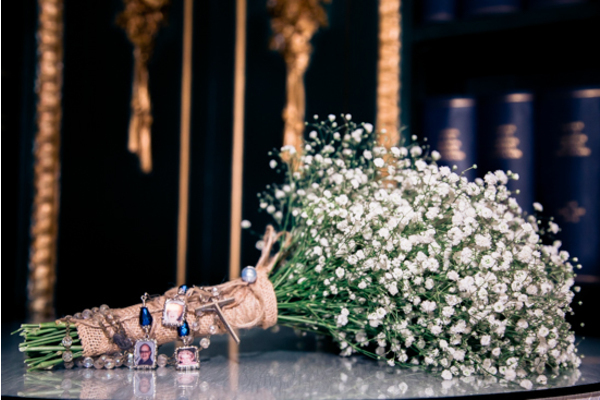 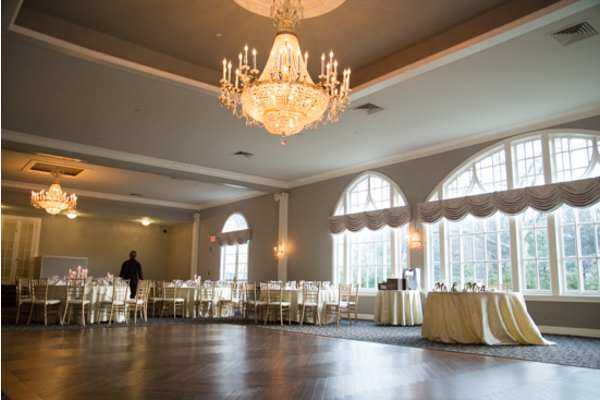 Overall, this was the most perfect venue to celebrate their special day with its elegance and charm. 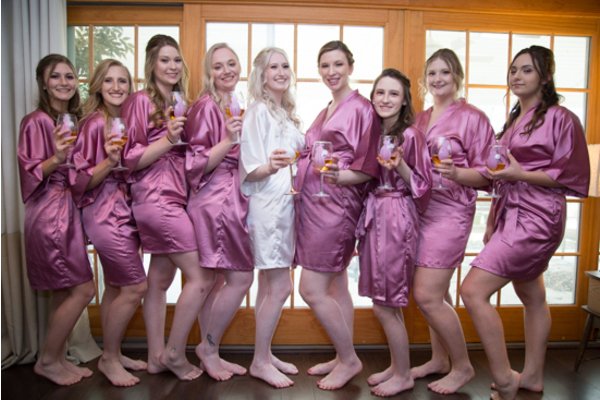 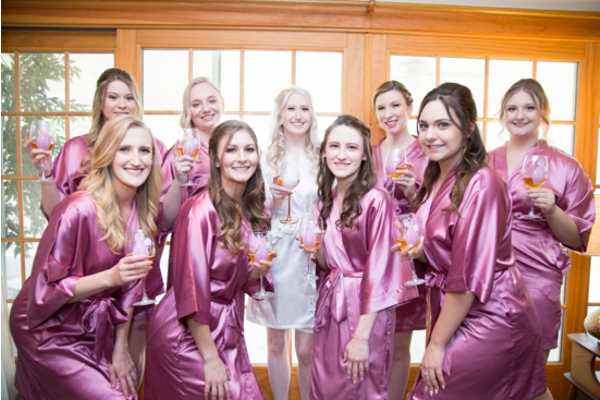 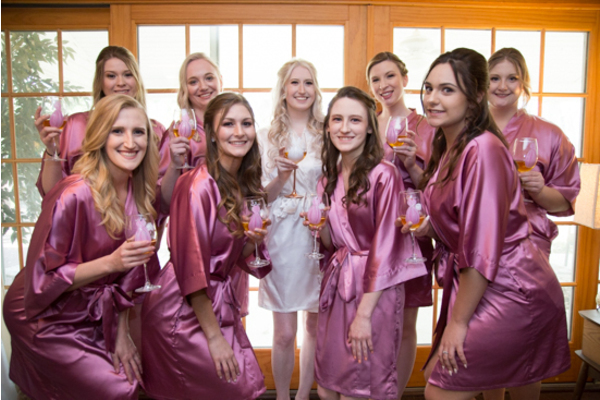 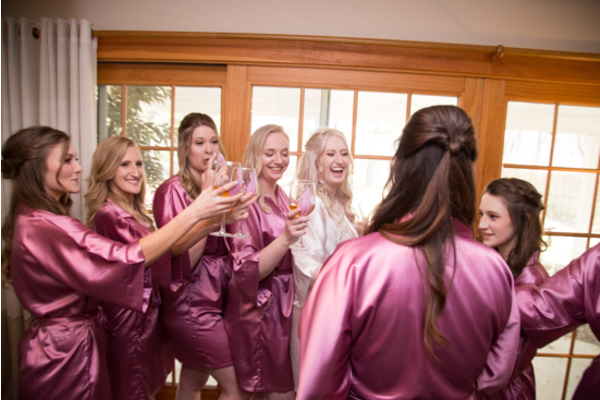 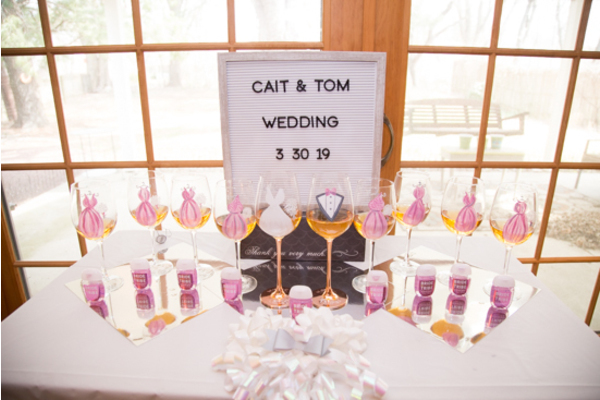 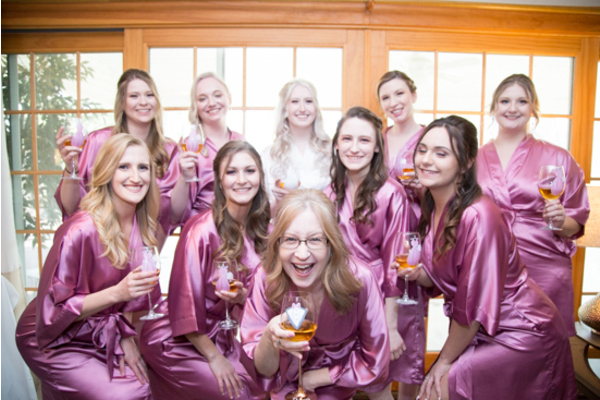 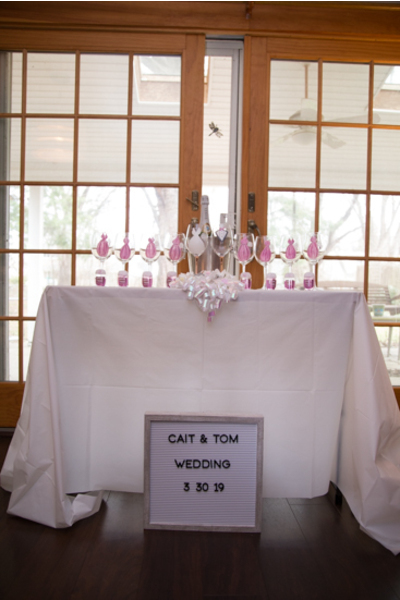 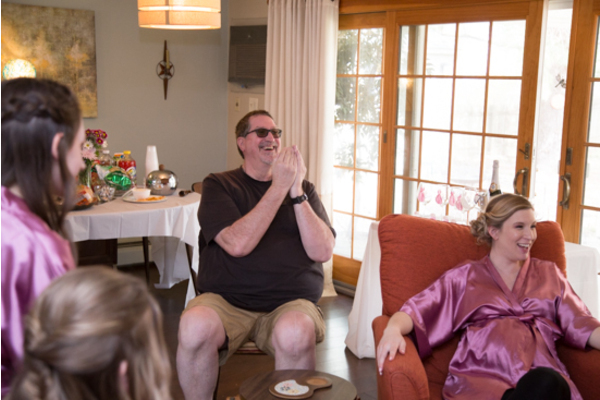 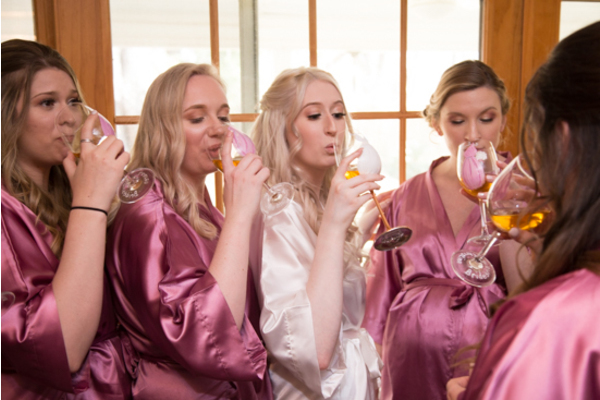 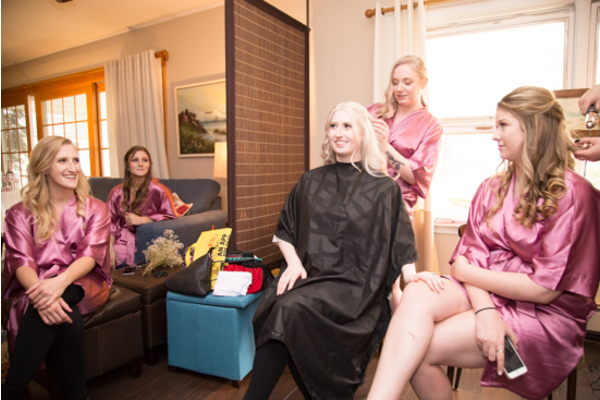 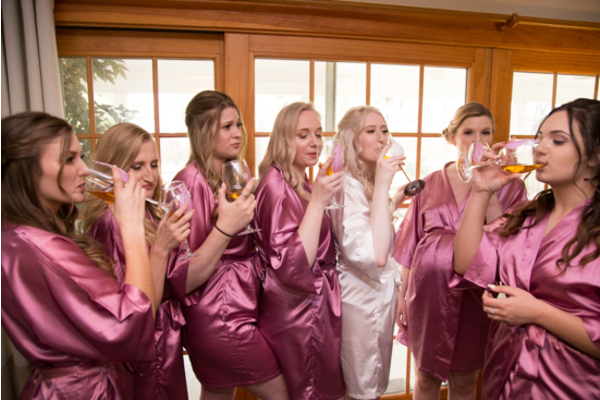 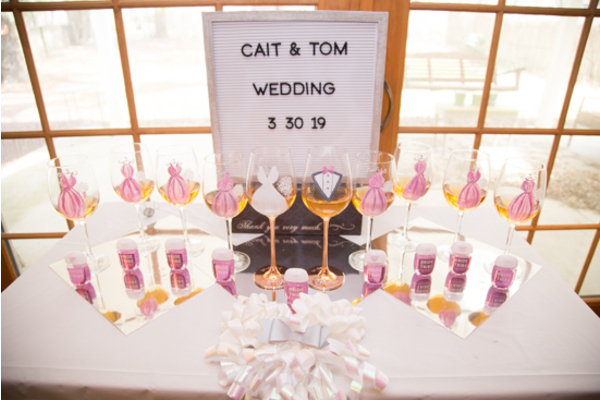 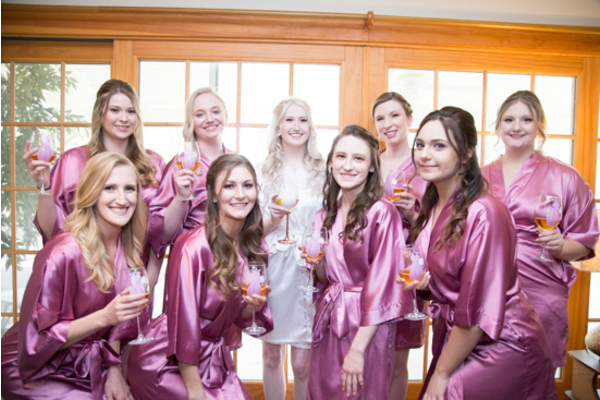 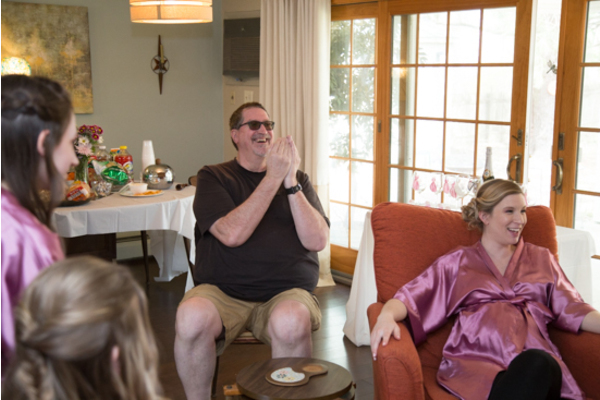 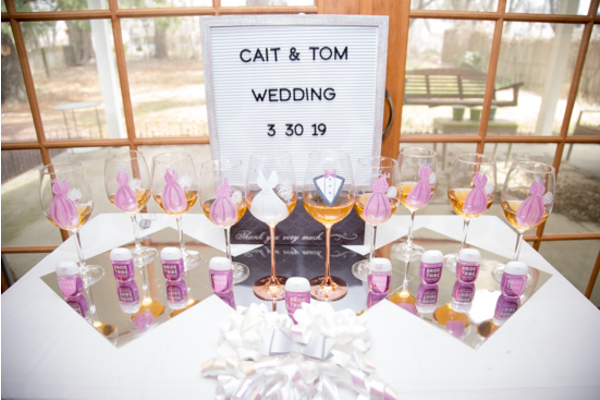 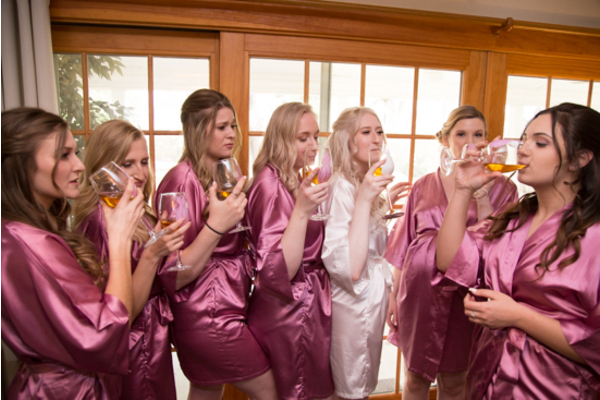 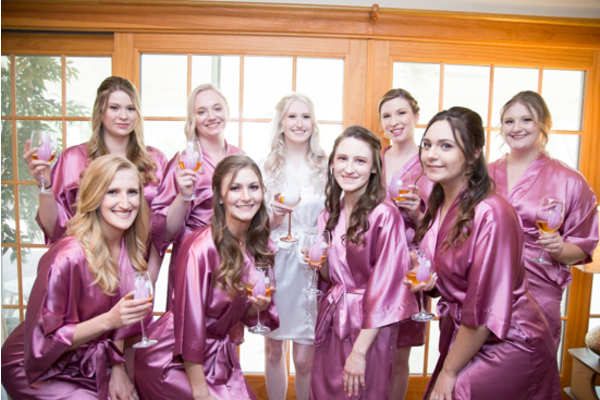 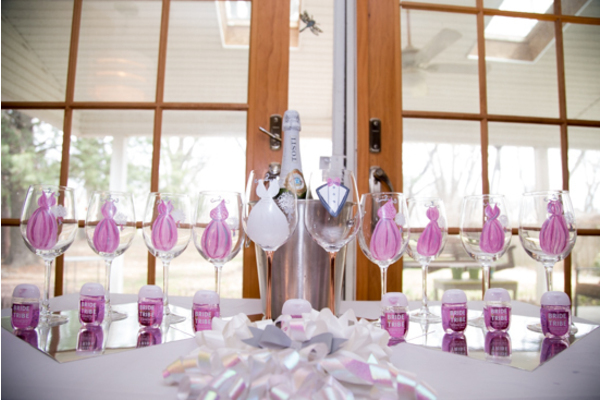 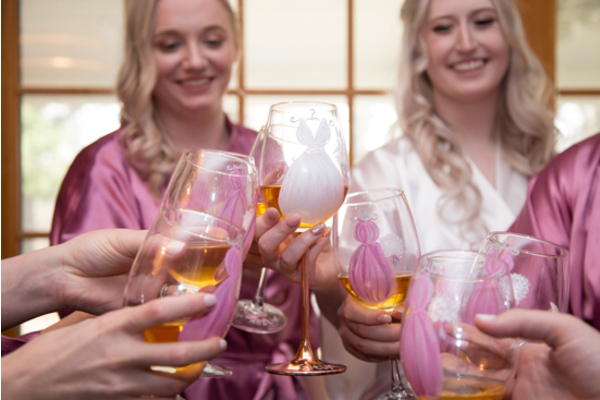 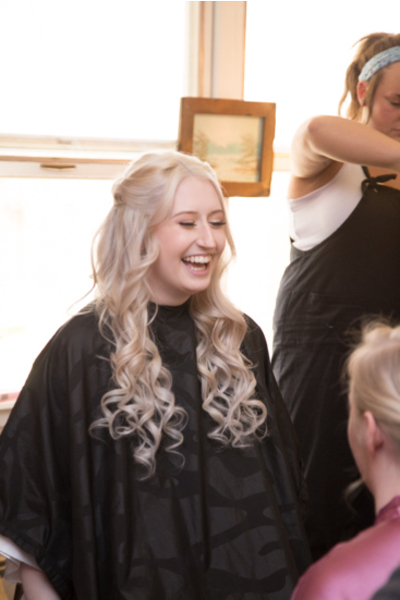 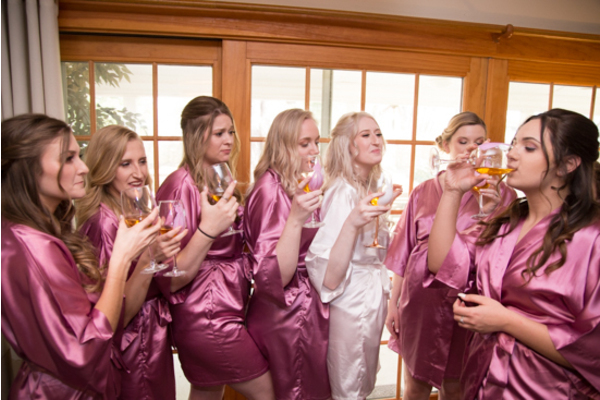 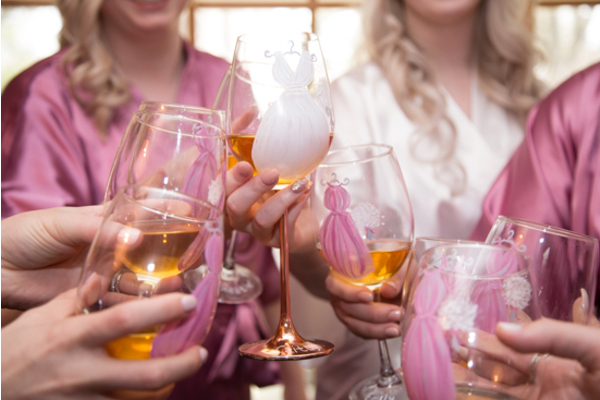 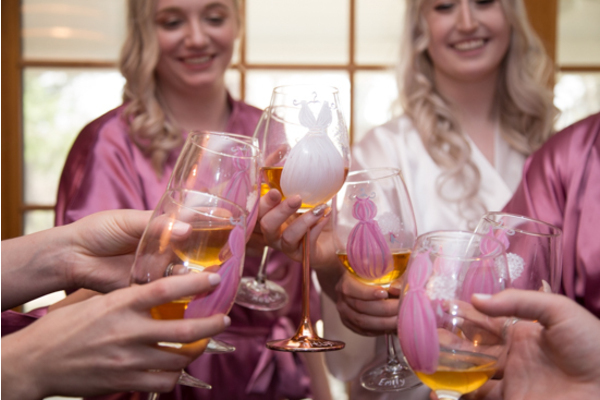 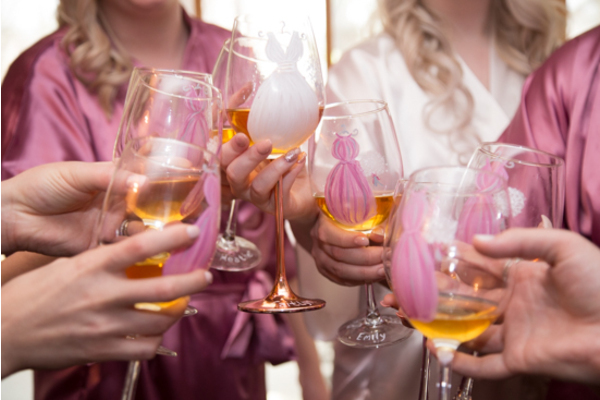 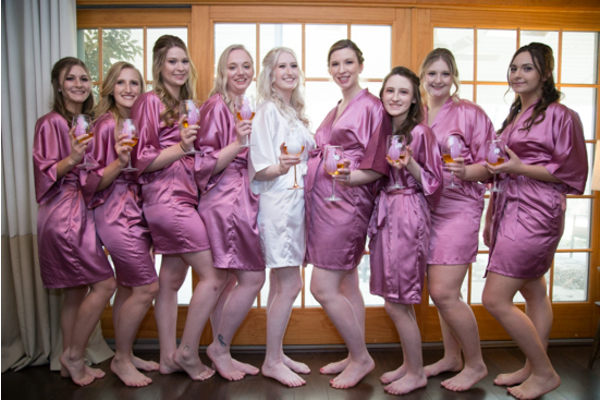 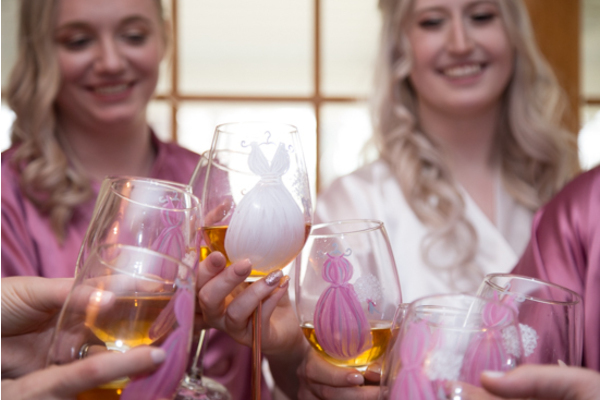 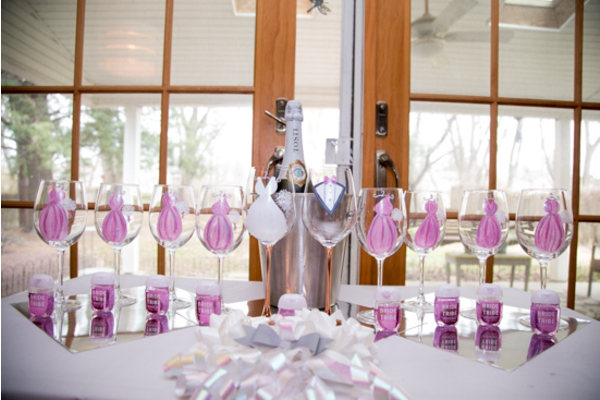 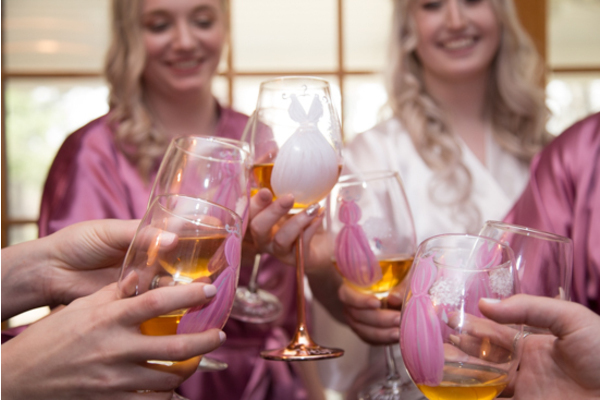 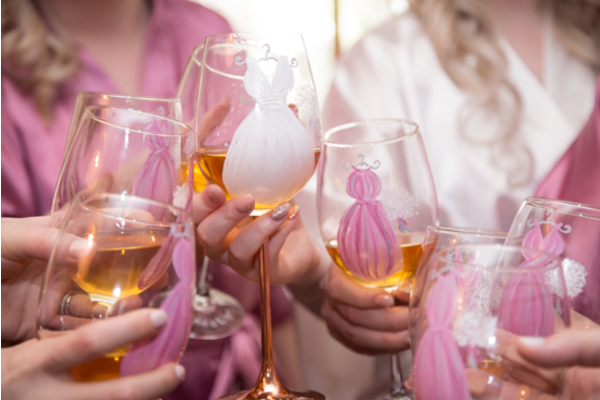 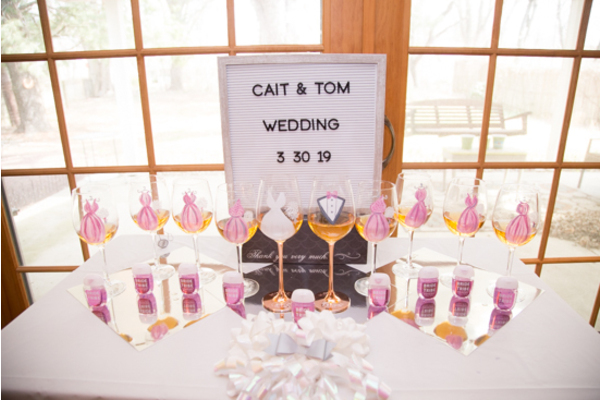 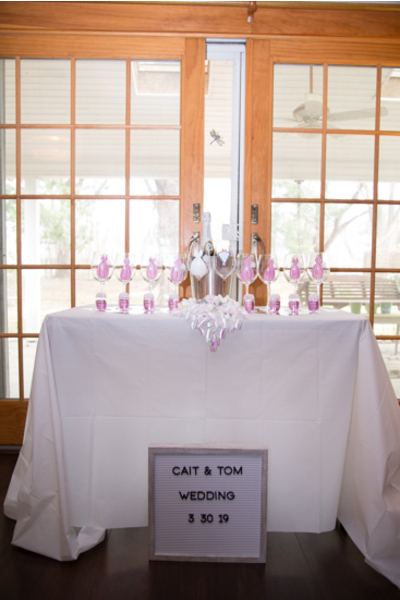 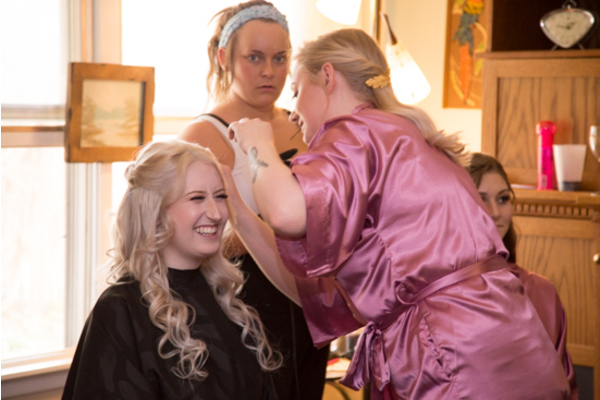 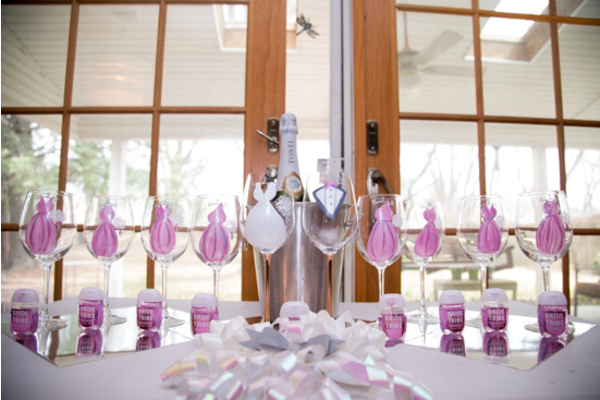 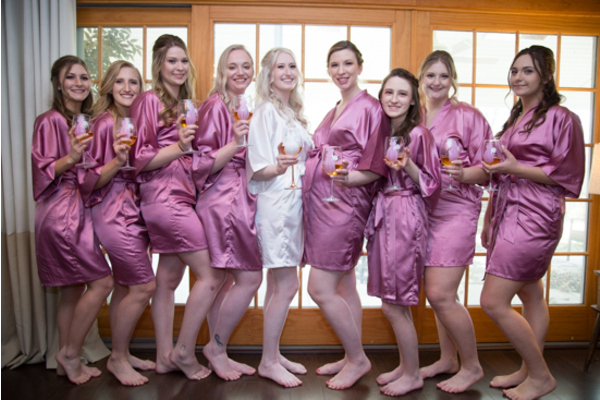 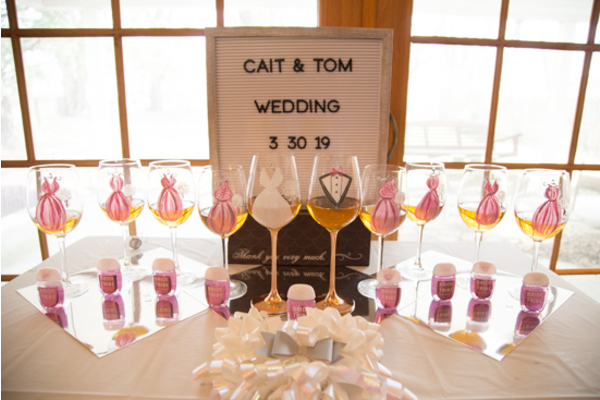 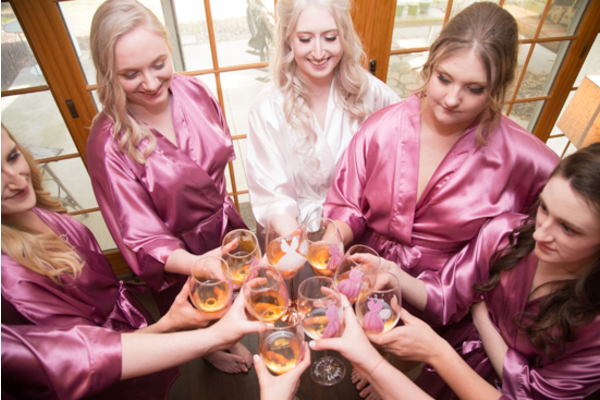 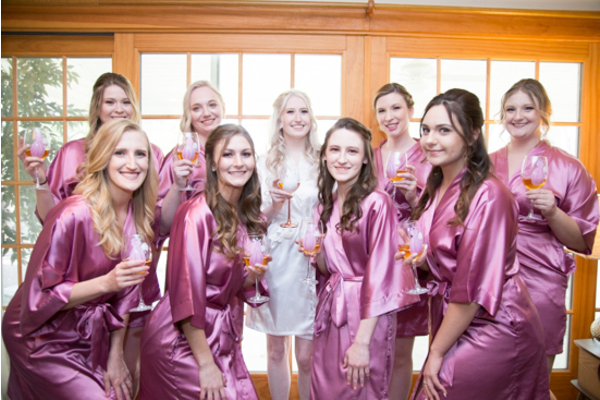 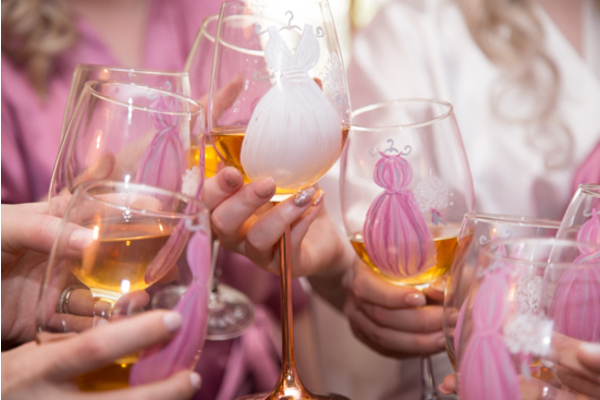 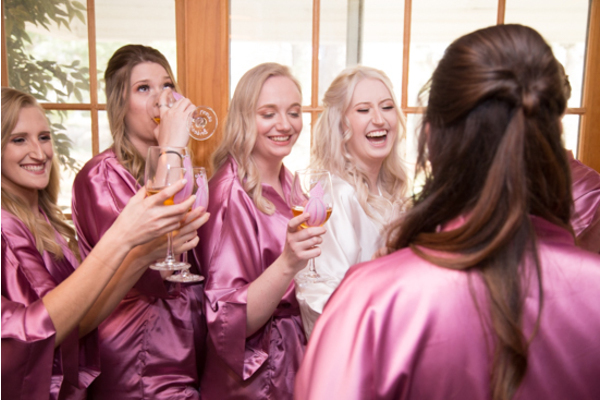 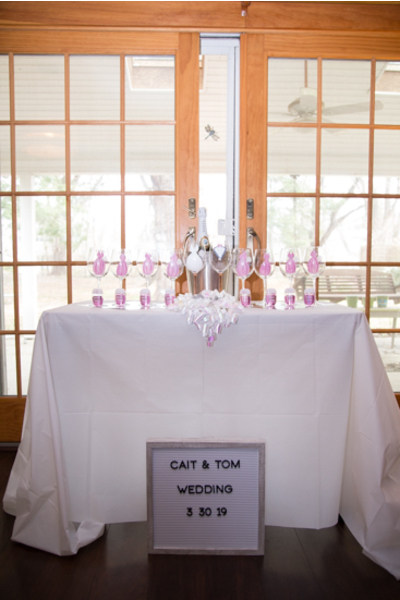 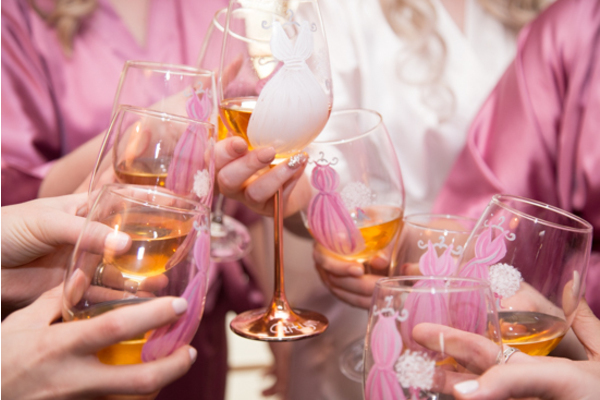 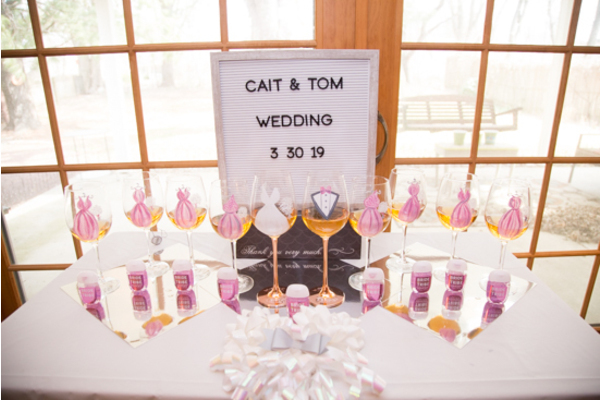 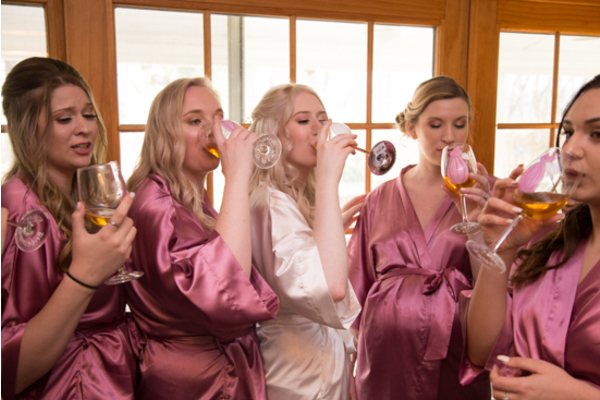 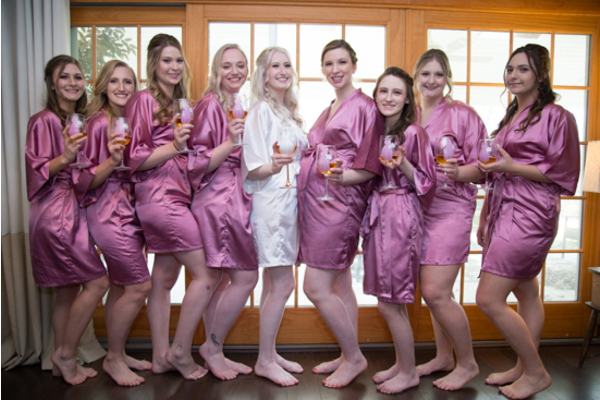 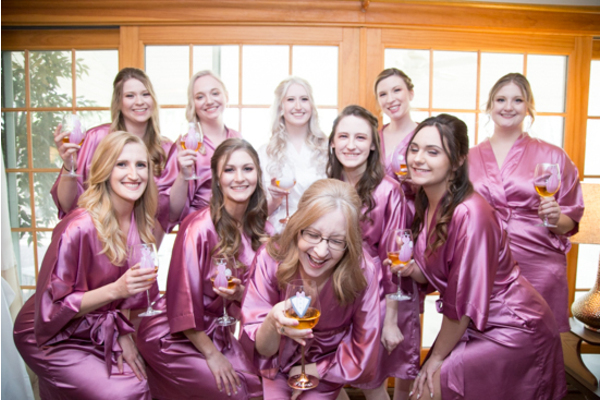 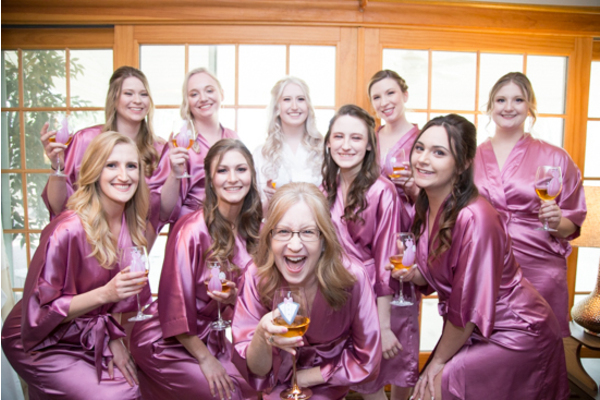 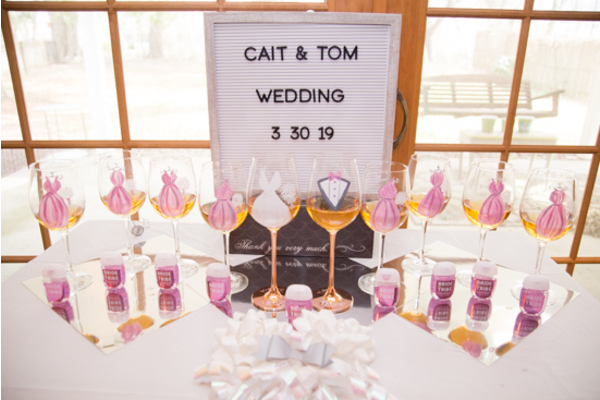 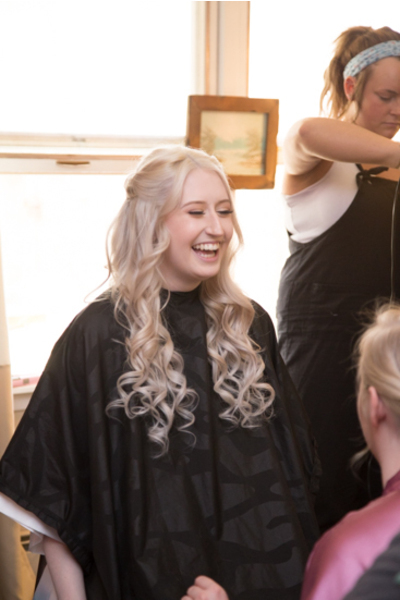 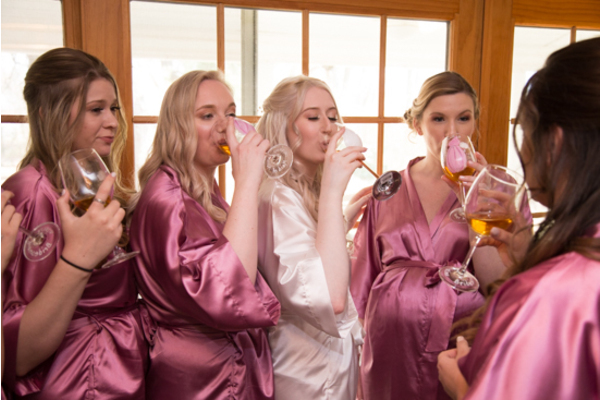 First, Caitlyn enjoyed a glass of wine with her bridesmaids using the most adorable wine glasses ever! 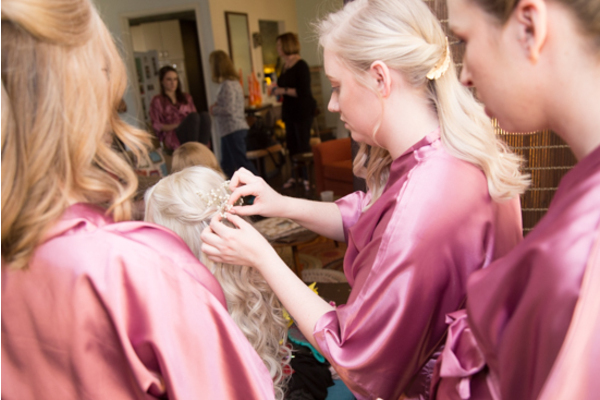 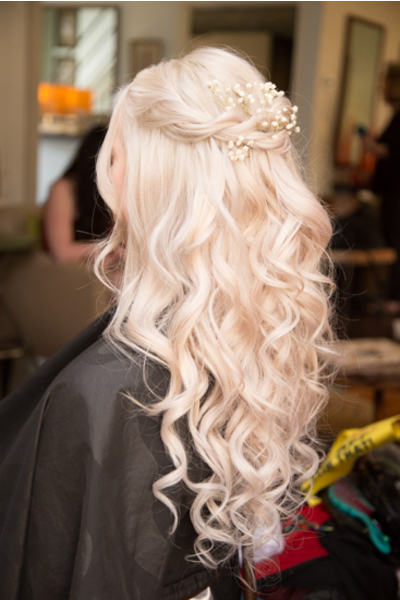 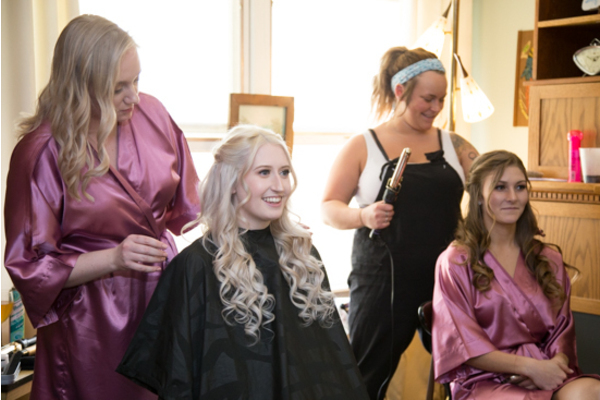 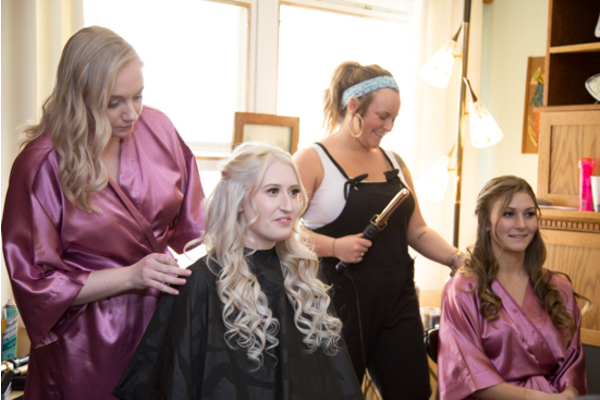 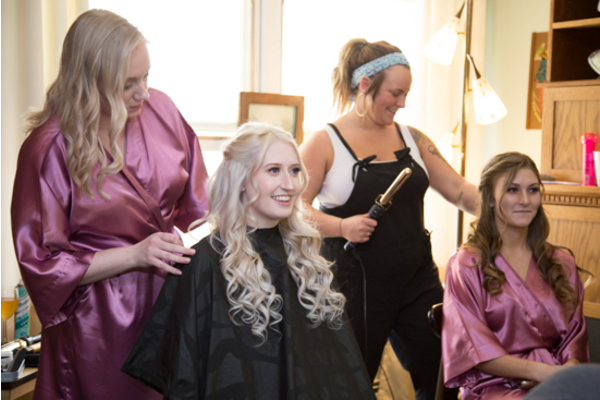 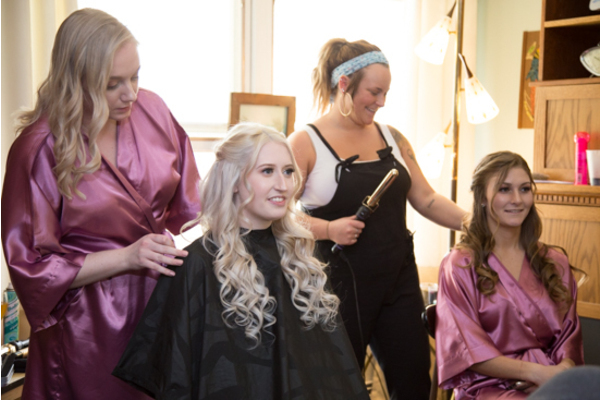 Their hair was curled to perfect and their makeup looked incredible as they finally put on their beautiful gowns. 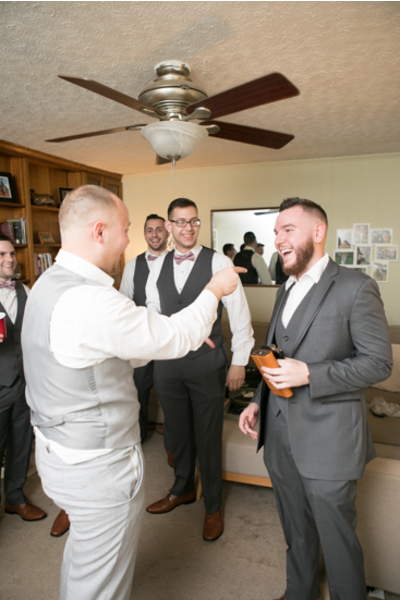 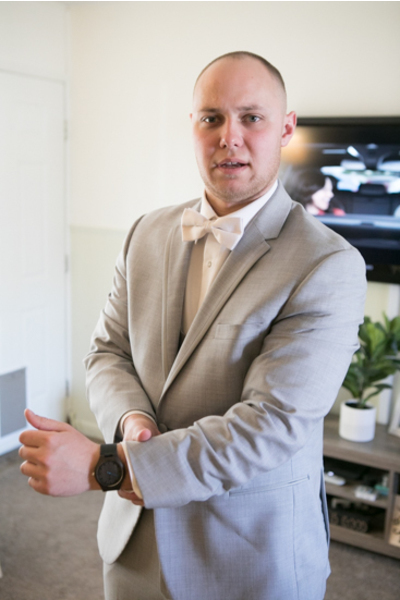 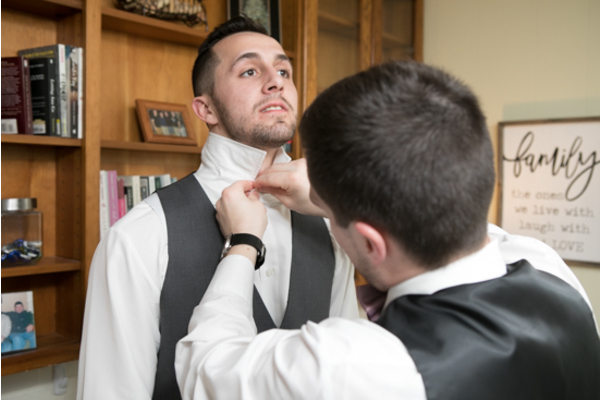 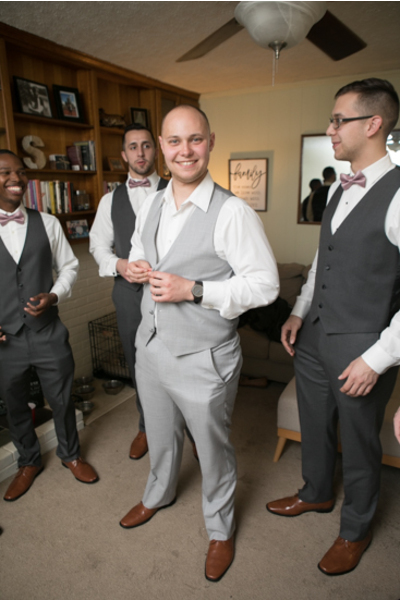 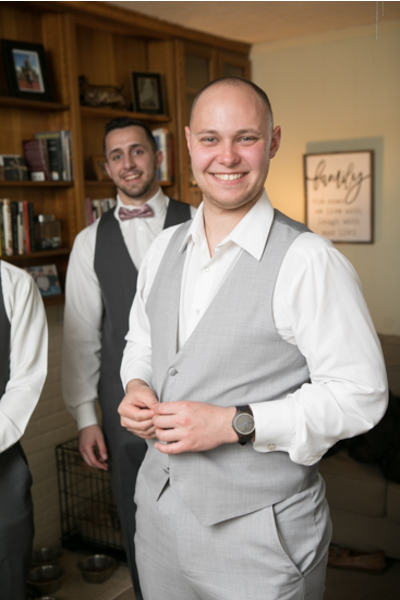 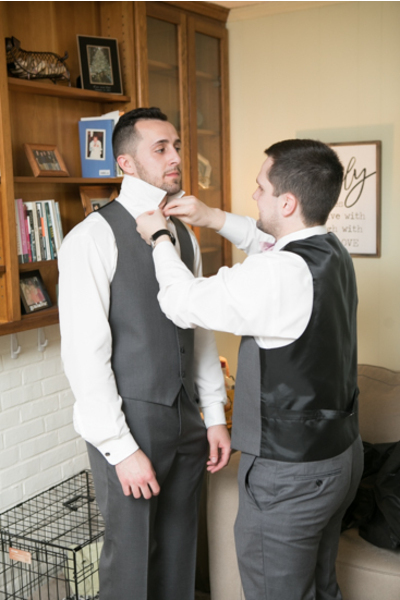 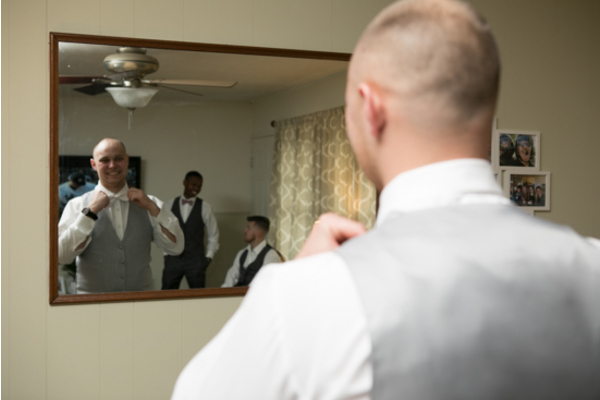 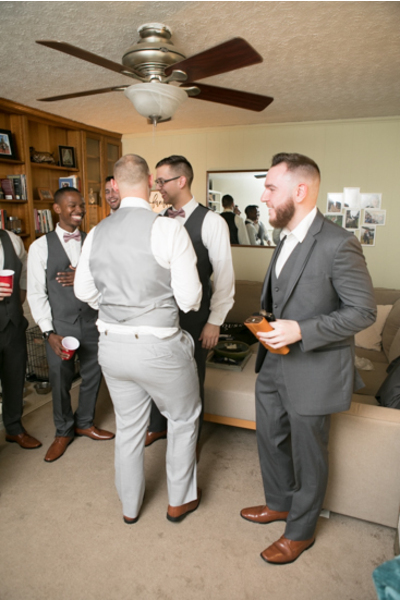 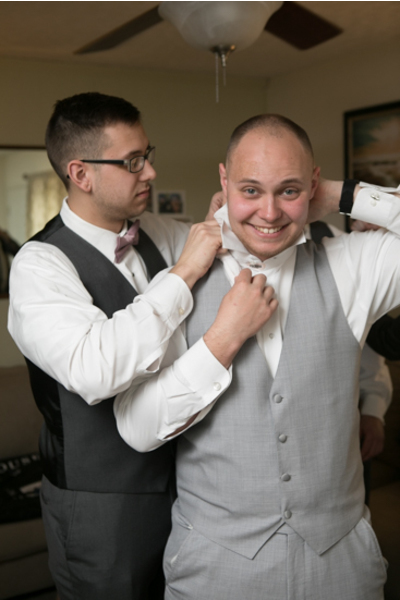 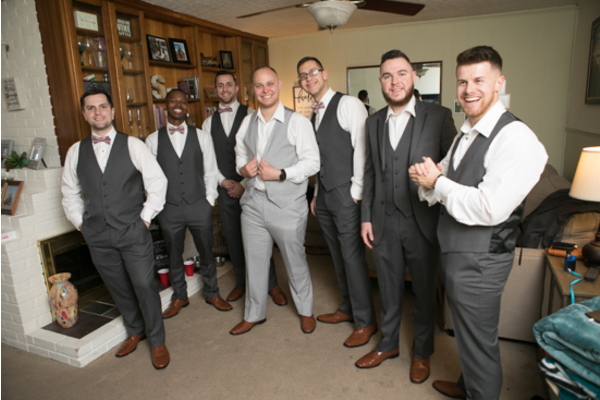 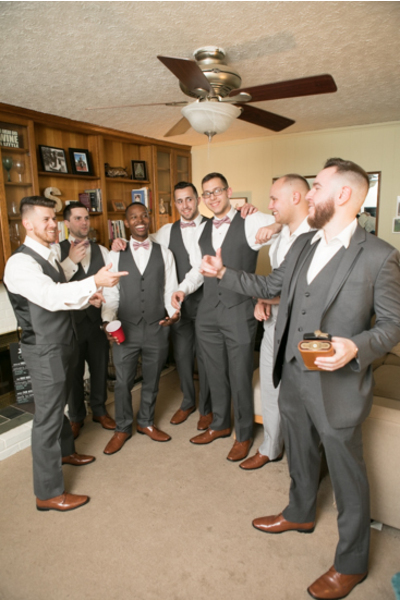 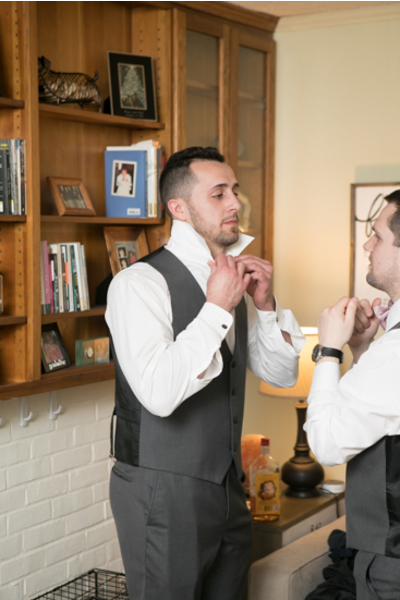 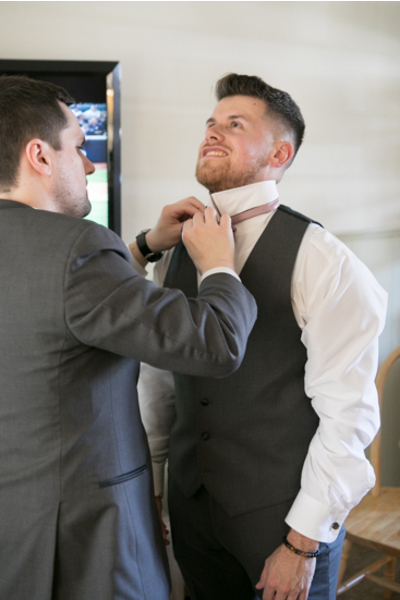 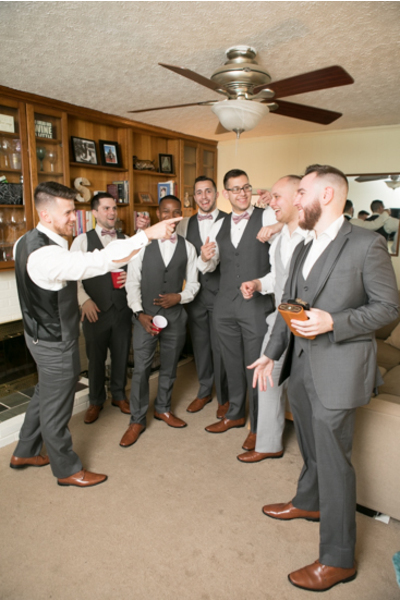 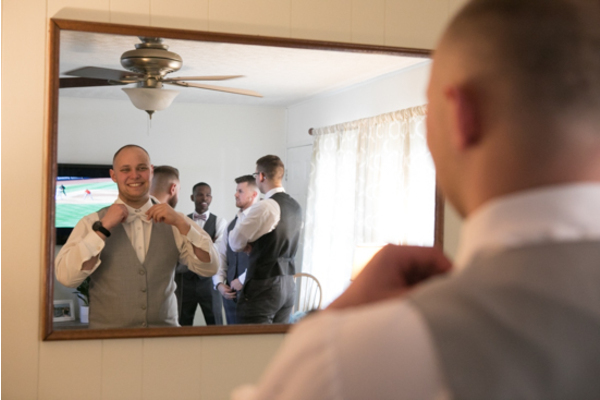 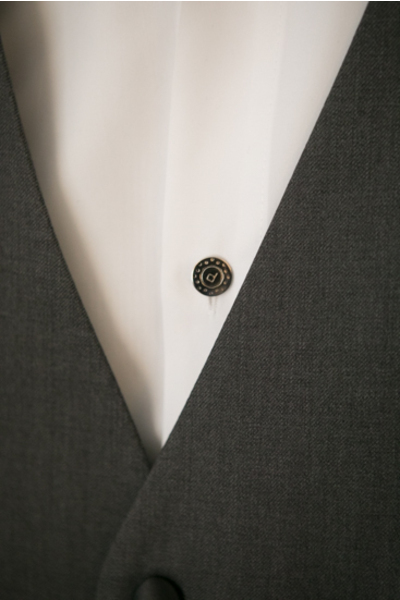 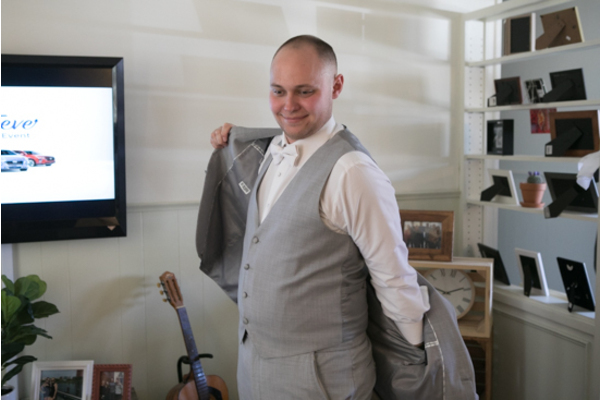 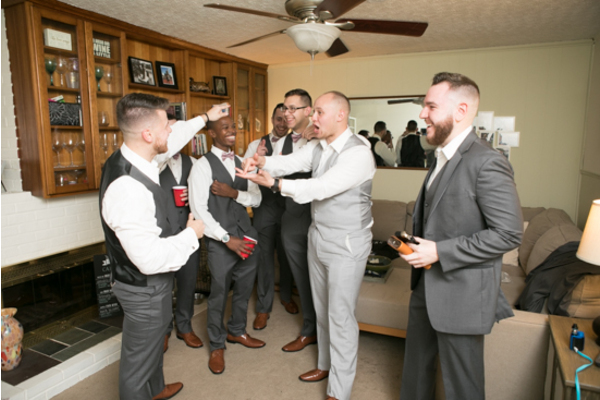 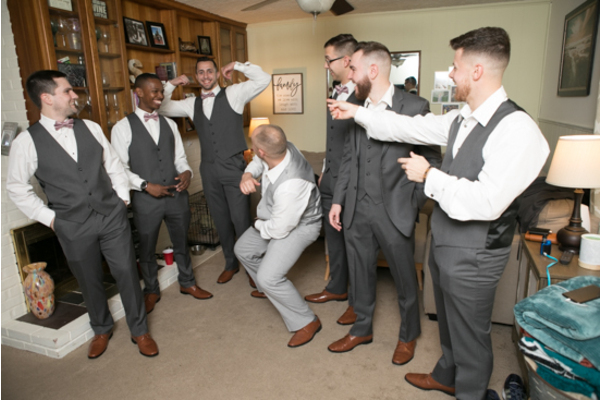 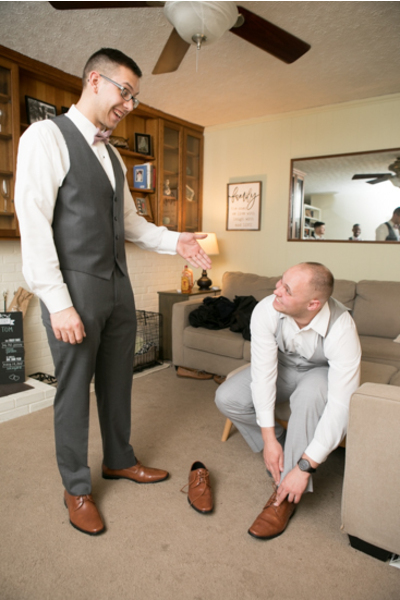 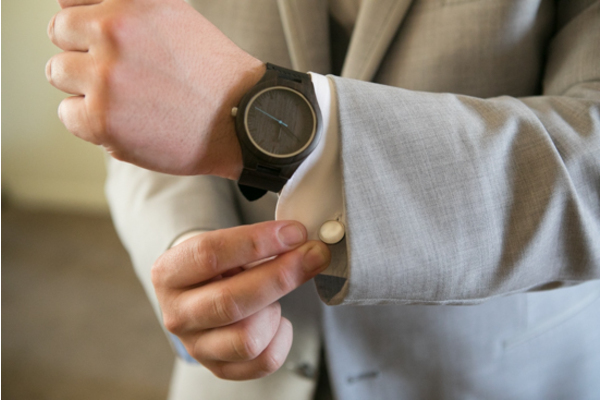 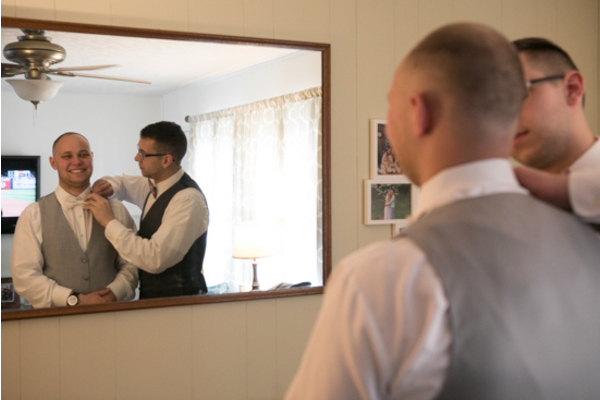 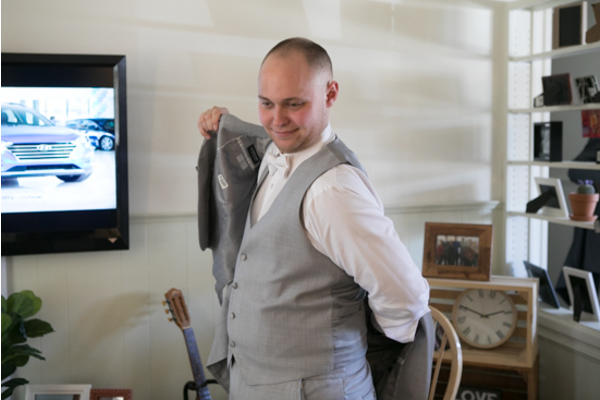 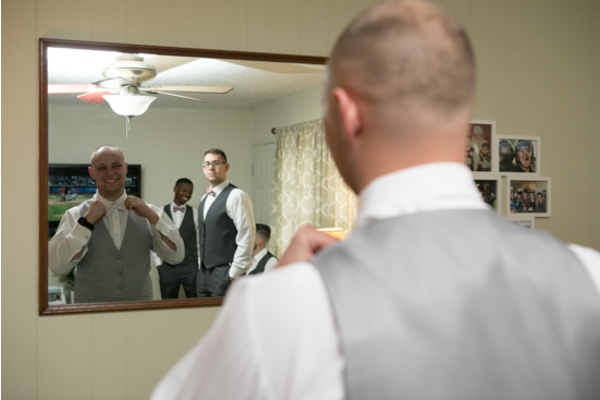 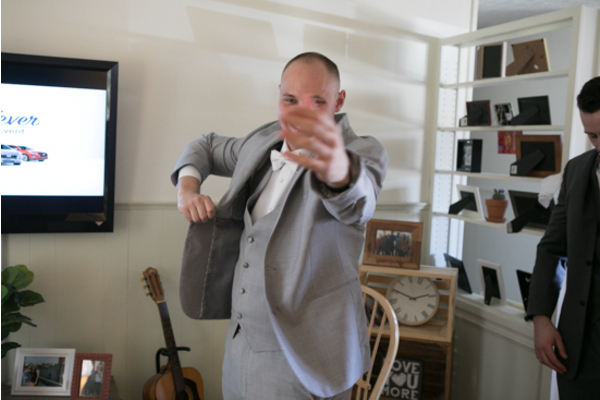 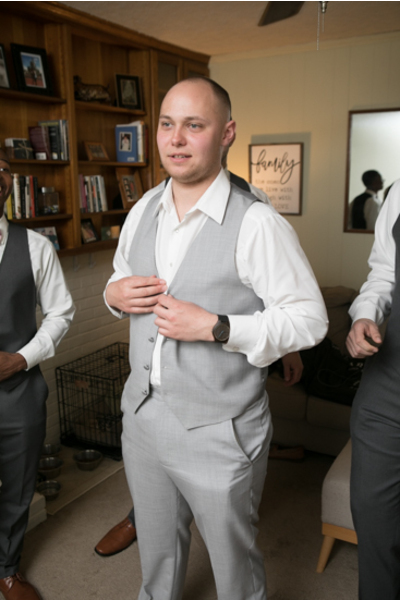 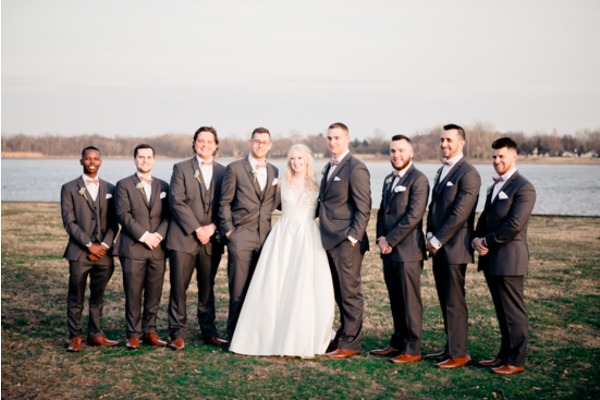 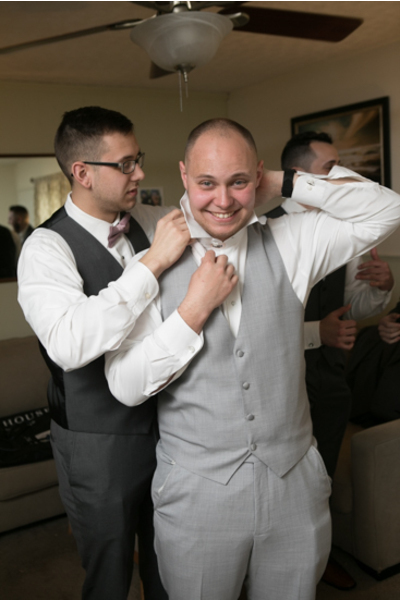 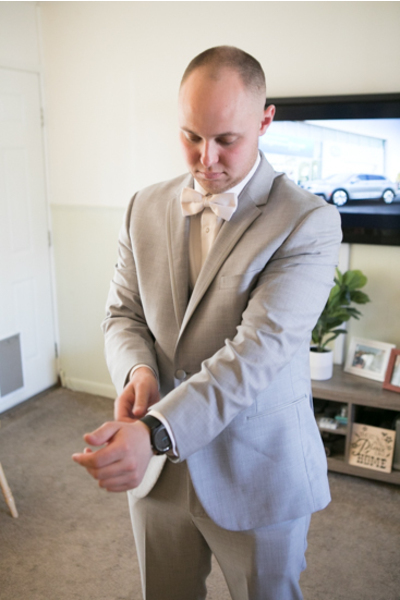 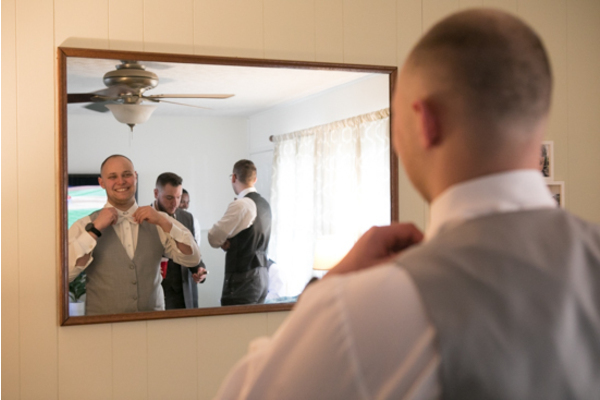 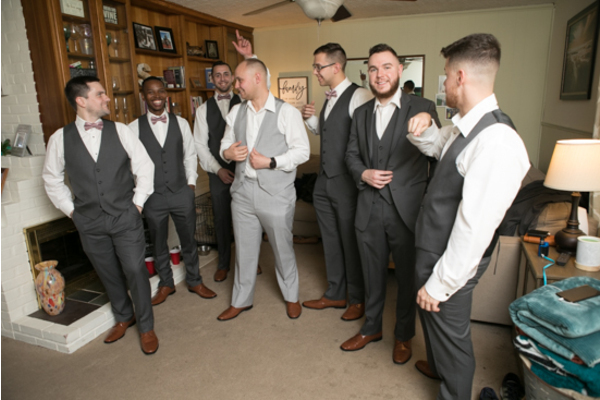 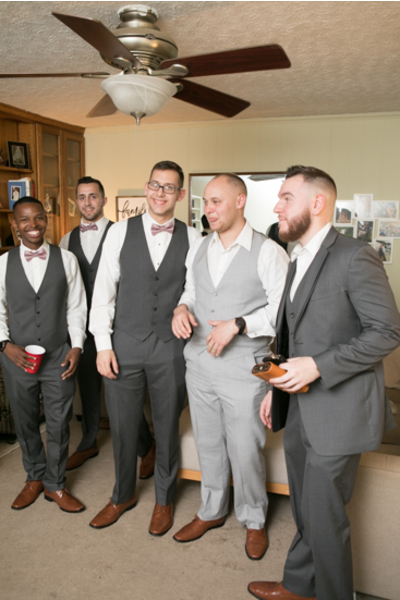 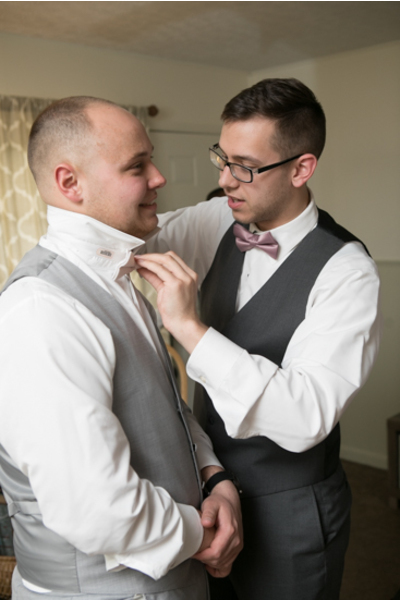 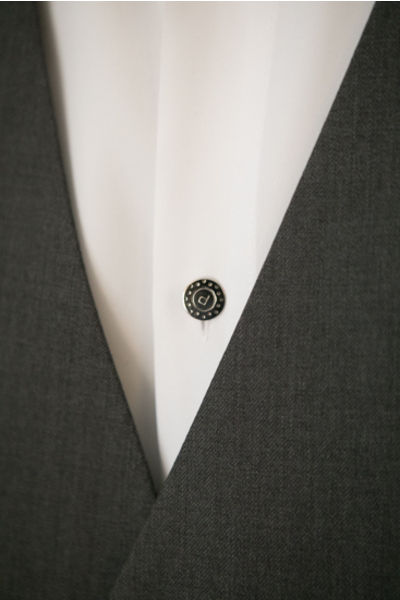 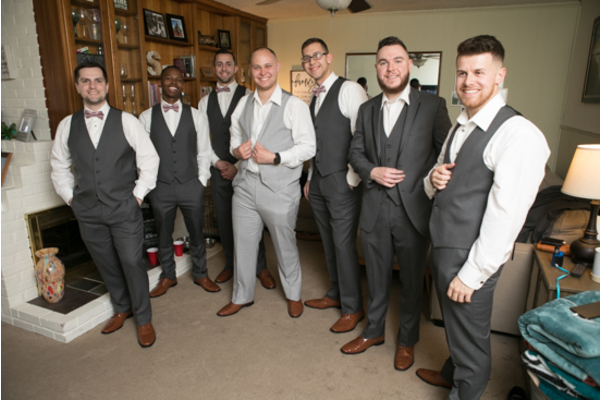 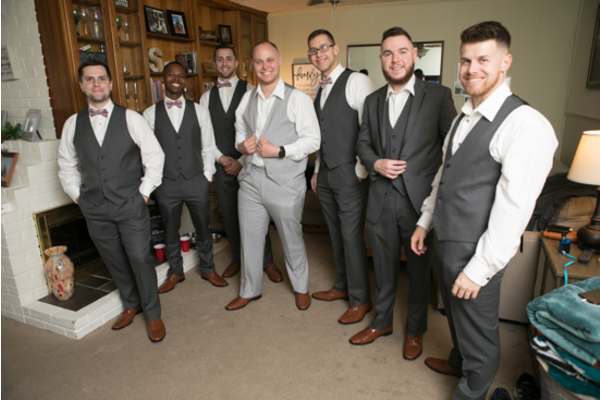 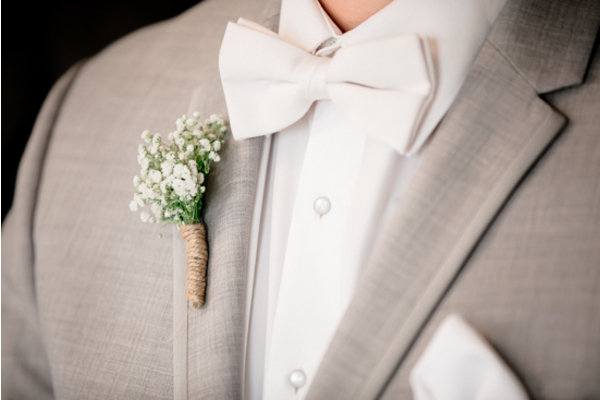 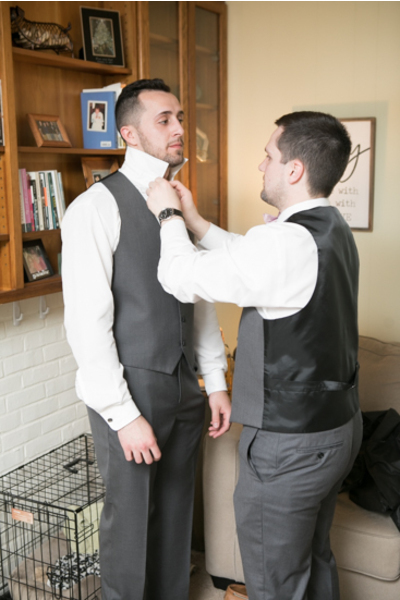 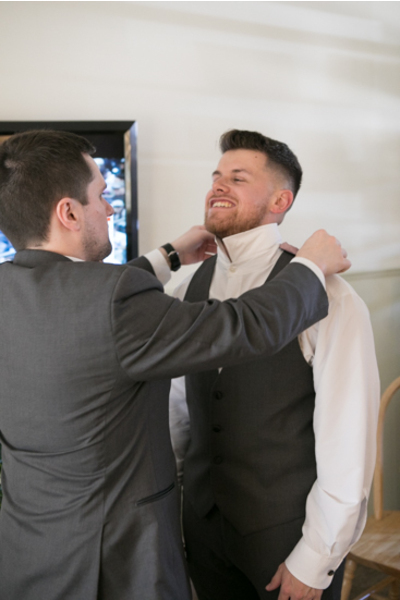 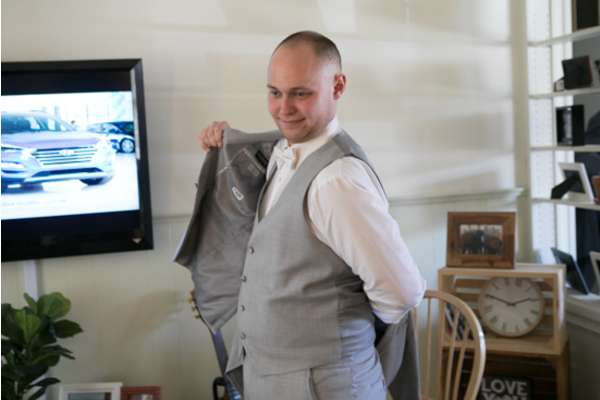 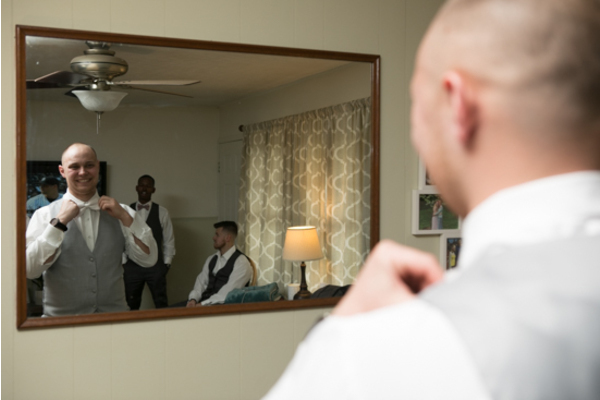 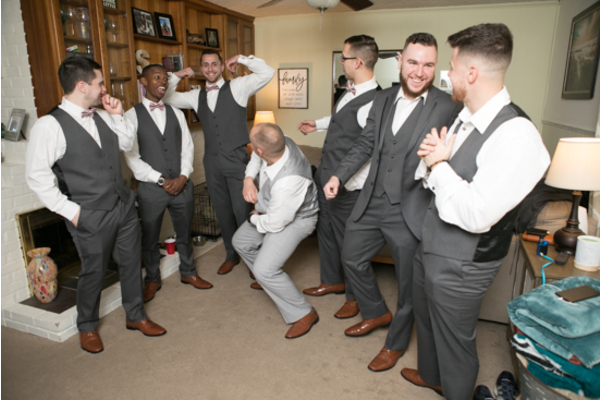 On the other hand, Thomas and his groomsmen looked so handsome as they dressed in their suits! 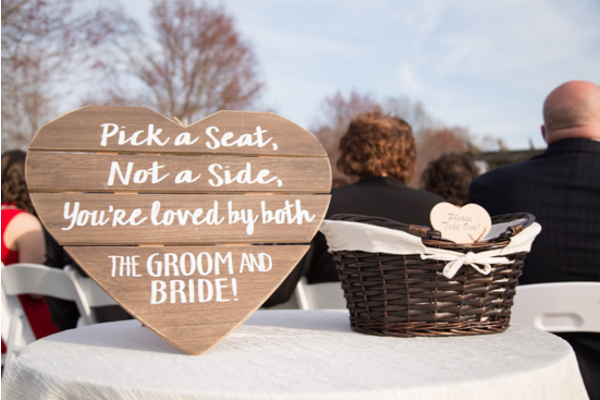 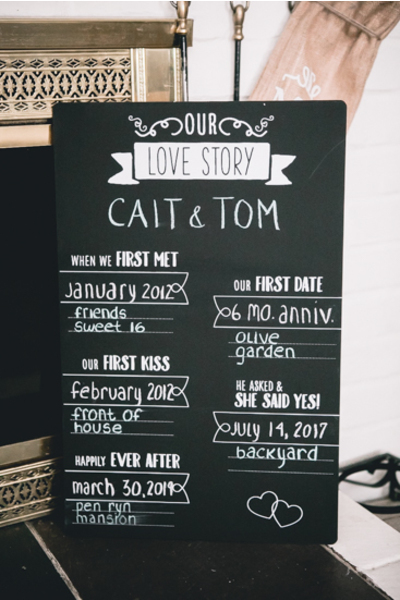 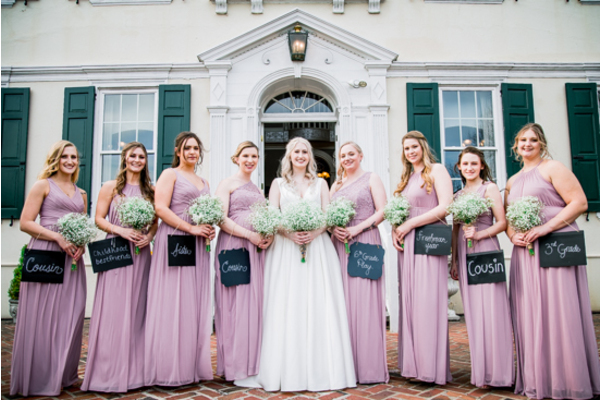 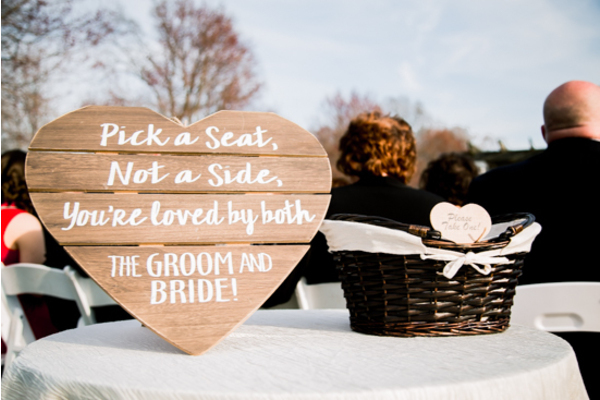 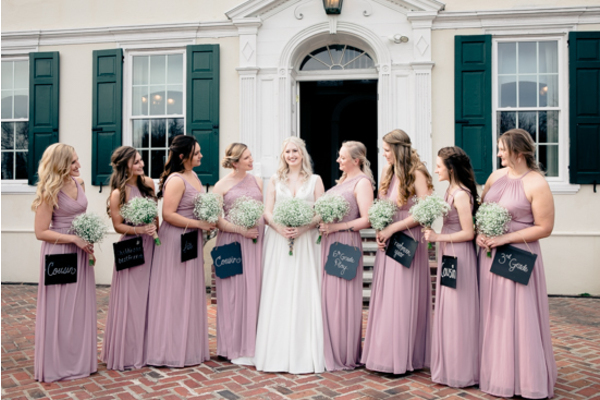 One of our NJ Wedding Photographers captured the girls outside holding cute chalkboard signs with Caitlyn as our second photographer took fun photos of the guys! 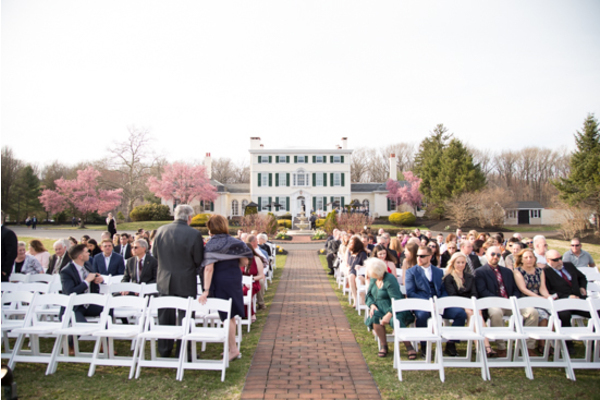 At last, the outdoor ceremony was officially starting! 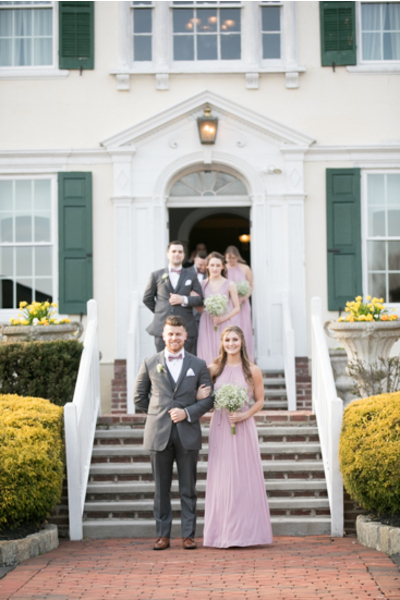 The ceremony took place overlooking the lake at Pen Ryn Estate. 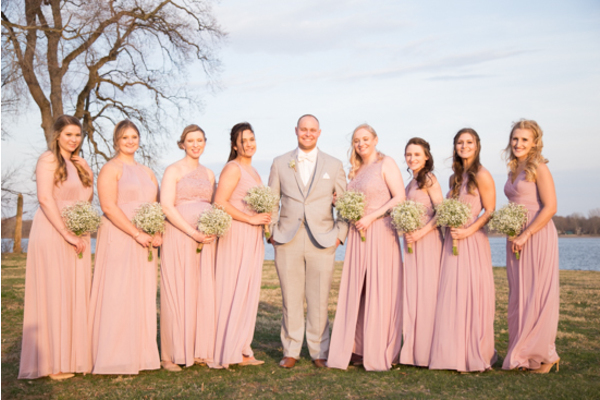 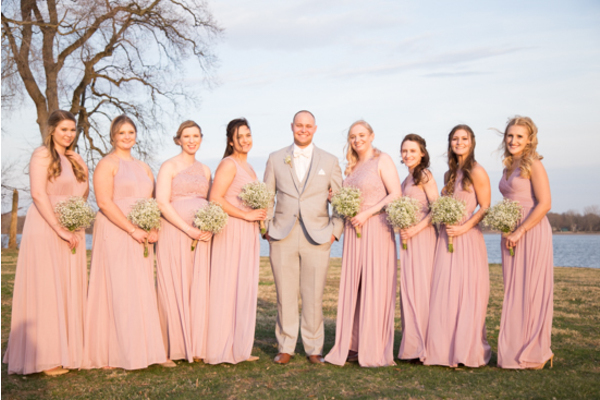 The springtime cherry blossom trees were just starting to bloom, which matched the bridesmaid dresses! 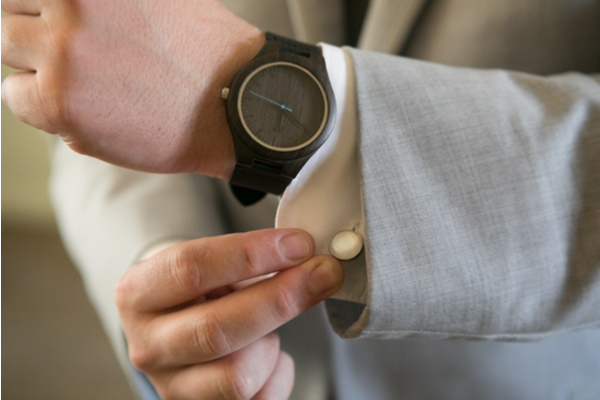 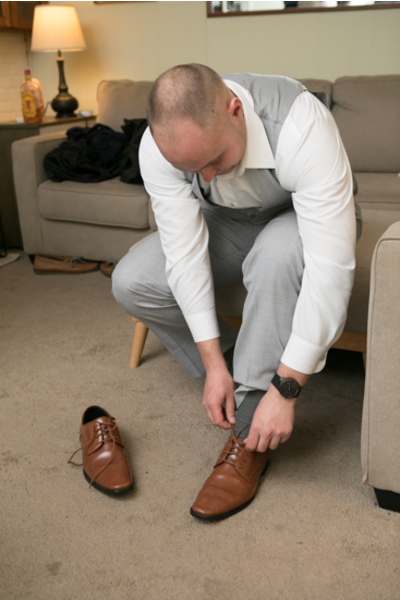 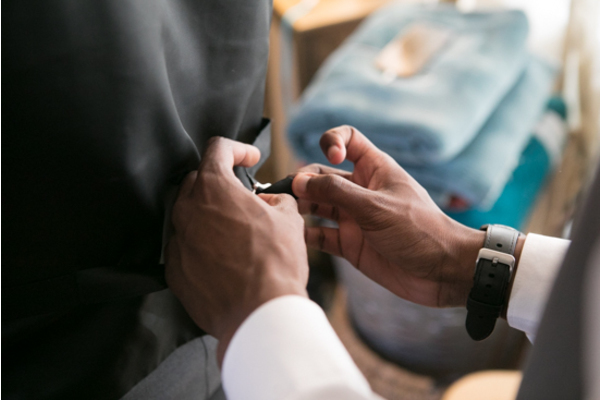 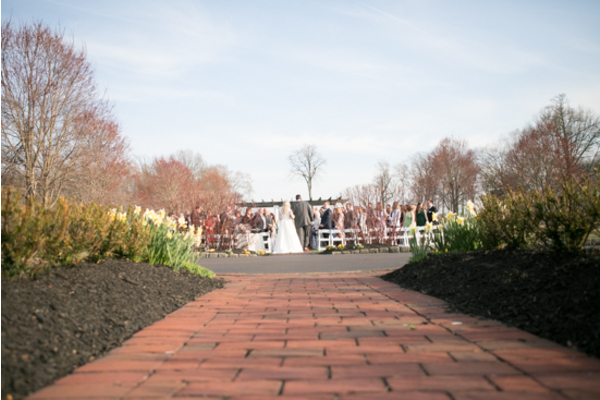 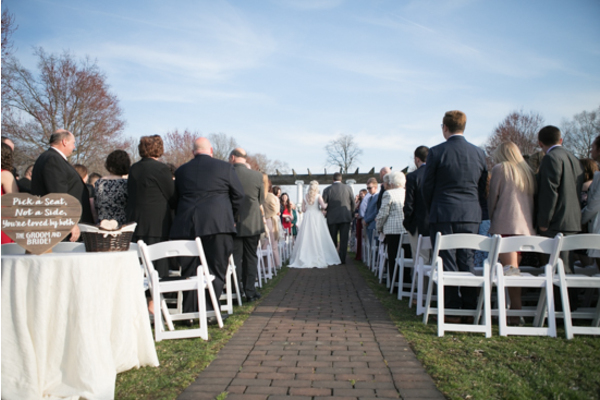 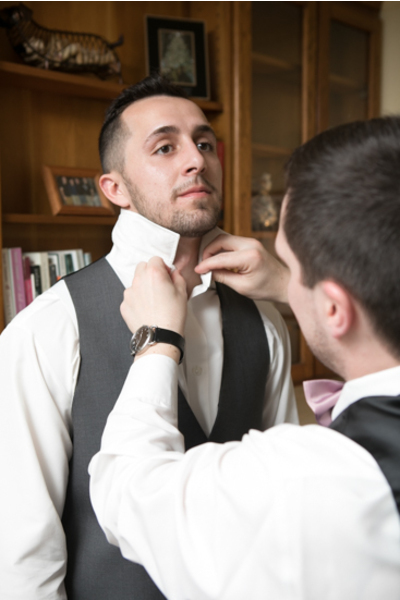 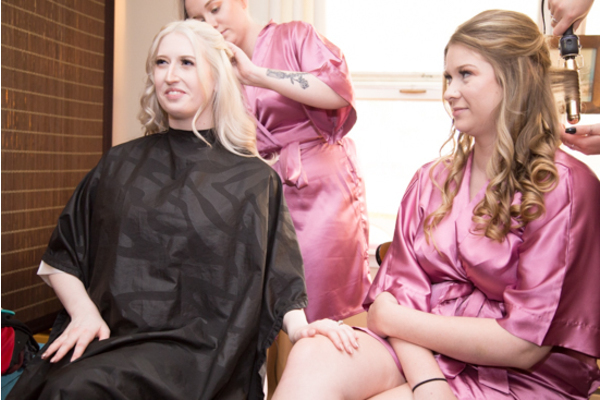 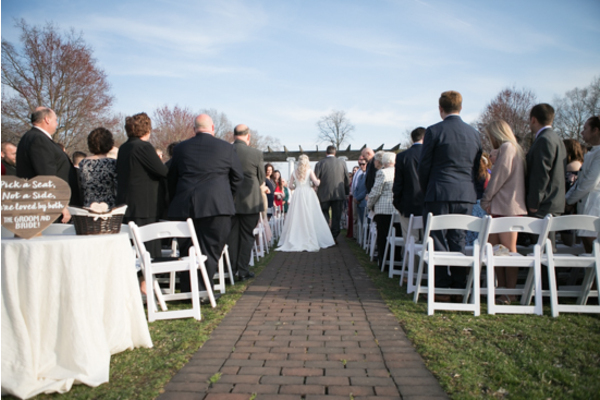 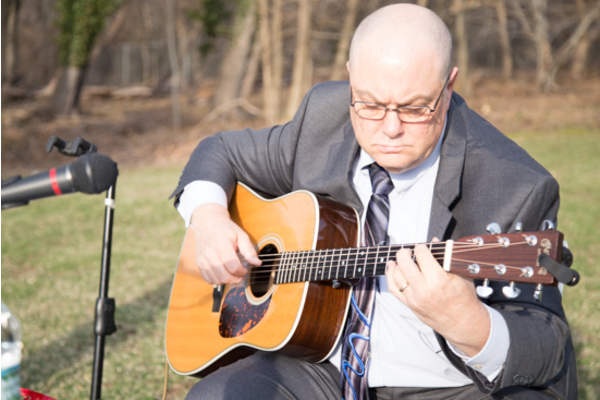 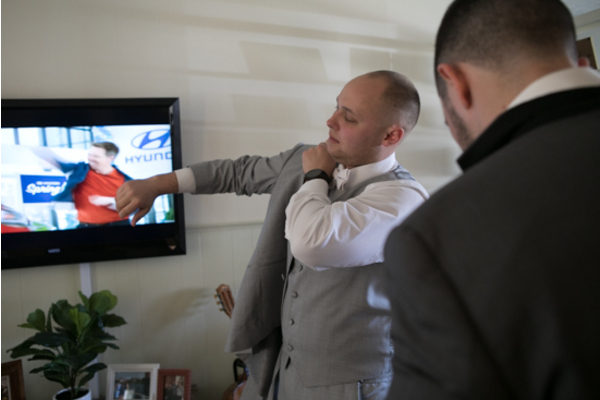 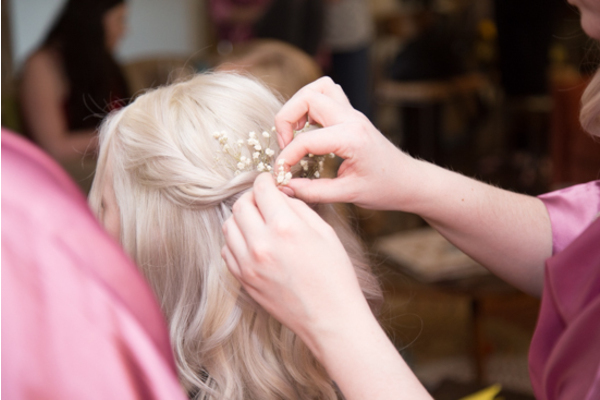 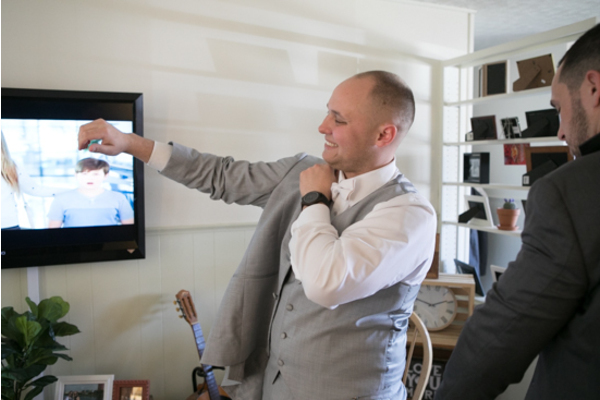 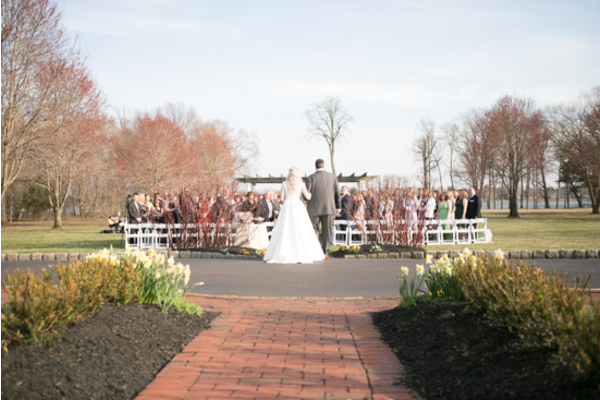 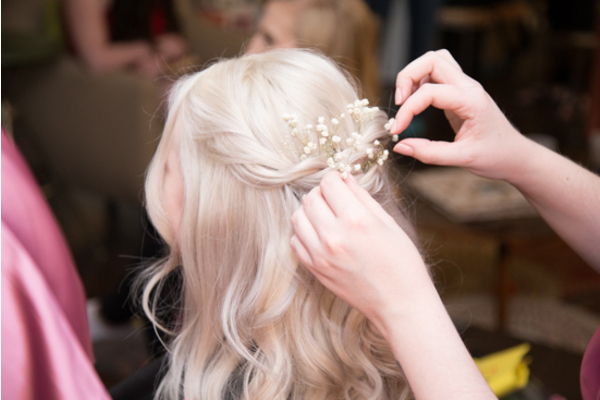 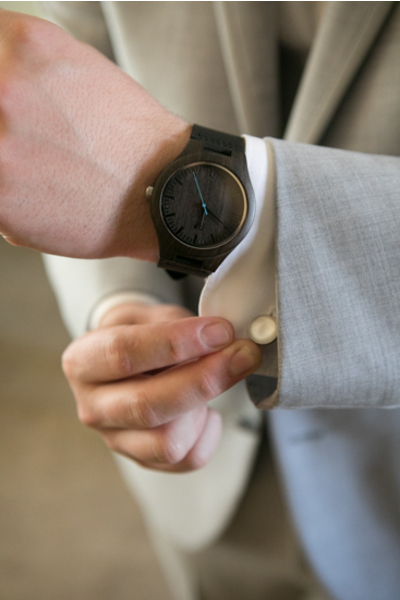 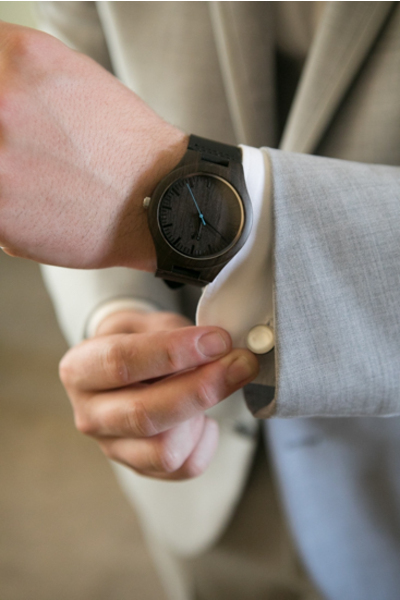 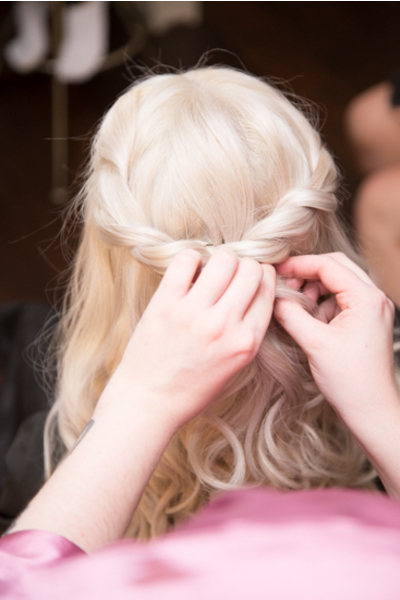 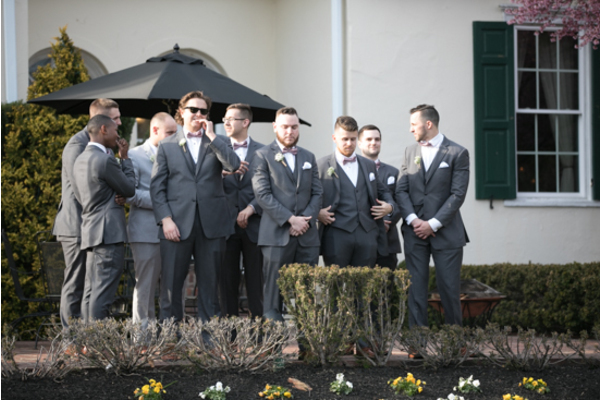 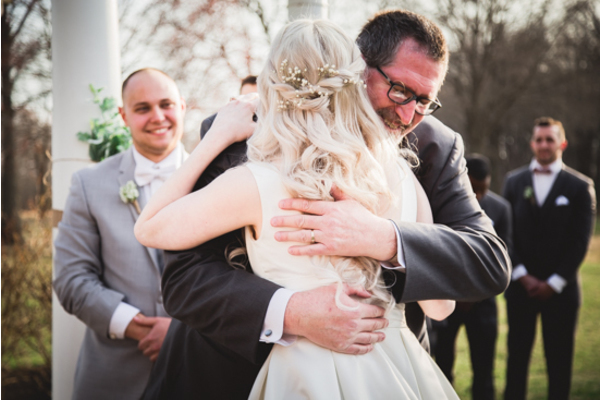 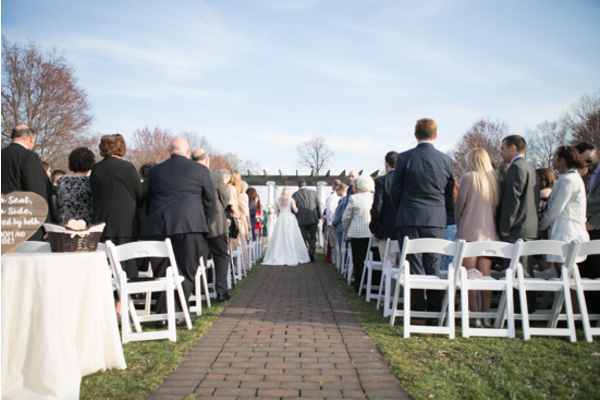 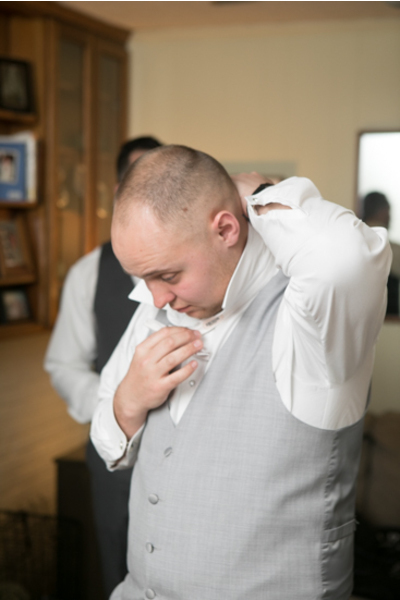 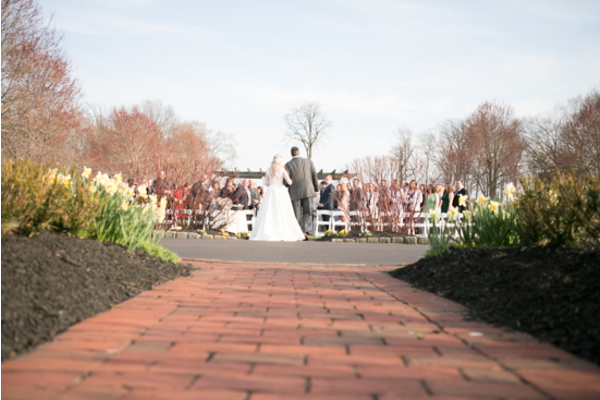 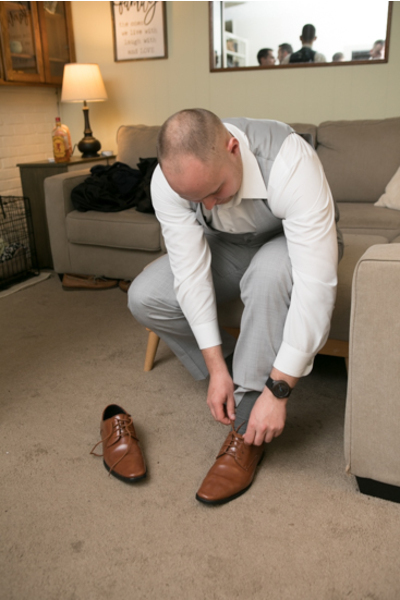 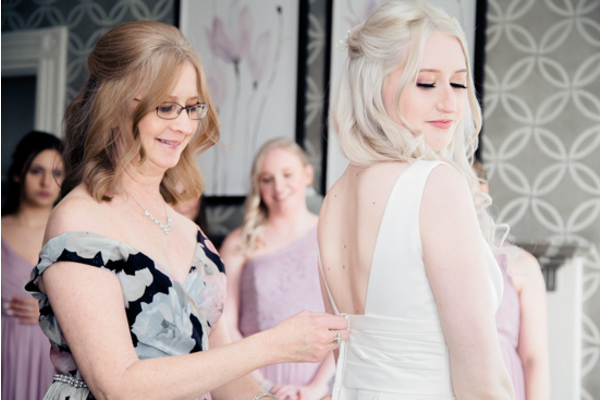 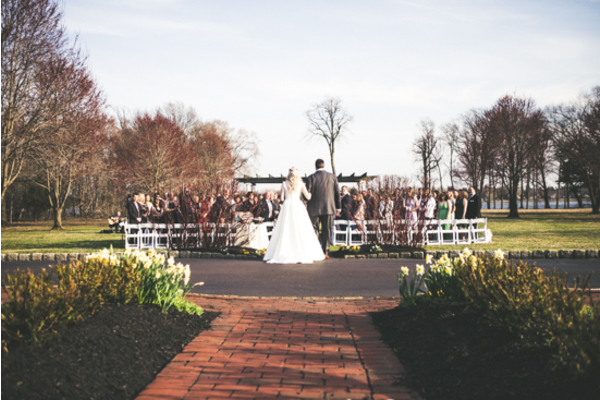 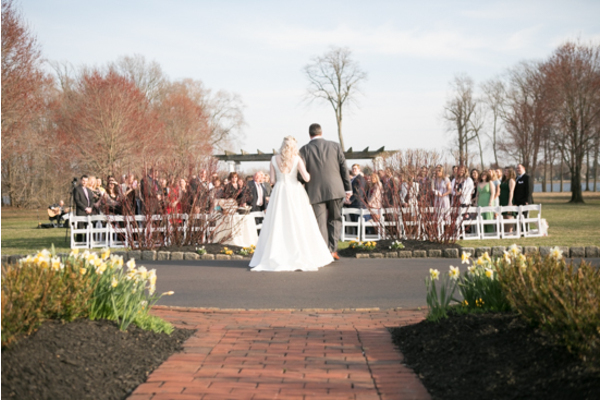 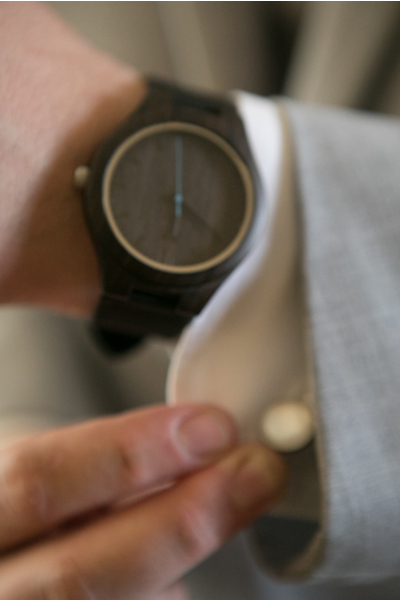 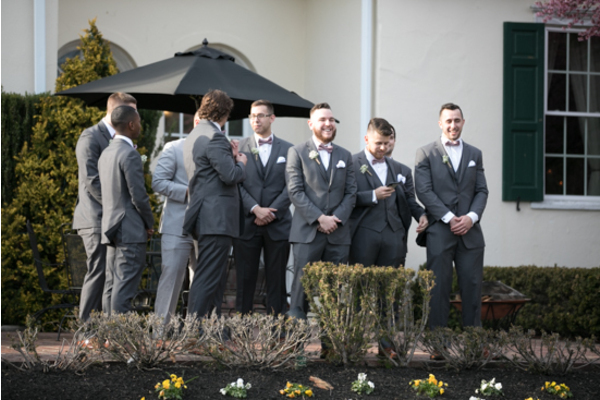 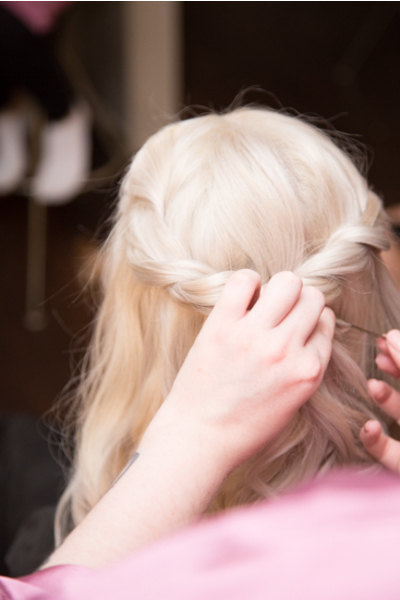 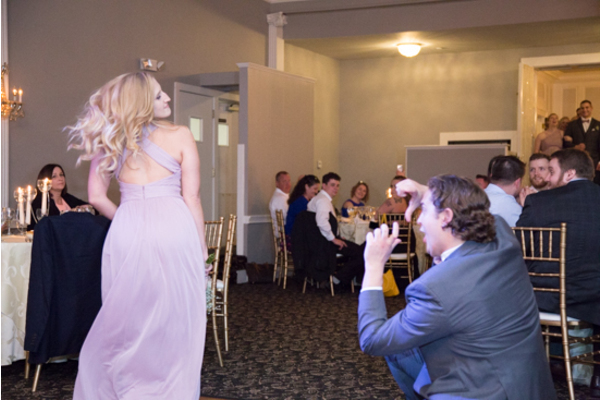 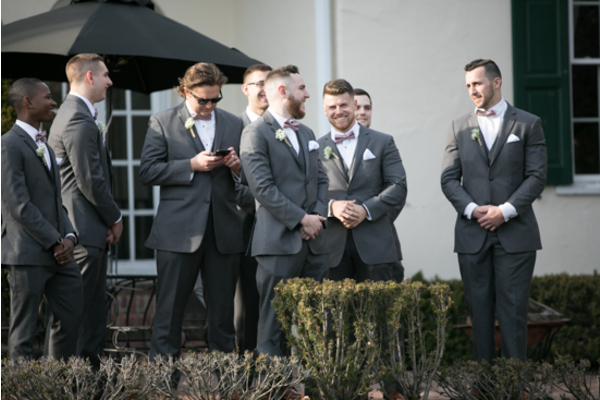 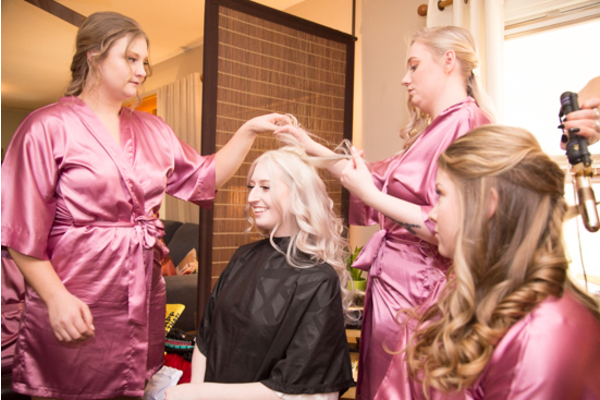 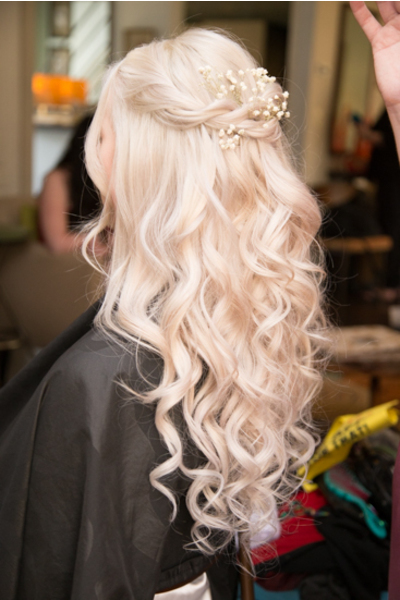 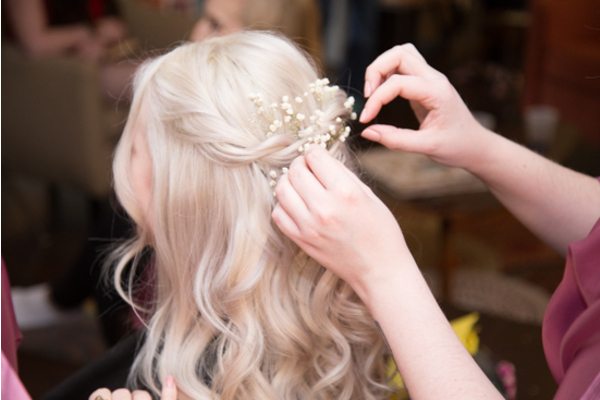 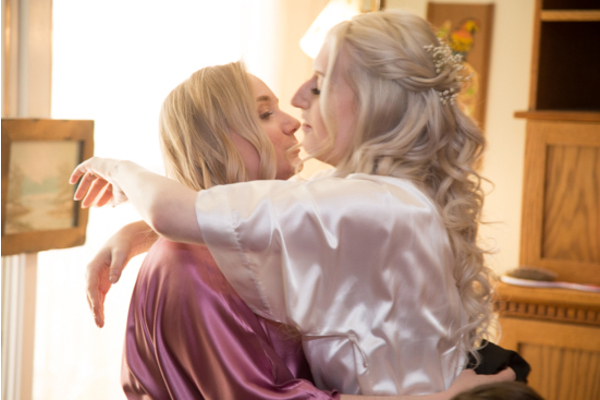 Behind the scenes, our NJ Wedding Videographer documented this ceremony from start to finish. 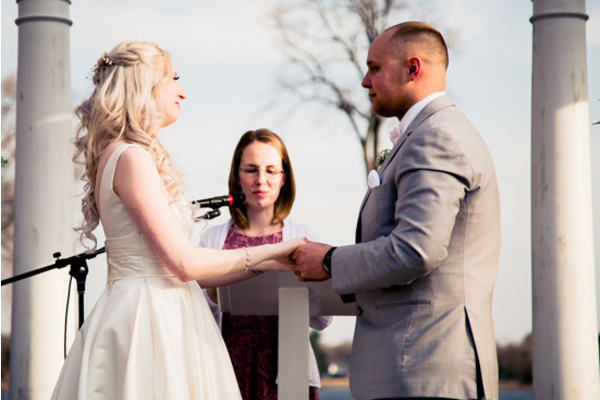 Every vow and emotion was surely not missed! 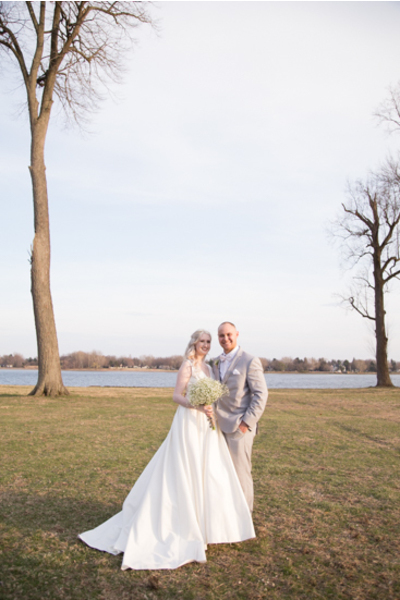 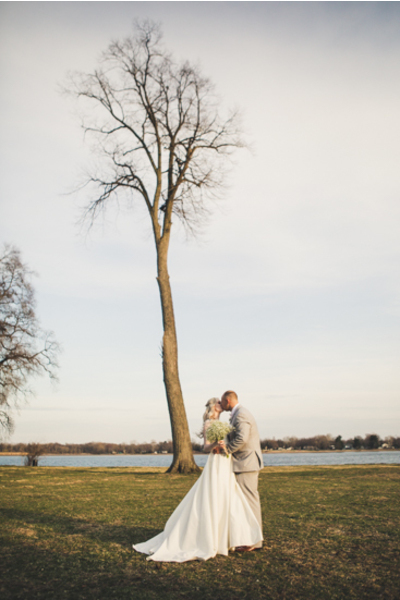 The scenic lake backdrop paired with elegant white alter made this ceremony altogether a dream. 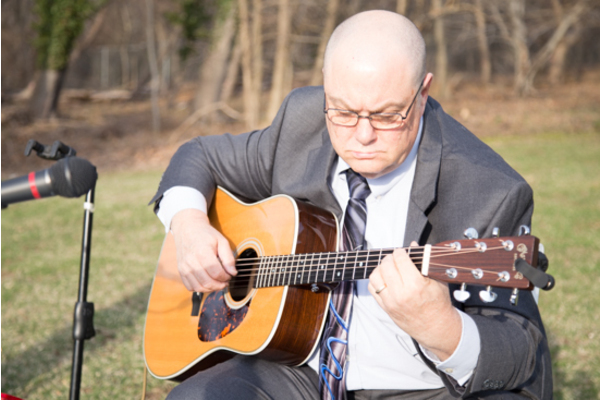 From there, it was time for even more pictures with the beautiful outdoor scenery before heading inside. 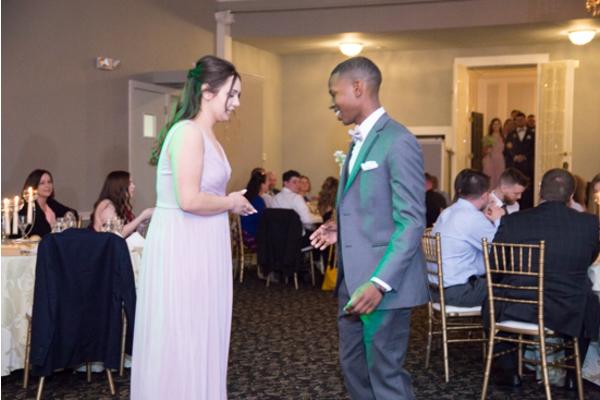 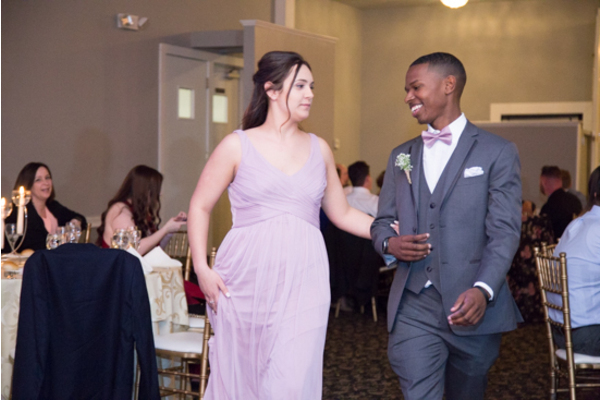 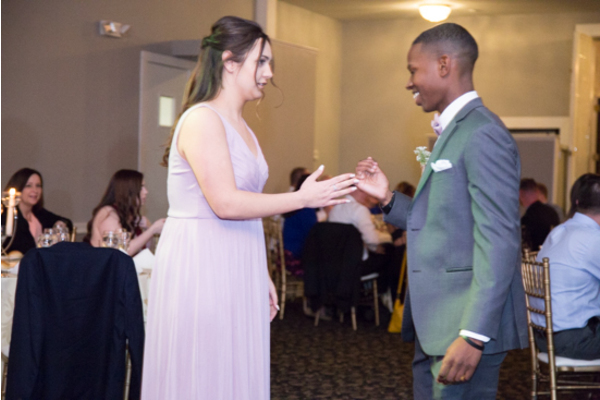 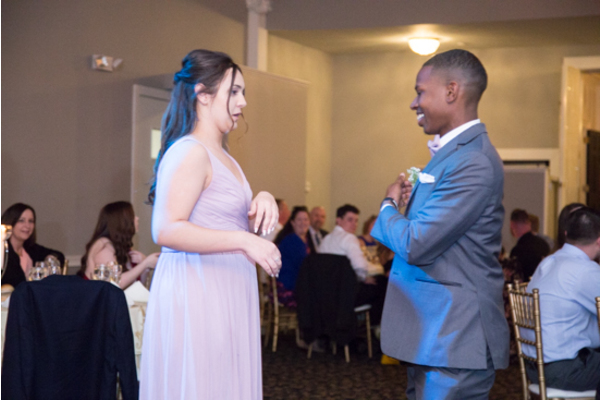 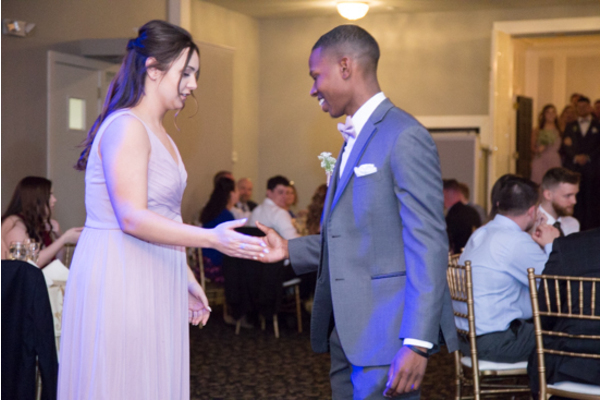 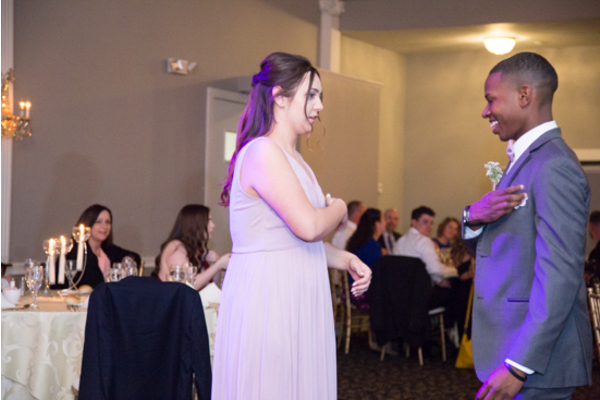 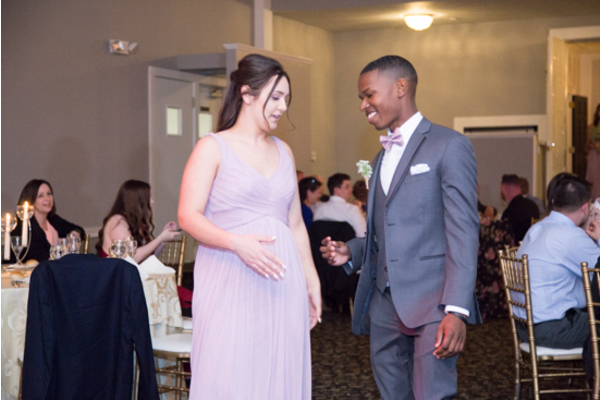 Caitlyn and Thomas were smiling the entire time, and carried the fun right on inside to the ballroom. 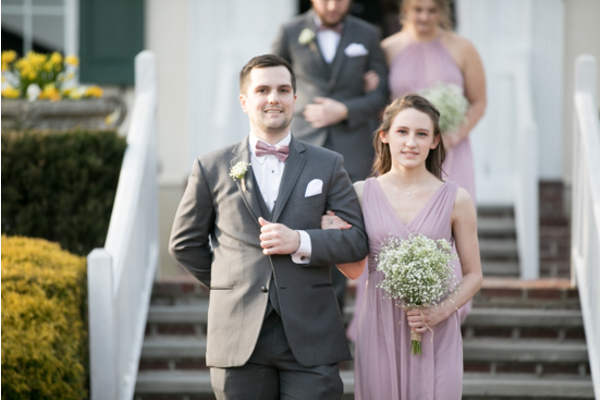 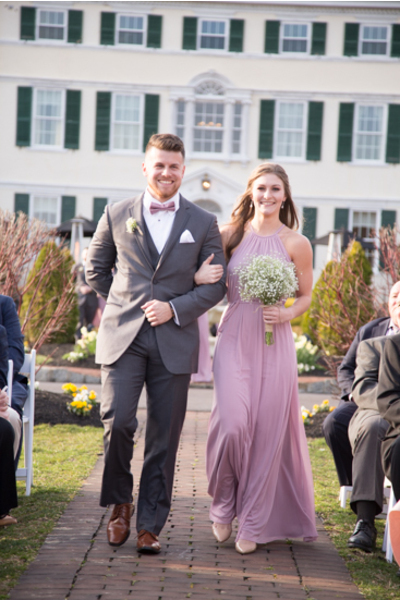 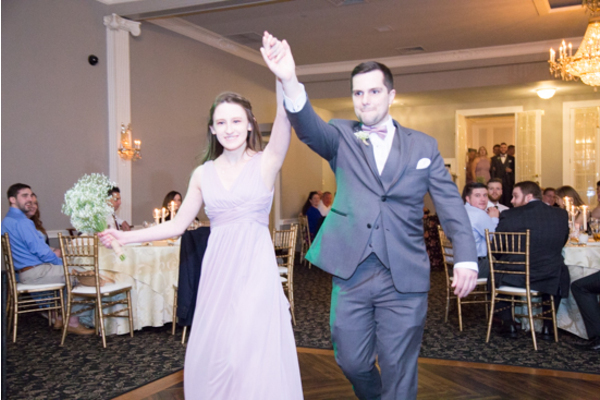 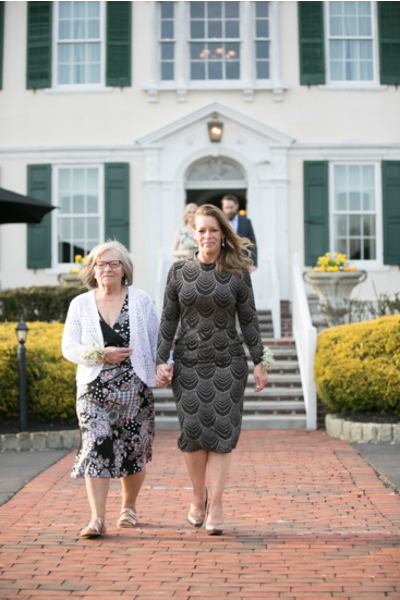 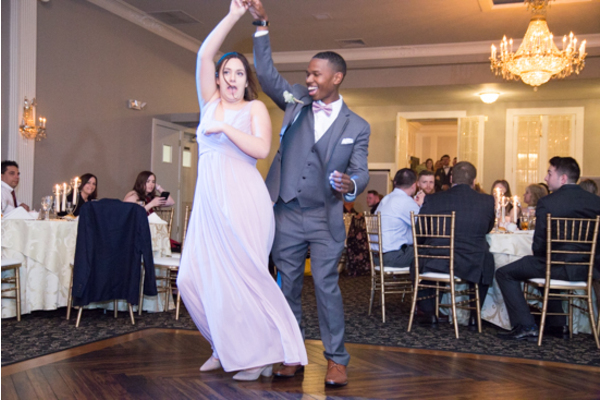 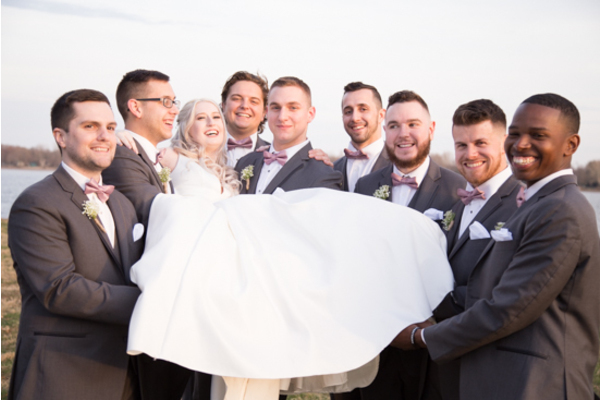 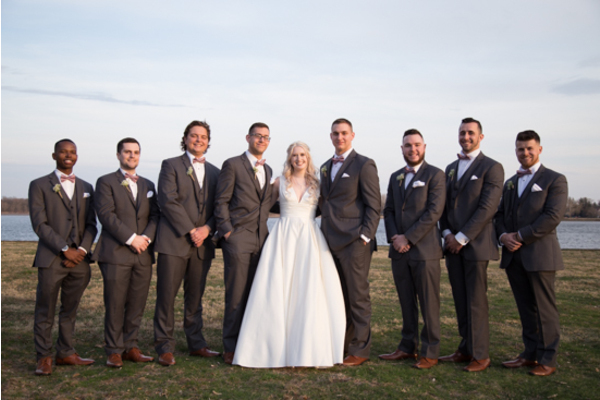 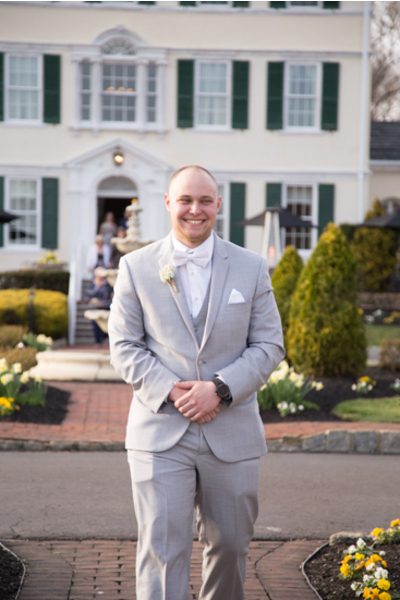 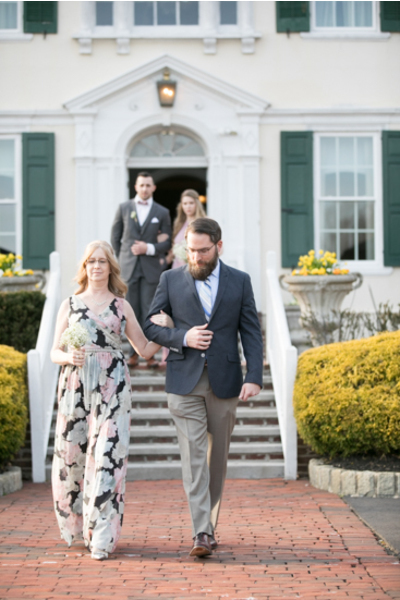 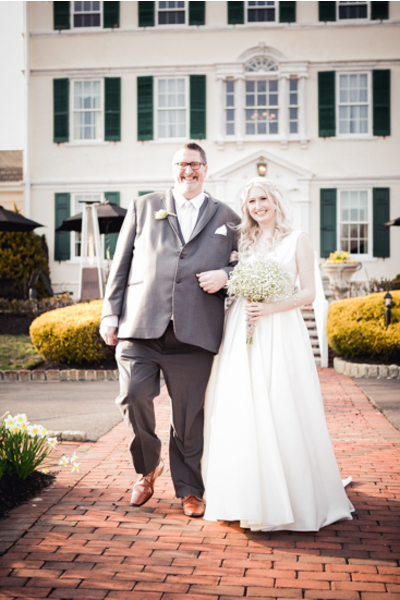 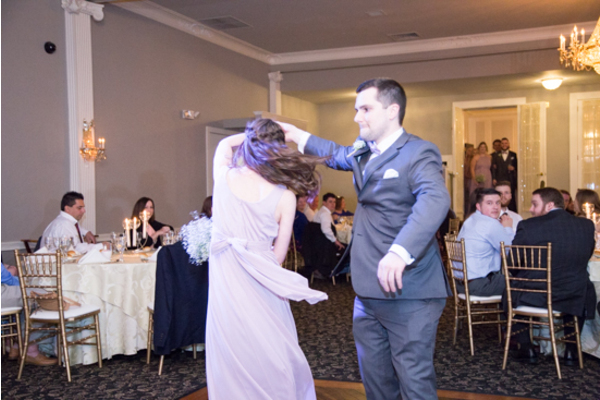 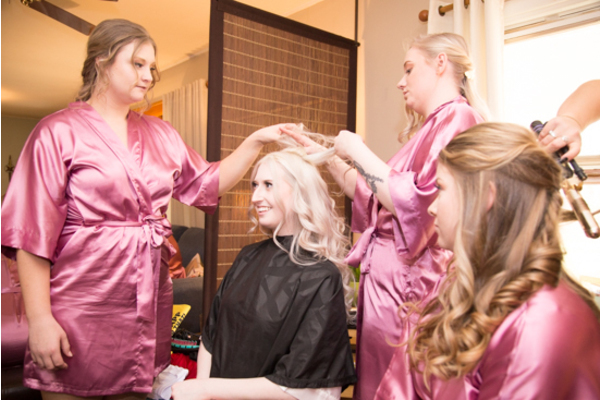 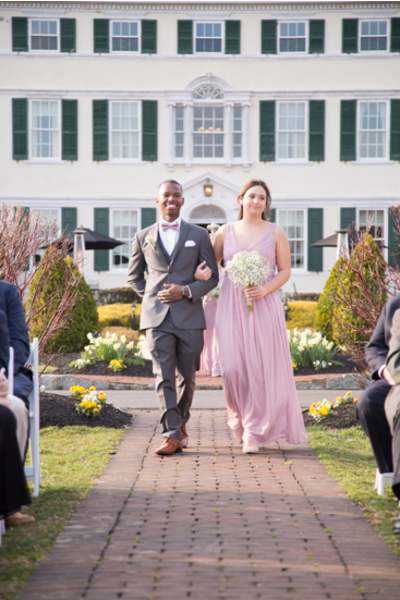 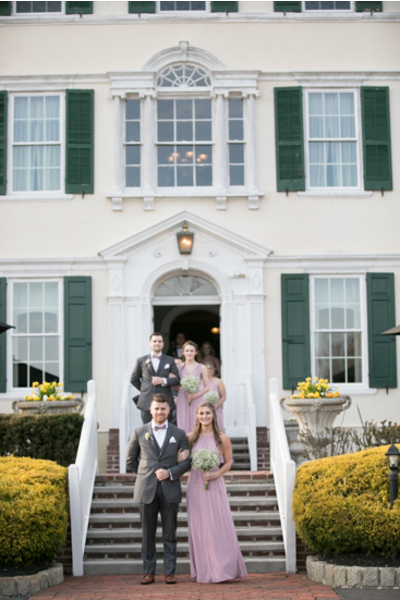 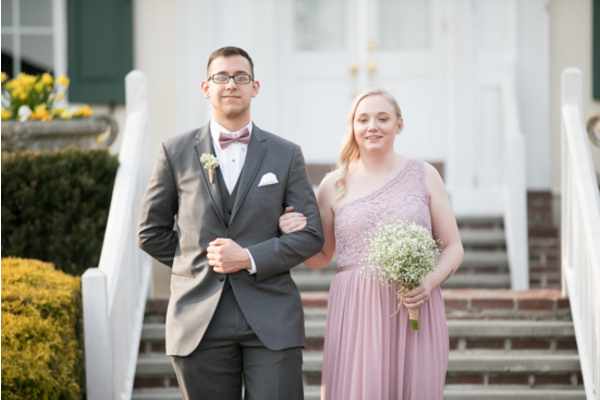 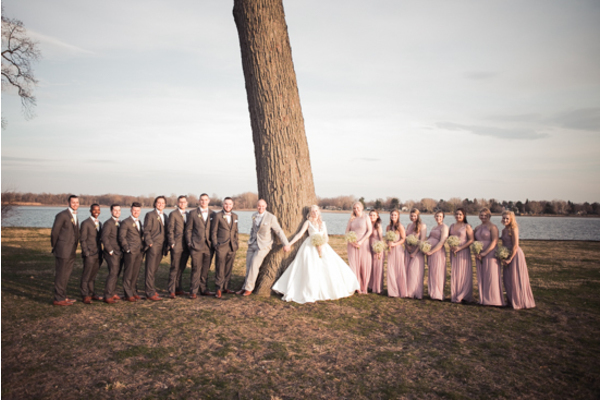 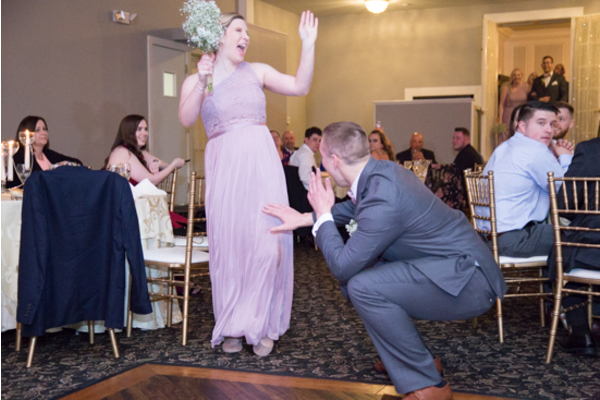 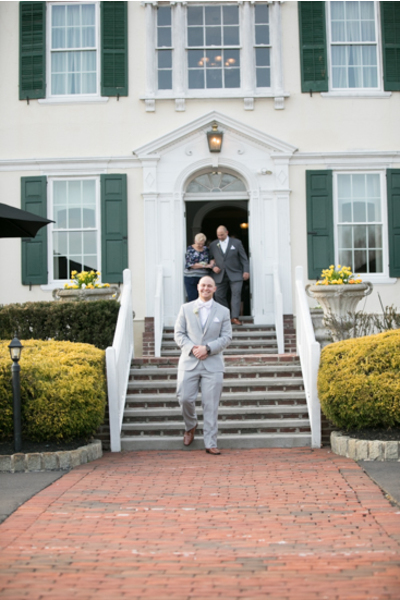 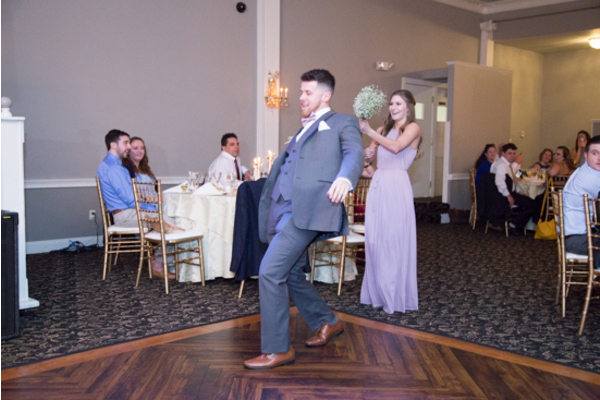 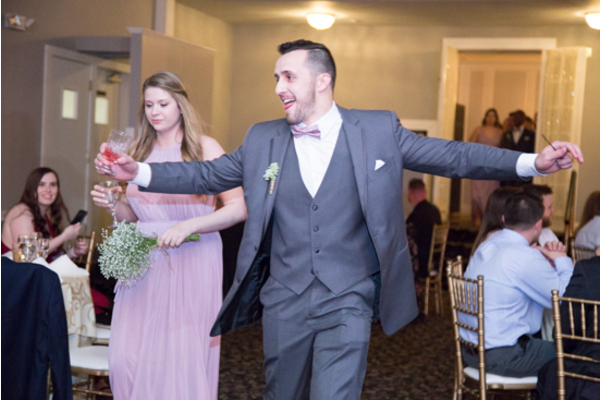 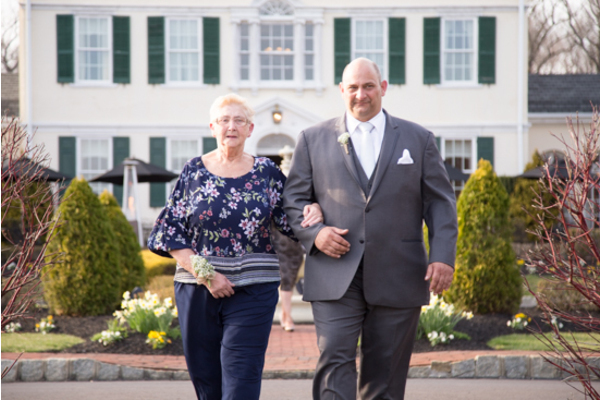 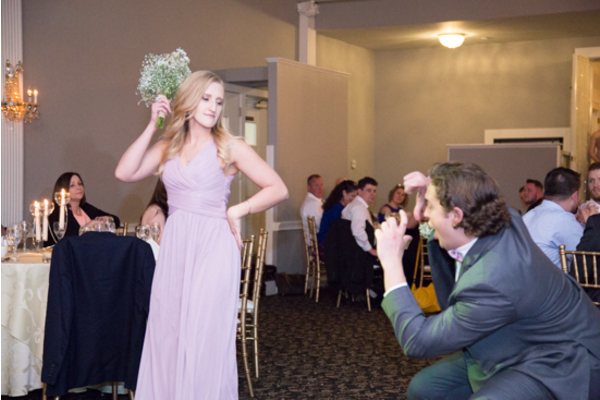 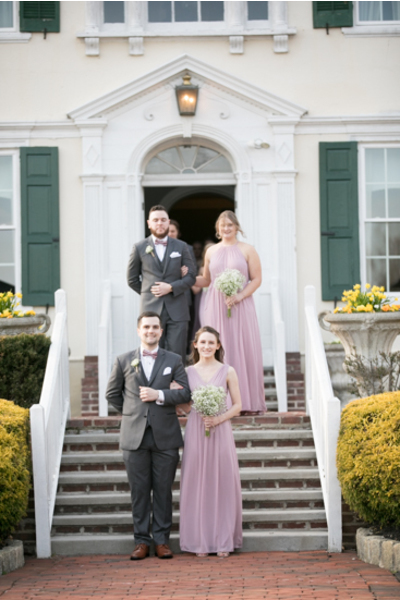 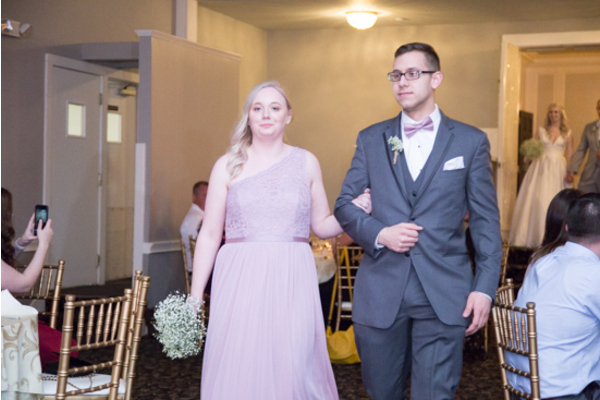 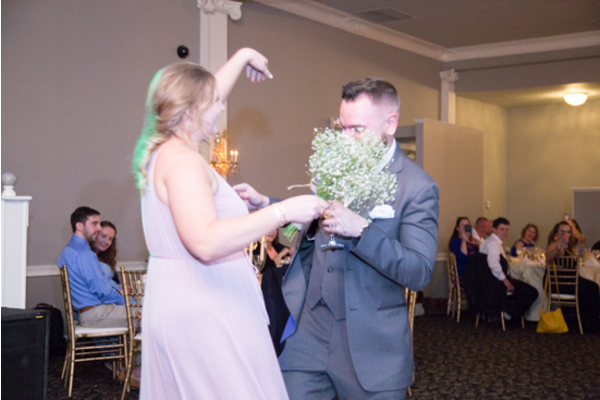 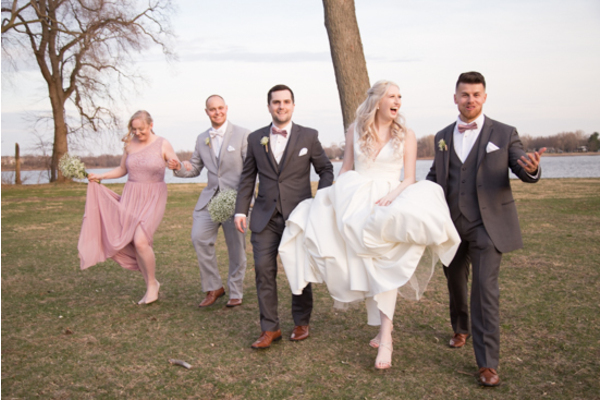 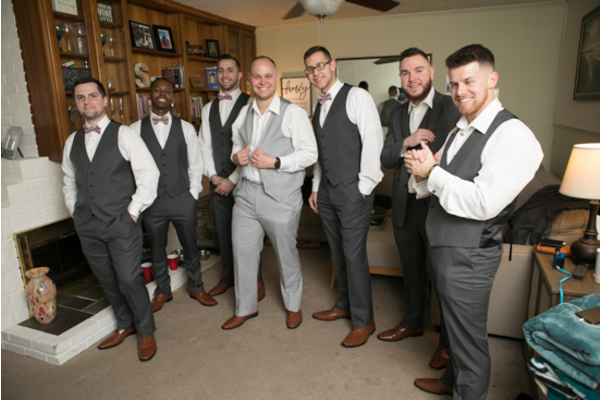 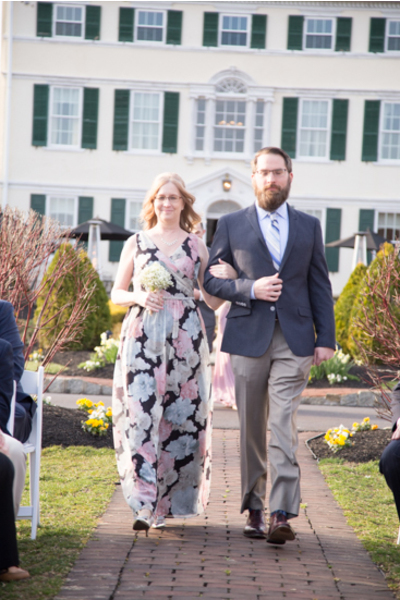 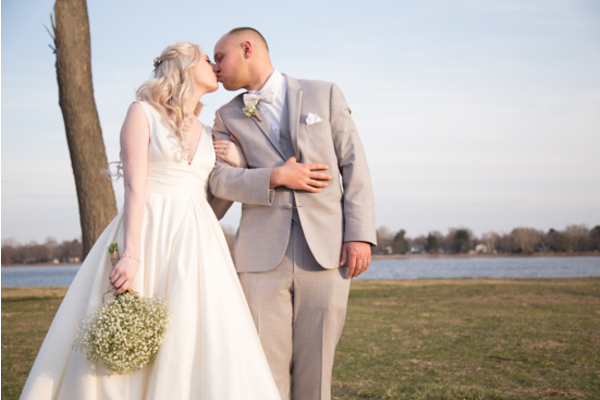 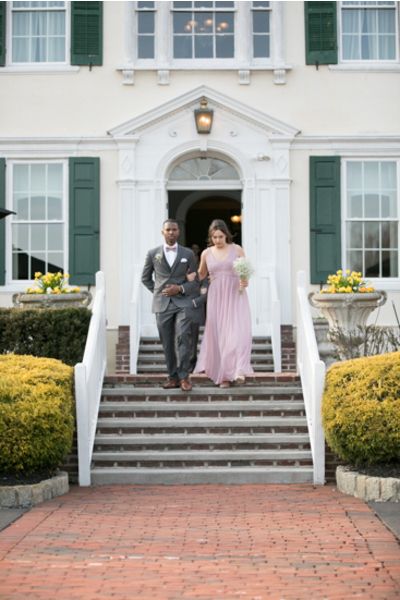 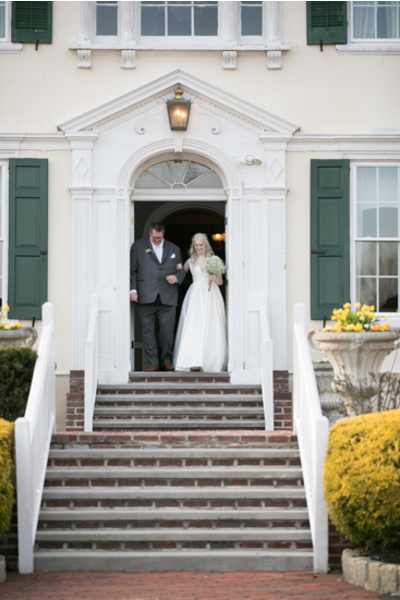 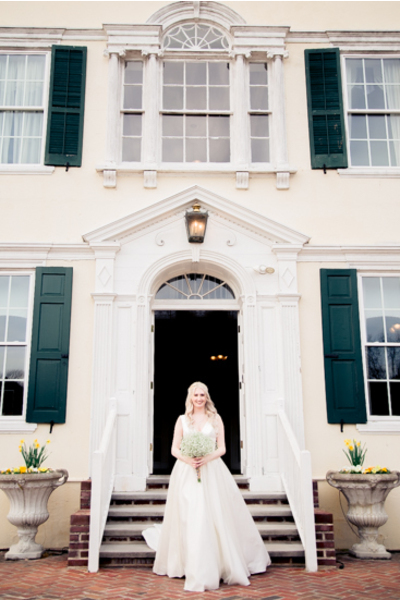 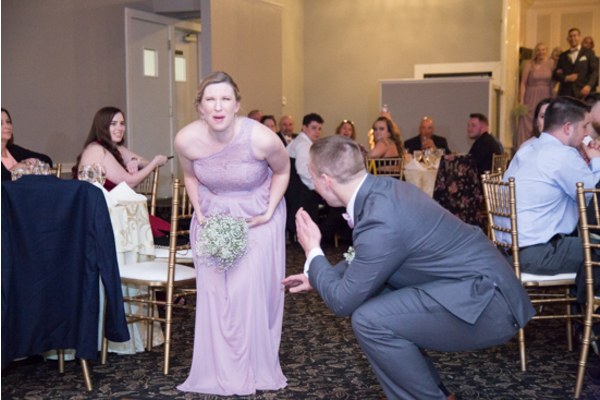 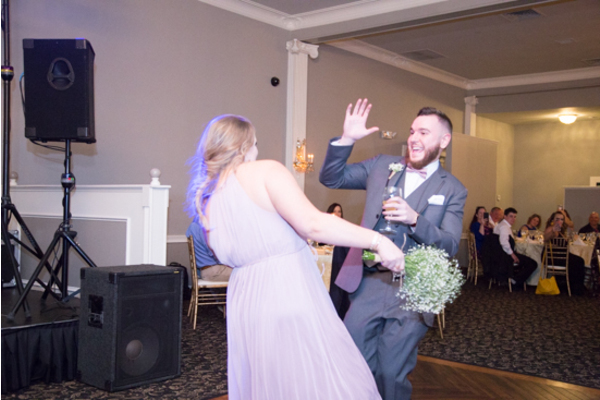 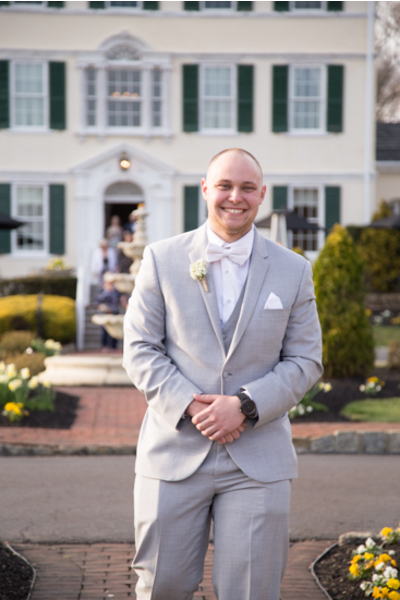 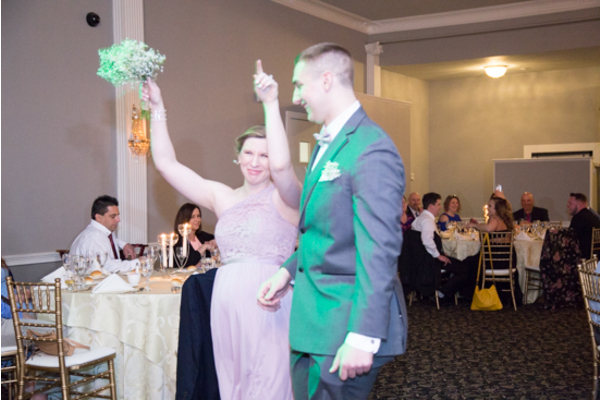 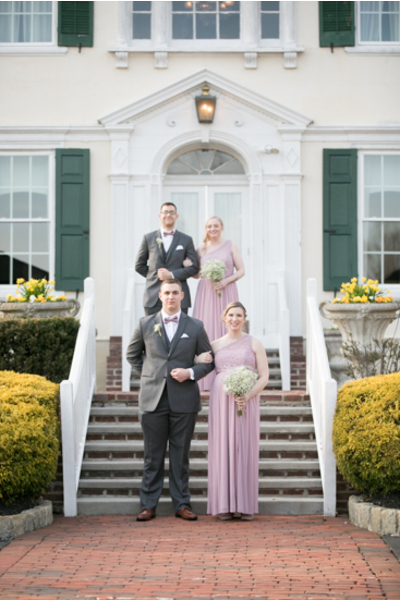 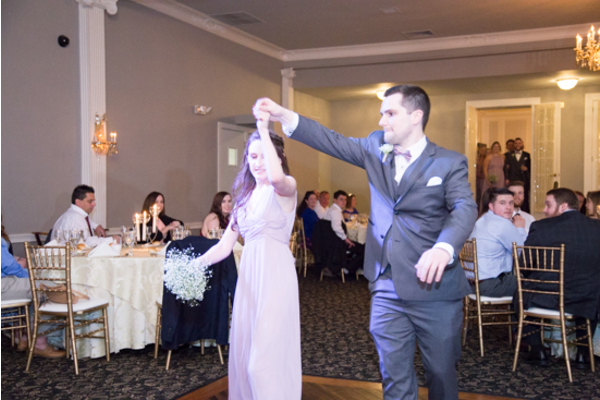 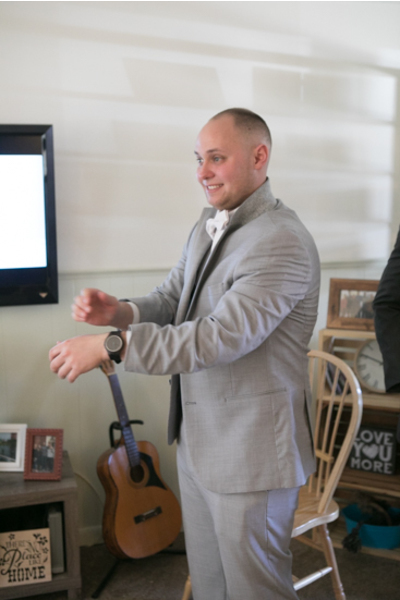 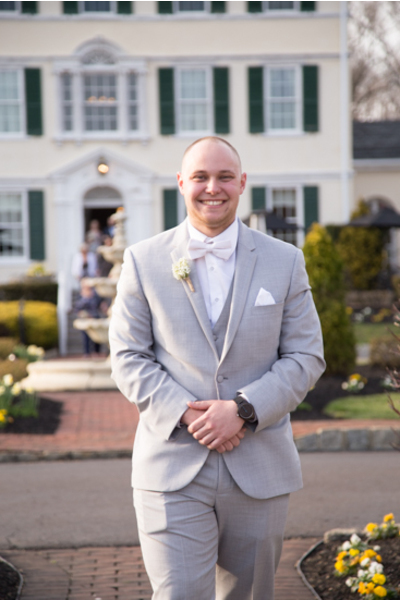 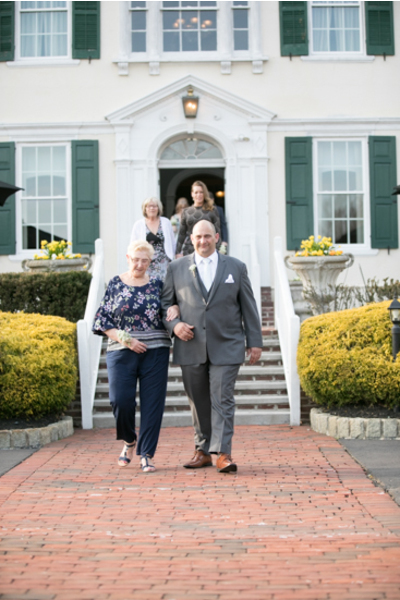 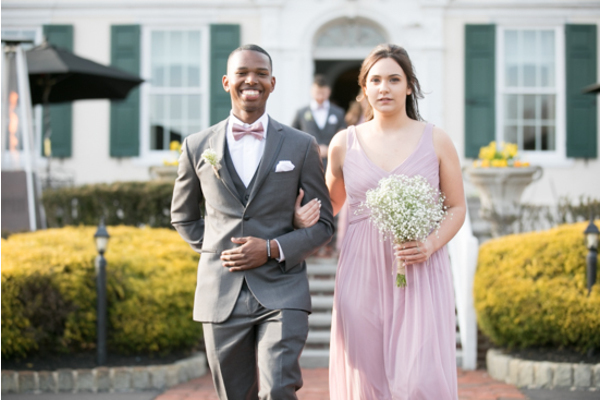 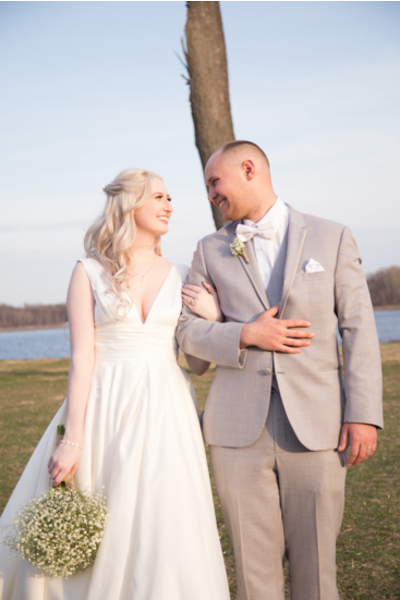 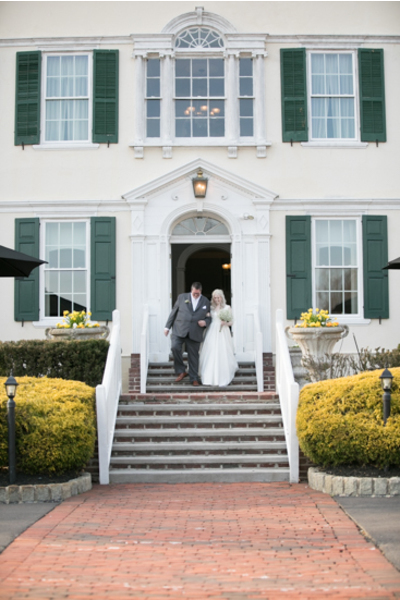 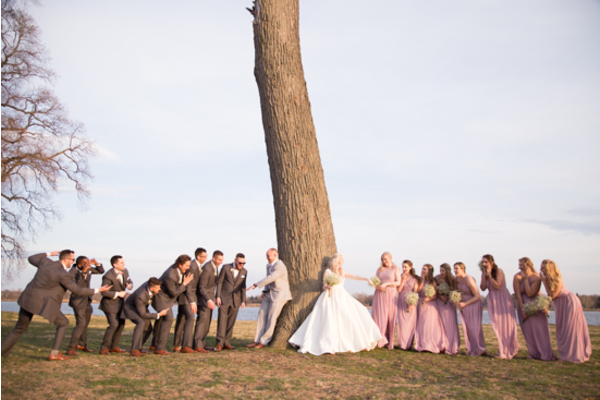 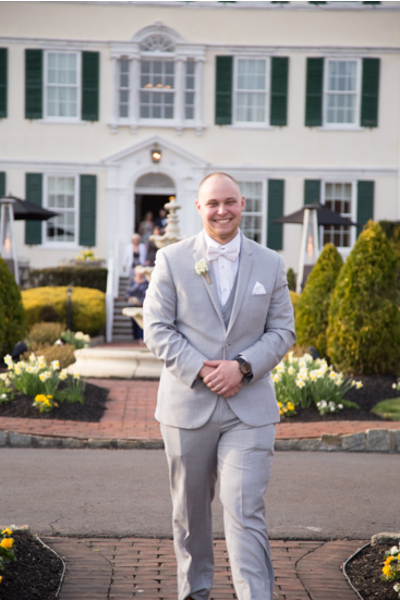 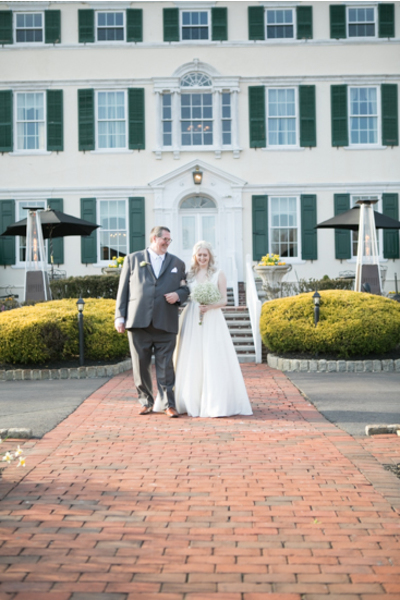 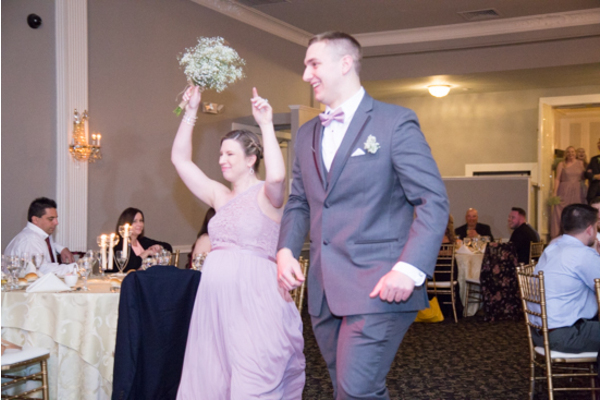 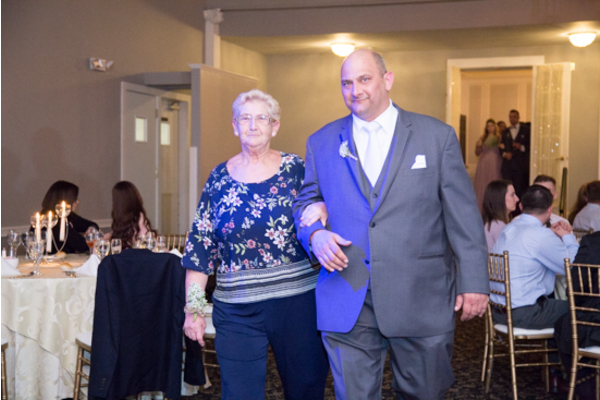 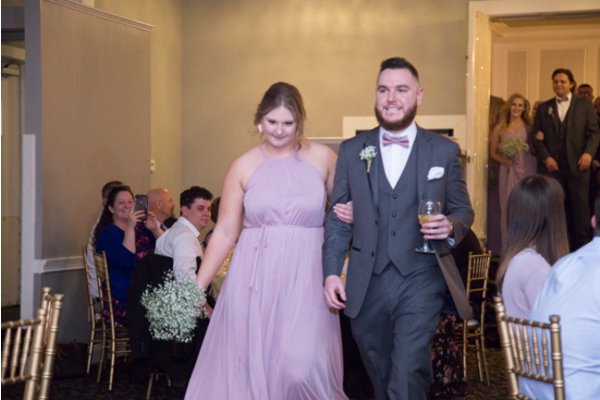 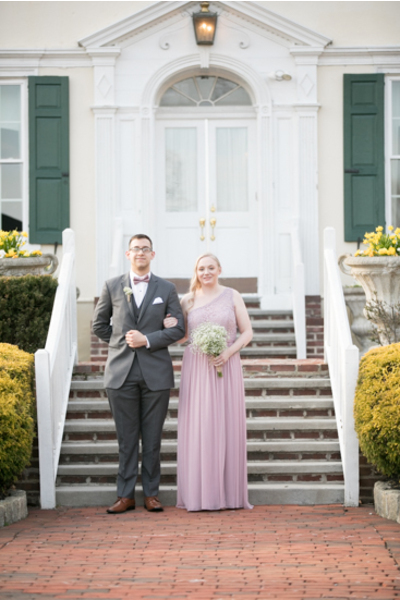 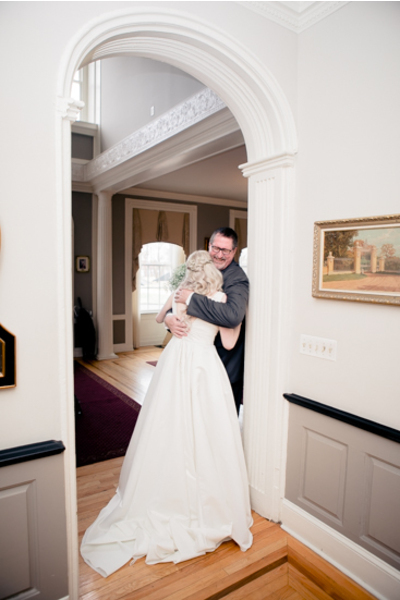 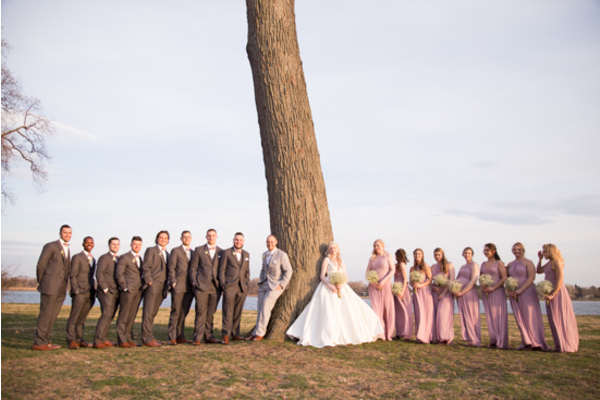 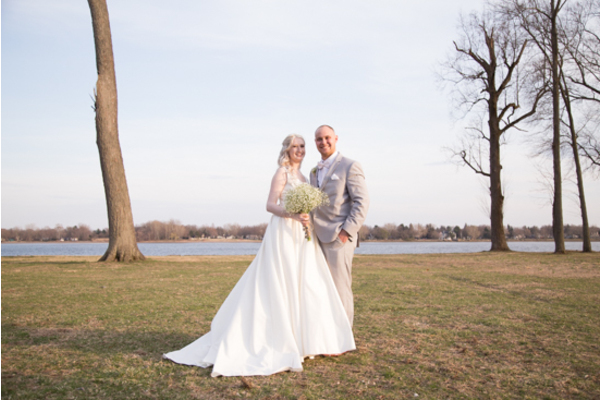 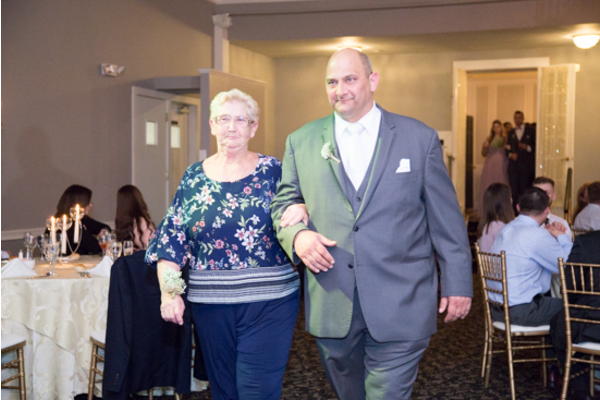 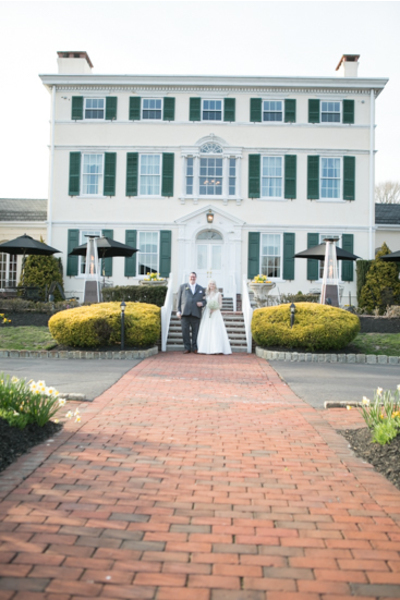 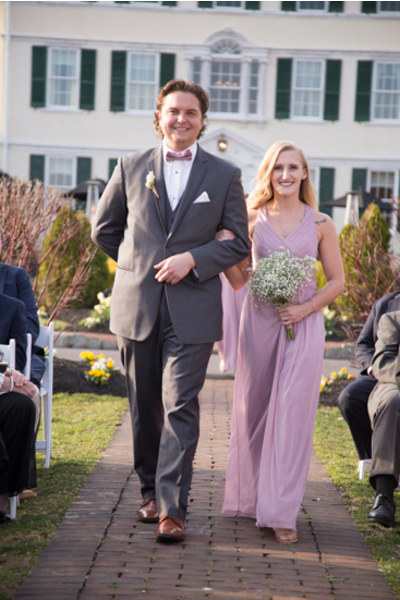 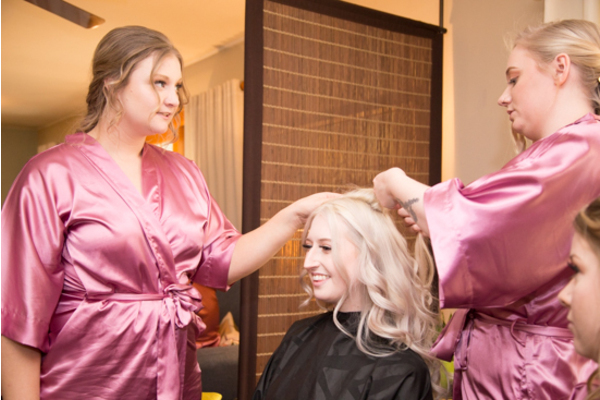 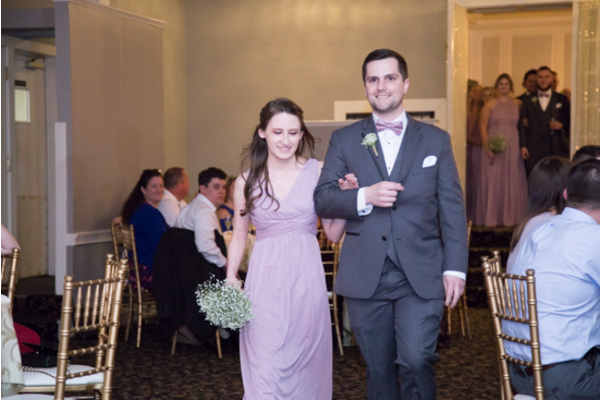 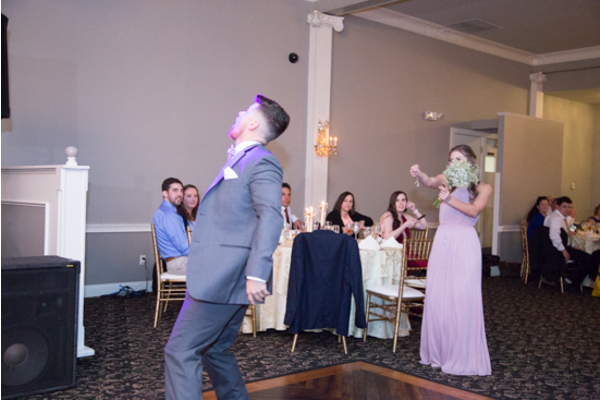 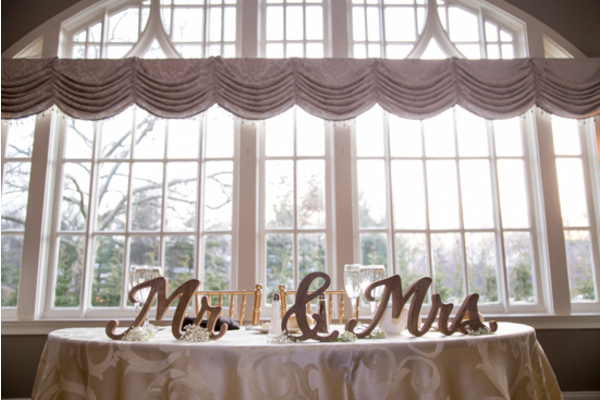 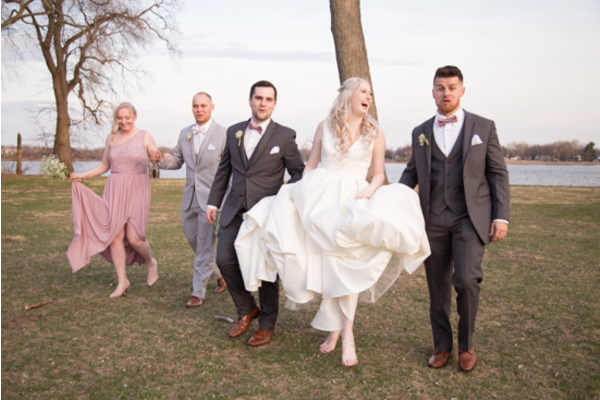 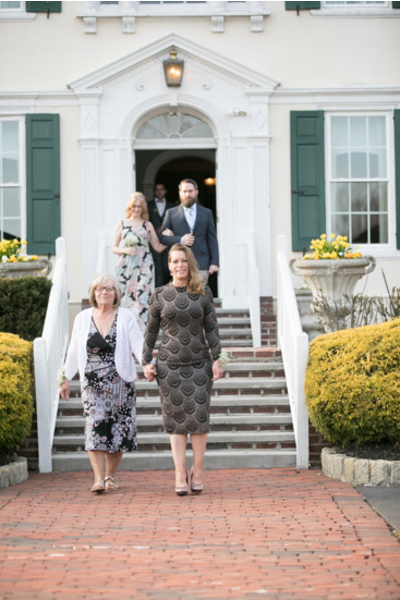 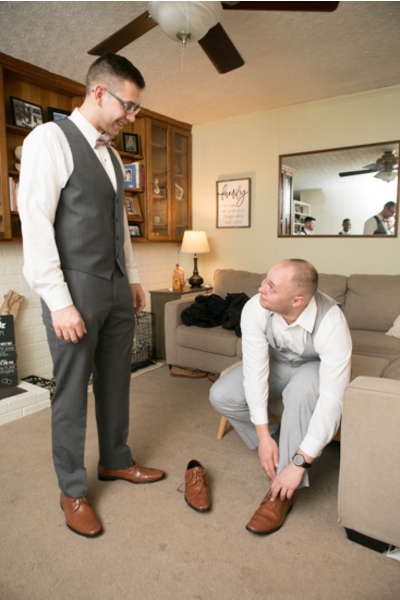 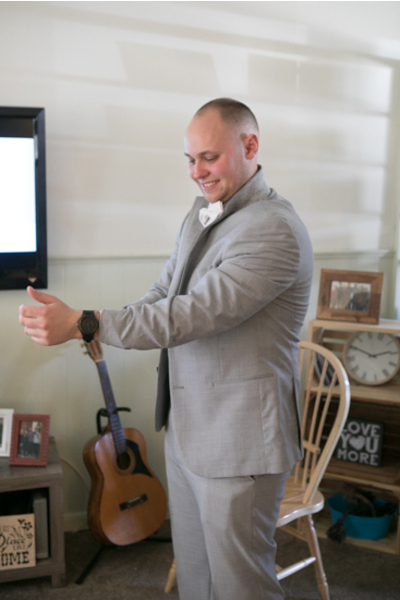 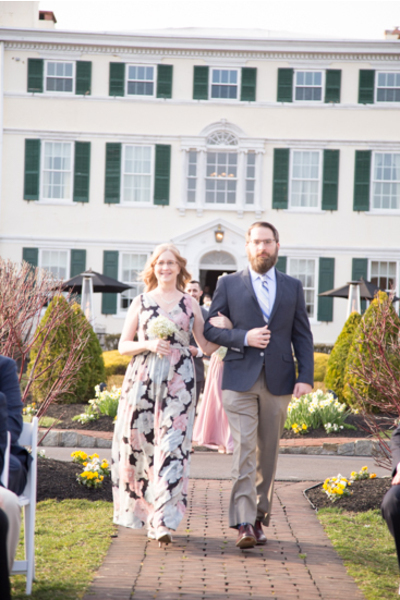 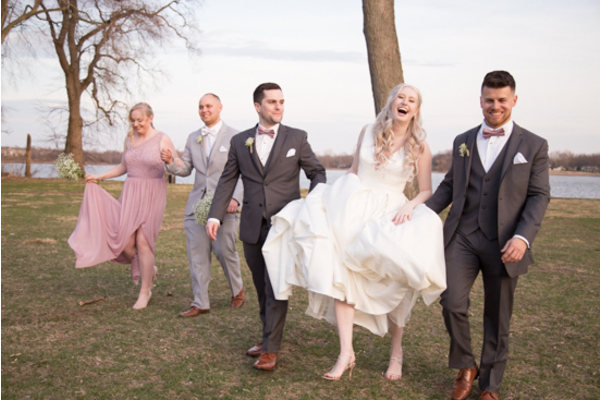 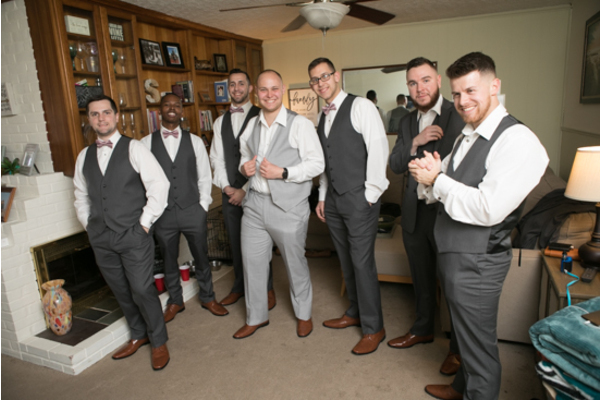 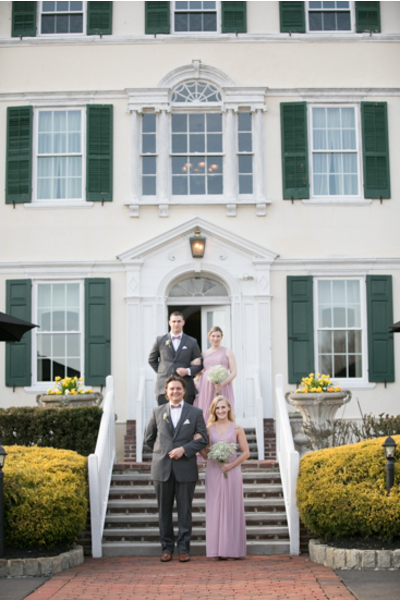 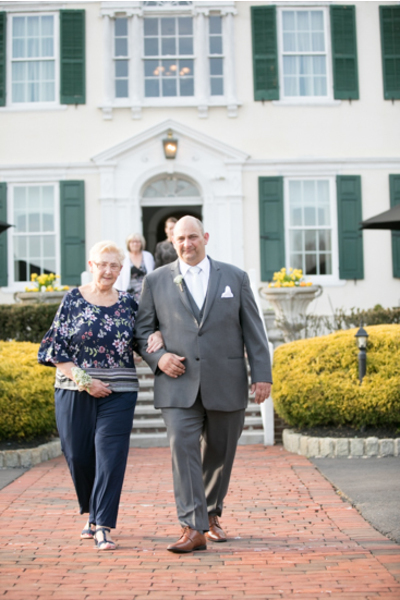 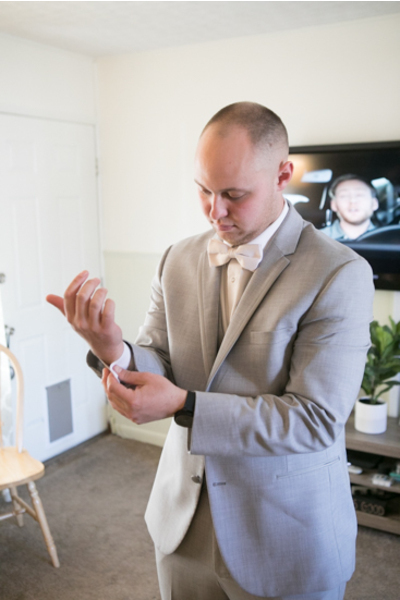 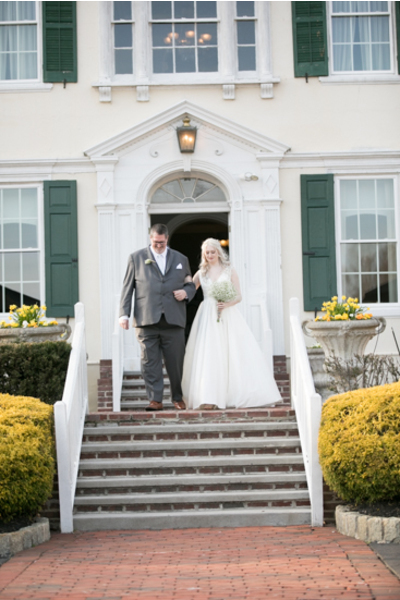 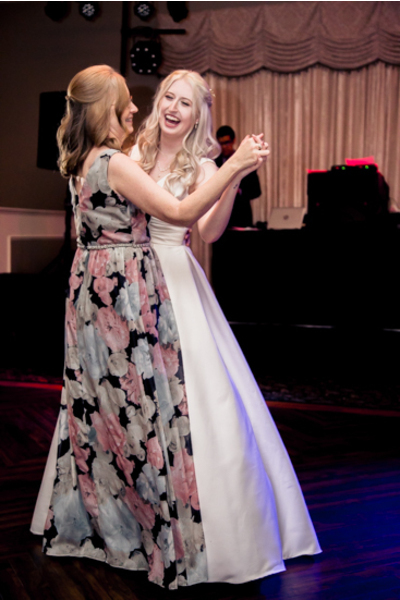 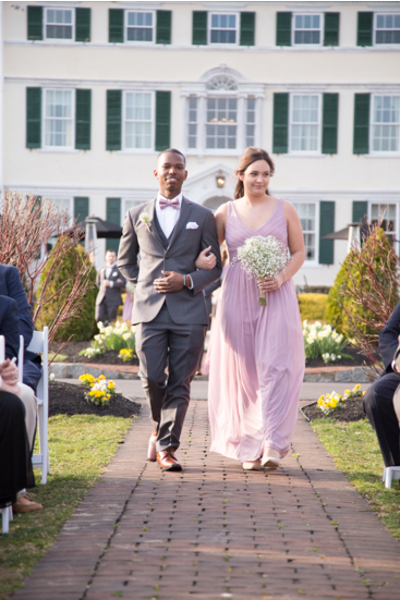 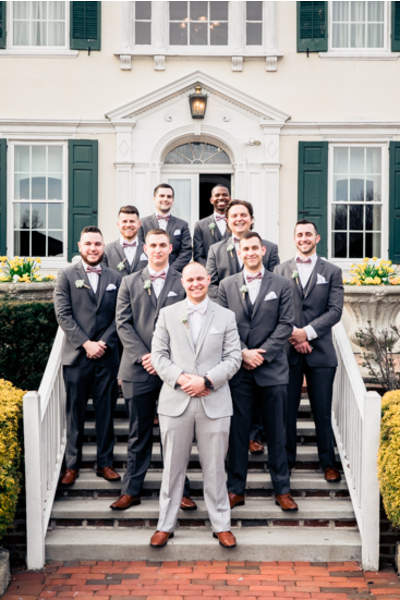 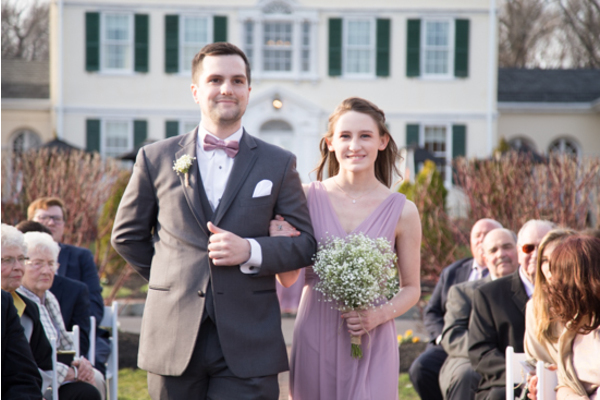 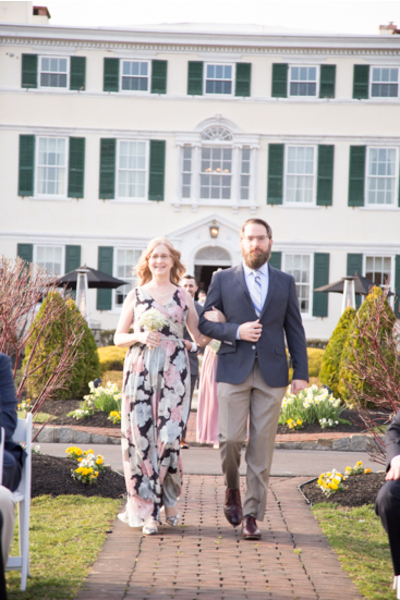 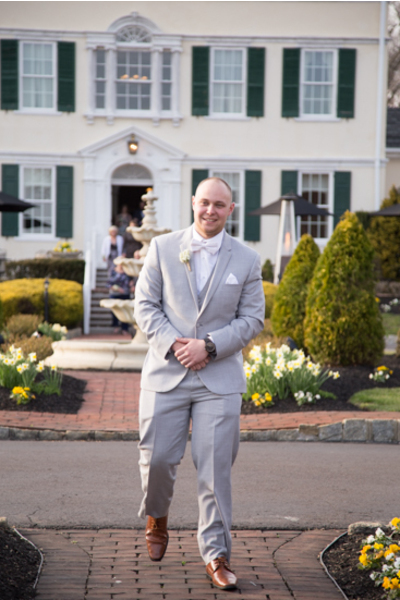 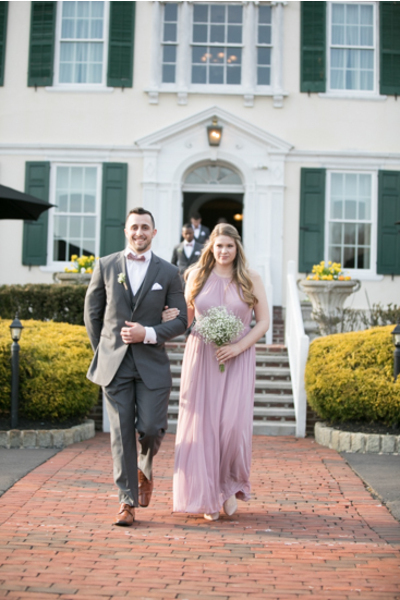 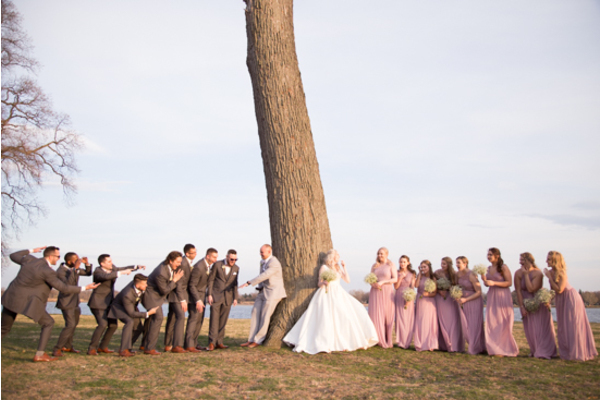 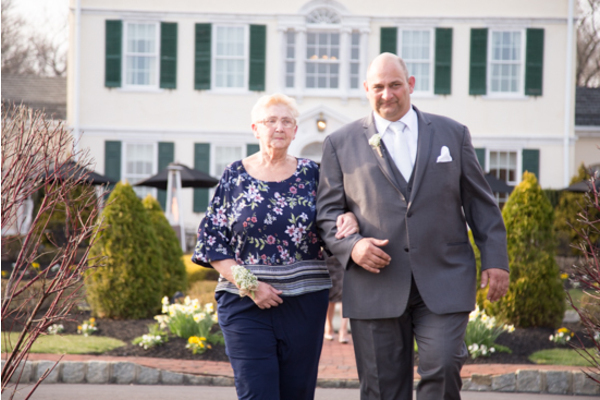 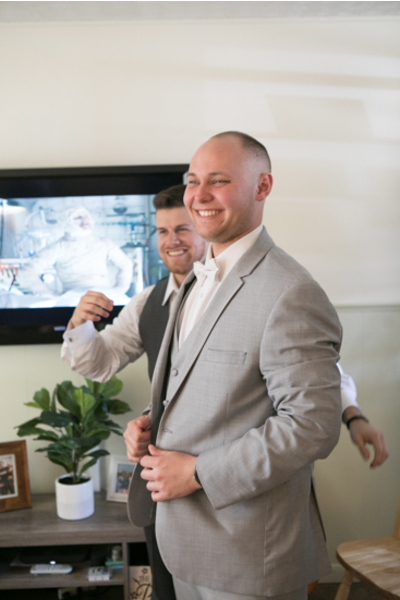 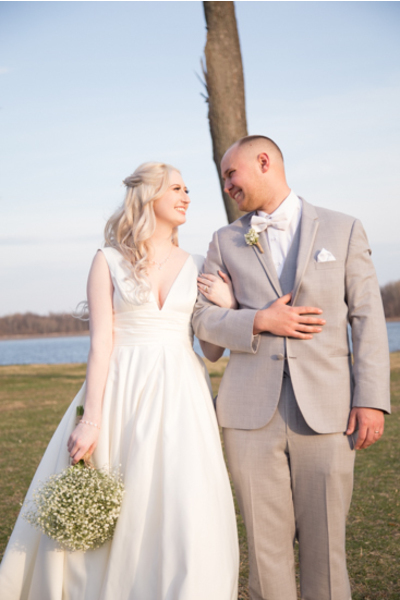 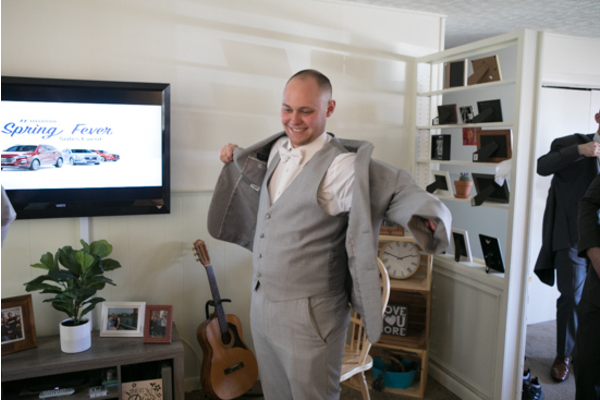 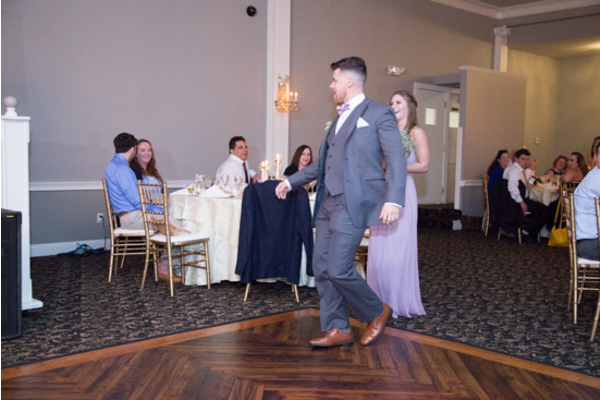 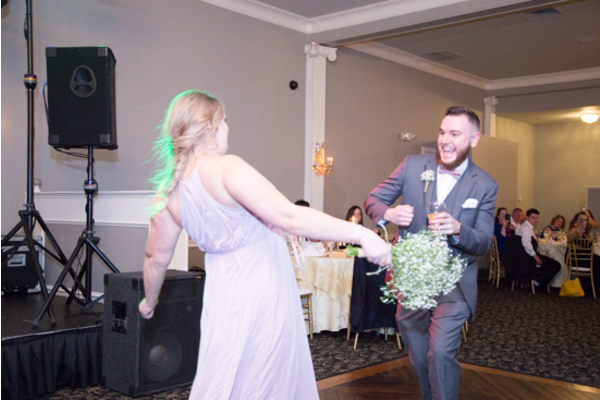 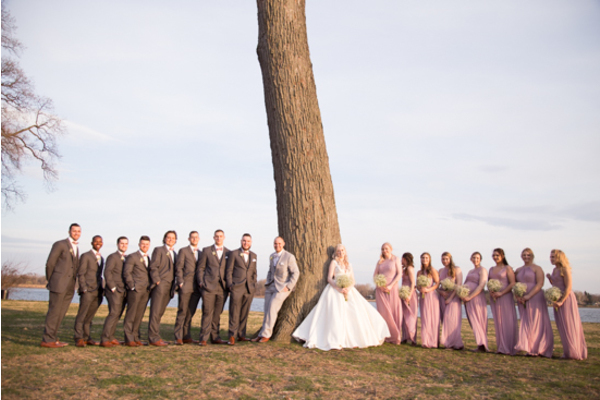 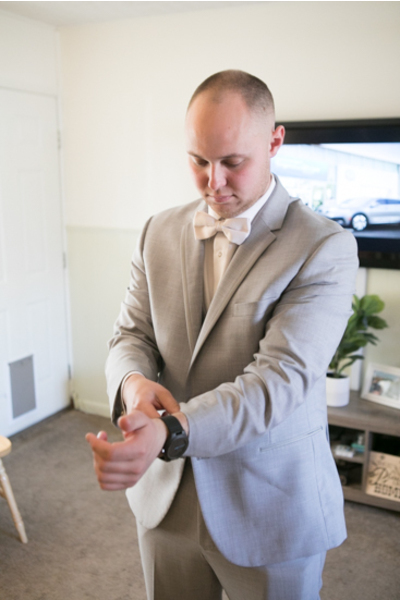 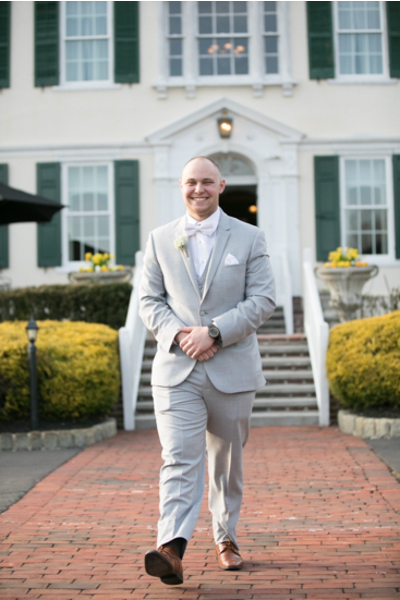 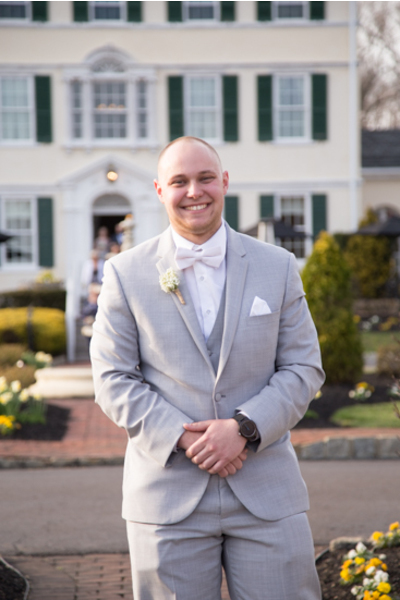 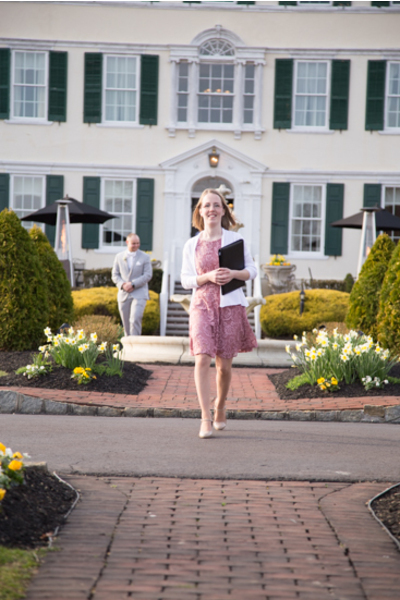 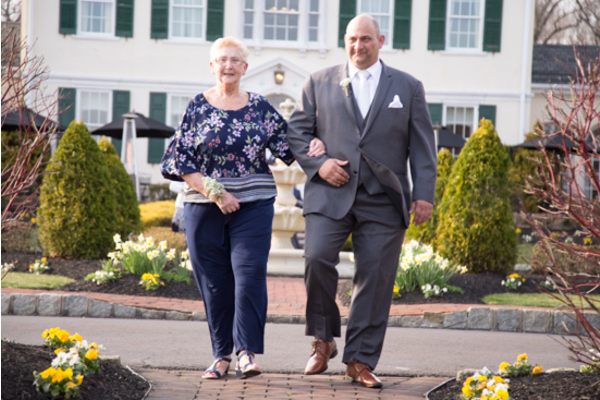 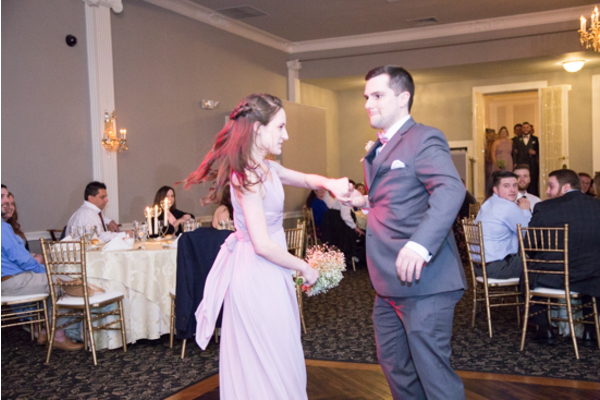 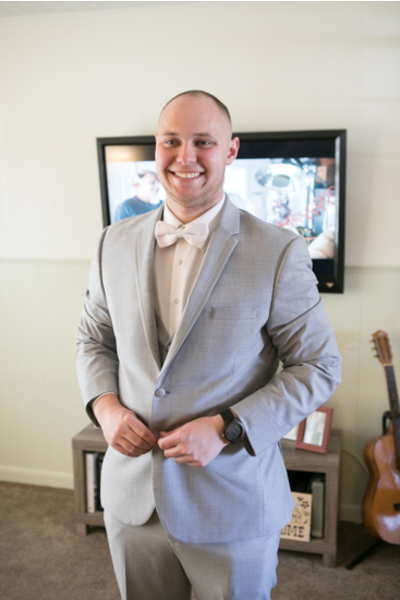 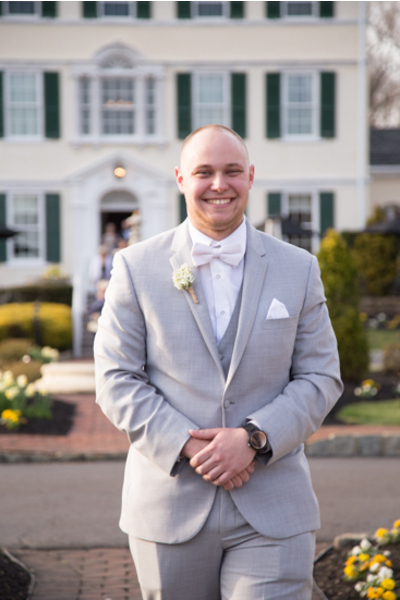 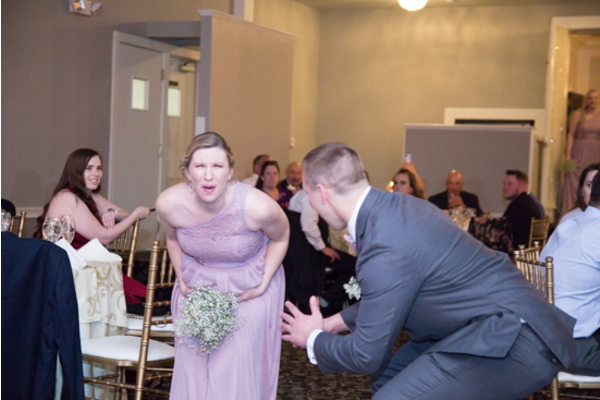 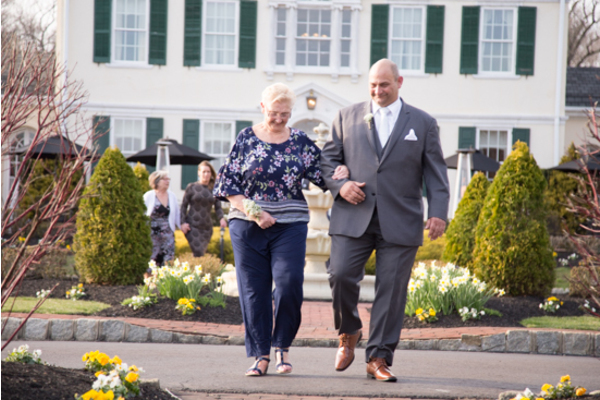 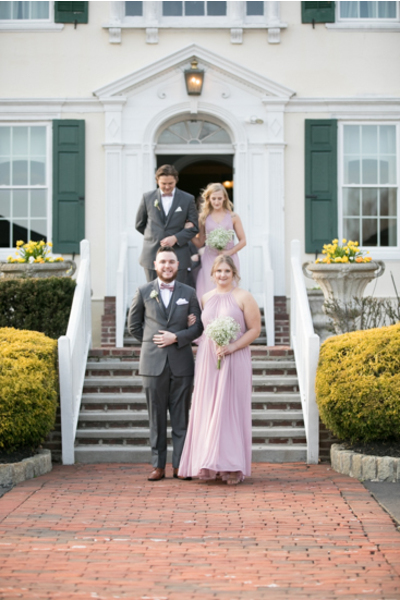 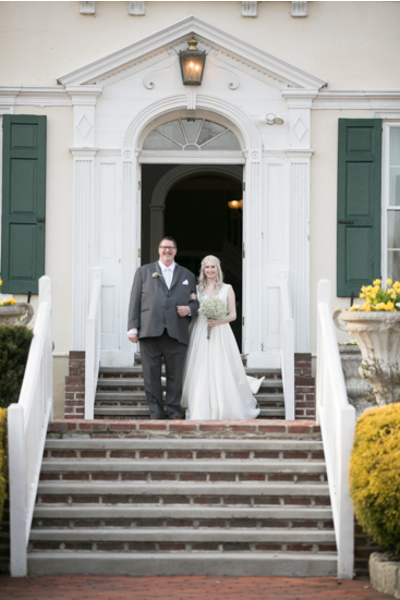 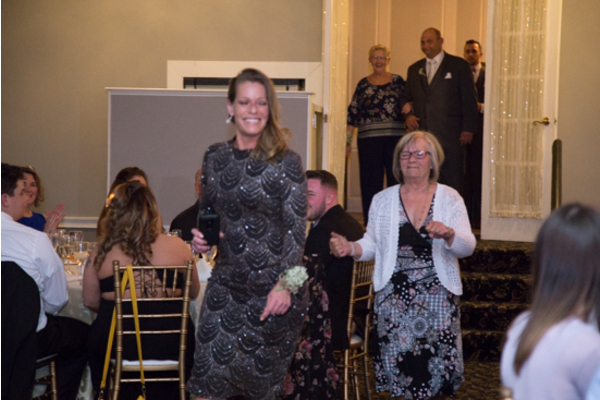 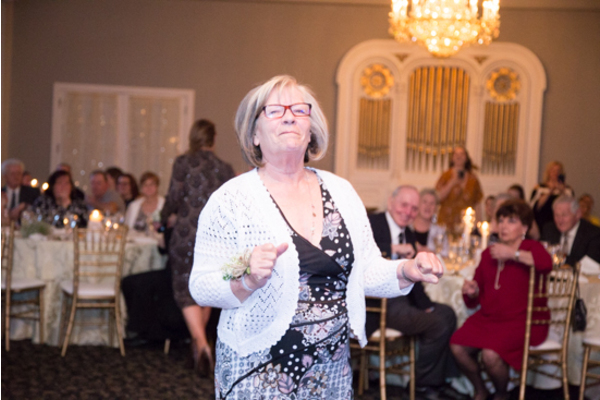 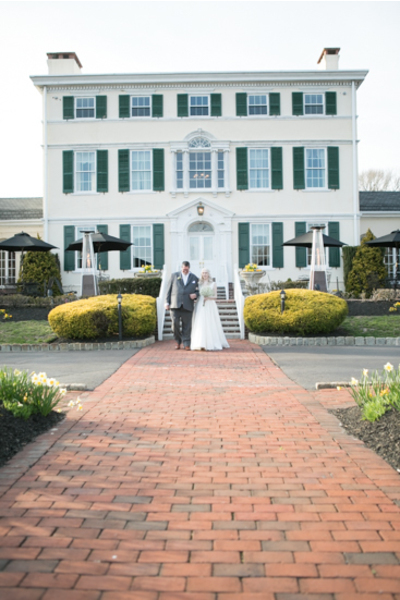 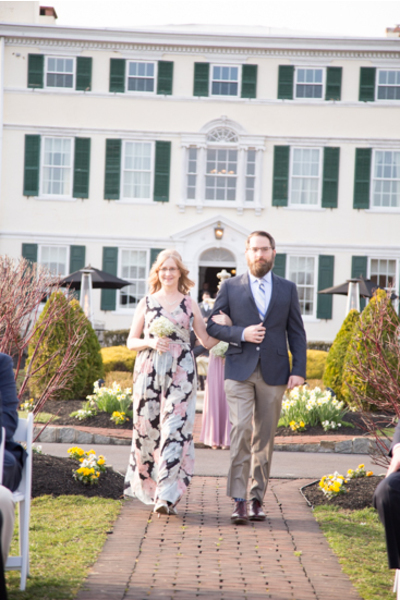 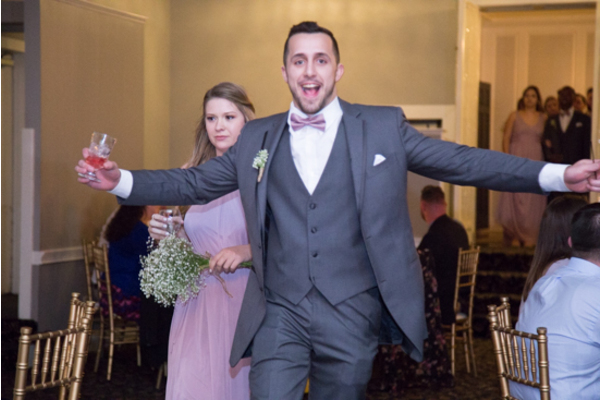 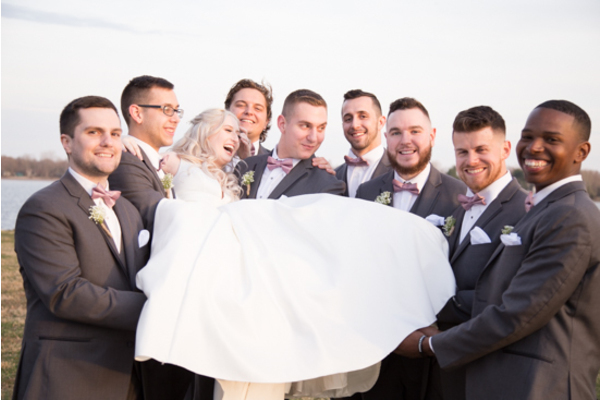 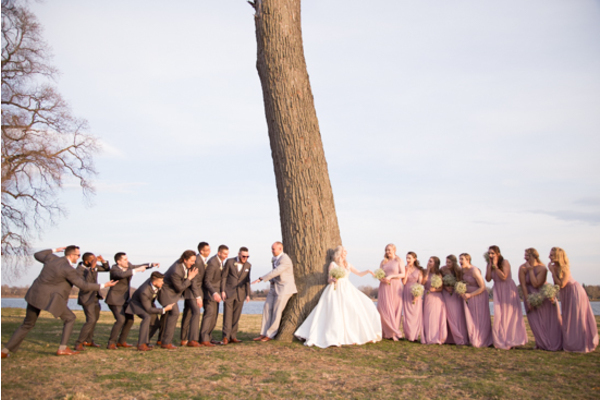 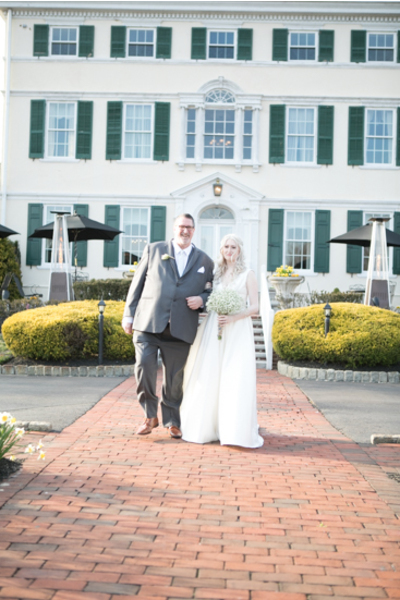 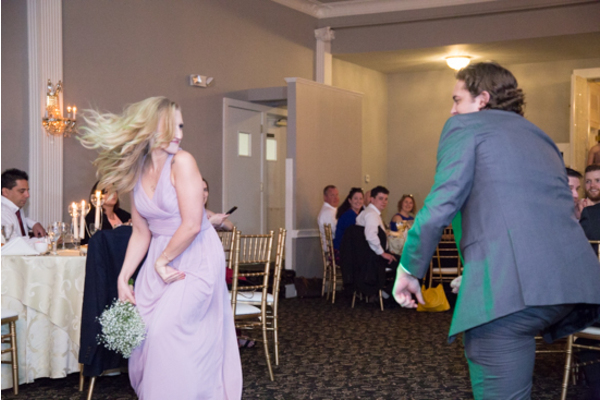 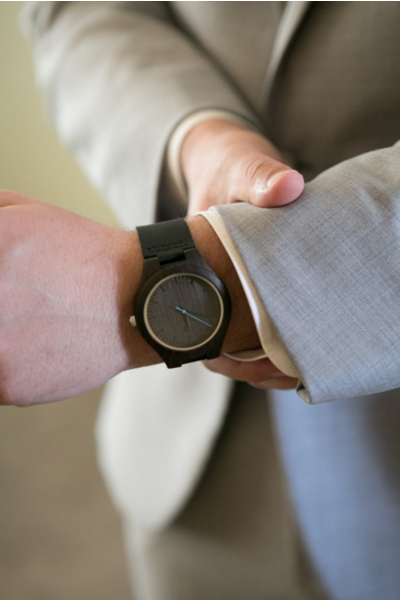 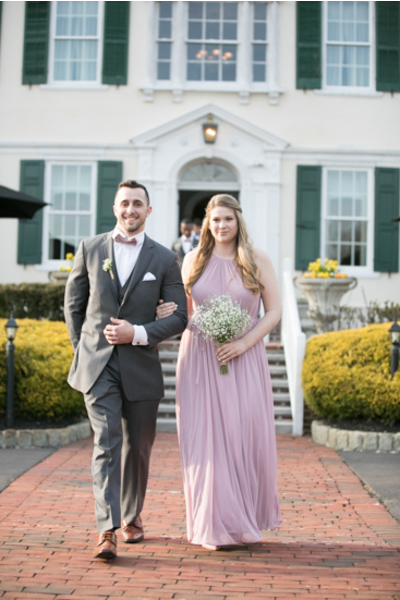 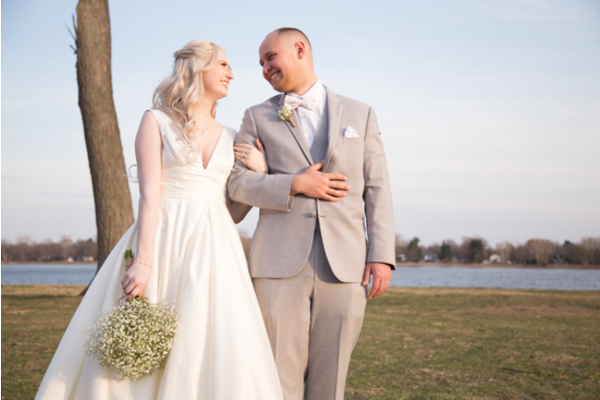 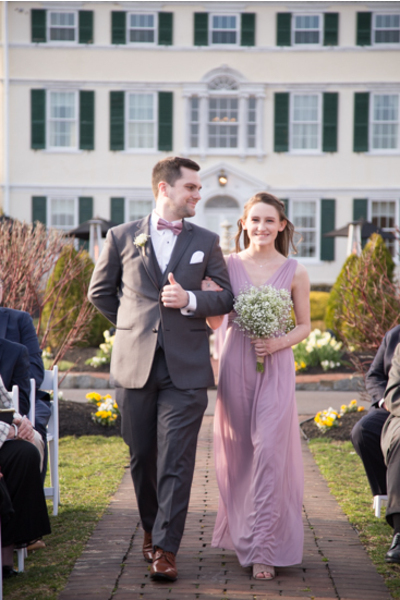 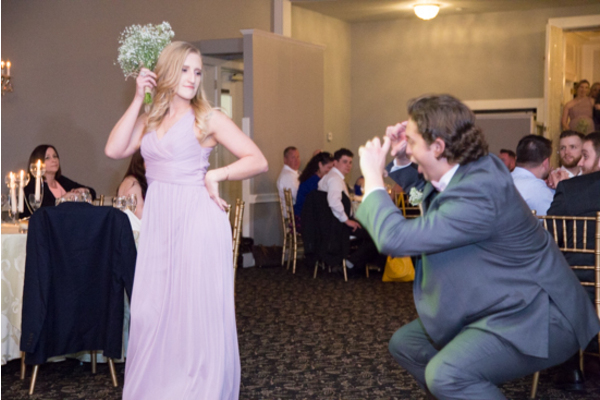 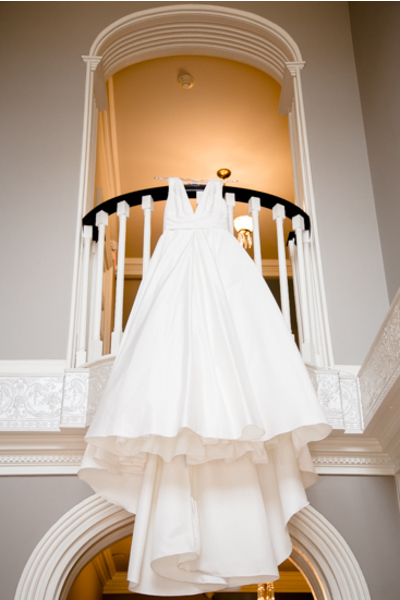 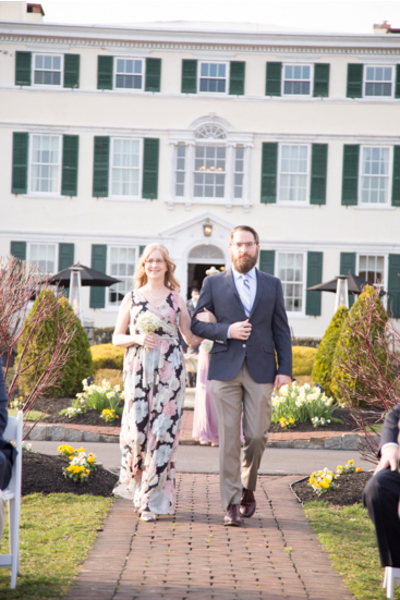 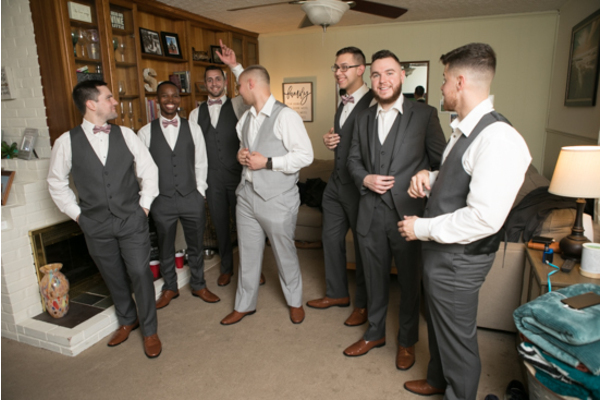 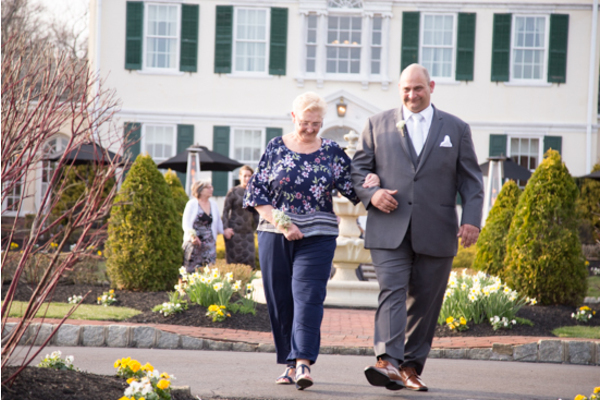 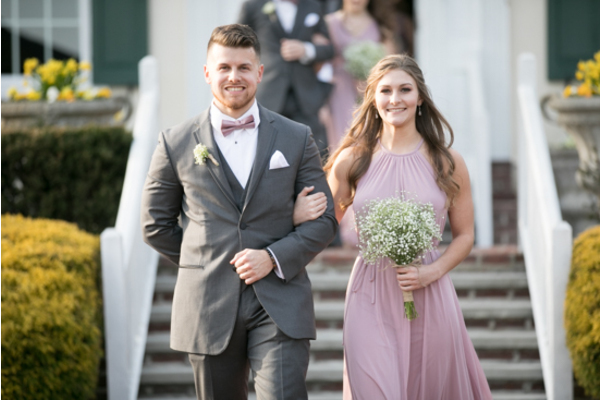 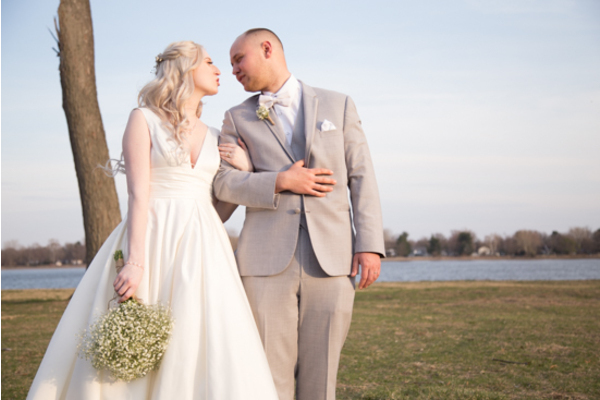 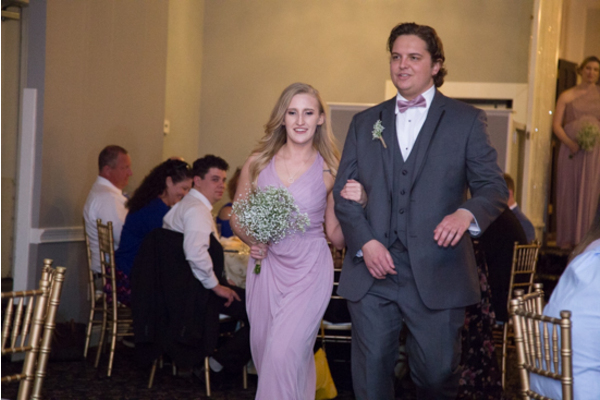 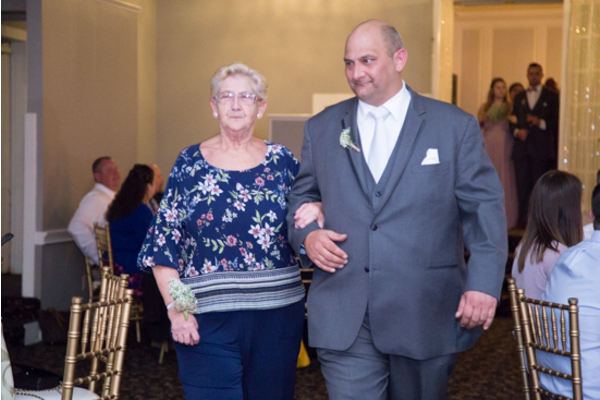 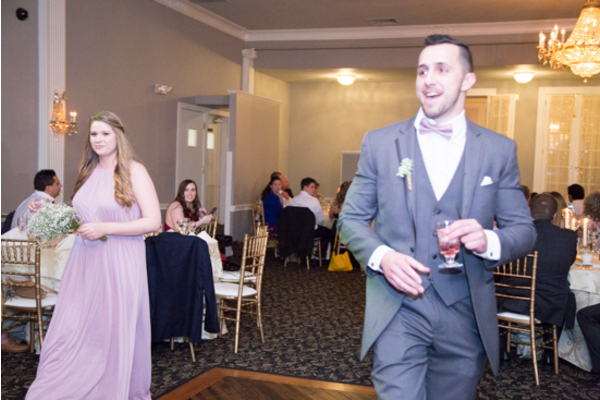 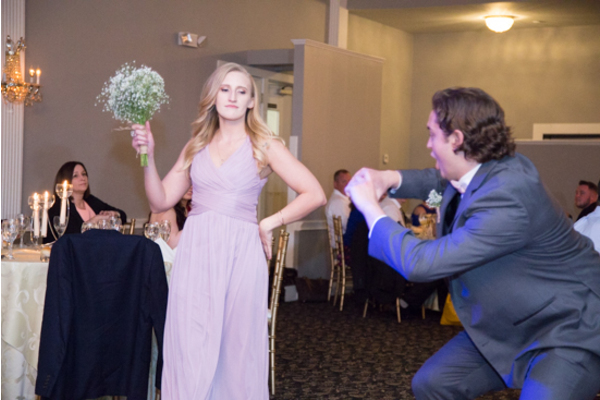 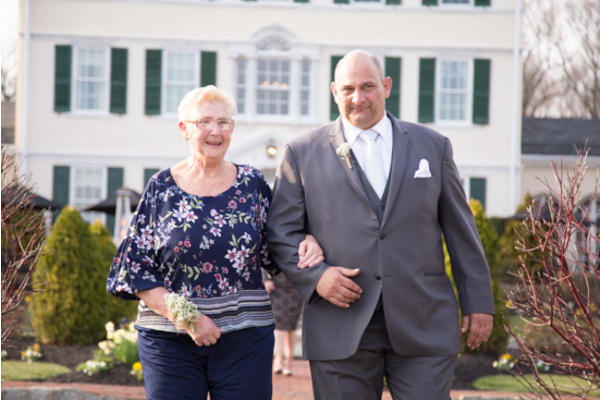 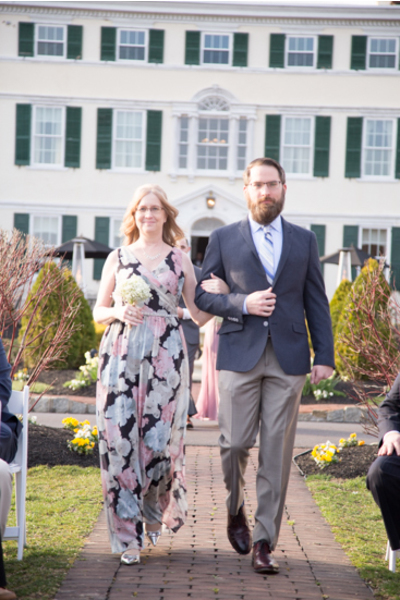 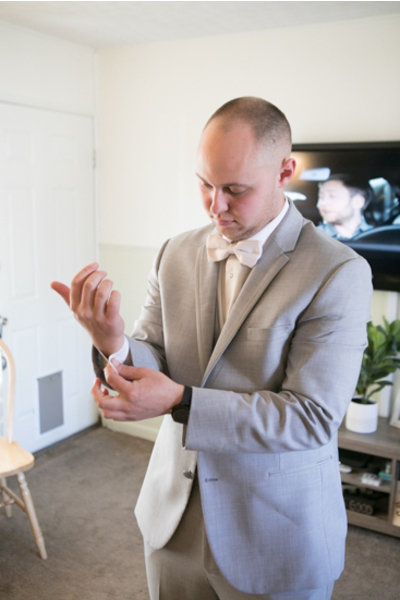 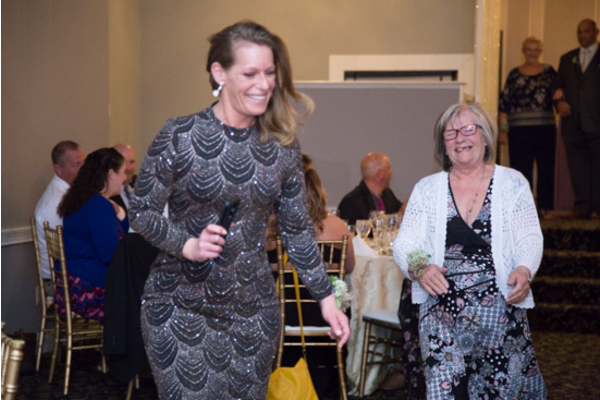 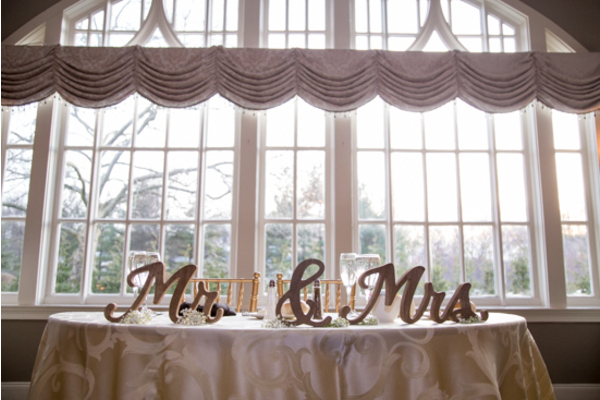 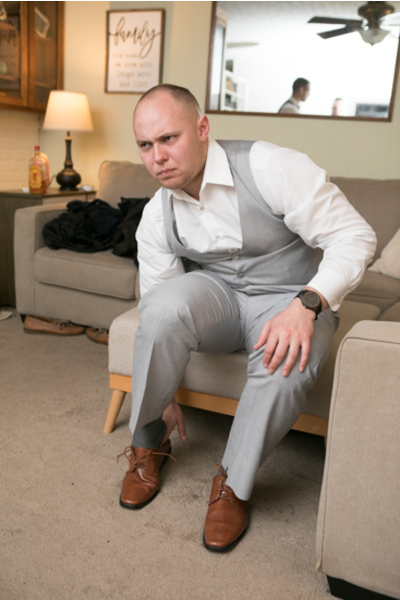 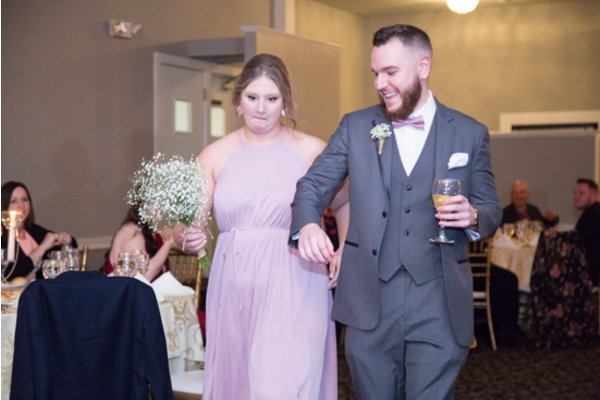 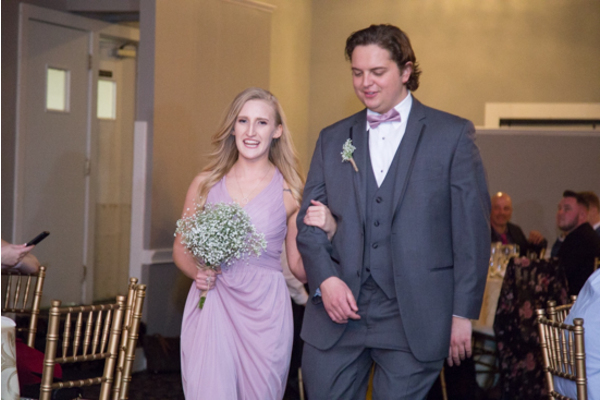 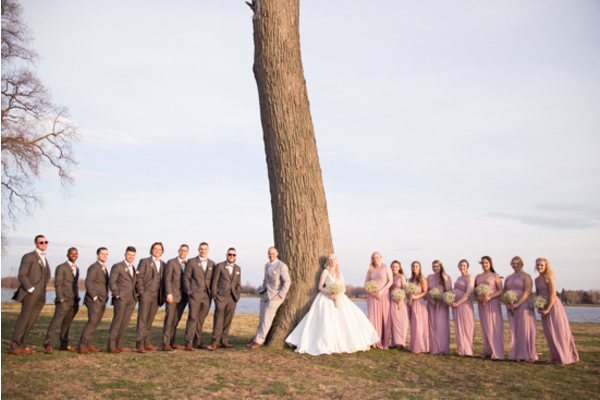 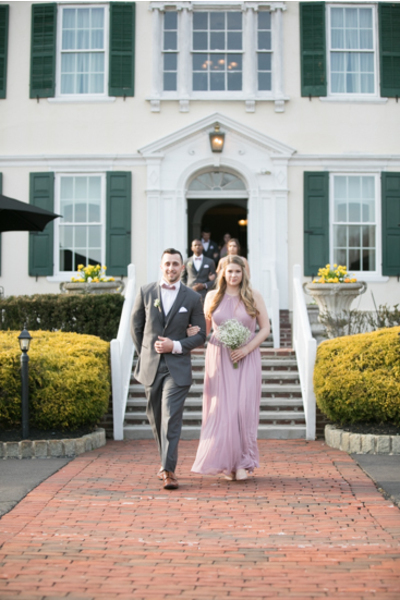 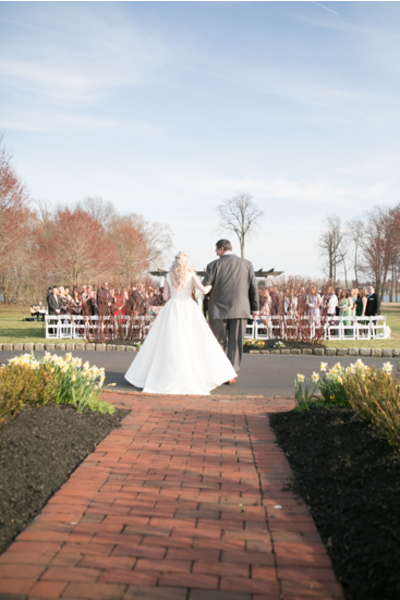 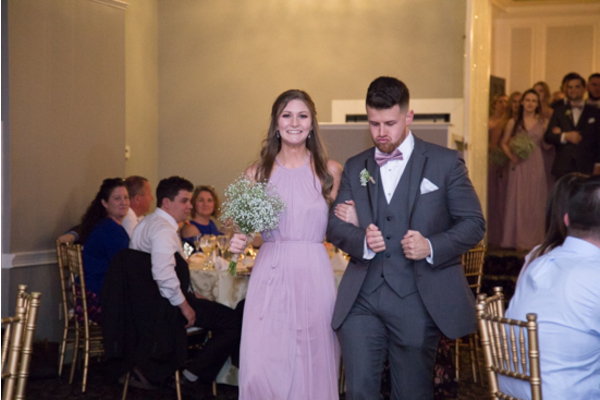 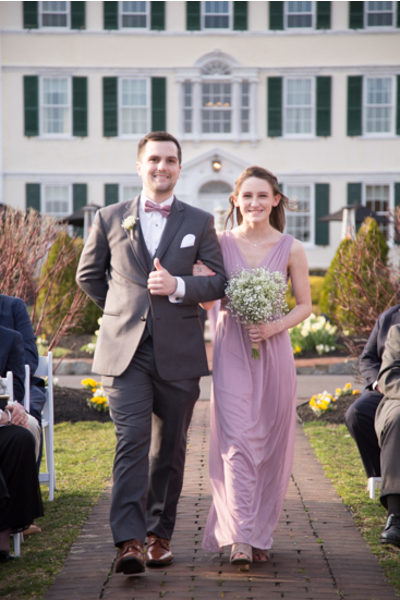 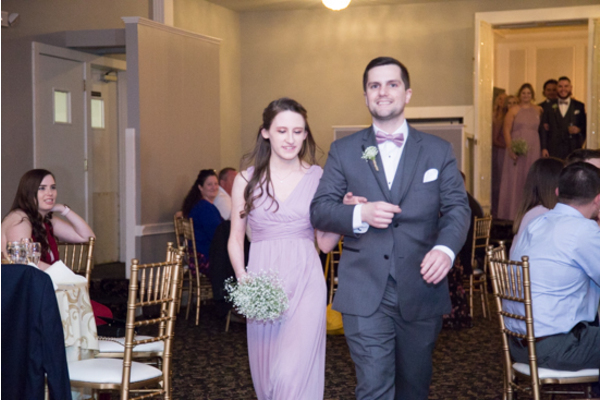 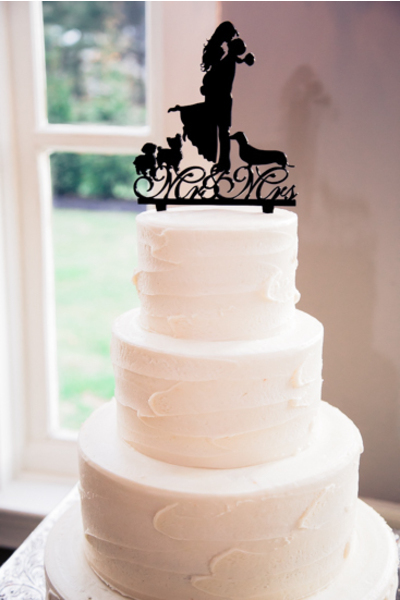 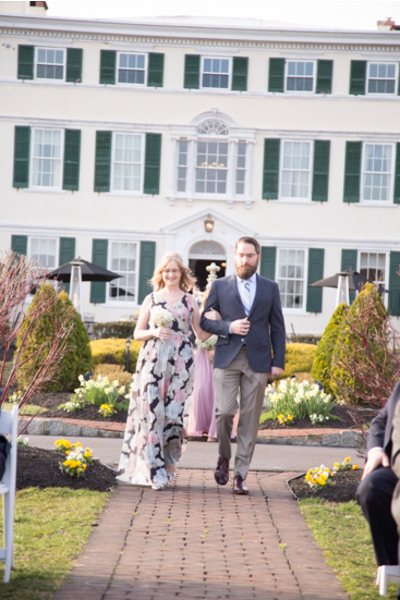 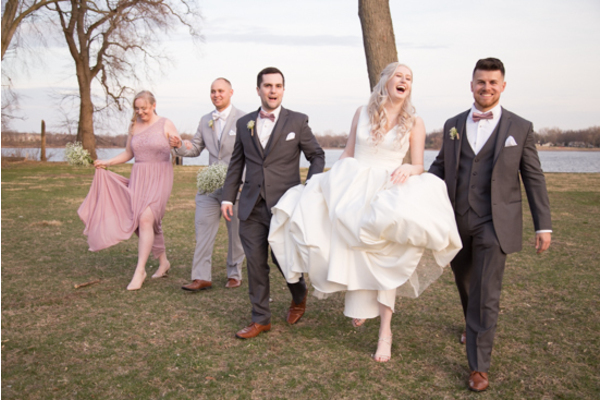 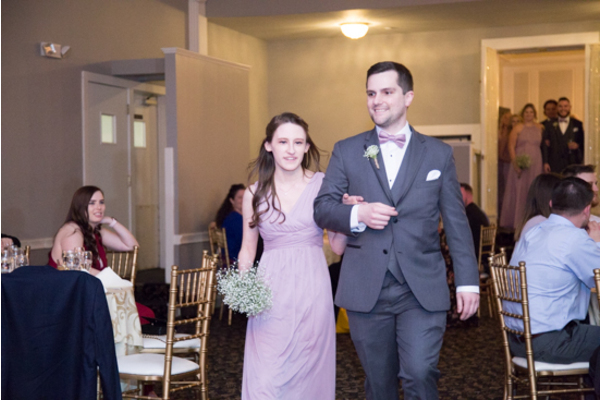 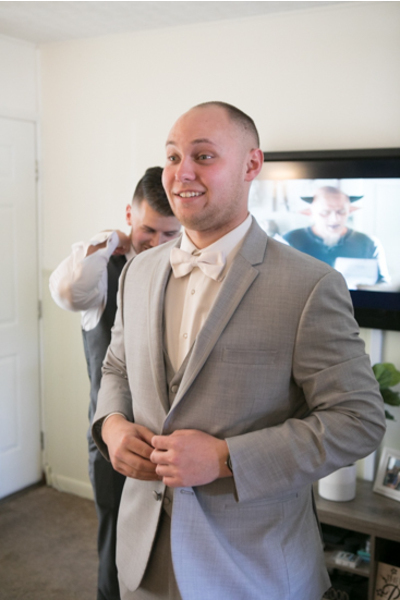 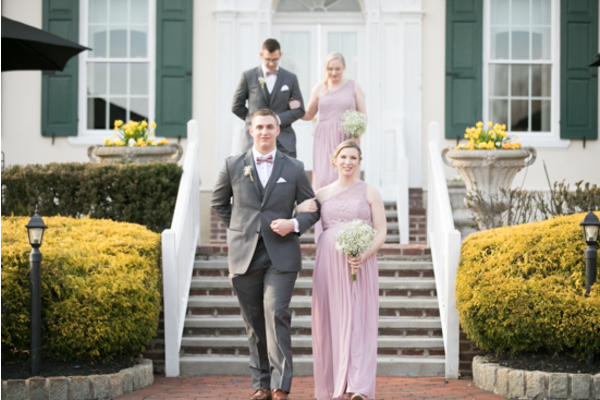 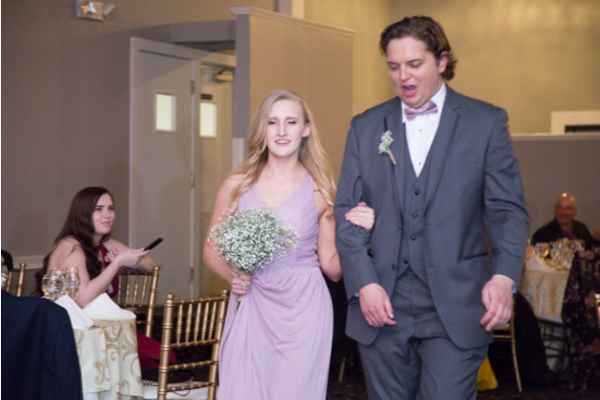 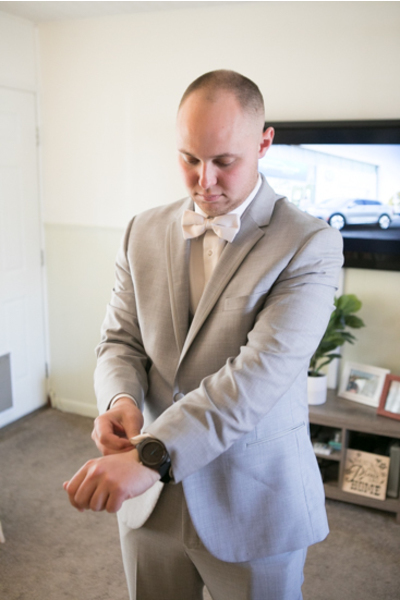 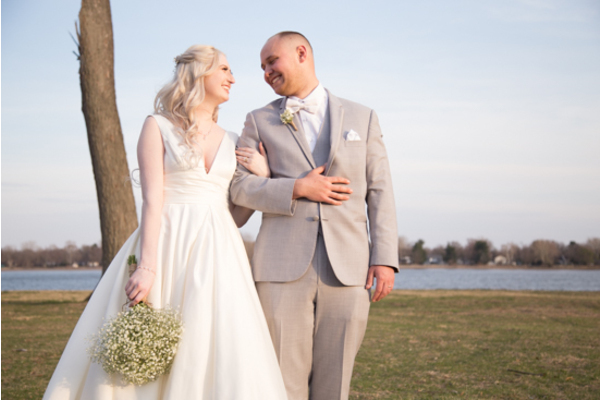 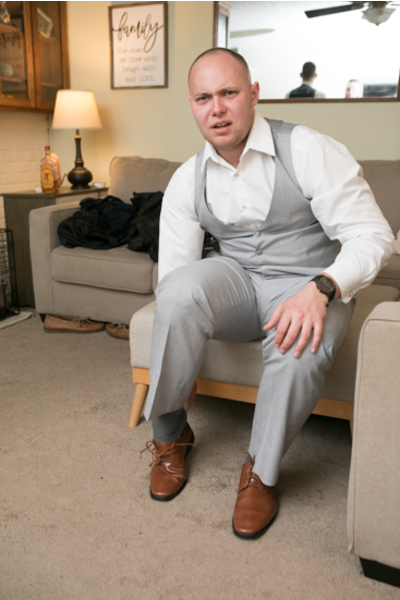 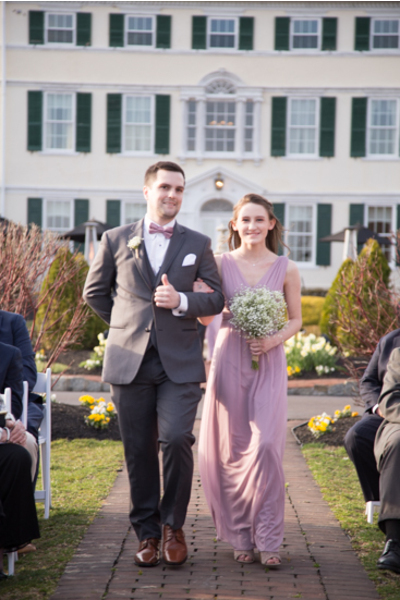 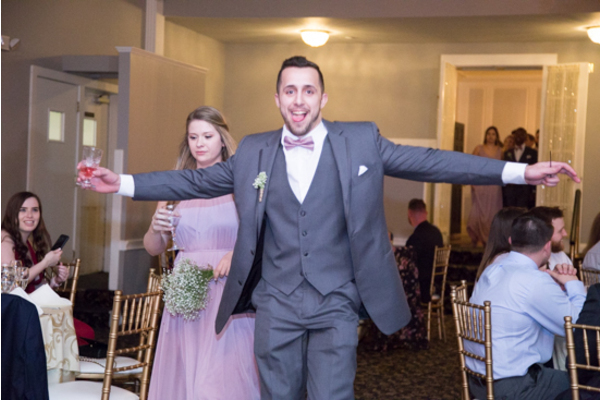 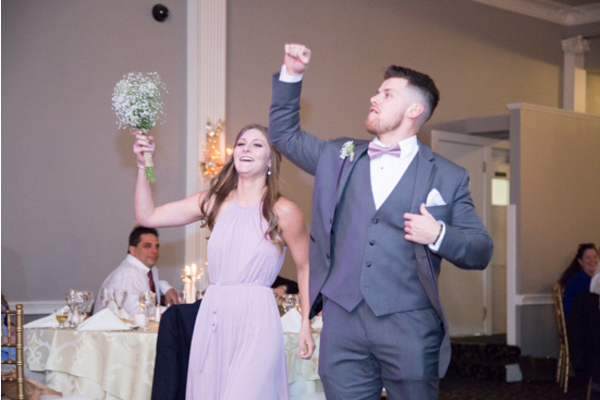 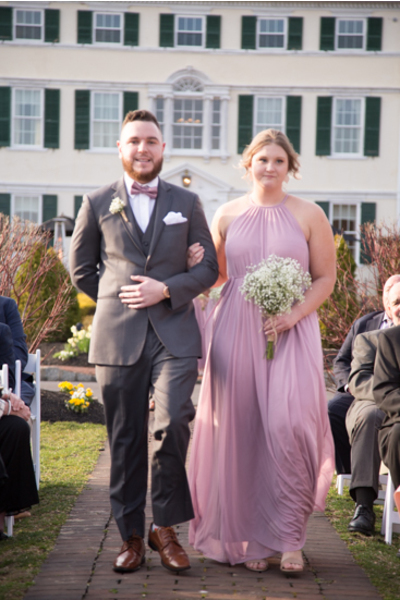 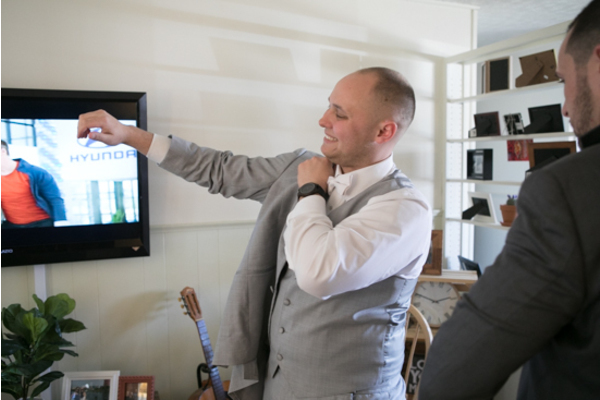 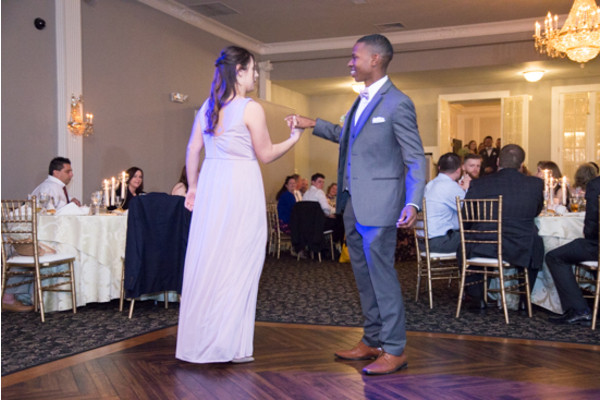 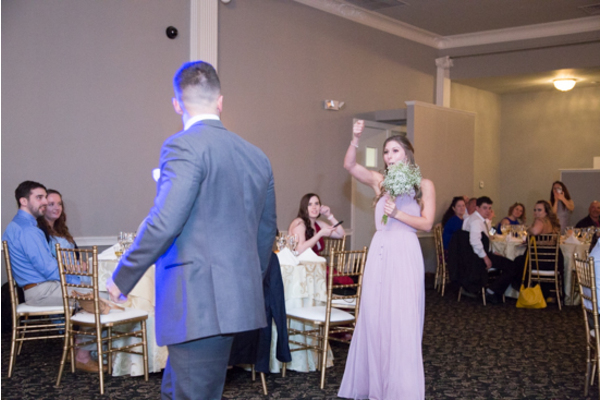 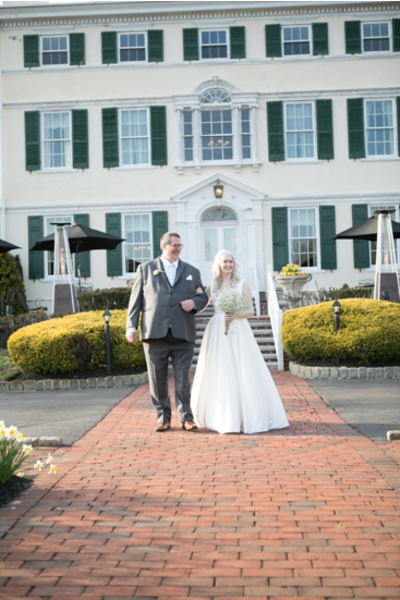 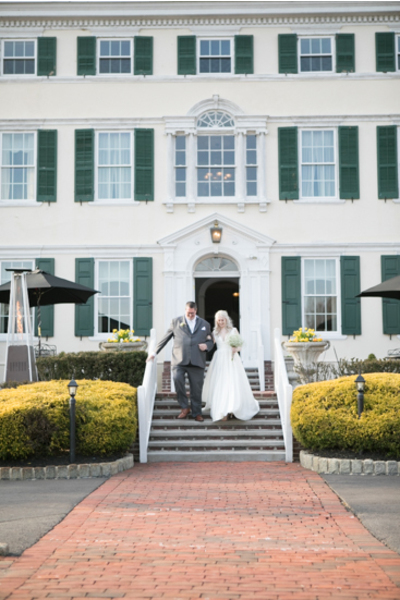 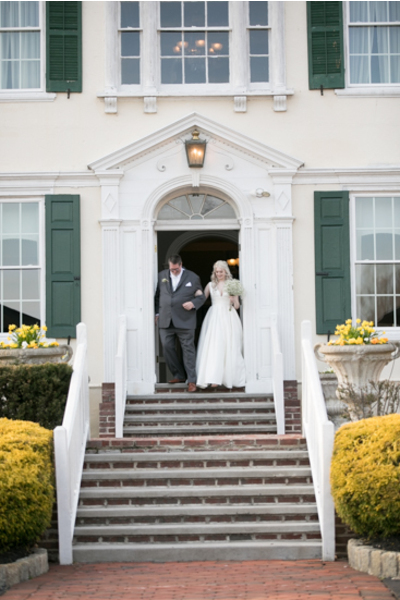 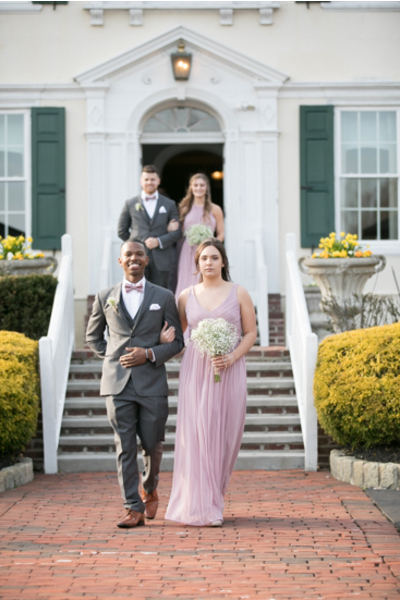 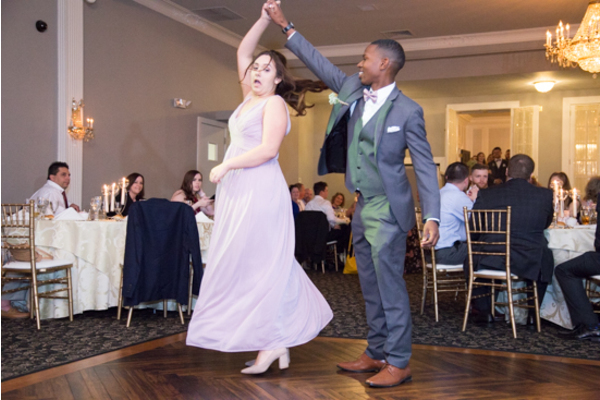 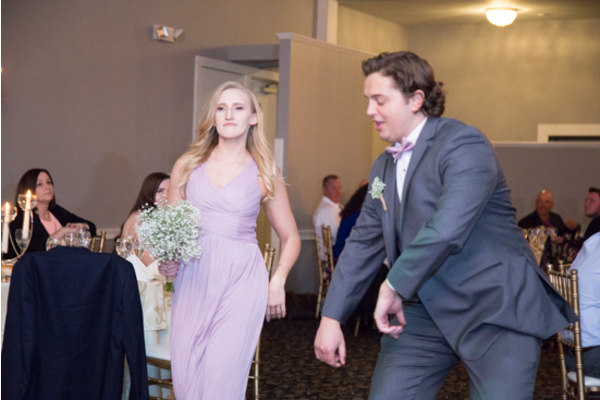 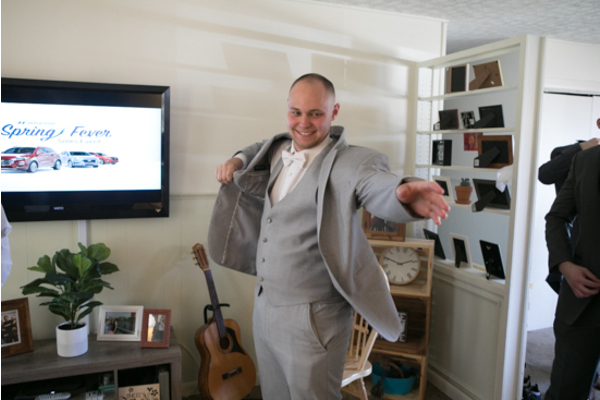 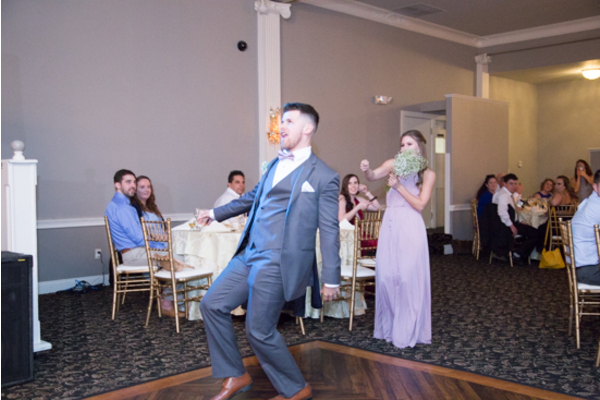 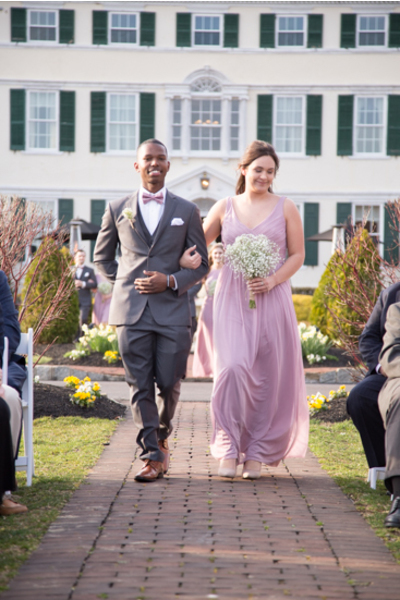 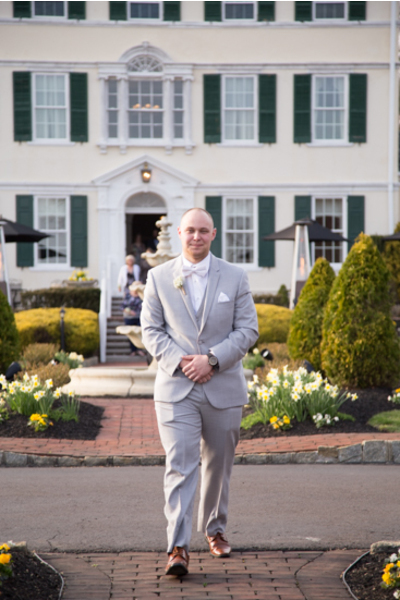 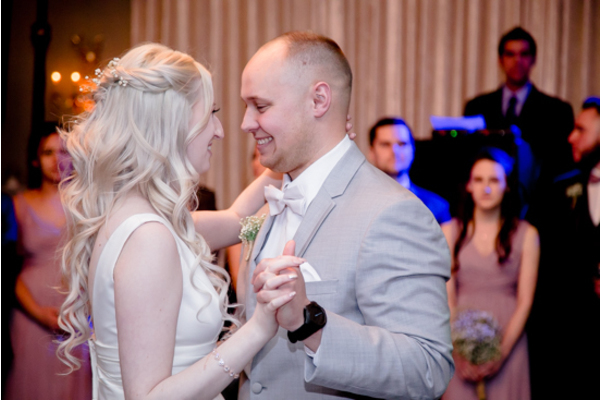 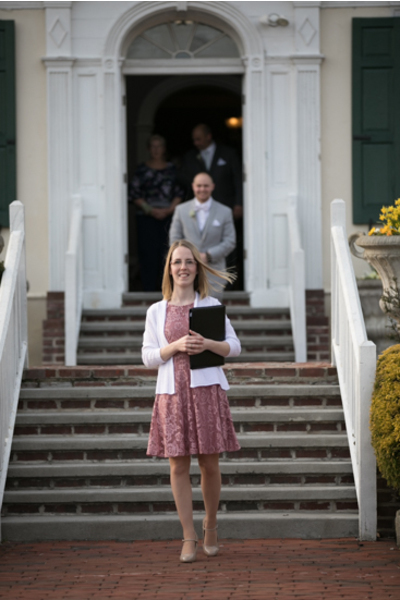 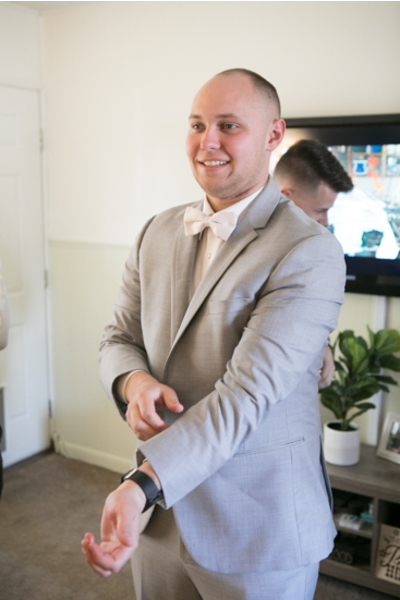 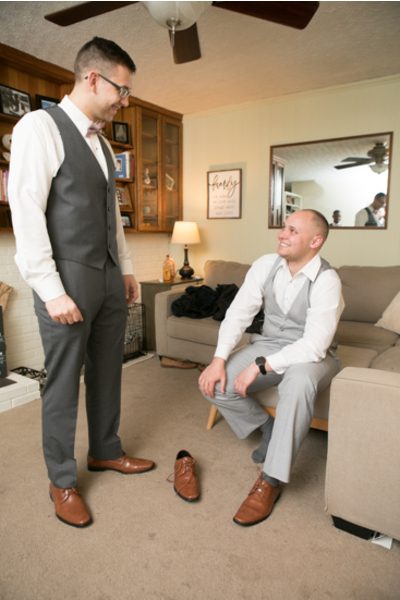 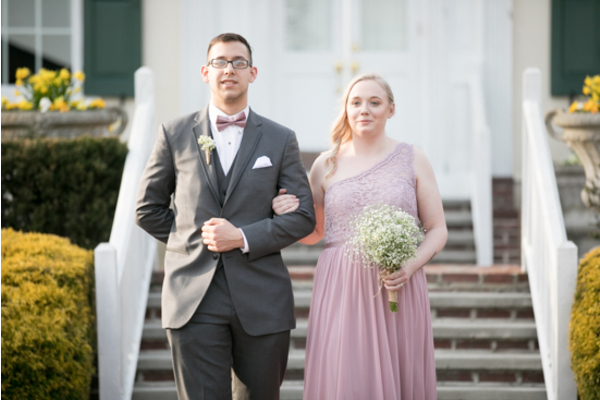 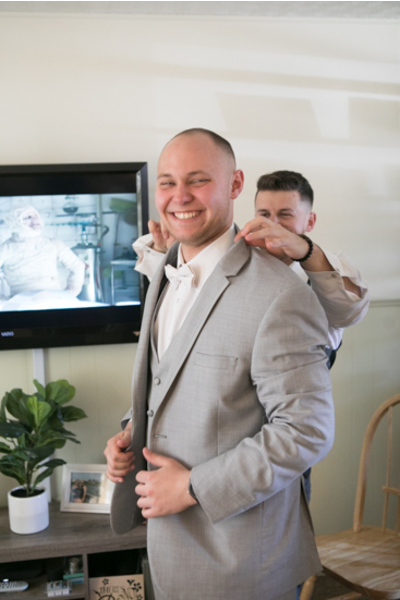 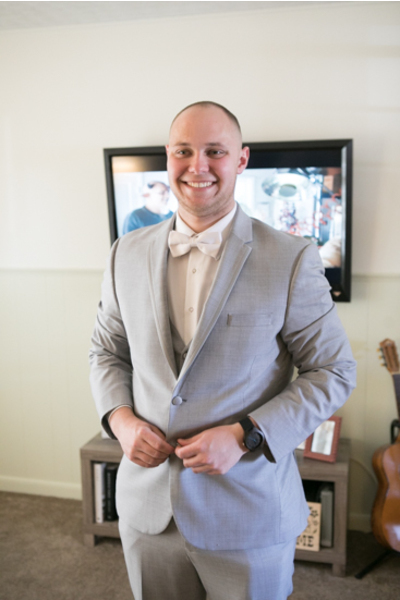 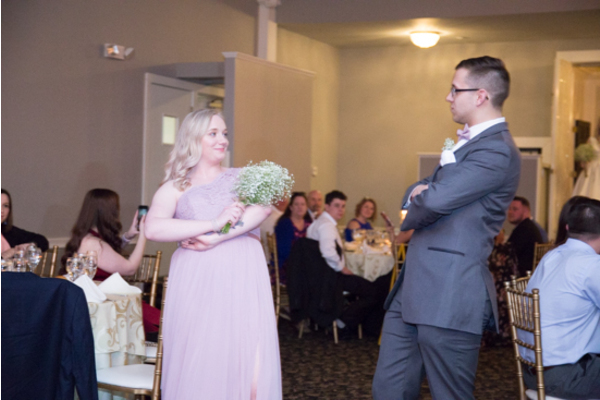 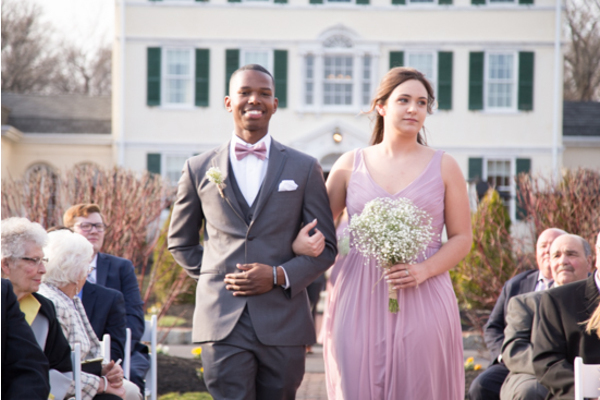 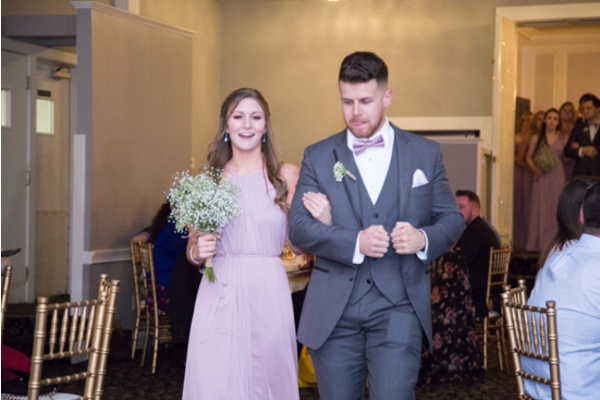 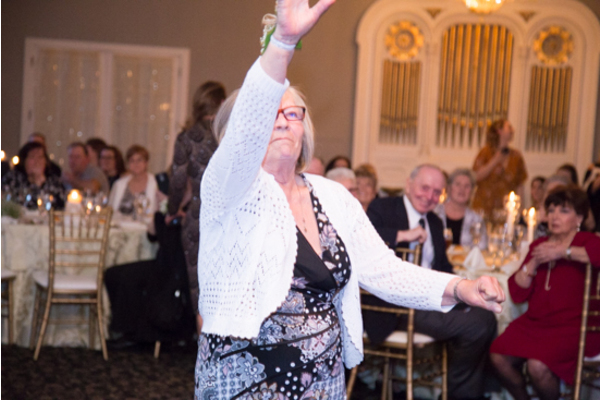 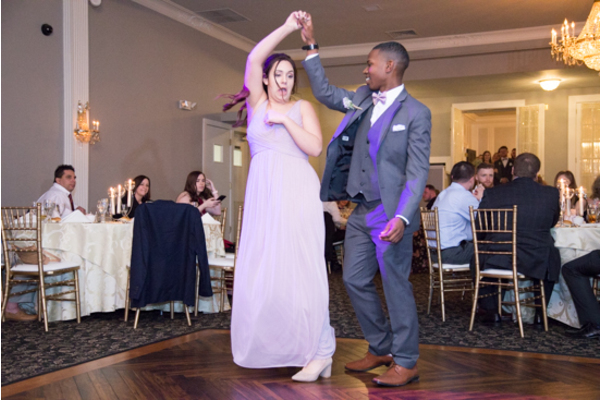 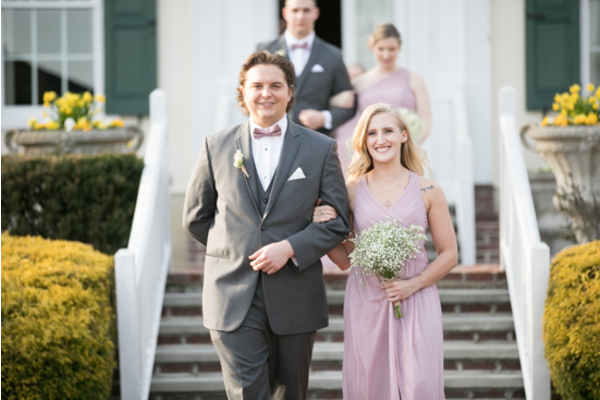 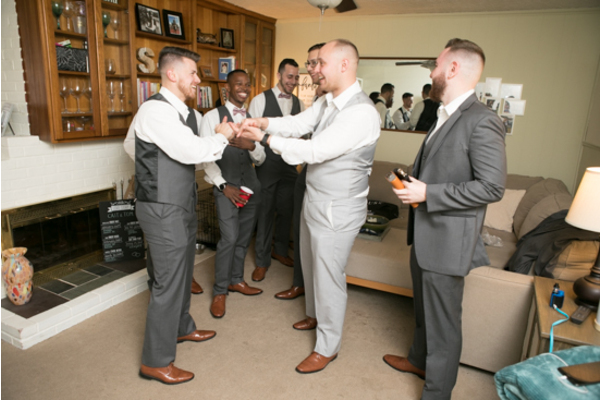 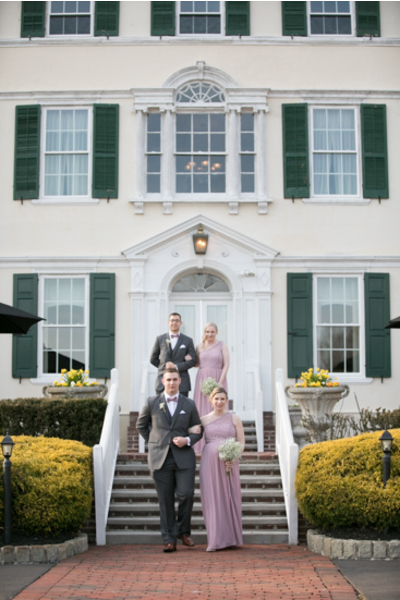 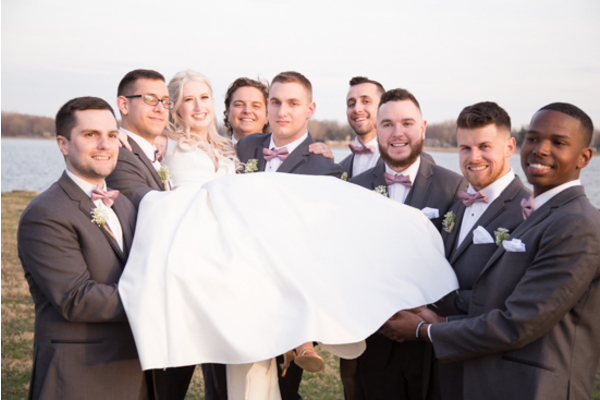 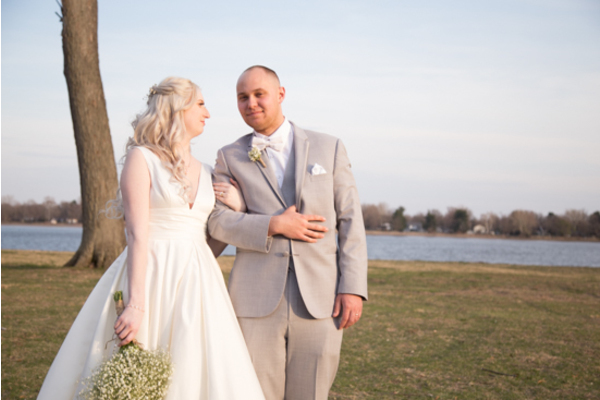 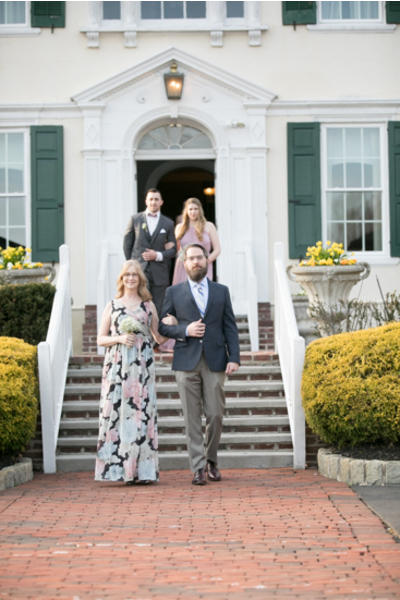 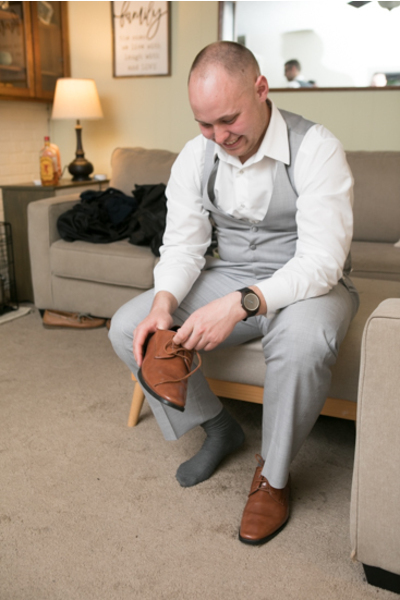 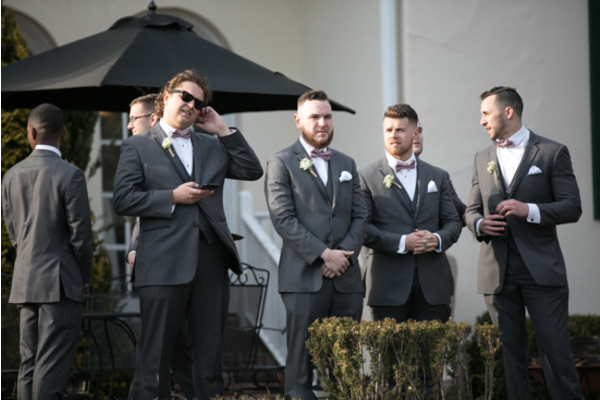 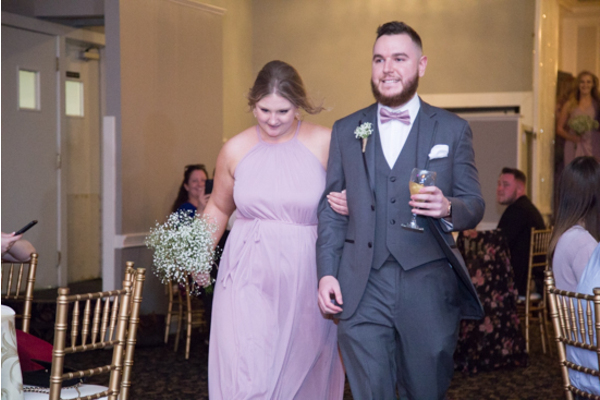 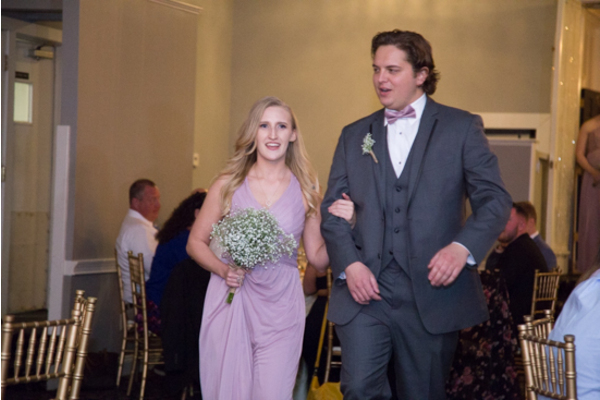 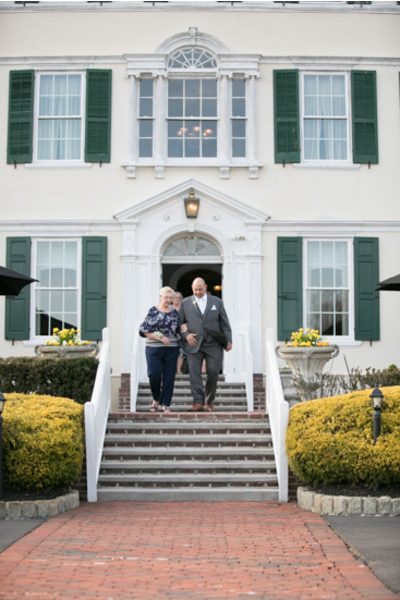 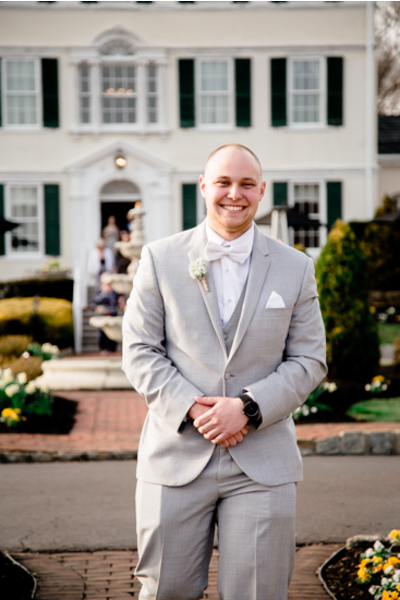 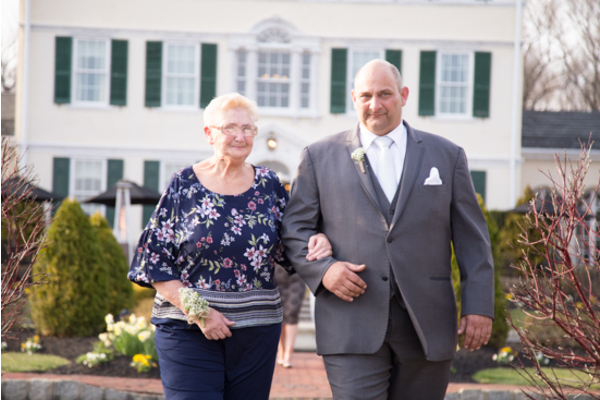 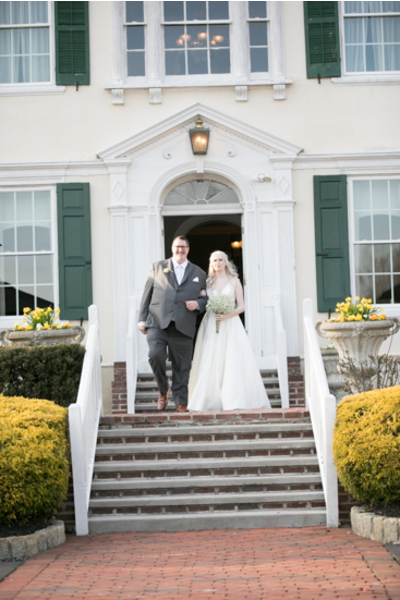 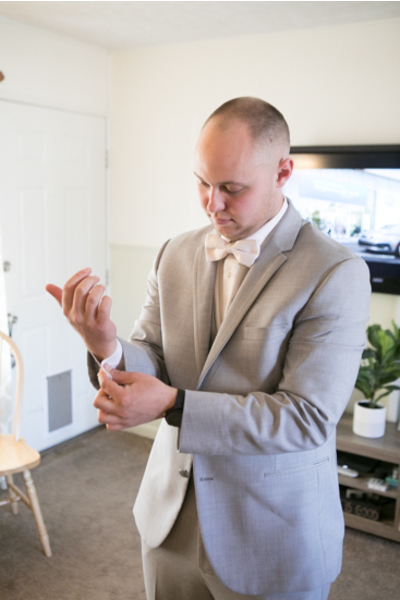 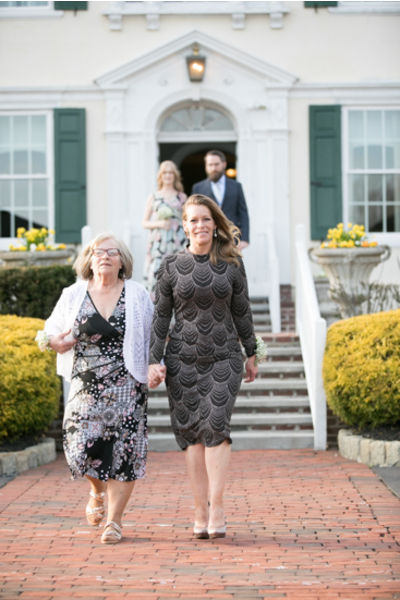 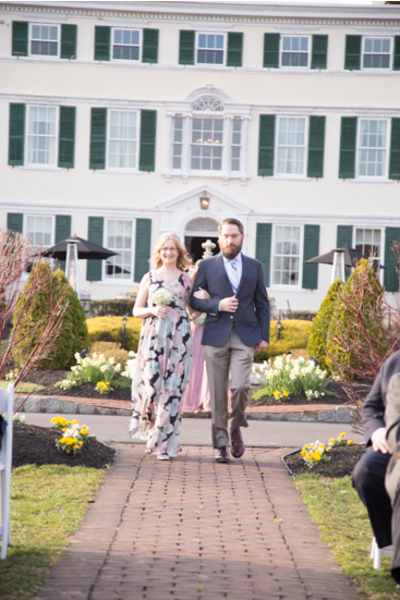 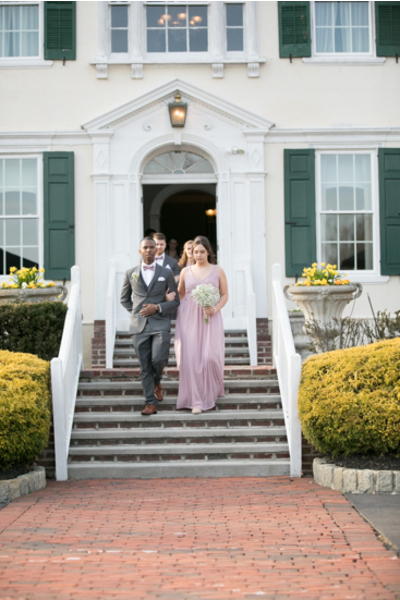 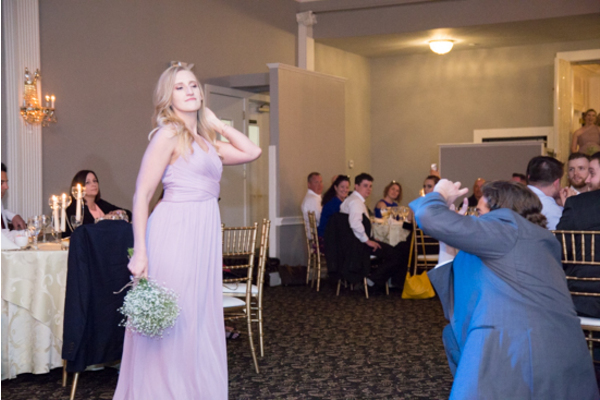 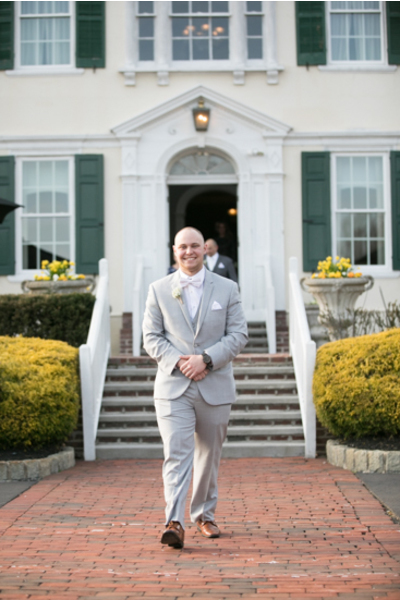 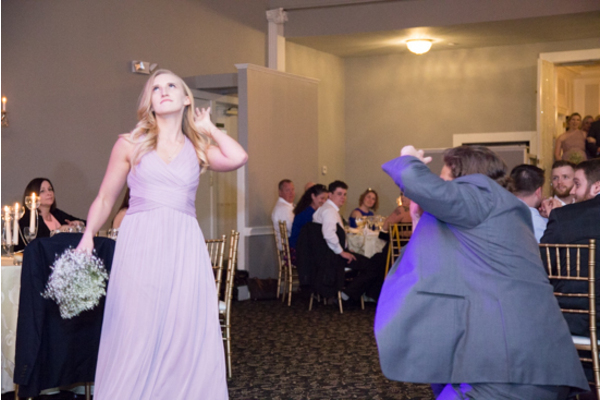 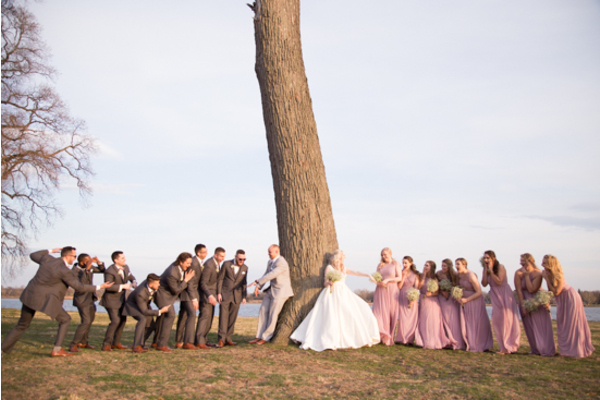 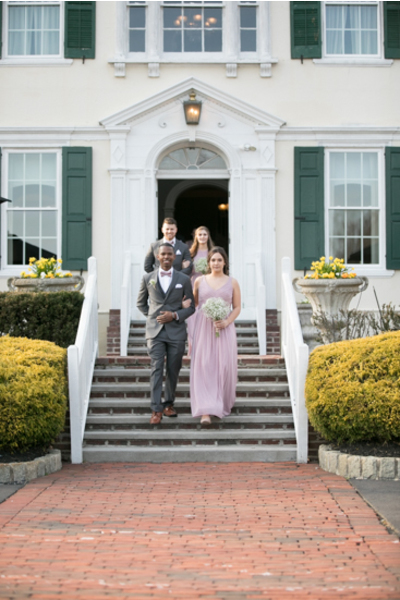 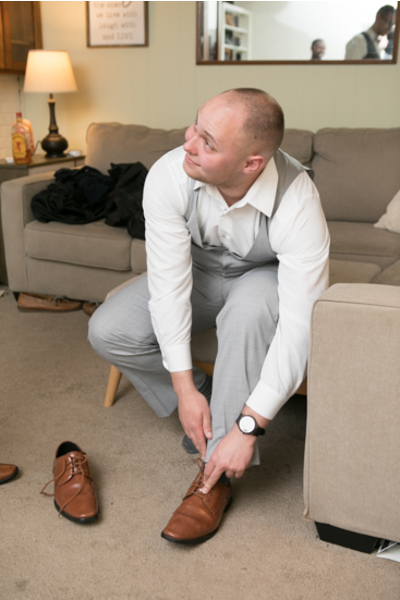 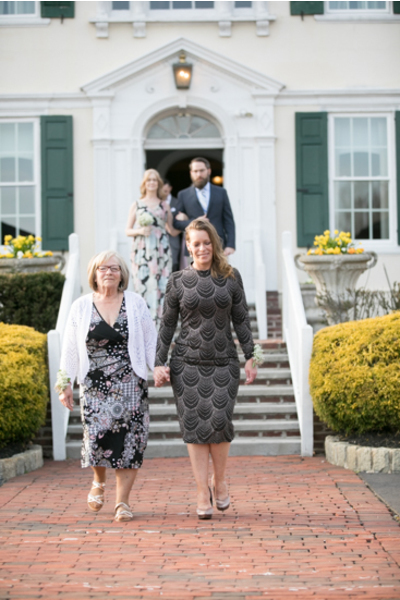 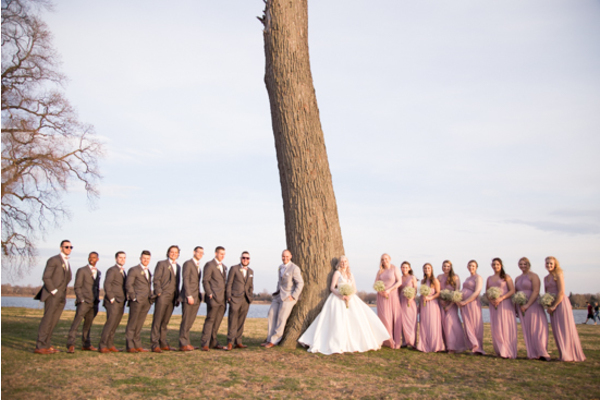 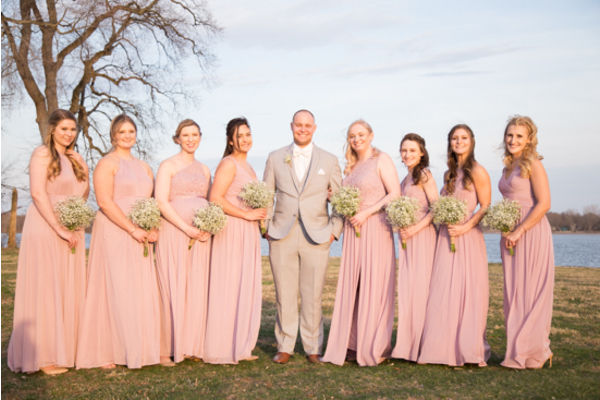 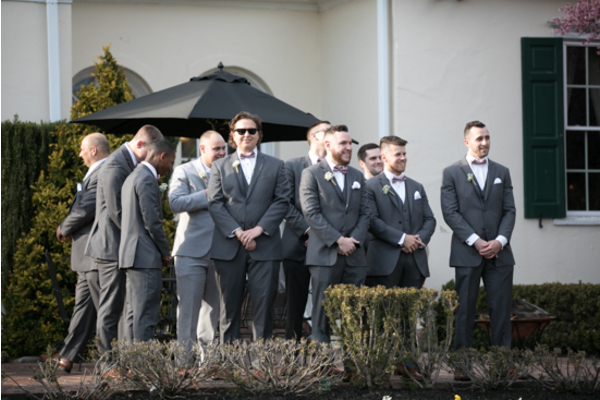 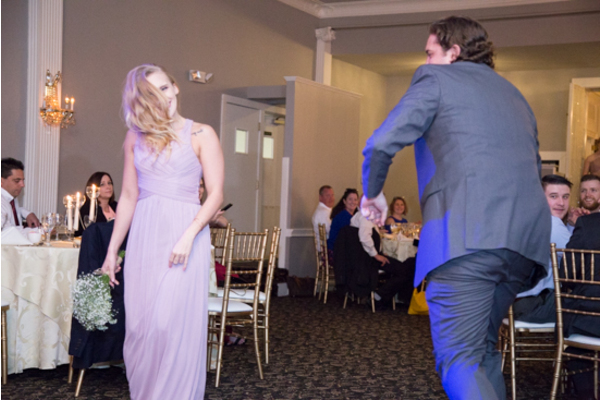 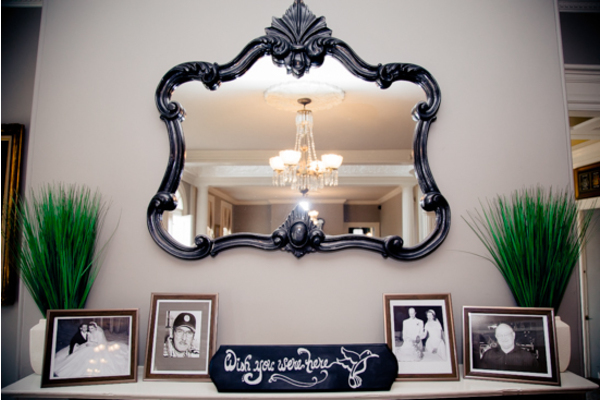 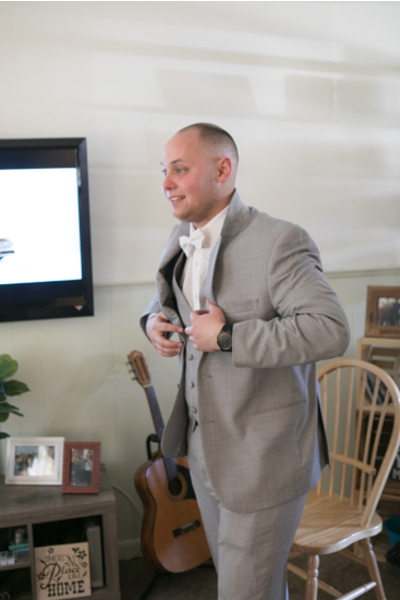 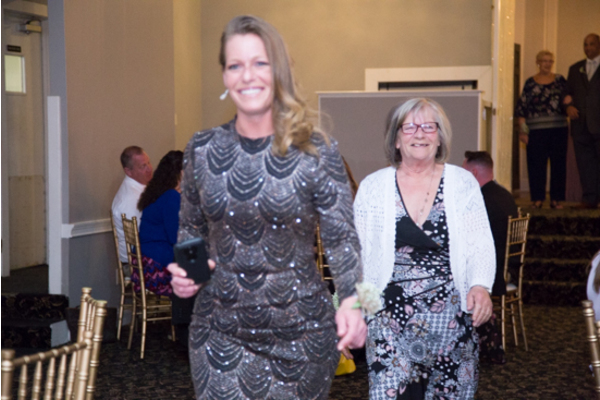 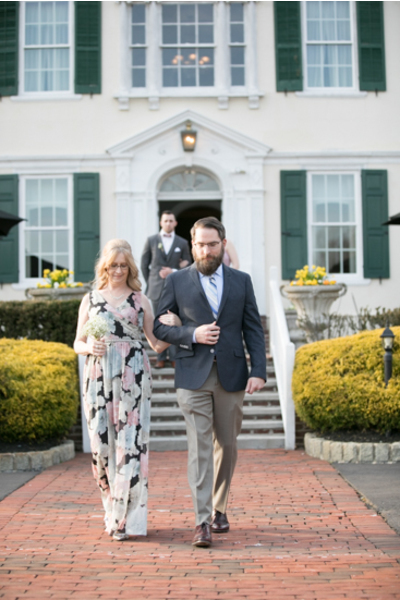 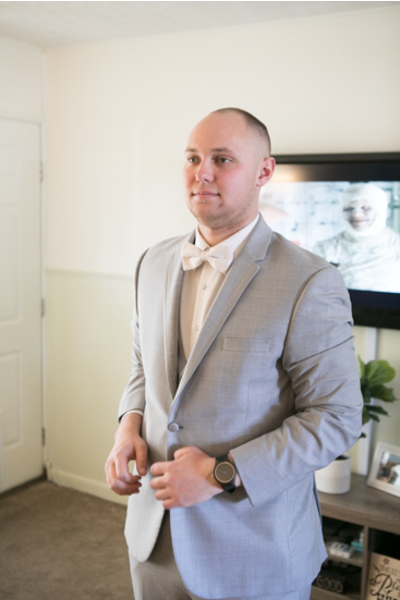 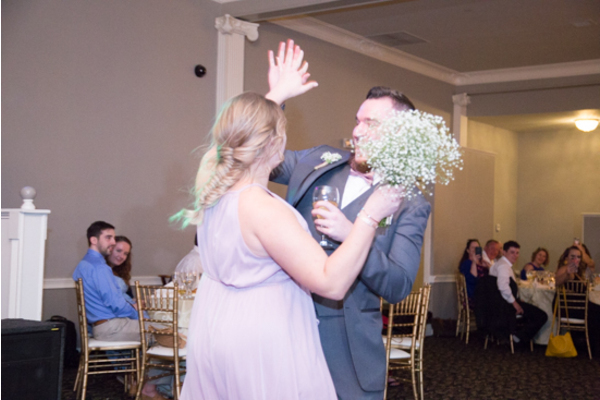 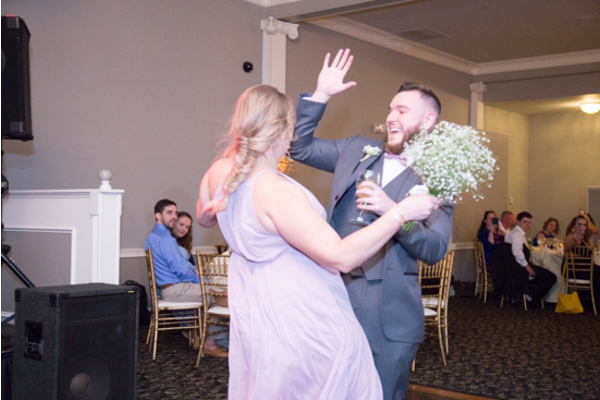 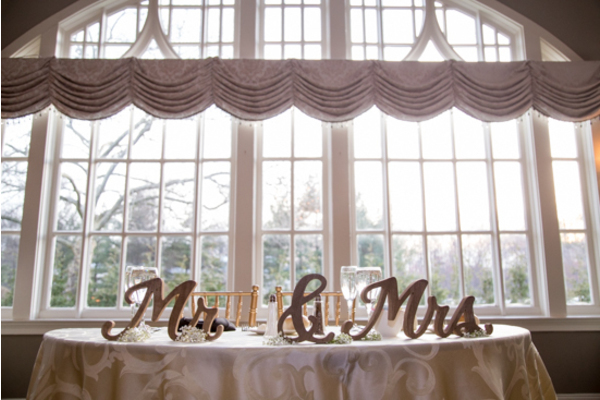 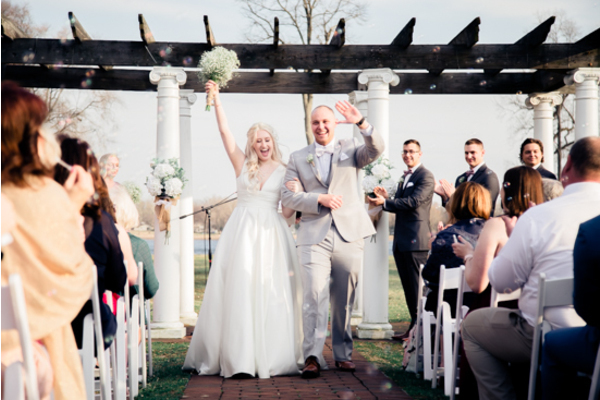 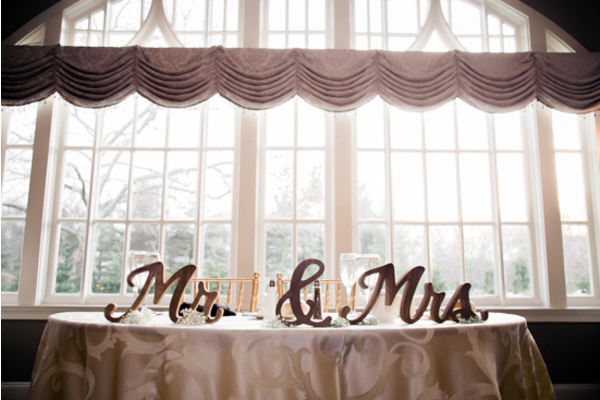 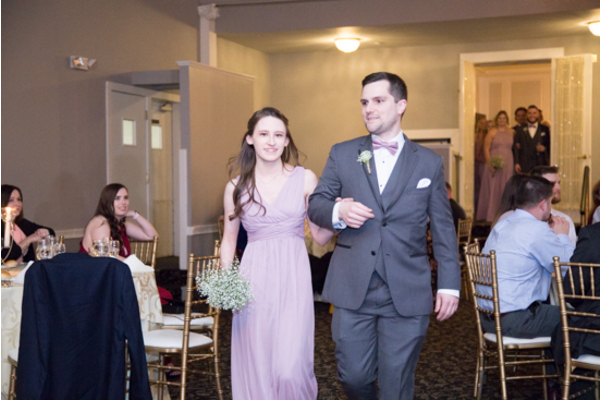 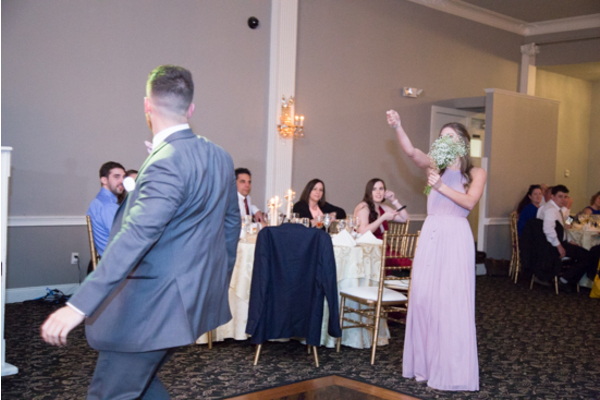 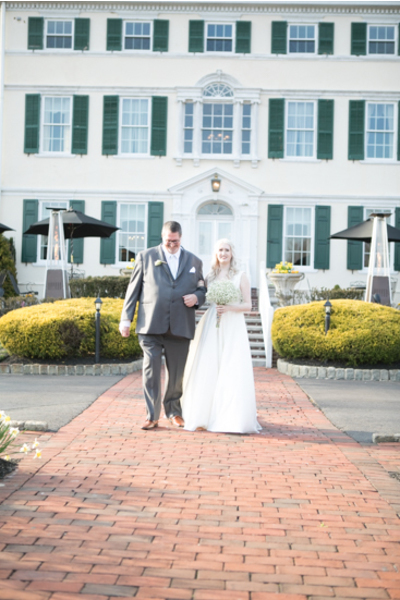 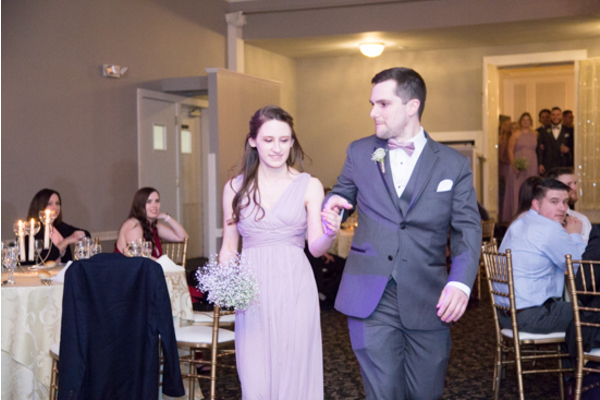 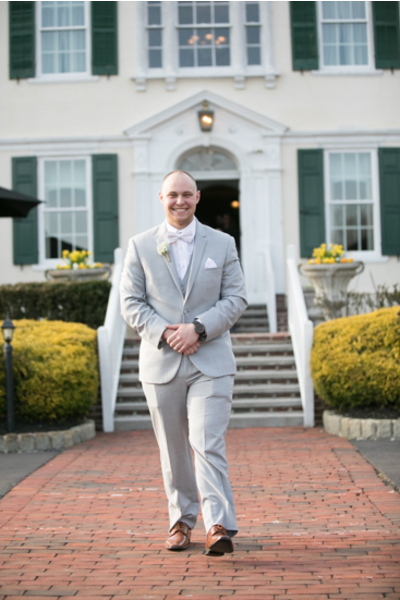 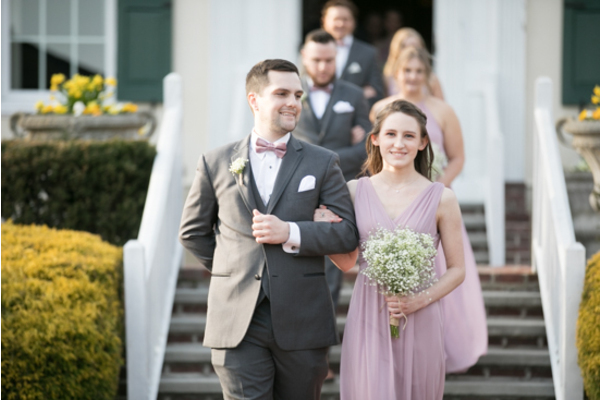 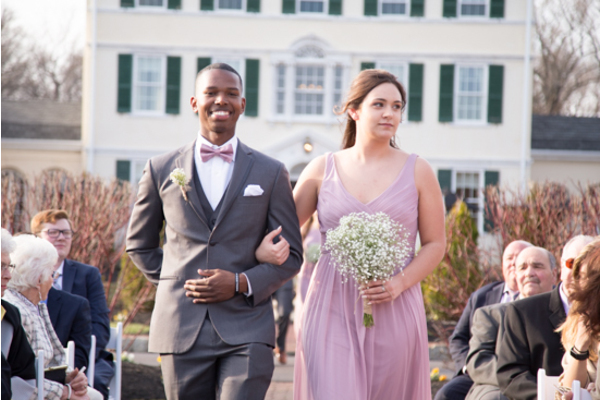 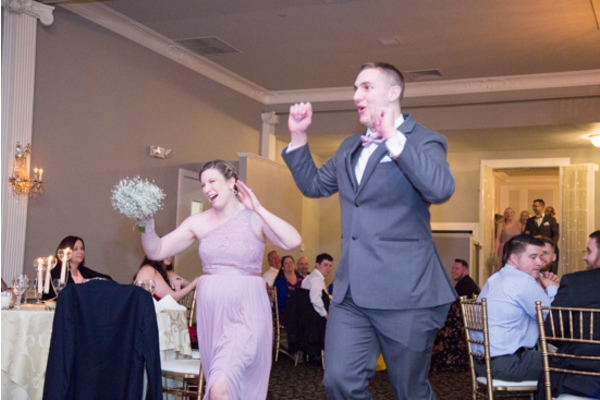 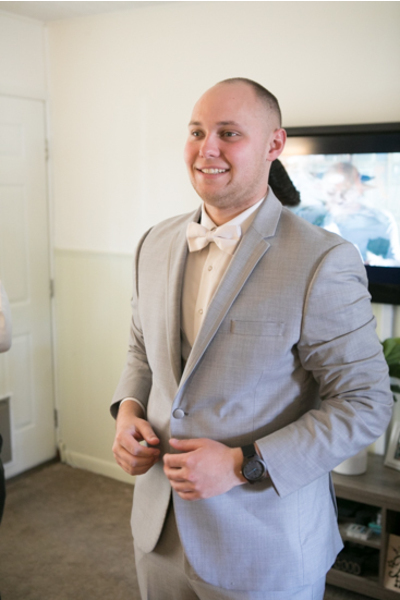 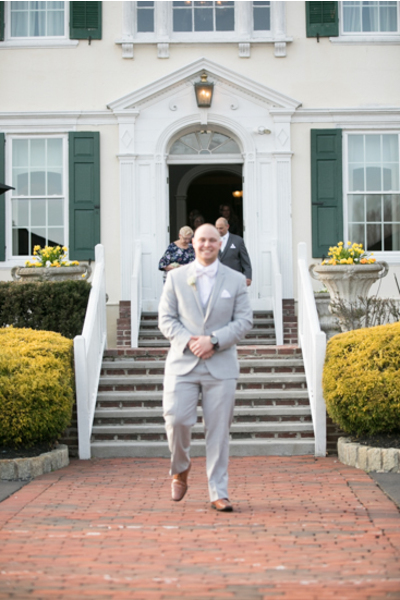 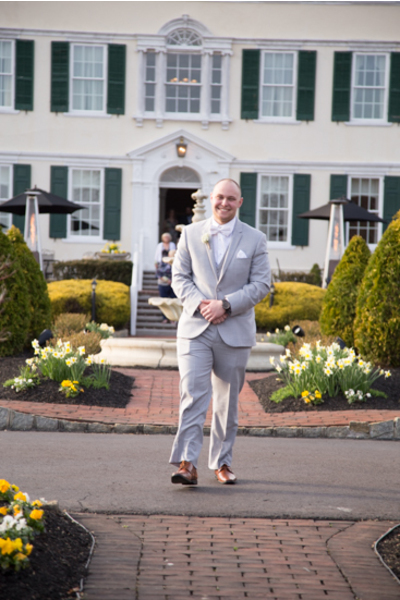 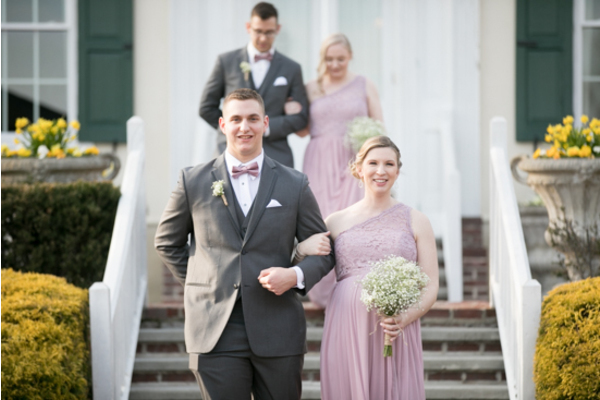 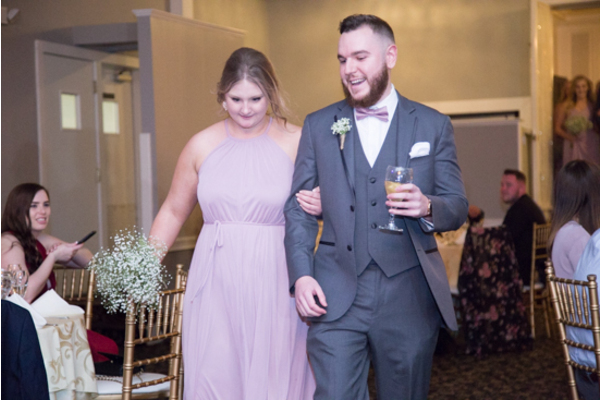 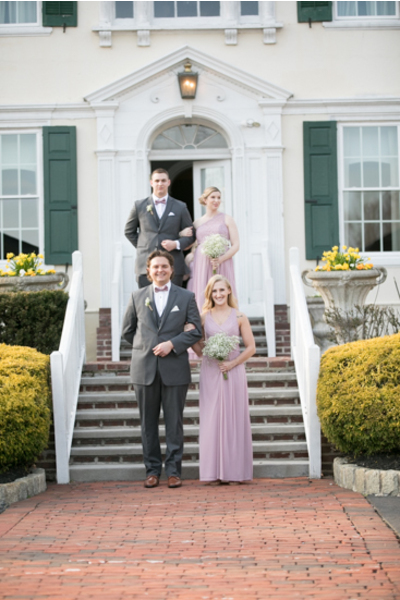 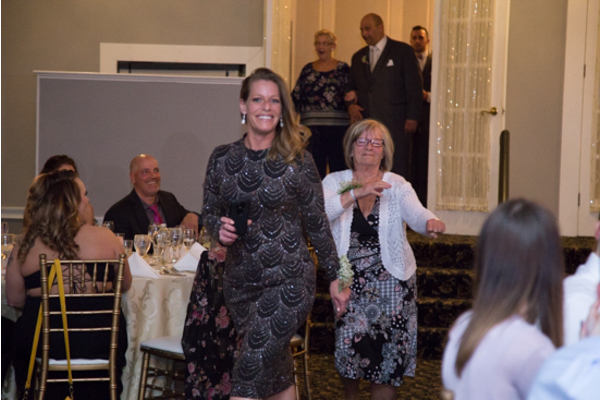 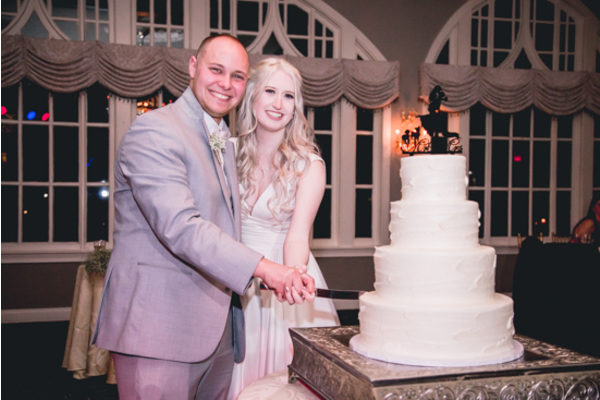 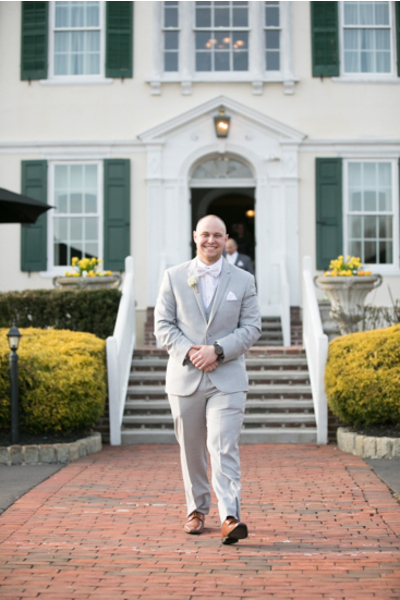 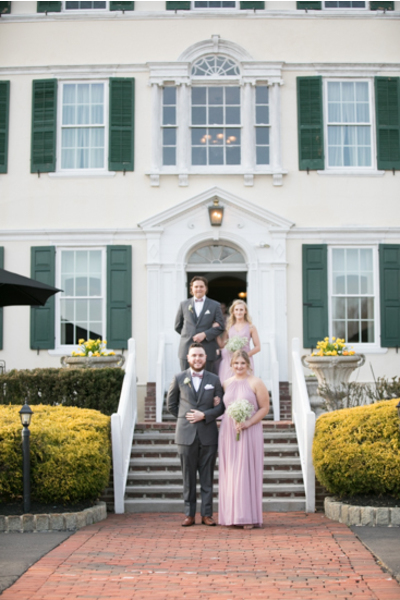 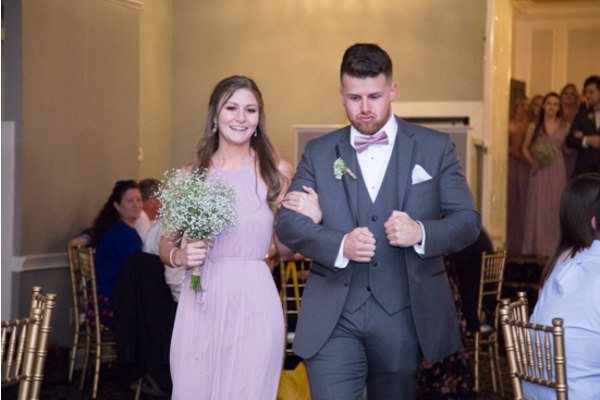 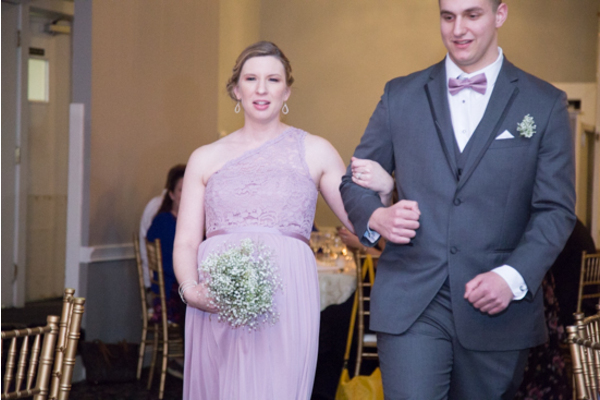 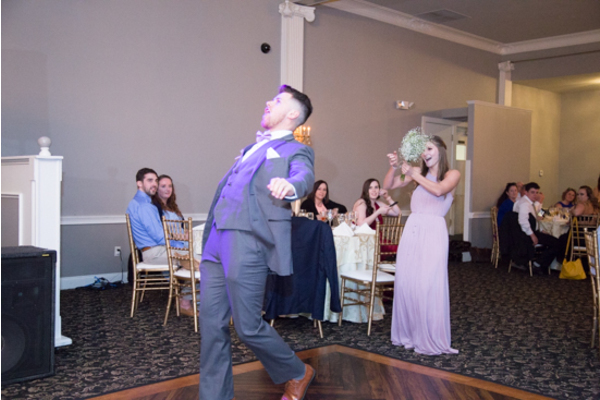 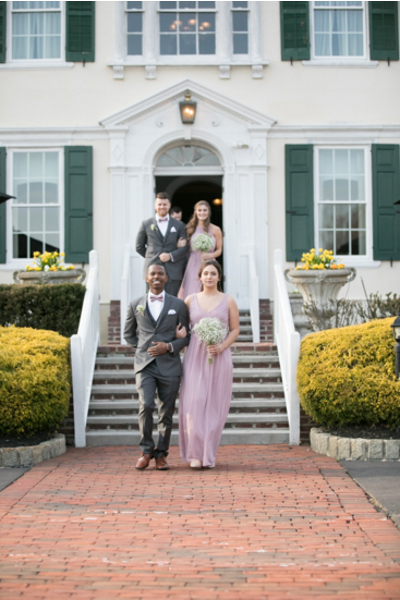 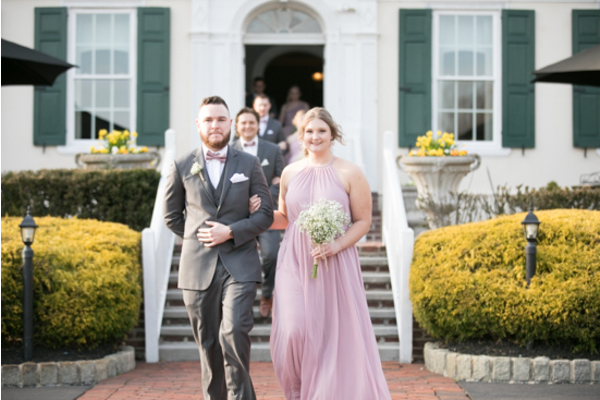 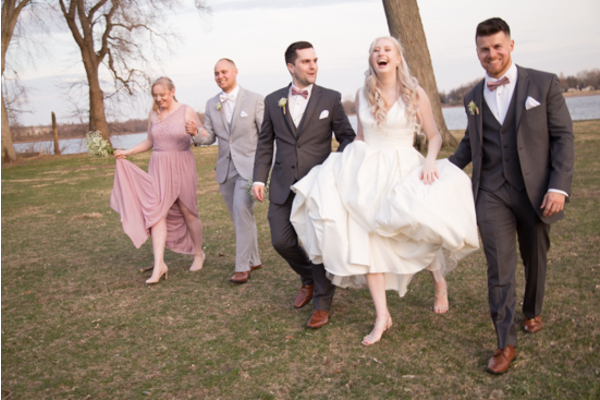 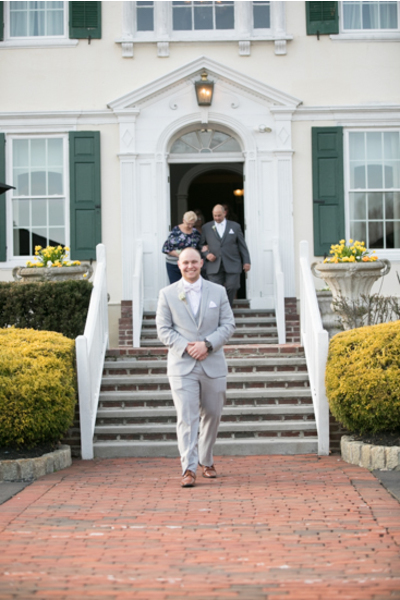 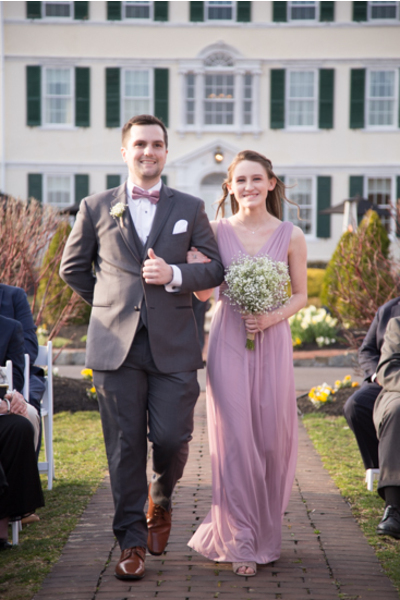 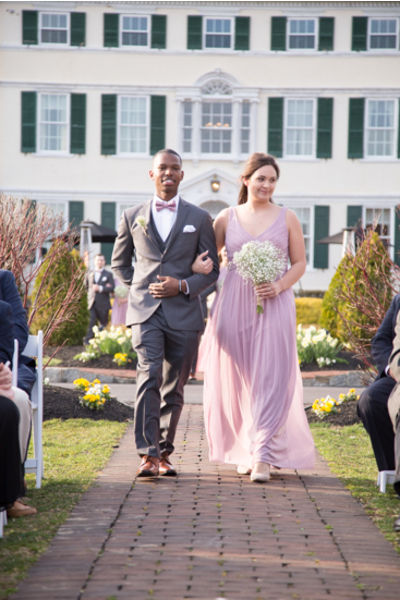 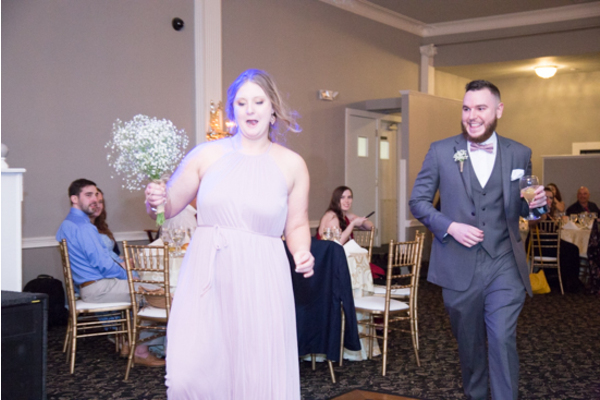 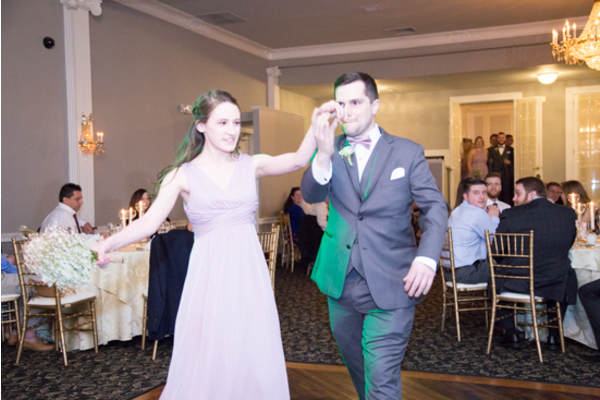 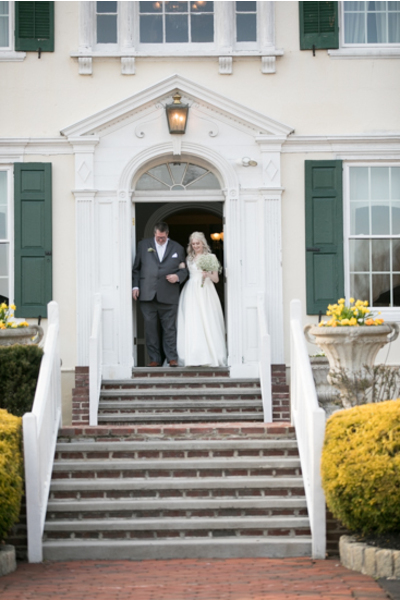 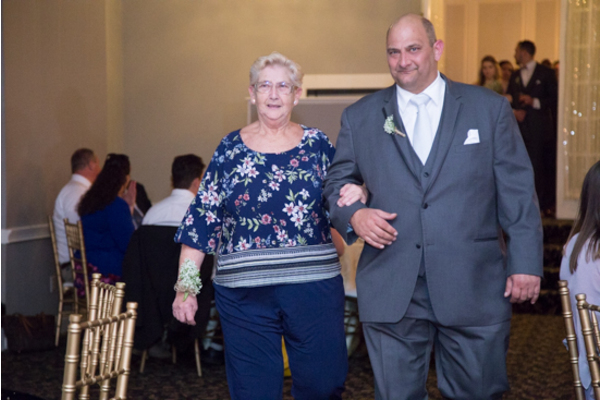 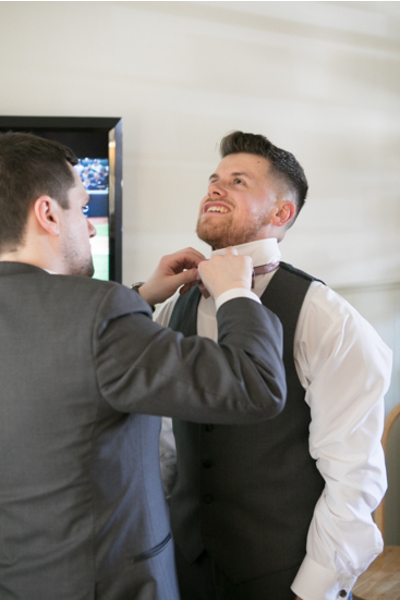 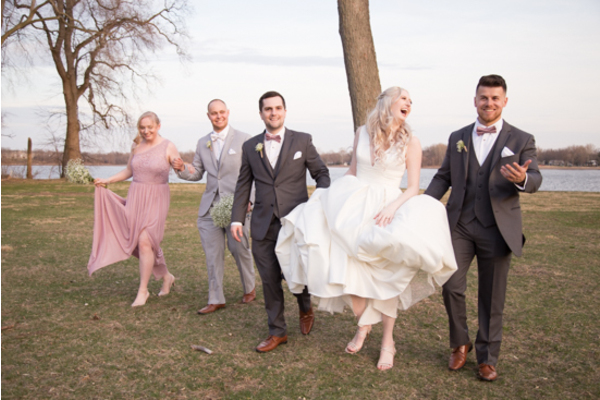 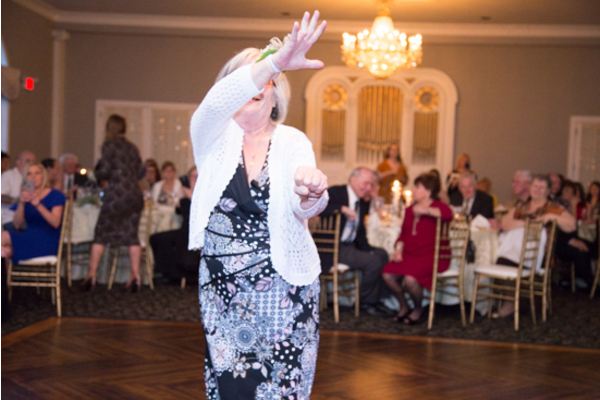 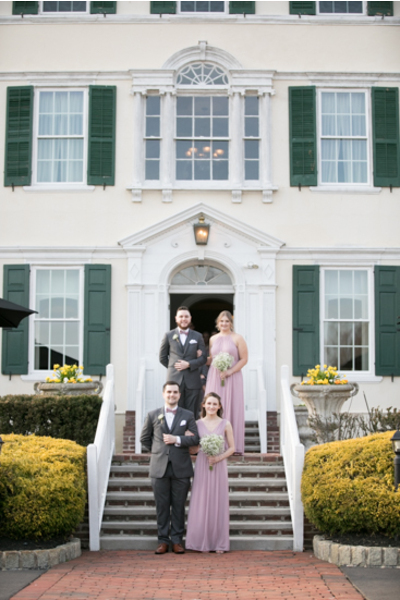 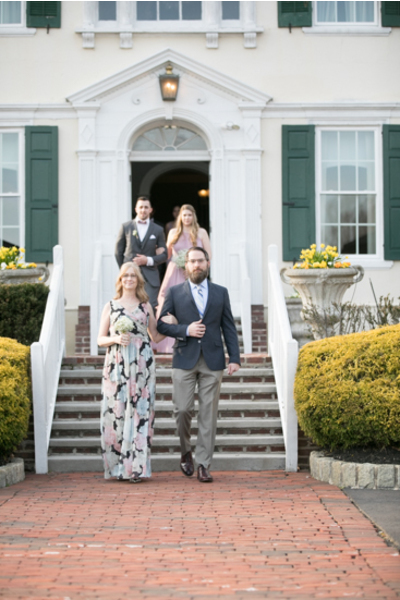 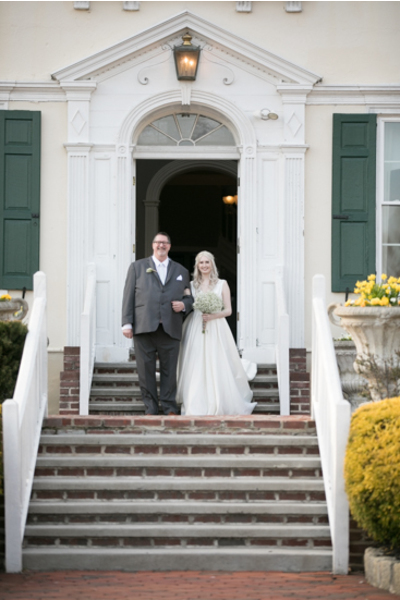 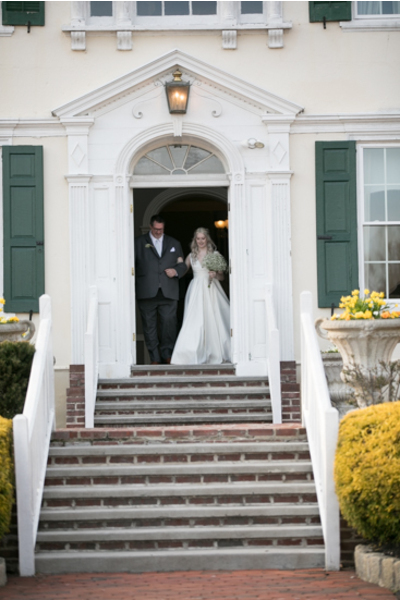 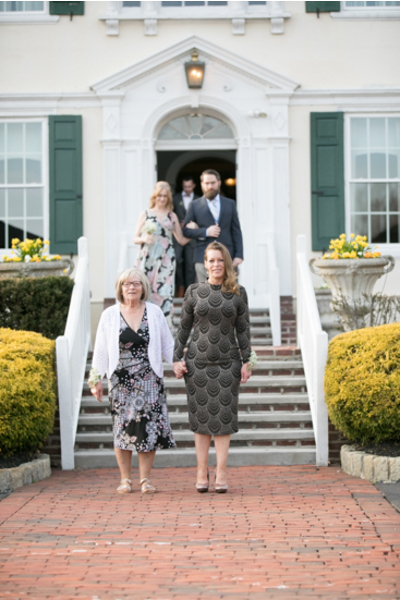 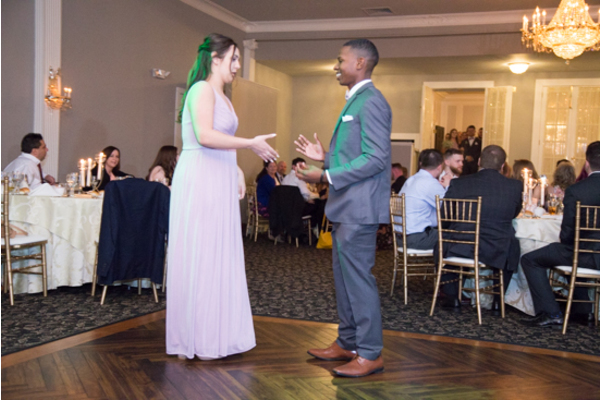 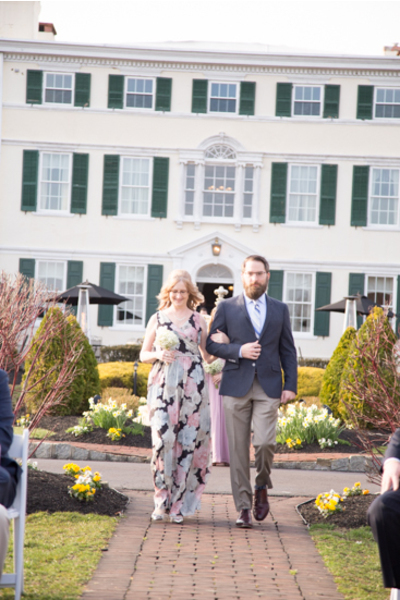 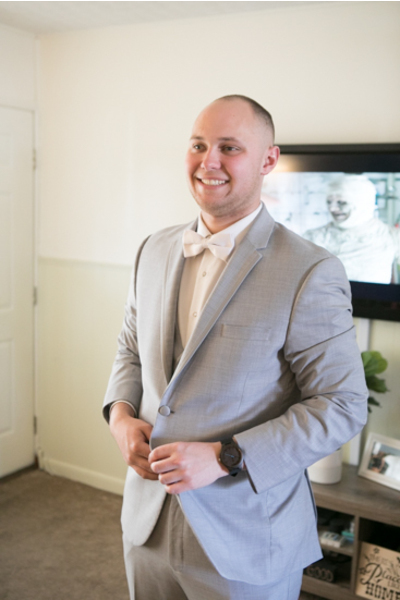 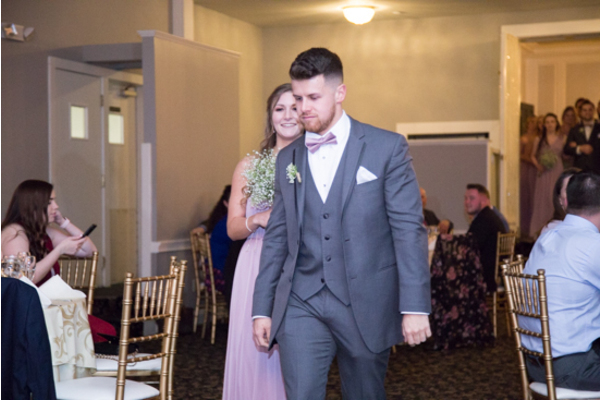 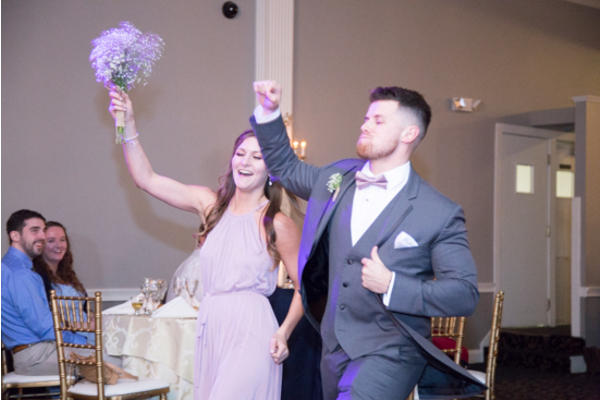 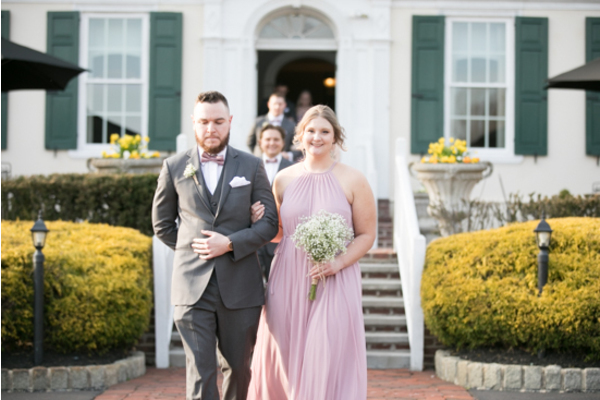 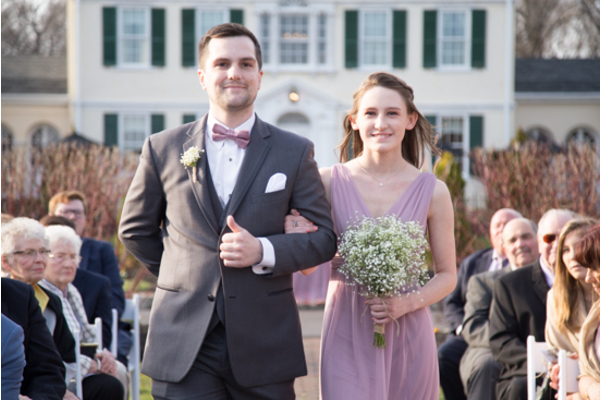 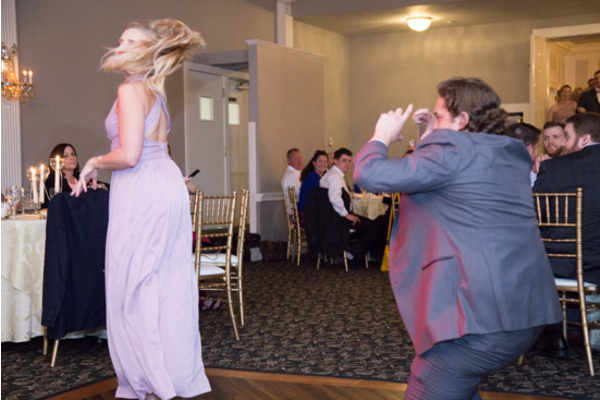 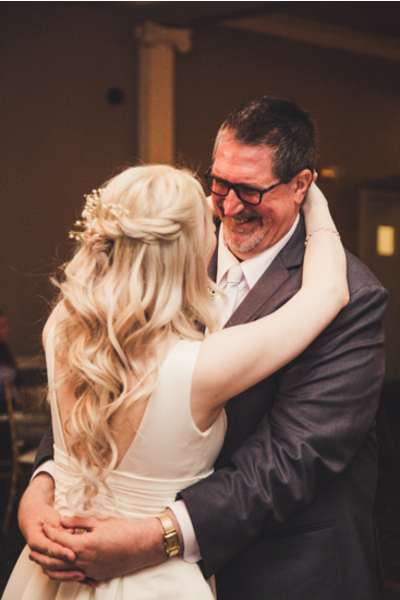 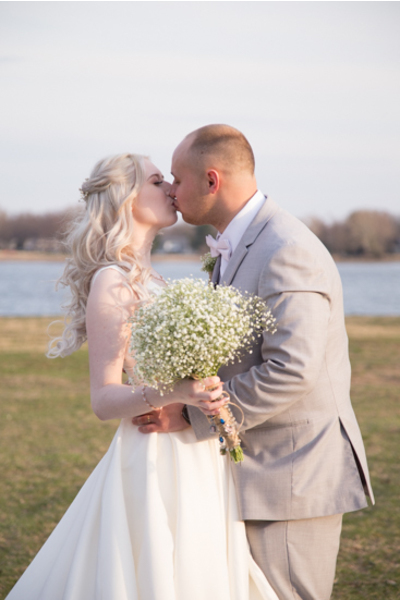 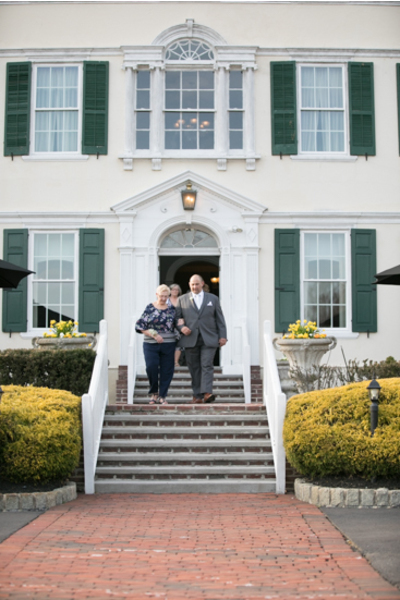 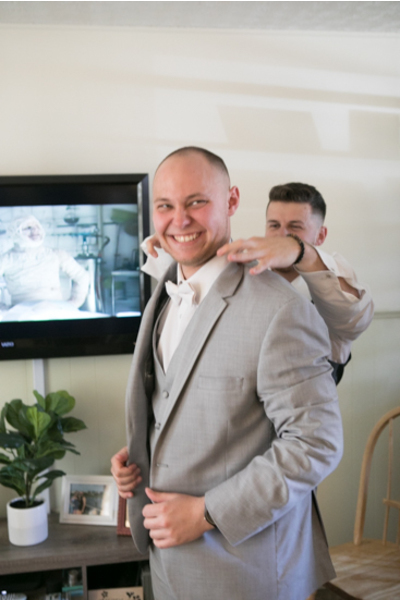 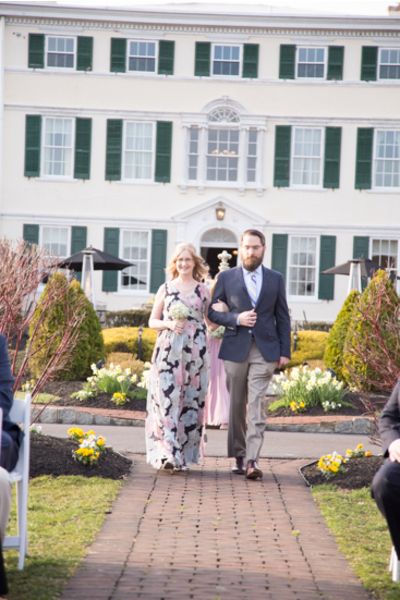 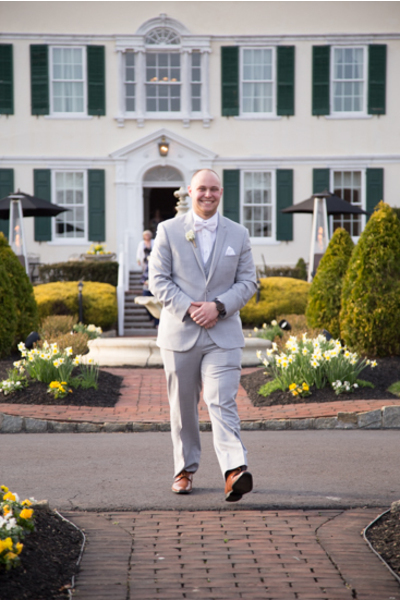 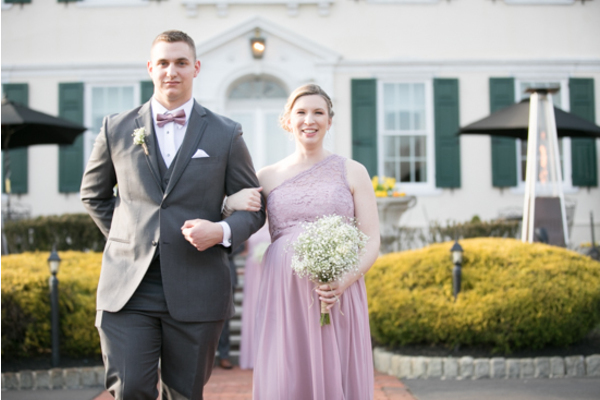 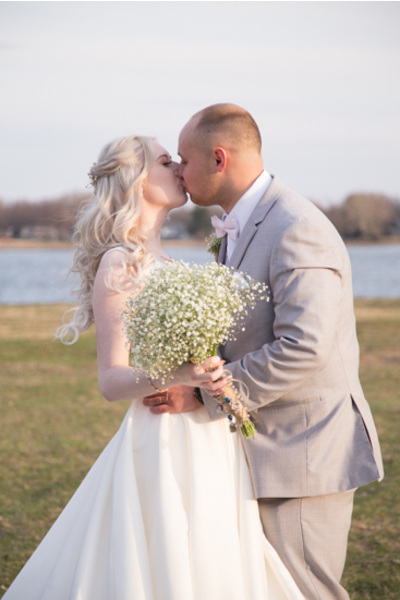 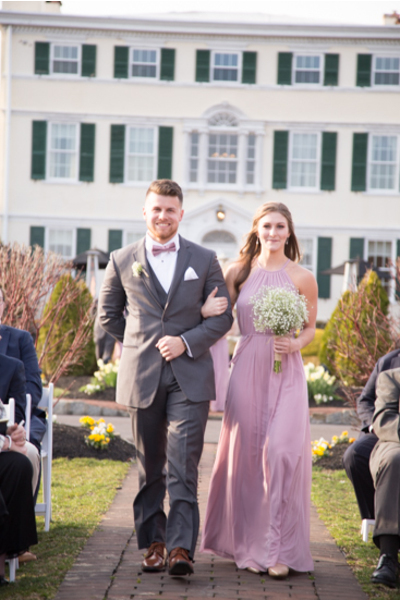 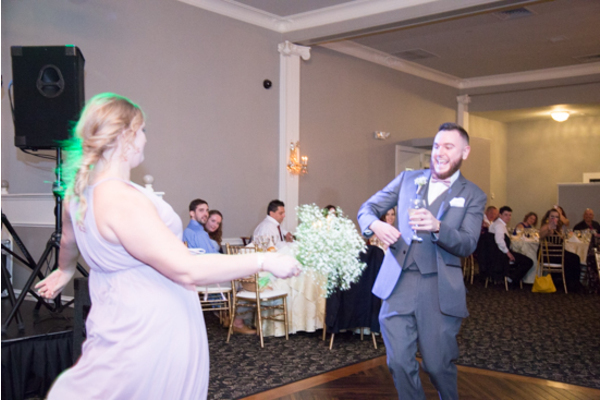 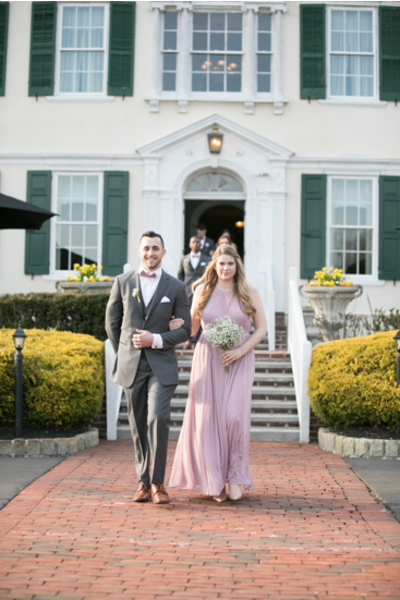 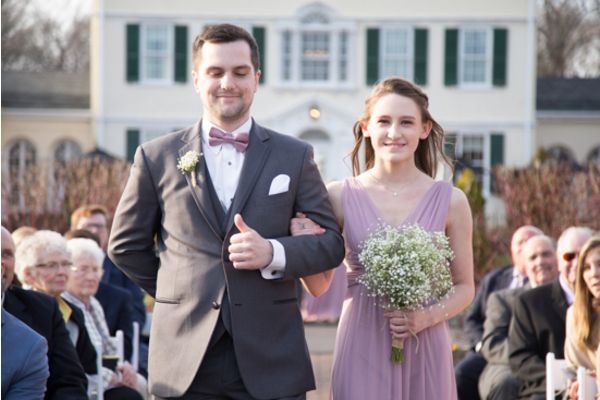 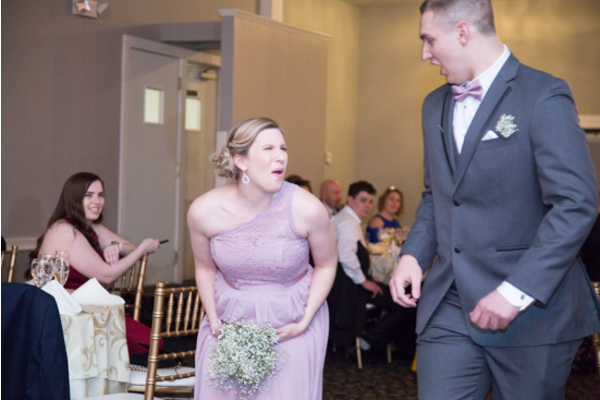 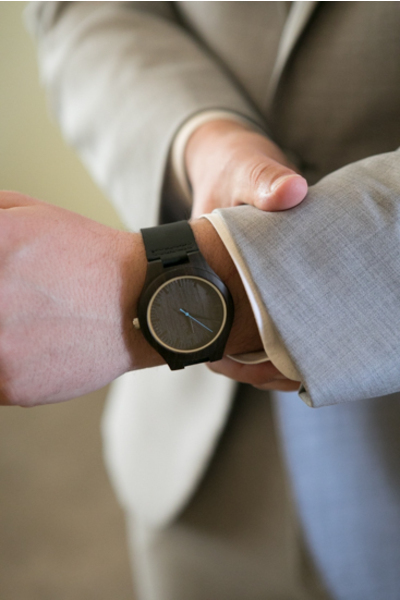 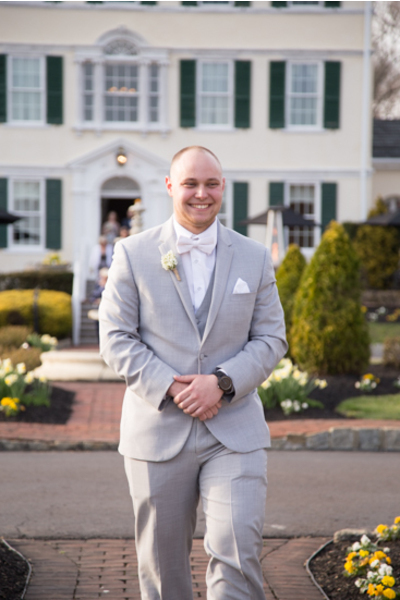 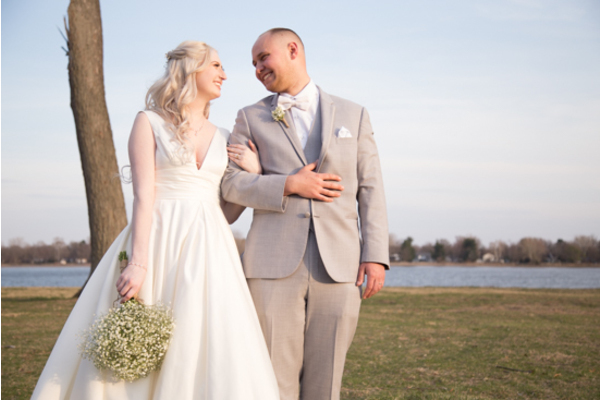 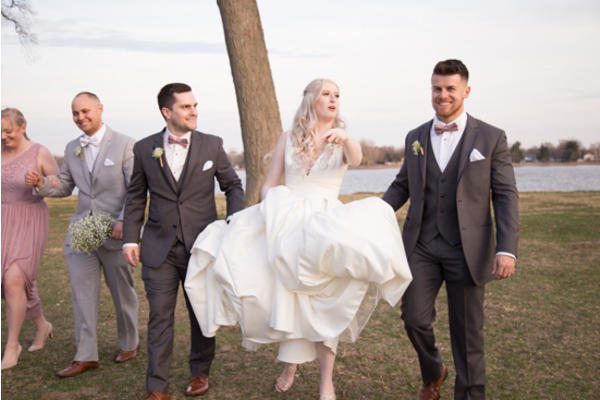 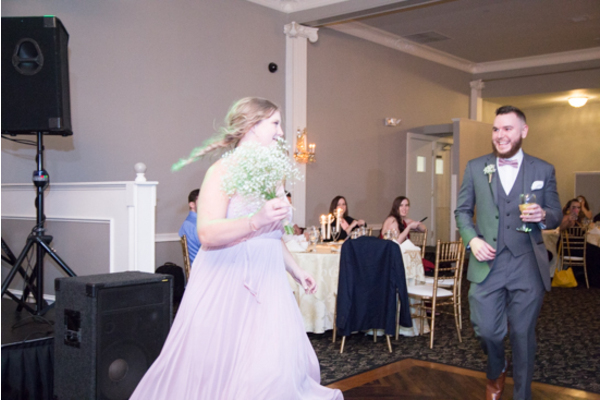 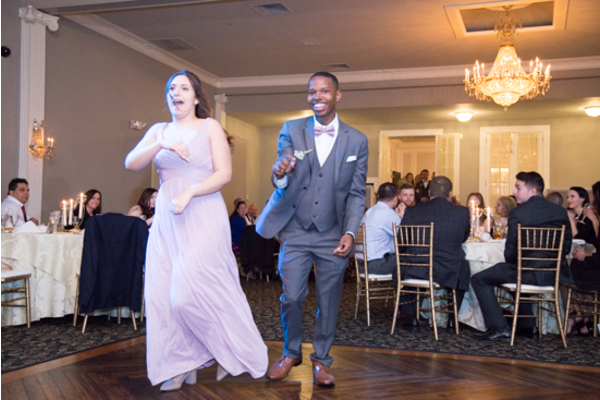 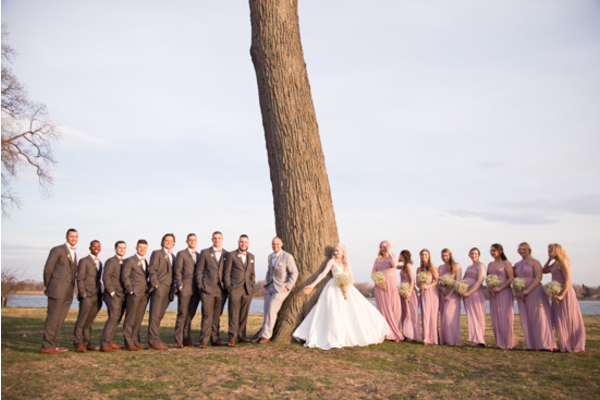 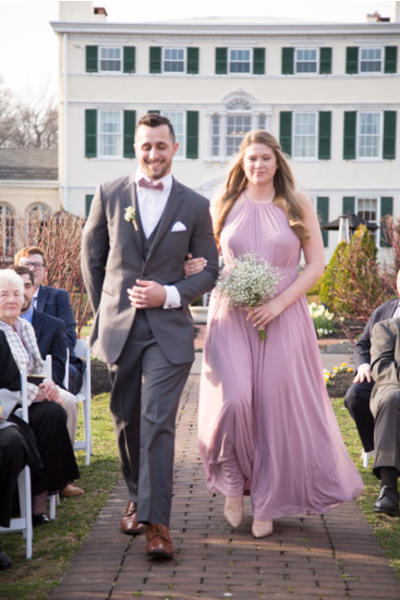 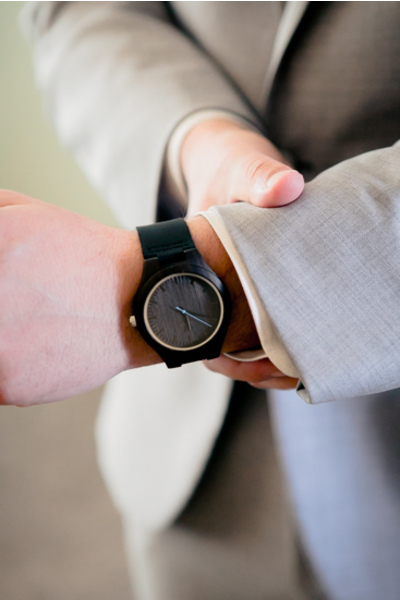 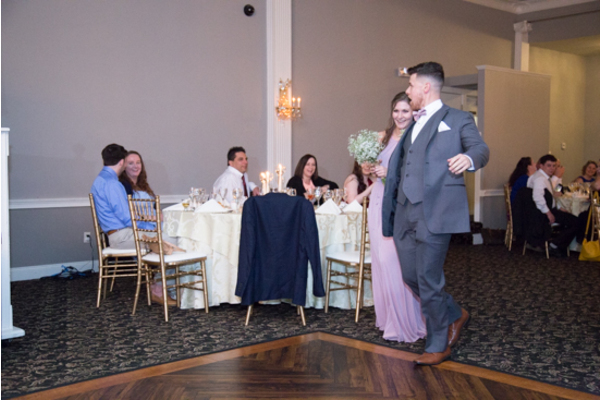 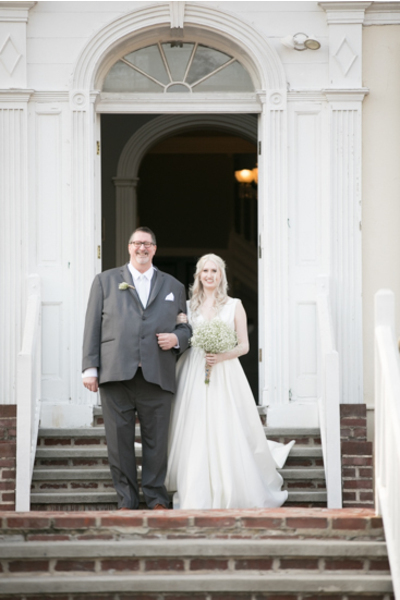 Our NJ Wedding Photographer snapped photos of the couple’s grand entrance, speeches, and more picture-worthy memories! 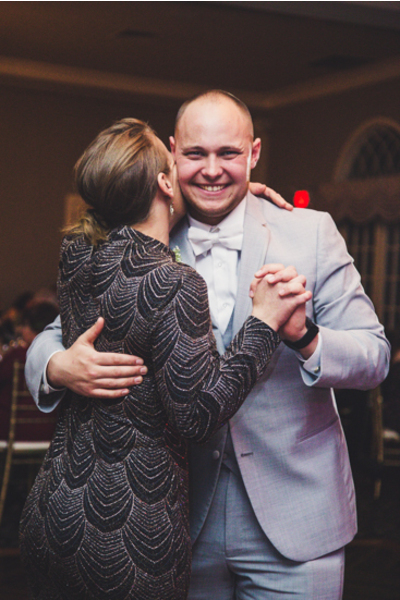 Above all, the newlyweds were spotted living it up on the dance floor and taking in the time with their loves ones. Congratulations, again, to Caitlyn and Thomas. 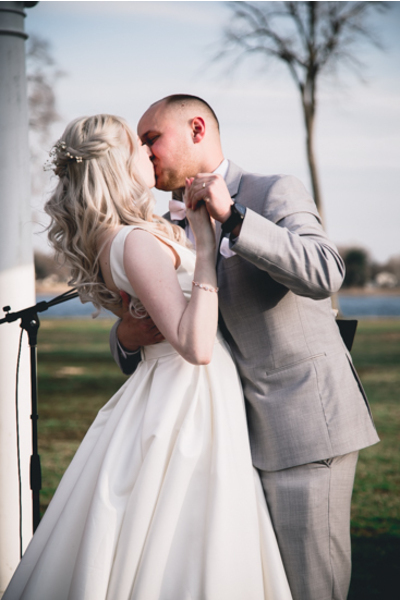 In conclusion, everything from your venue to your love was so beautiful. 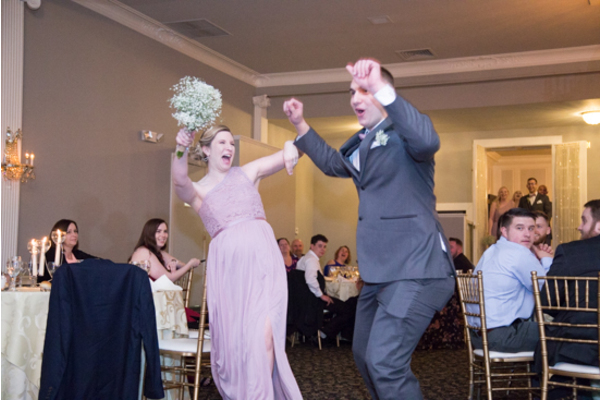 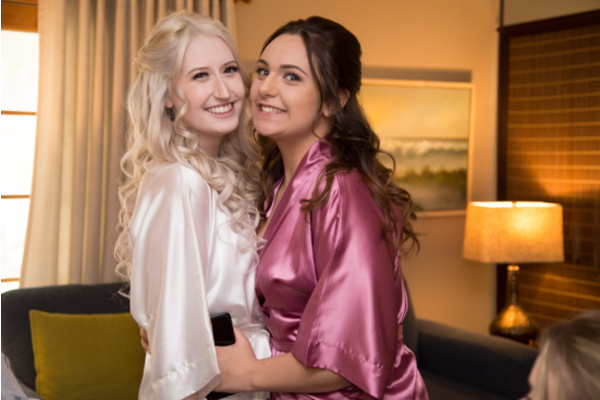 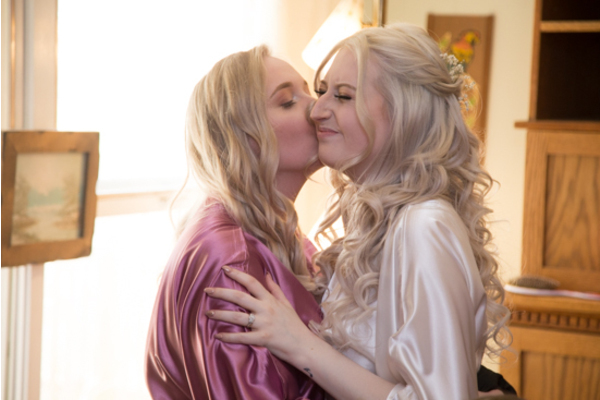 We were so happy to document it all!